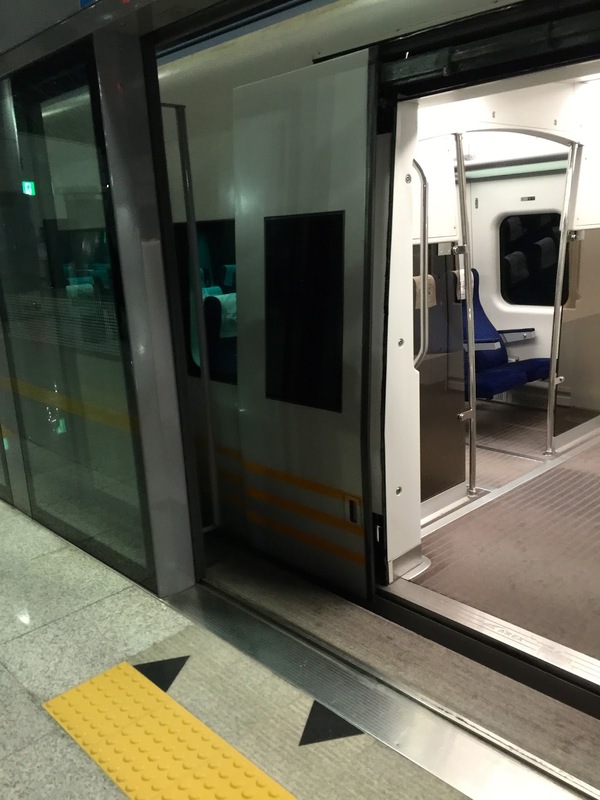 As our flight is at 9.30am, we took the first AREX train to the airport. 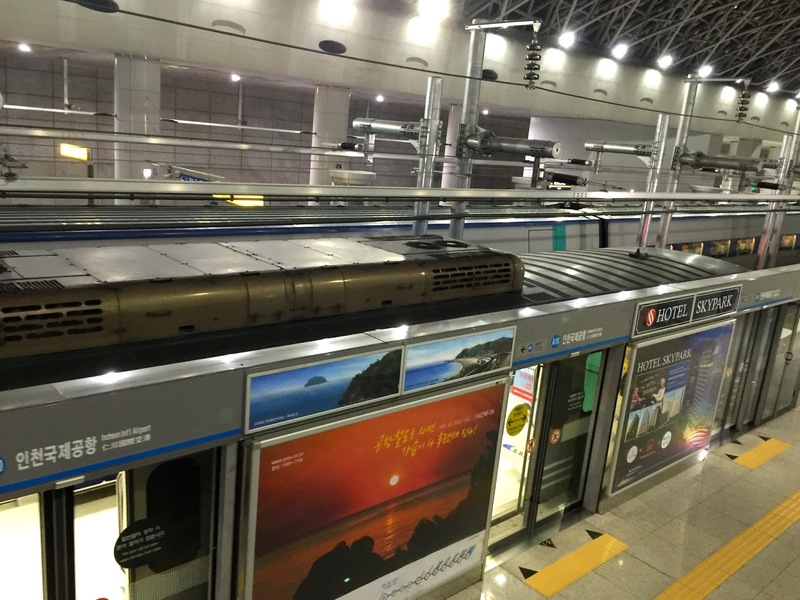 The train departs Seoul station at 6am. 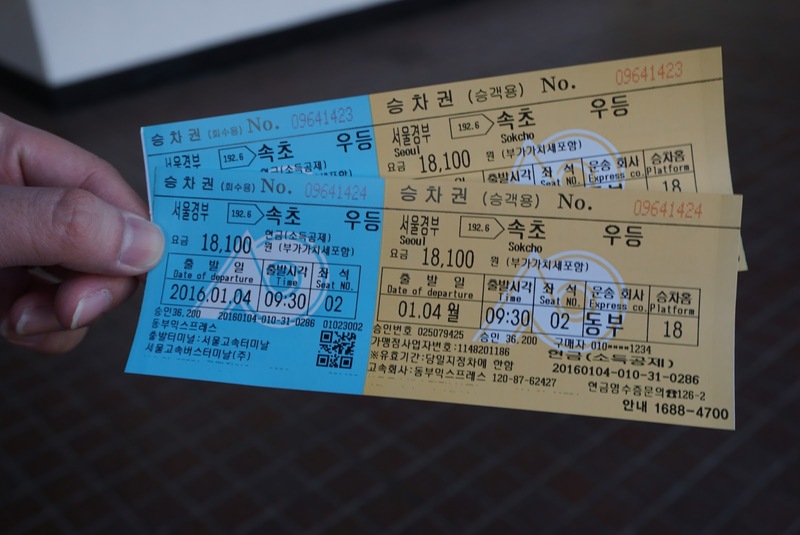 We were at the train station at 5.30am got our tickets and headed towards the airport. 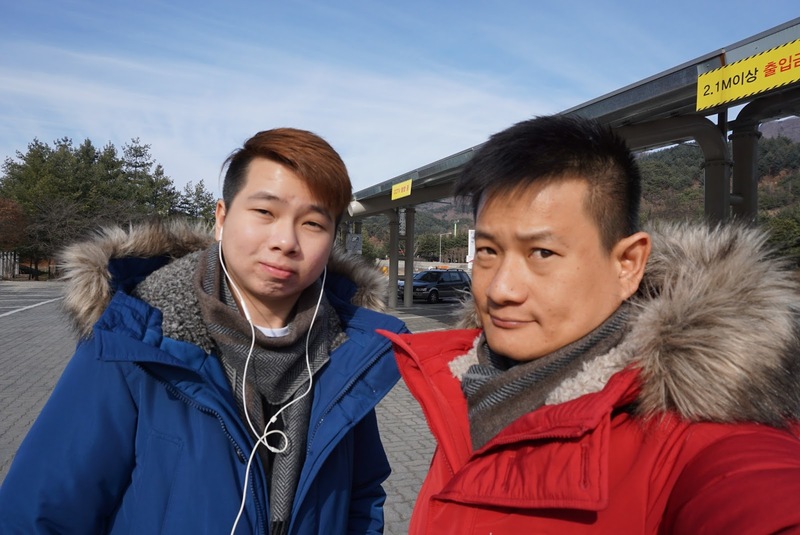 Upon reaching, after we did our tax claims, we checked in our luggage and proceeded to return the mobile wifi that has accompanied our journey in Korea. 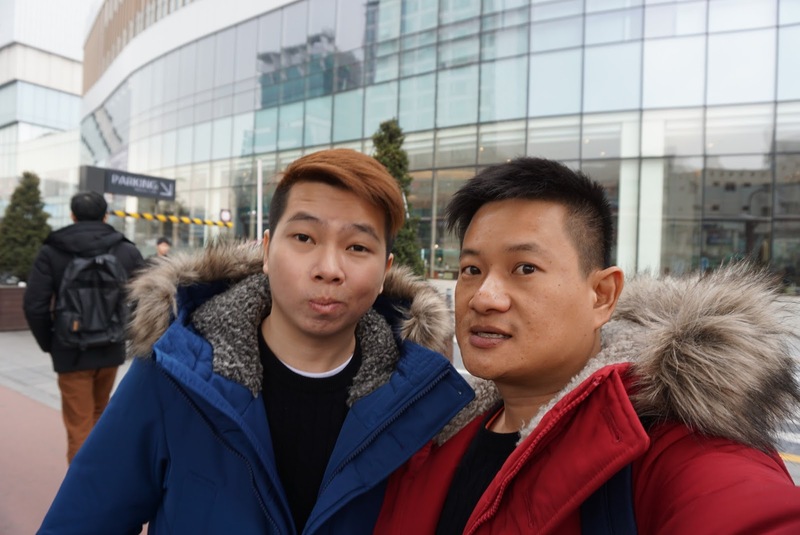 The next part of our trip, we spent 2 nights in Bangkok for some relax and massages before heading back to Singapore. 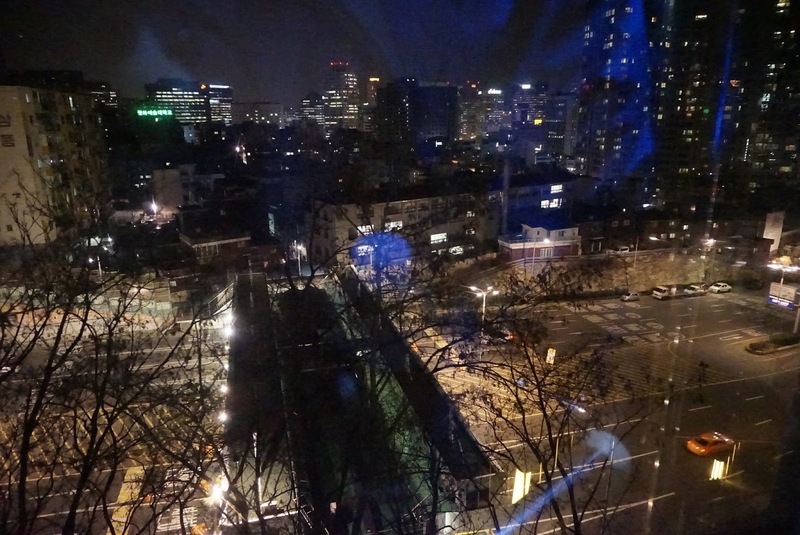 Seoul Station in the wee hours of the morning. 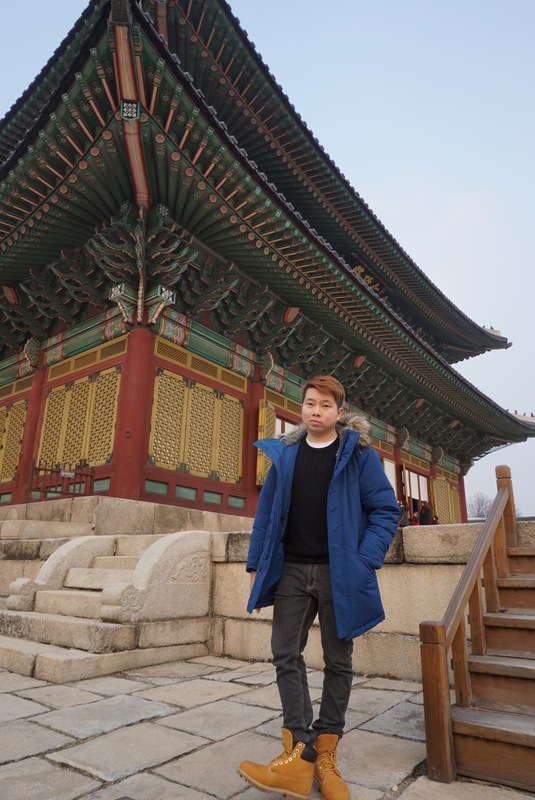 Rather than recounting what we have done today, I thought of sharing some travel tips I gained from my trip to Korea. 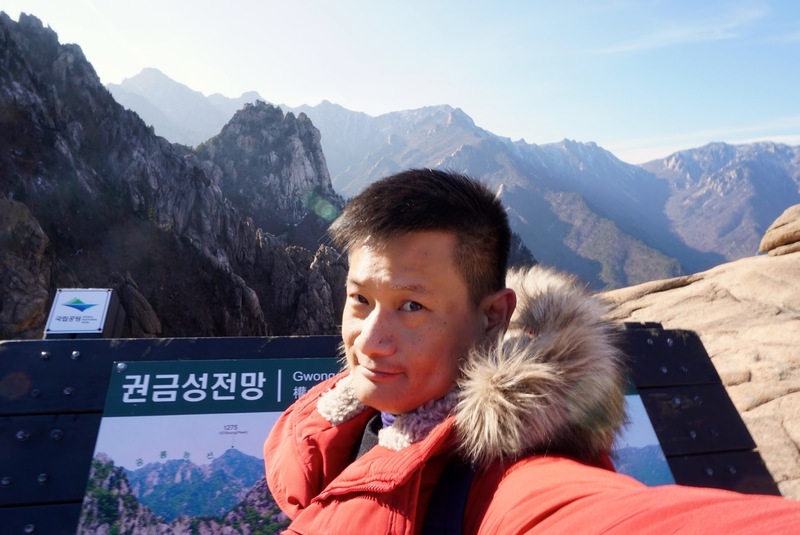 Getting connected during a trip is what most travelers prefer, which allows one to share the experiences during the trip via social media. 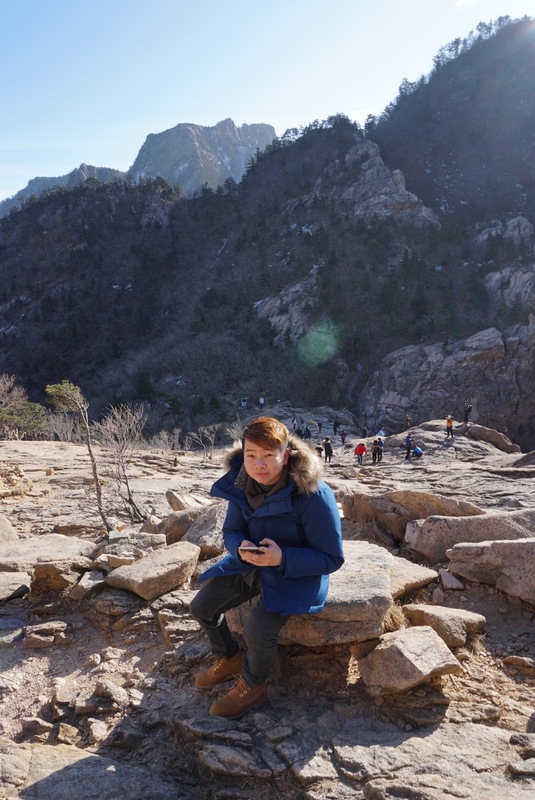 Staying connected is especially important for people who travels Free and Easy, as one would need the information on where to go and how to go. 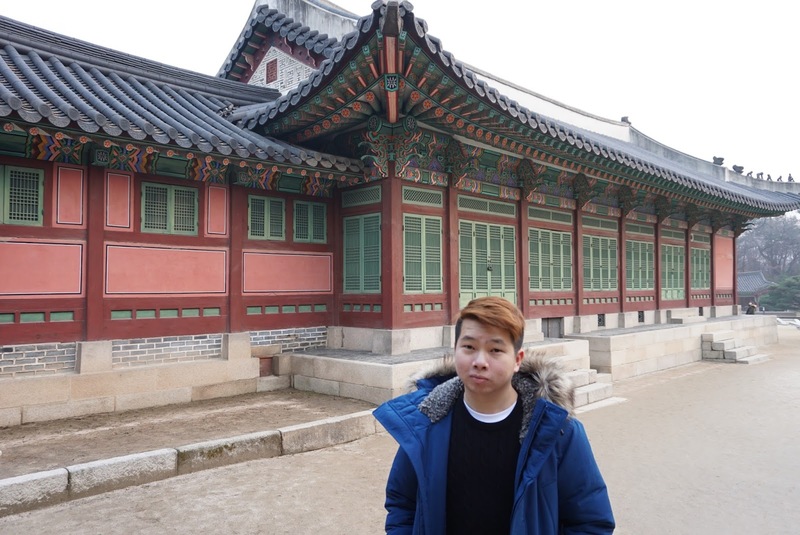 One of the problems (or so I heard) when traveling to Korea is the simcard. One way to circumnavigate this is to rent a mobile wifi router. The one that I have gotten is from SK Telecom. 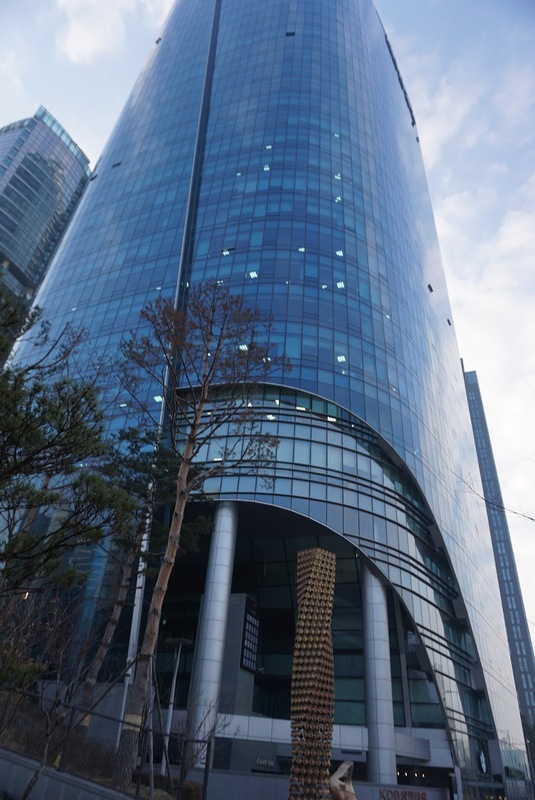 SK Telecom is one of the biggest Telco in South Korea. The wifi I have rented costs around SGD35 for the total of 7 days of rental (which is more than 60% savings as compared to similar router I would have rented from Singapore). The signal I have gotten from the wifi is fantastic. 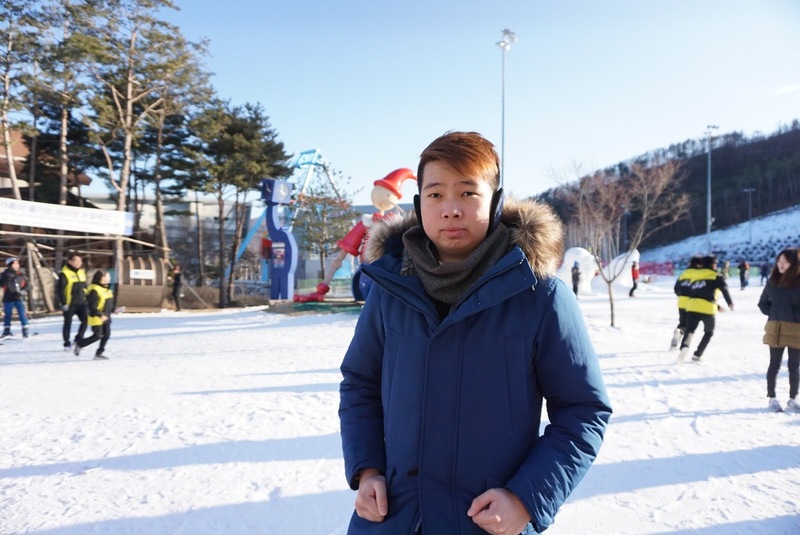 There are great coverage anywhere I been to in Korea. 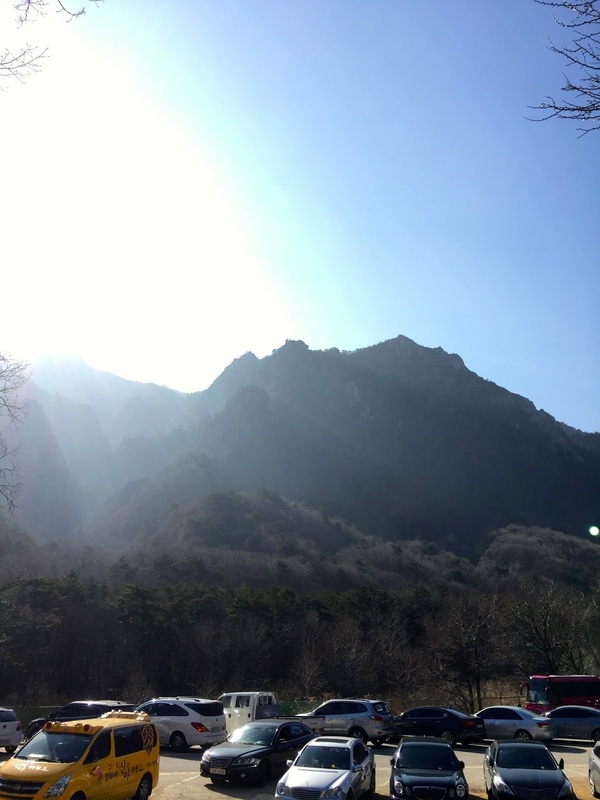 This is even true when I visited Seoraksan National Park, I was able to whatsapp my friend a picture I took near the peak of the mountain. 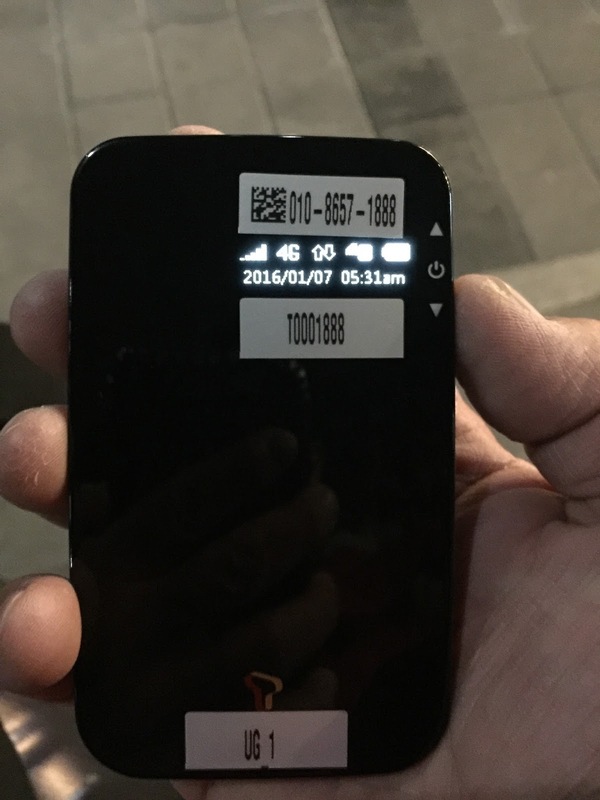 There is not a situation when I did not get mobile data coverage from the mobile wifi router. However the downside is the battery of the wifi router only lasts for 8 hours. 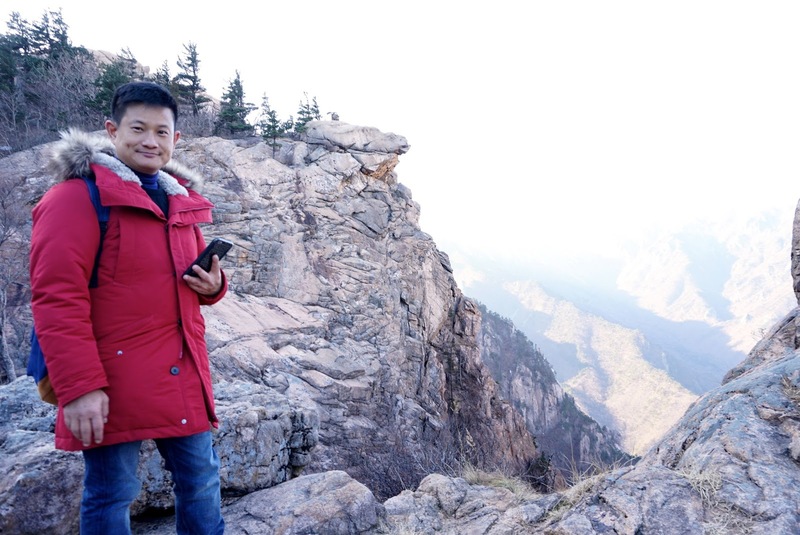 Luckily we brought our power bank with us on this trip, which allows us to charge the router on the go. 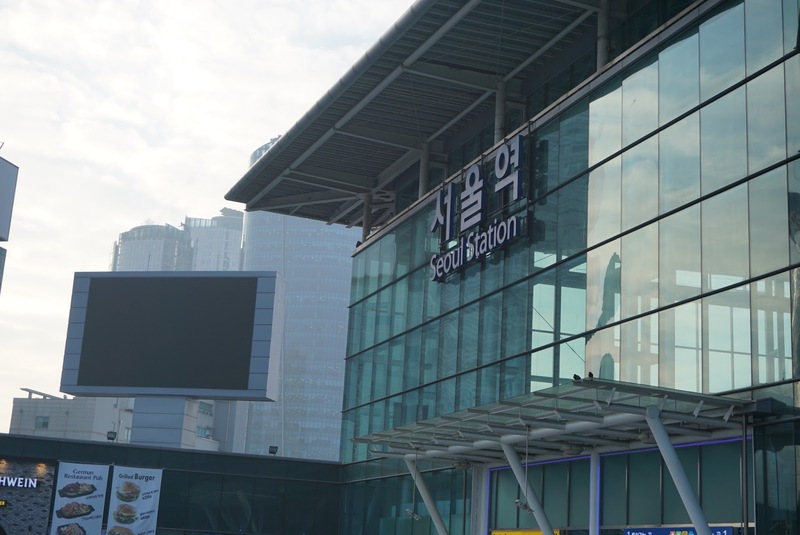 Renting of the wifi router is easy, one can make reservations online via the SK Telecom website (yes there is an English Version of the website), or simply approach the counter at the airport for rental. The thing that most travelers fear is to miss our flight. I always have the habit of arriving at the airport at least 3 hours early. 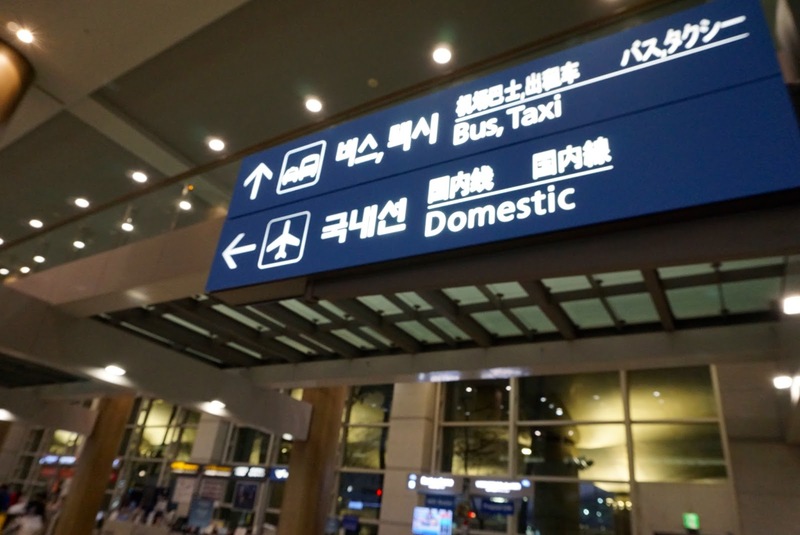 This is especially pronounced in Incheon Airport. We had to wait for our checked in luggage to be x-rayed before we can go anywhere. On top of that we planned to get our tax refund, which requires some time. 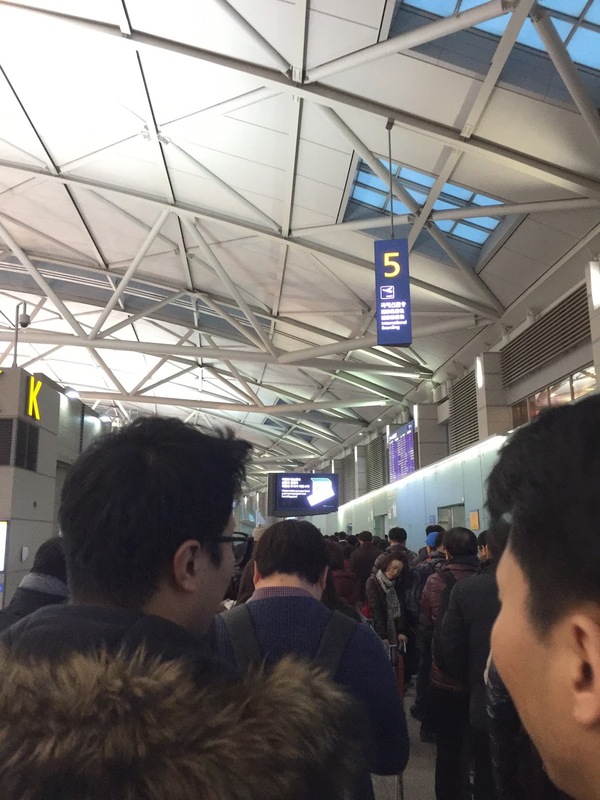 More importantly, the queue to clear immigration in Incheon Airport is very long at all the entrances. We waited about 30 mins in the queue to clear immigration. There is very stringent checks before one is allowed to clear immigration. 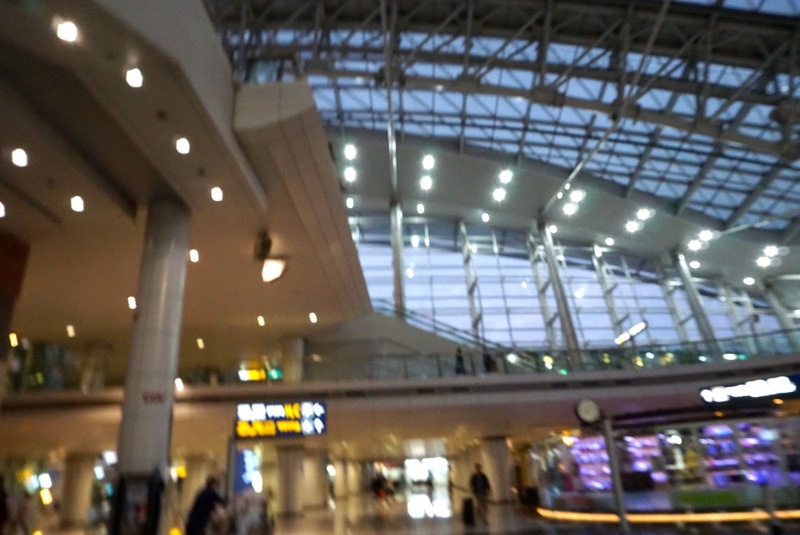 On top of that, Incheon airport is rather large, we had to take a train to a satellite terminal for boarding. All these already takes up around 2 hours of our time in the airport. 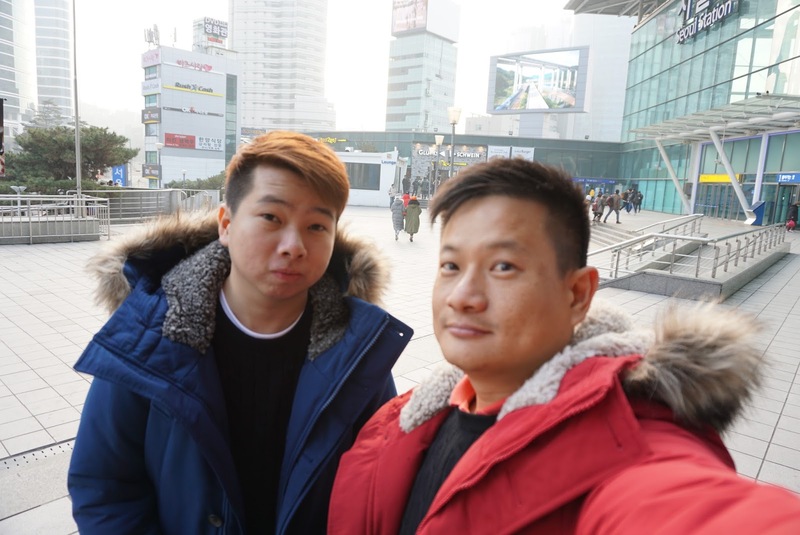 We barely have time to roam around the duty free shops for shopping whilst in Incheon Airport. 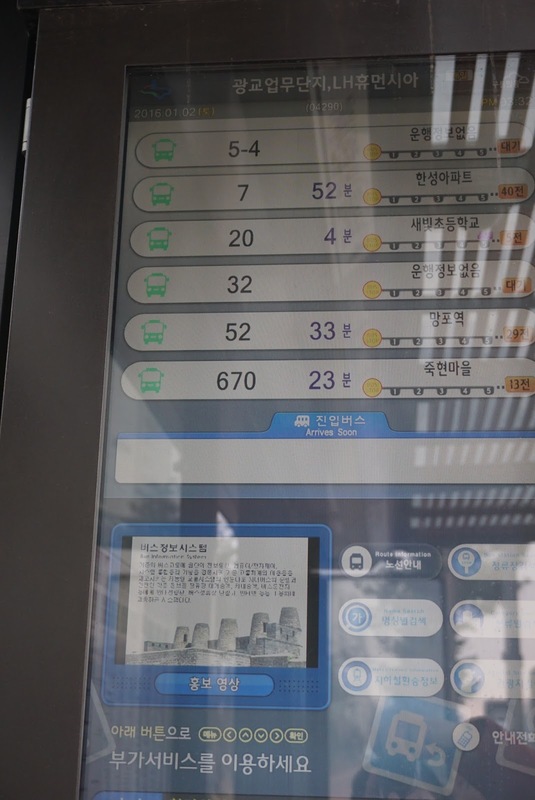 There are a number of apps for the Korean Subway system. 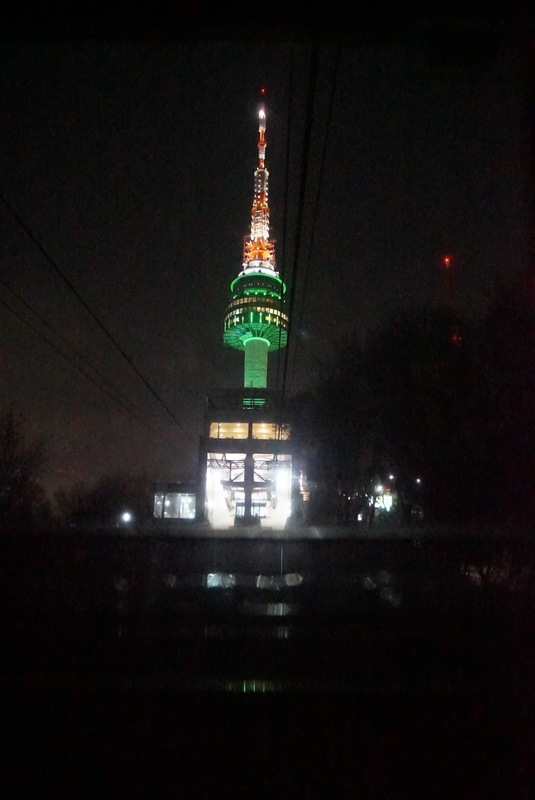 I used one of an app called Subway Korea app. 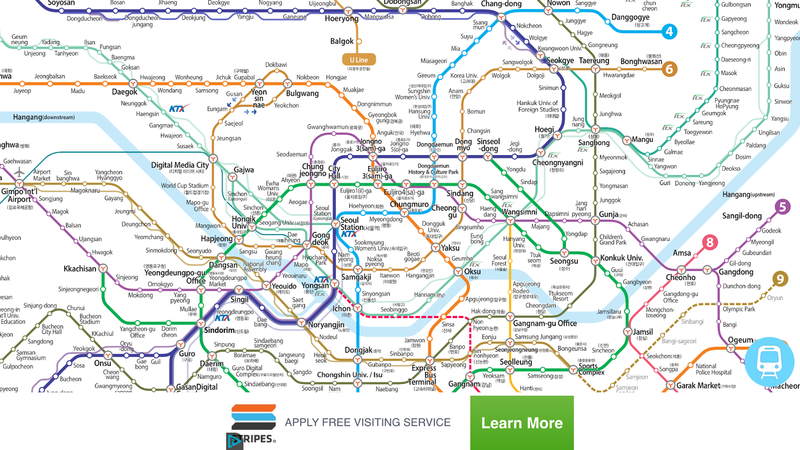 It is very useful as the Korean Subway system can be confusing and overwhelming for some. This app tells me which station and which line to change subway trains and even gives an estimation of the time needed for traveling on the subway to my destination. 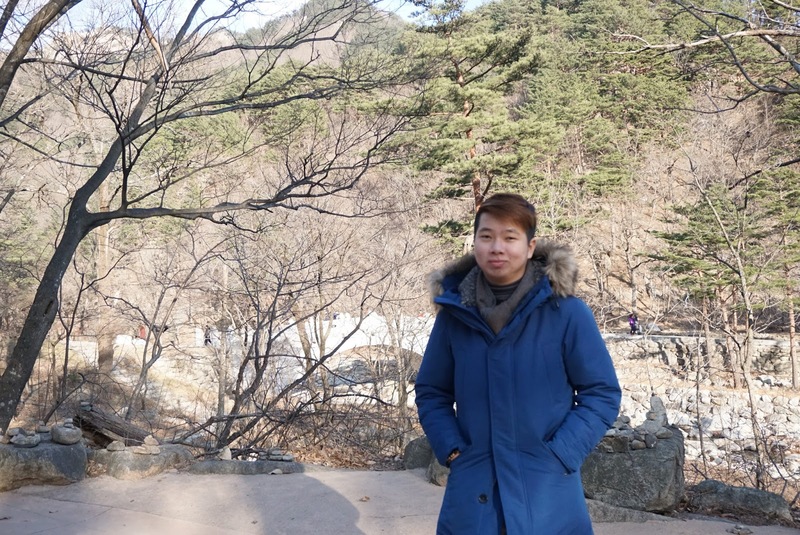 I used this app during my stay in Korea. This app is very useful in guiding me which station to change to which line in order to reach my destination. It also tells me the time required and the fare amount. 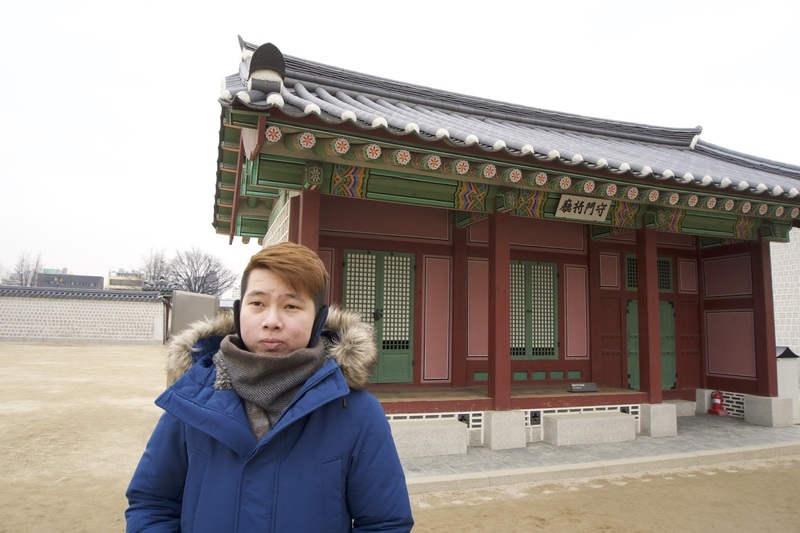 There are the “Big 5” palaces in Seoul. 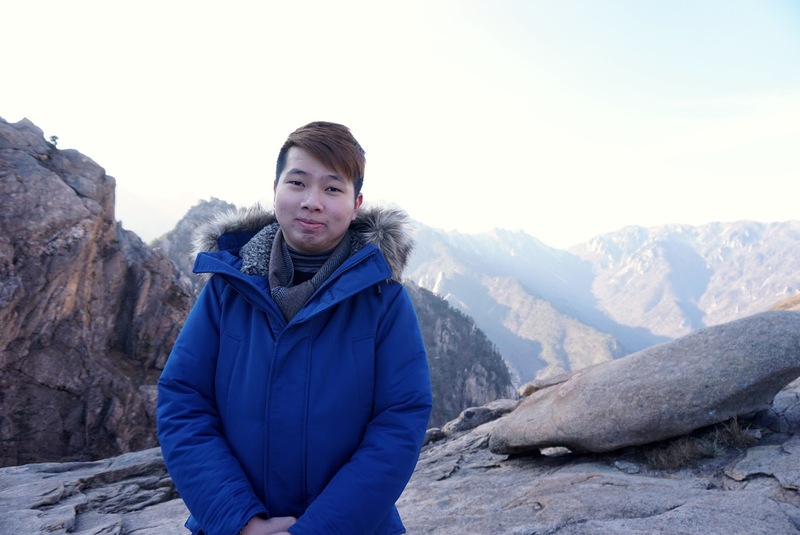 Do cater more time when planning to visit them. 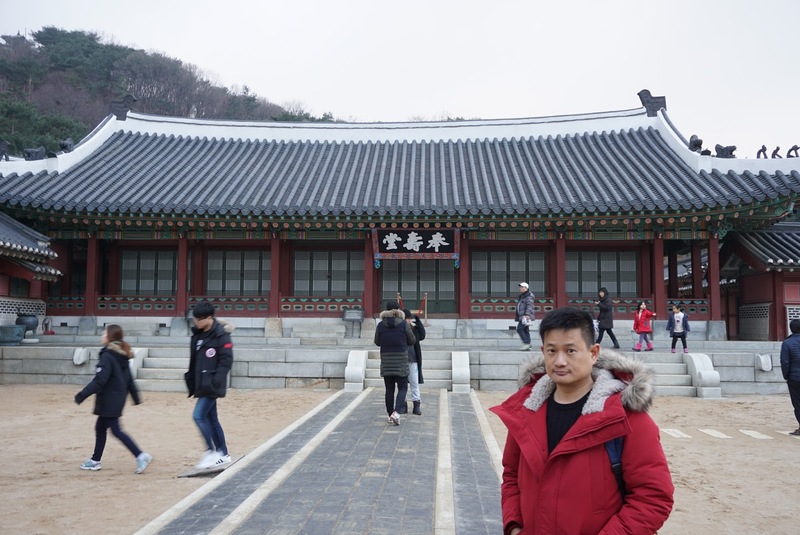 As my experience has taught me to space out visits to Gyeongbokgung and Changdeokgung into 2 days rather than cramping these 2 into 1 day. 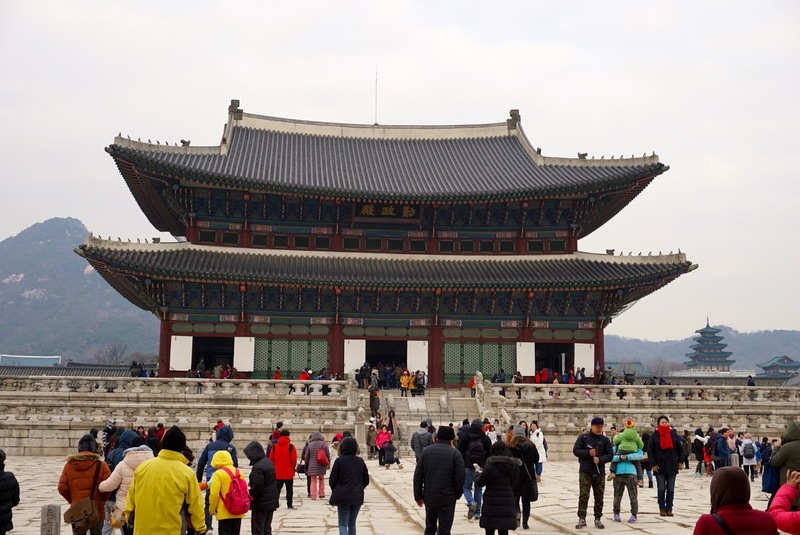 These 2 palaces are the largest in Seoul and more time needs to be catered to have a more fruitful visit. 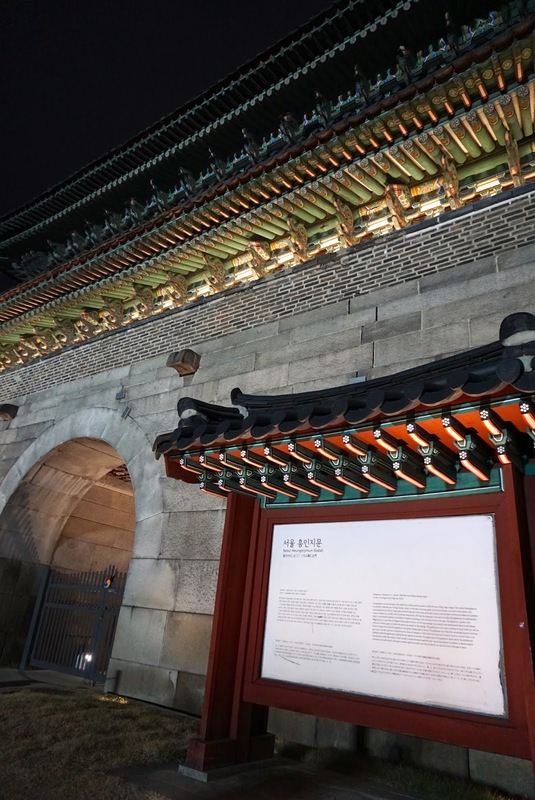 While one is getting the ticket to these palaces, do pick up a copy of the palace maps from the ticketing counter, which can guide one on the suggested route to take when visiting. 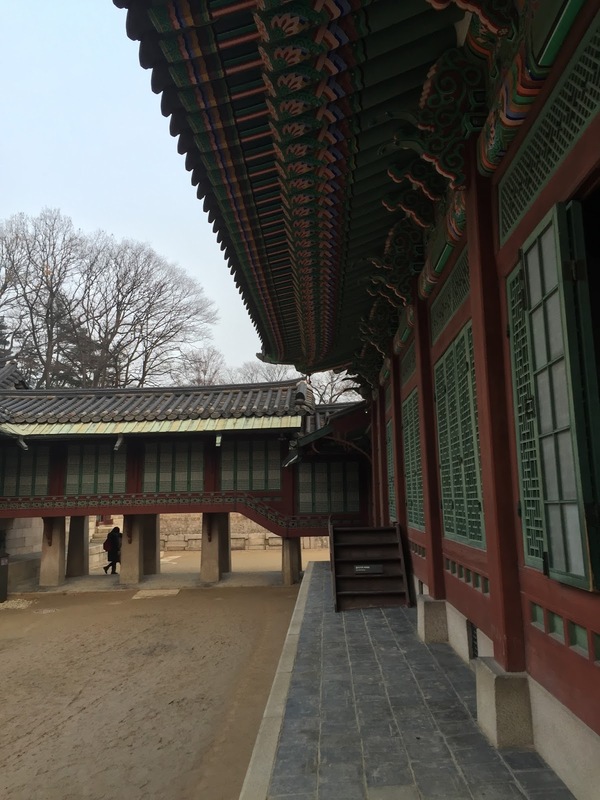 The palaces in Seoul does have free guided tours at specific timings. 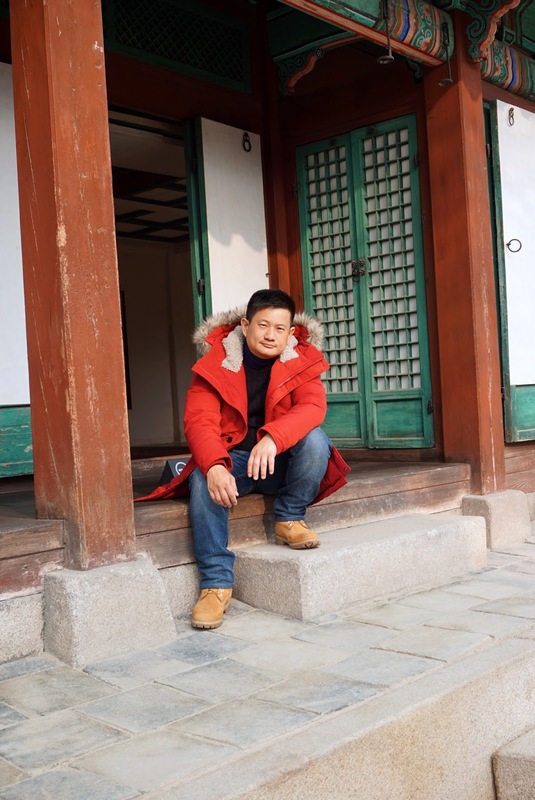 I would recommend Free and Easy travelers to join these guided tours as they provide more insights into the palaces and also the significance of each building. Otherwise all the buildings will appear the same after awhile. 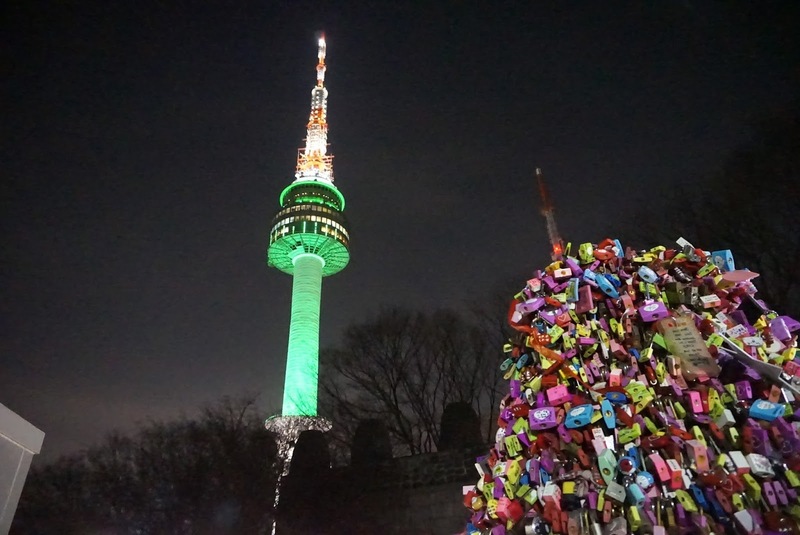 It goes without saying that one should always carry their belongings with them especially while traveling overseas. However this context applies to when traveling onboard public transports especially interstate buses. 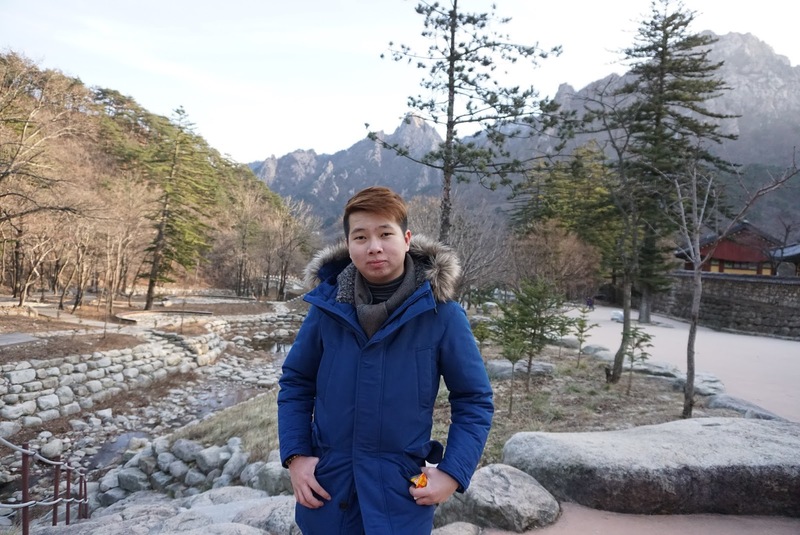 From my experience during day 5 where the bus has drove off without us, at the point when we alighted the bus at the pitstop, I was still contemplating if I should bring my backpack along or just take the important stuffs. Luckily I decided to bring all my belongings with me, at least when the bus drove off, I still had my backpack with me. I can imagine the backpack would have gone missing, despite being told by the bus company staff that they would disembark my backpack at the terminal we were suppose to stop. 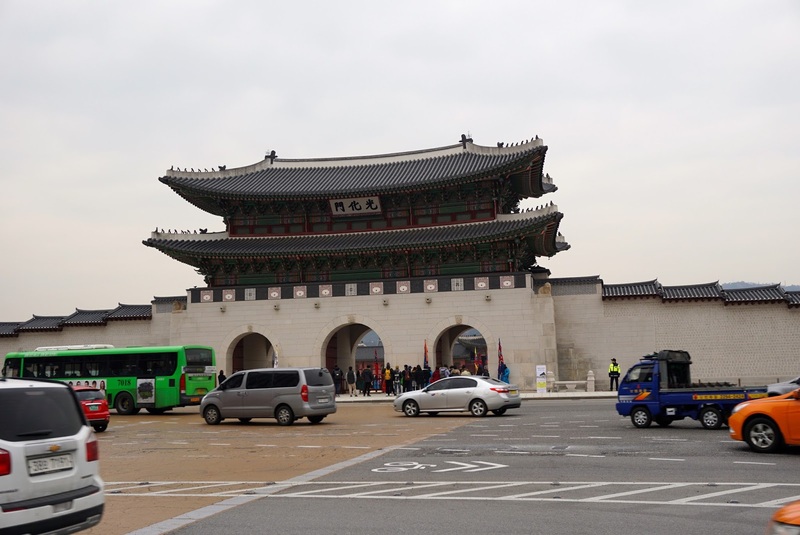 We arrived Gyeongbokgung at around noon. 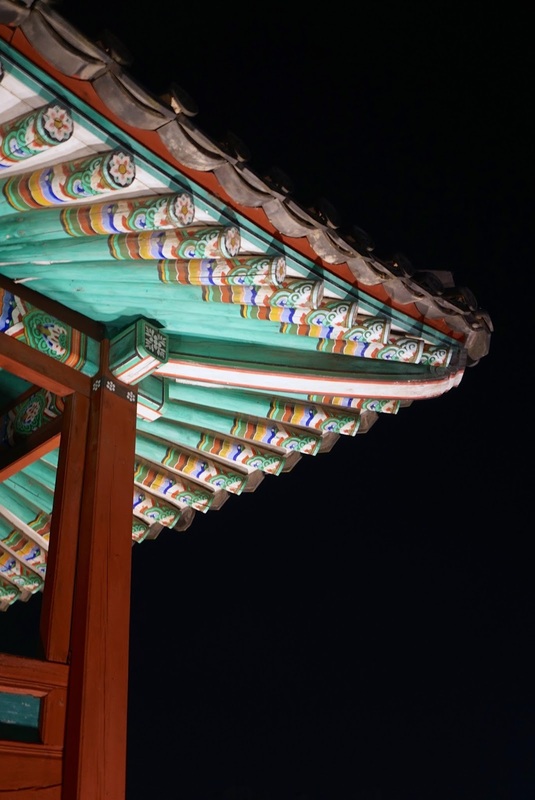 Gyeongbokgung is easily accessible via the very efficient subway system in Seoul. 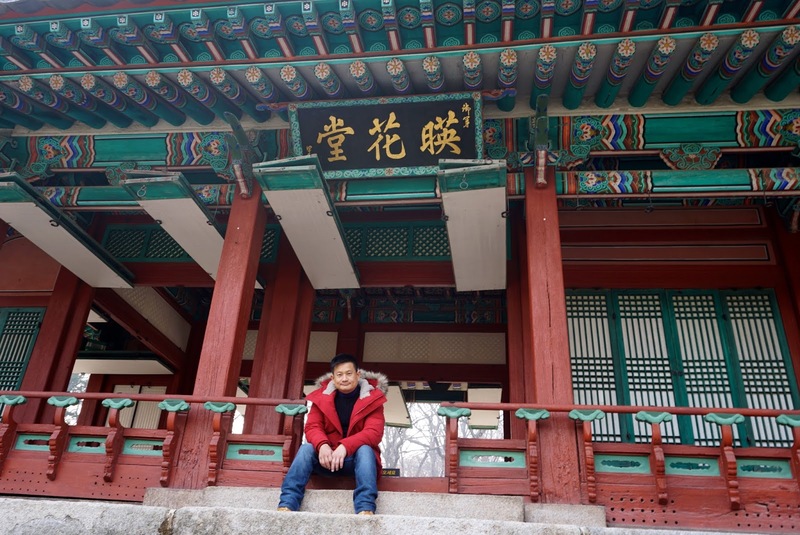 There is a station next to the palace, Gyeongbokgung Station. 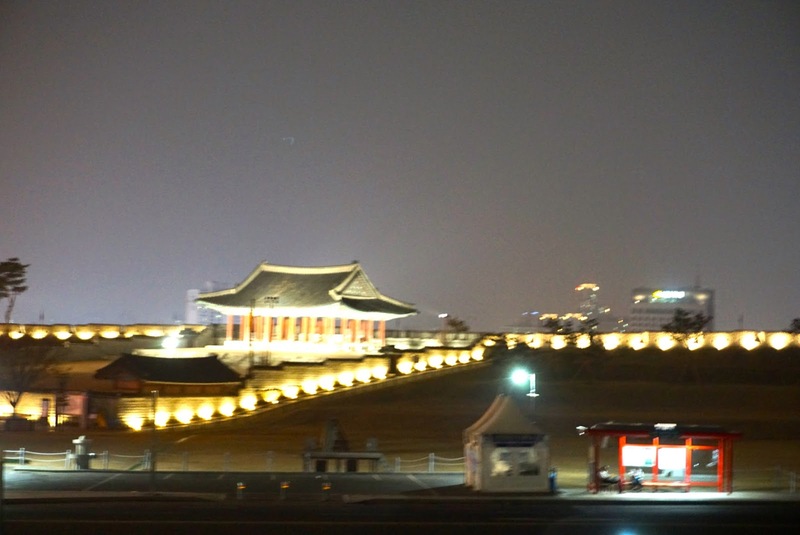 From the exit of the station, the palace is right in front of the station. As we did not have breakfast yet, we begin hunting for food nearby. 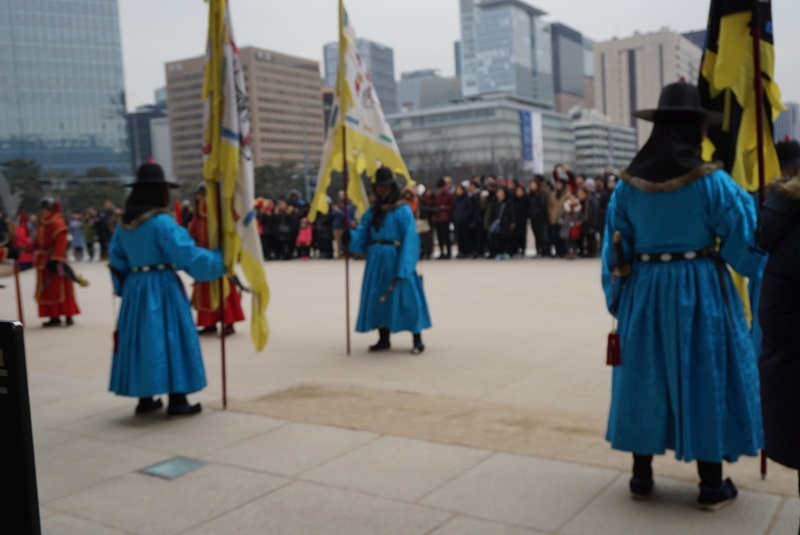 As we were walking past Gyeongbokgung, we bumped into the hourly changing of guards ceremony at the main gate of the palace. 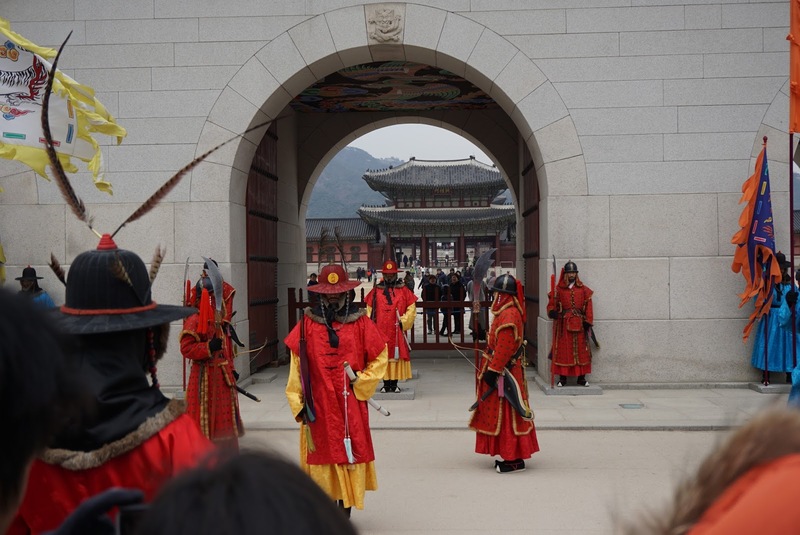 The guards are dressed in ancient Joseon dynasty outfit, with a serious look on their faces, these role players take their job seriously in replicating what was being done in yesteryears. 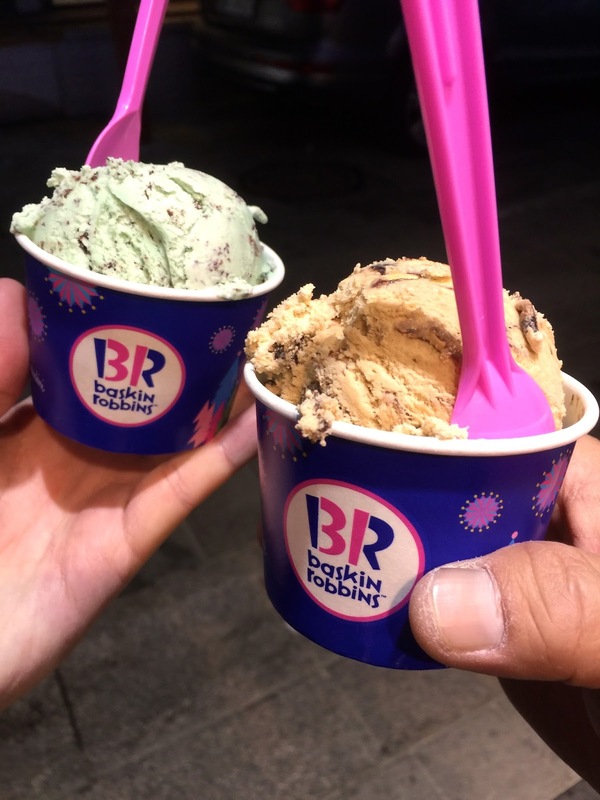 After watching the changing of guards ceremony, we continued our quest in hunting of food. 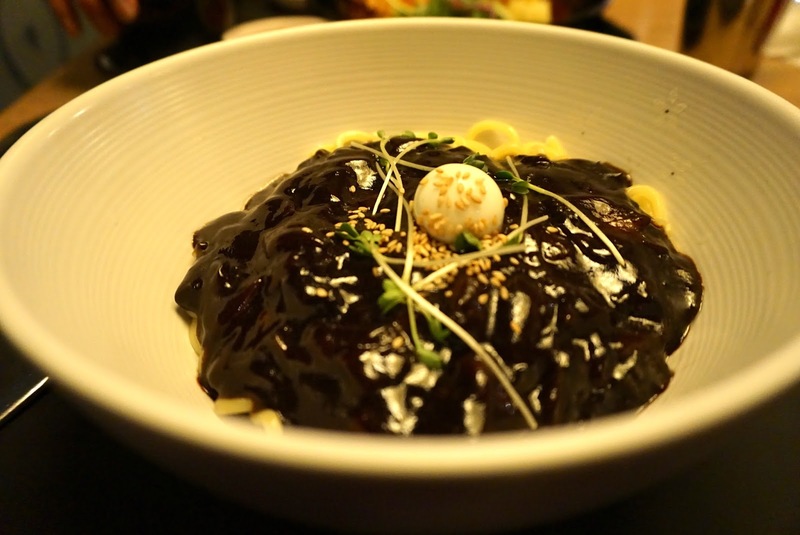 We walked into a street that seem to be populated with restaurants, and settled in one of the restaurants that serves modern Korean food. 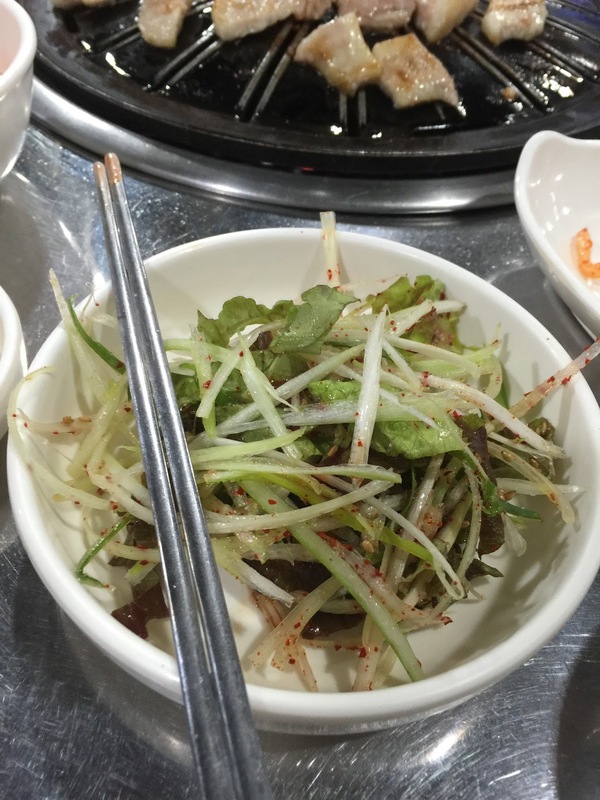 As we were famished, we ordered what seemed delicious on the menu. The food indeed was tasty (not too sure if our hunger made it seemed delicious), however as we over ordered the quantity that we were able to finished, we had quite a bit of leftovers. 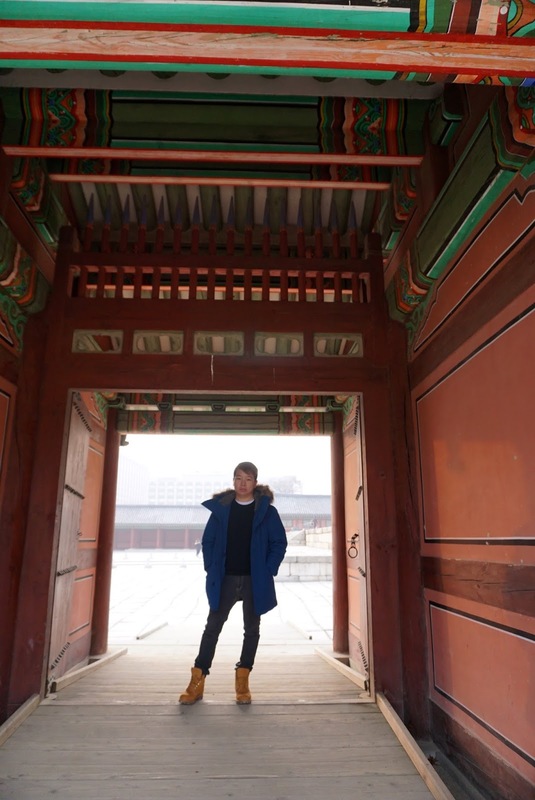 After lunch, we traced our footsteps back to where we came from – Gyeongbokgung. 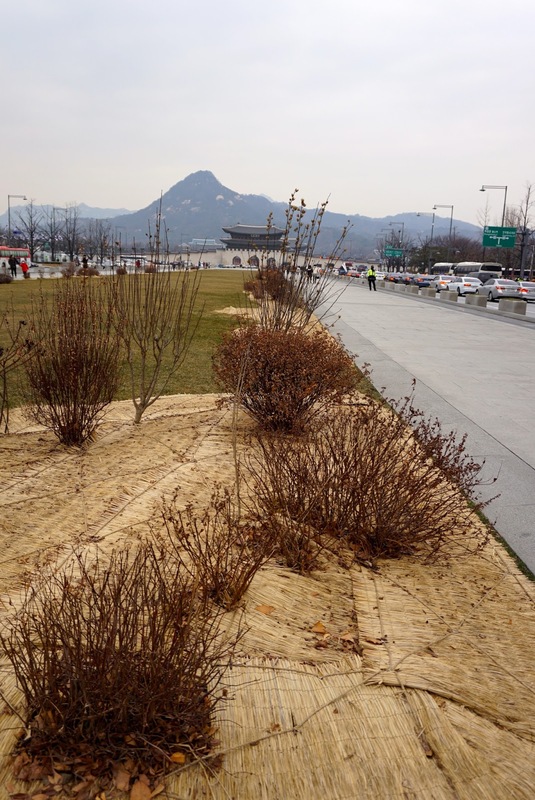 We headed towards Gwanghawmun Square, which is directly in front of the main entrance to Gyeongbokgung. 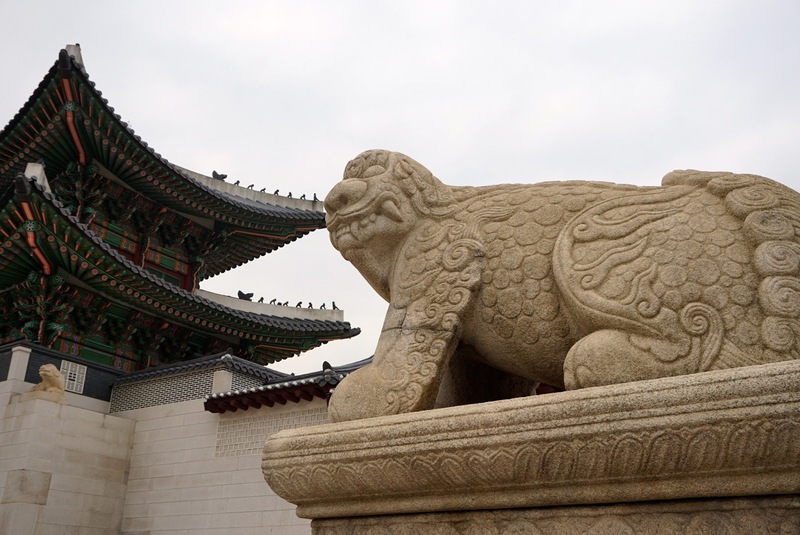 At the centre of the square, a huge statue of King Sejong was being erected. 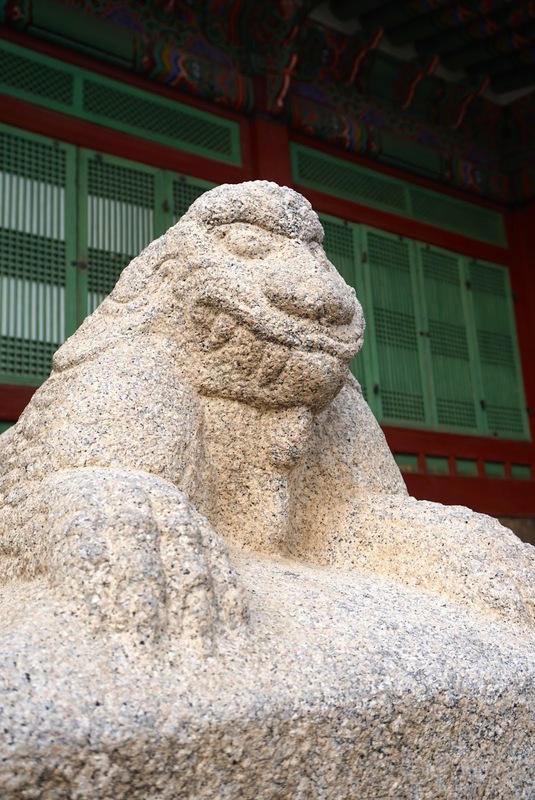 The statue depicted the king sitting on his throne, with a book on his left hand and a gentle smile on his face. 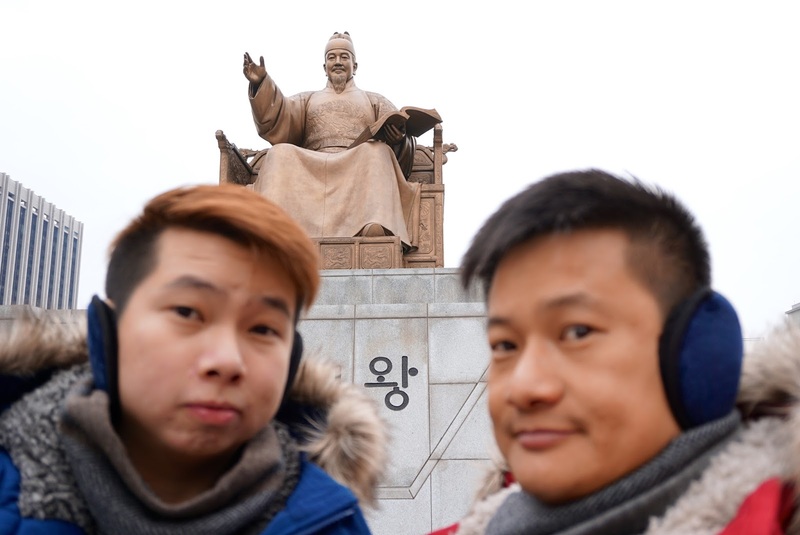 King Sejong is the inventor of the Korean Language. 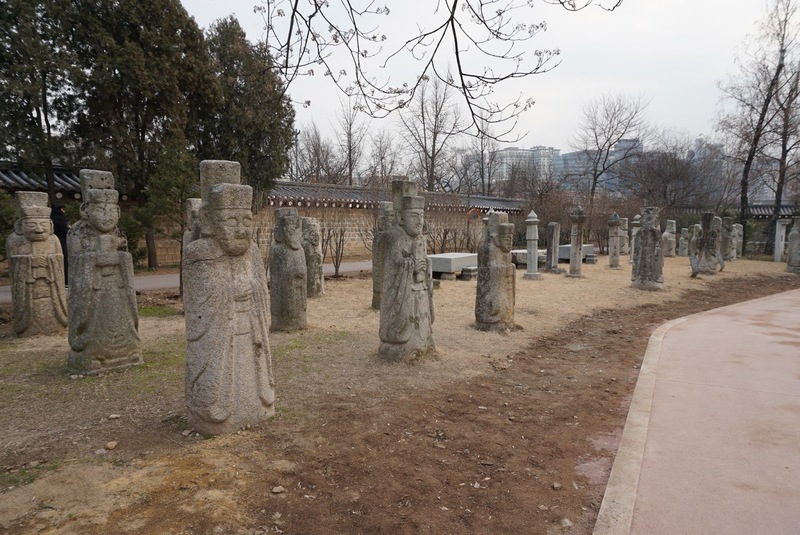 In front of the statues are some artefacts that was invented by King Sejong. 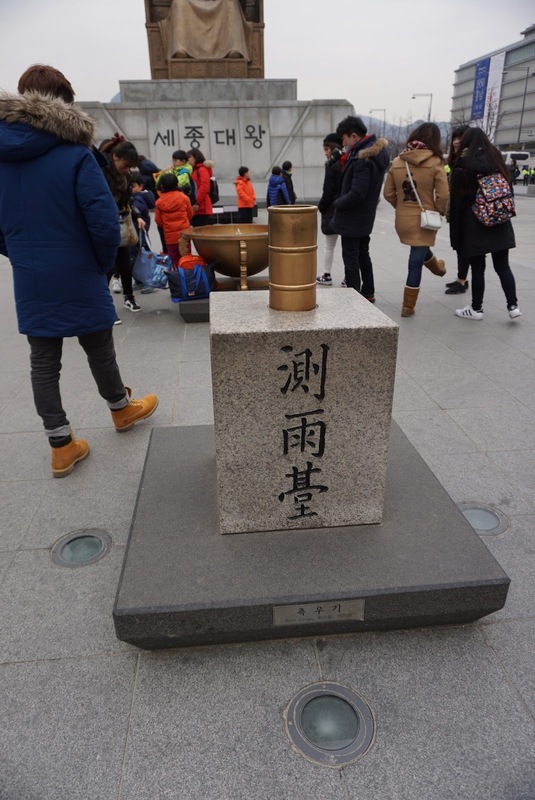 A celestial glove, rain gauge and a sundial was placed in front of the statue. 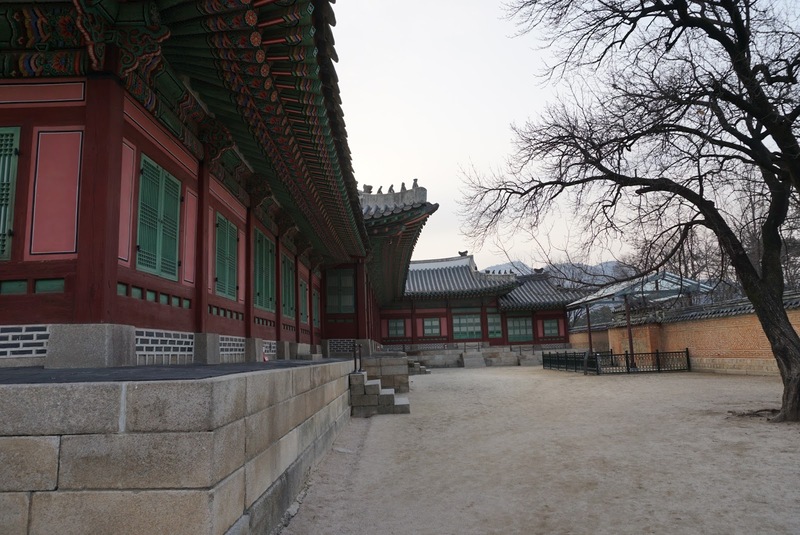 After taking some photos, we continued our walk towards Gyeongbokgung. 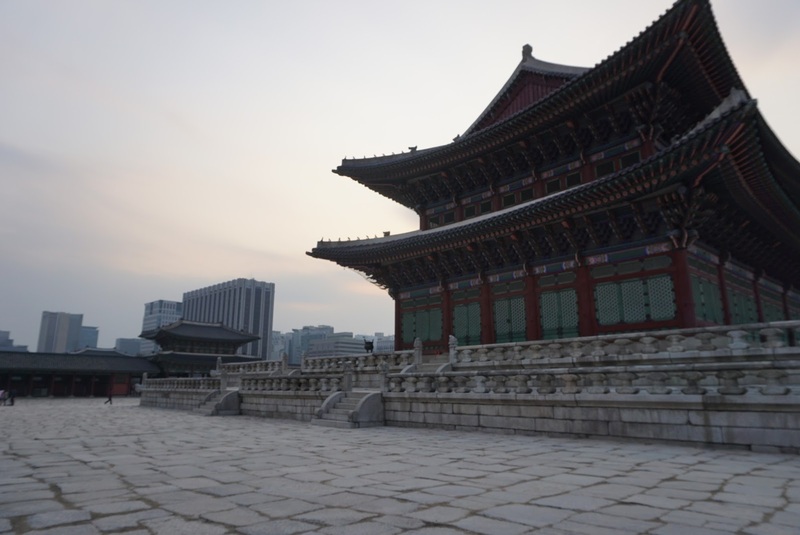 It did not take us long to reach Gyeongbokgung. 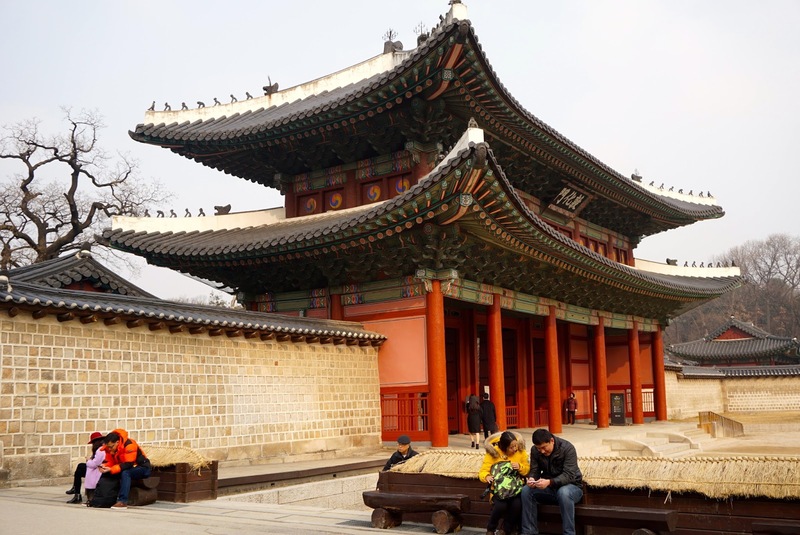 Gyeongbokgung is the main palace of the Joseon Dynasty until it was being destroyed by fire during war and was abandoned for around 2 centuries. 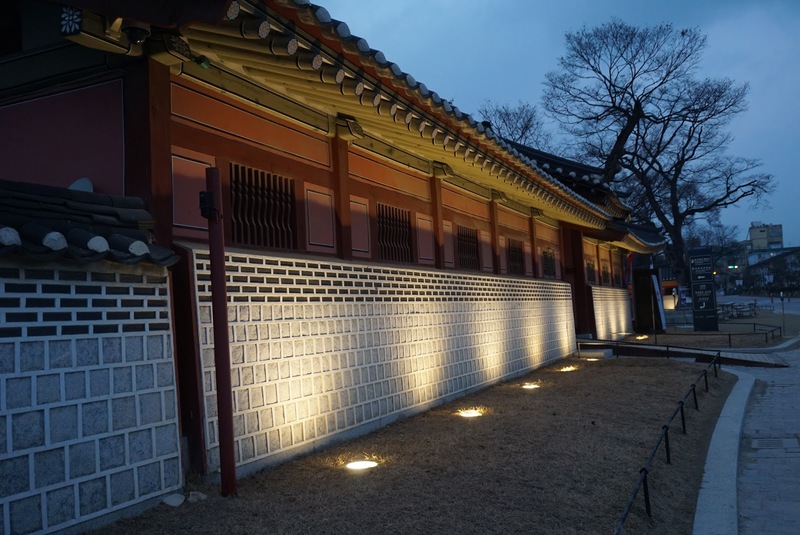 The palace was restored in the 19th century during the reign of King Gojong. 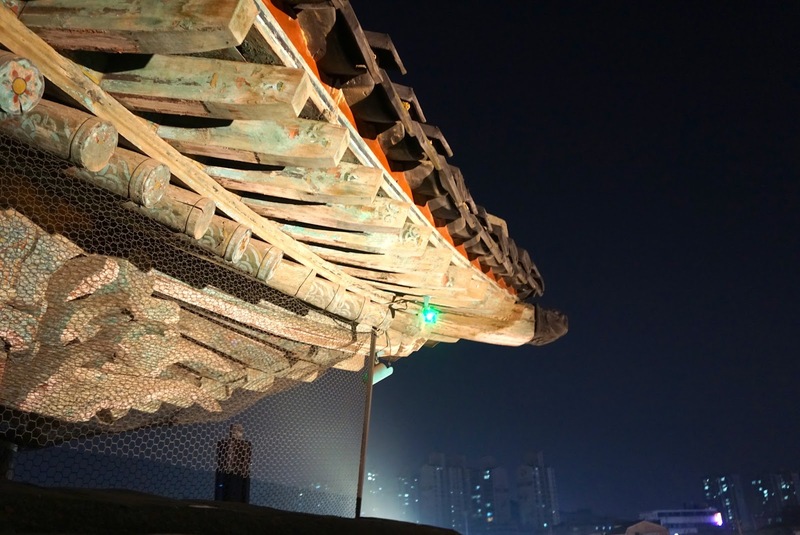 It was however, being destroyed by the Japanese in the 20th century. 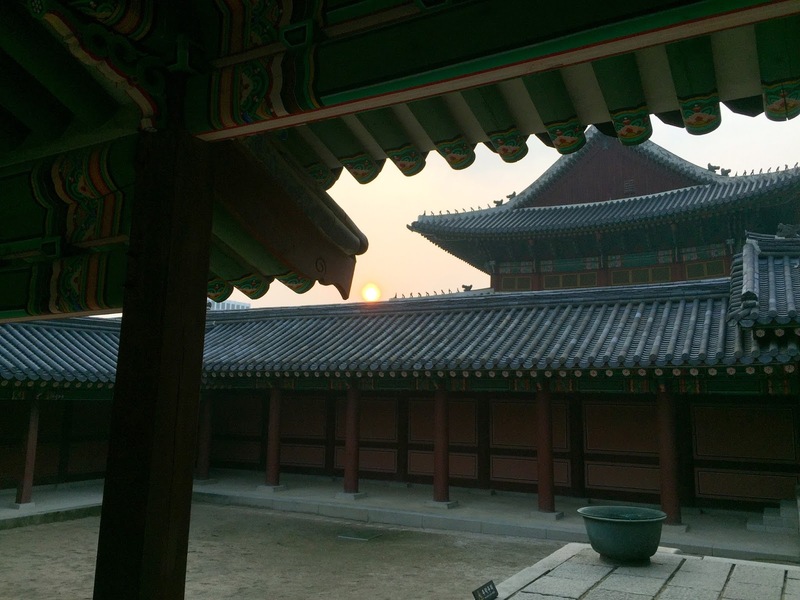 Since then the palace was being reconstructed to what we see today. 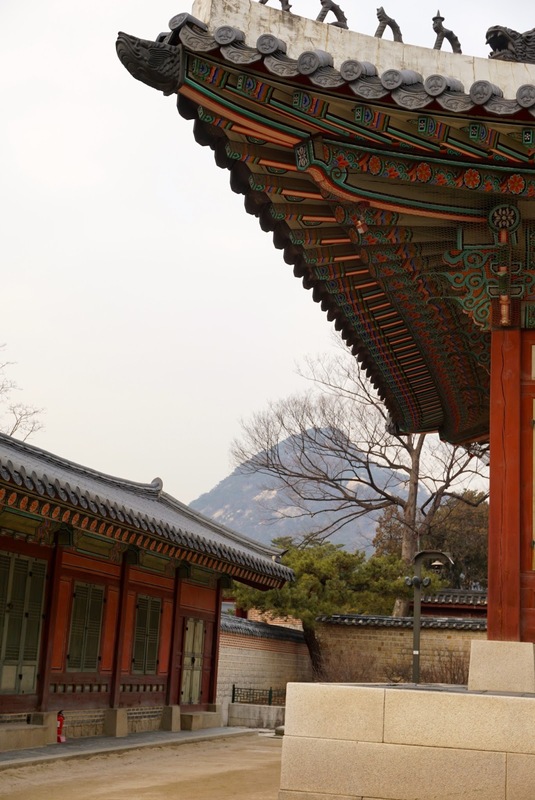 Being the largest of the five palaces in Seoul today, Gyeongbokgung is situated north of the city. 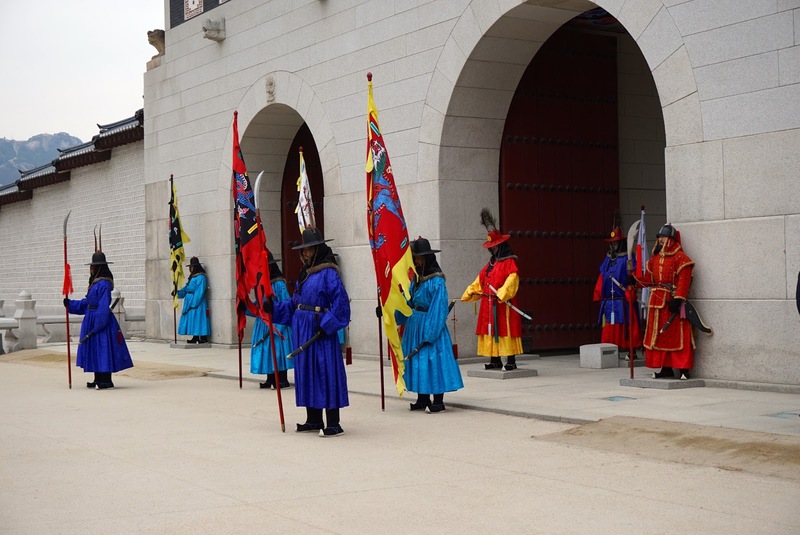 At the entrance, we witnessed another change of guard ceremony. 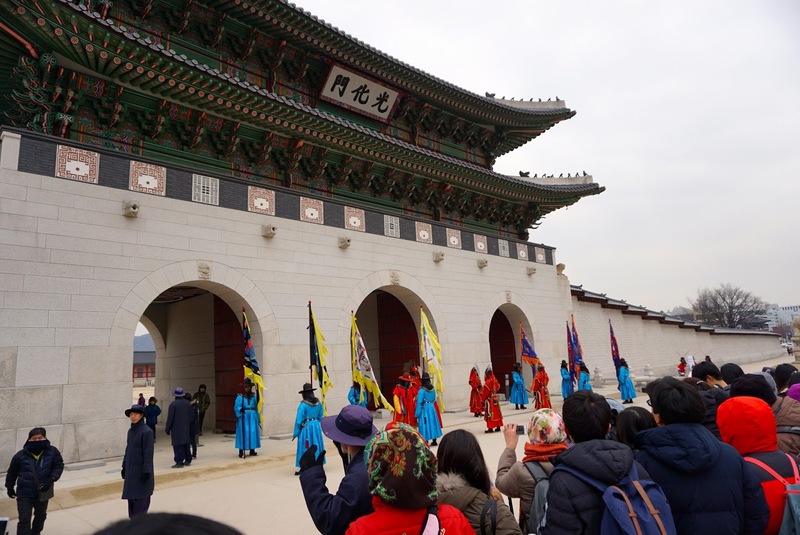 After the ceremony, we headed inside the palace grounds and gotten our tickets for entry into the palace. 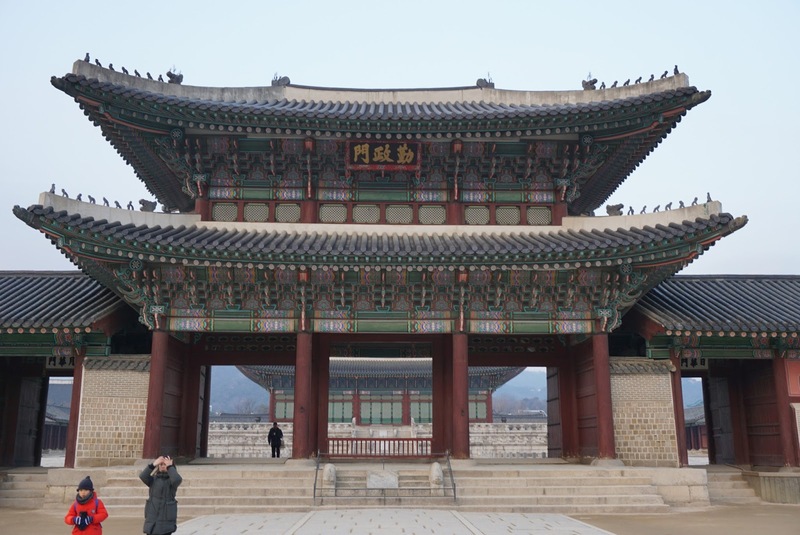 The main gate of the palace, Gwanghwamun, looks like 2 big pavilions stacking on top of each other. 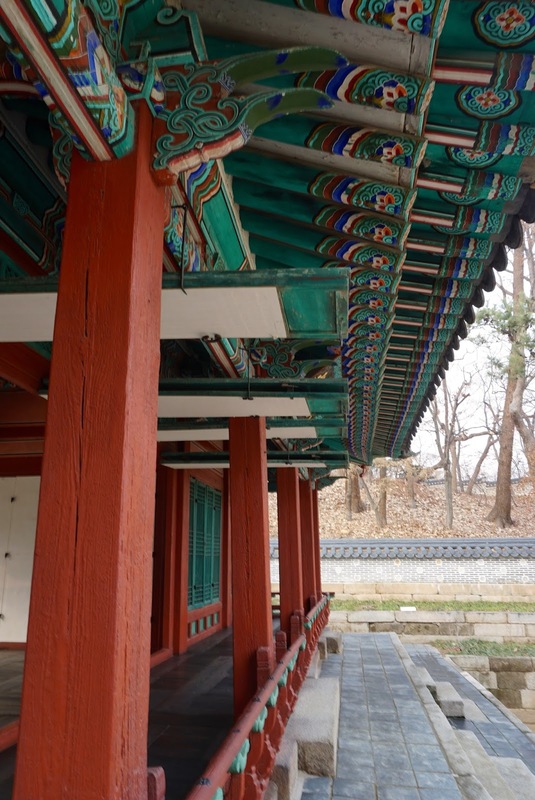 The double roofed, 3 storey gate has wooden structures painted in bright green and red, a typical colour scheme for royalties in Korea (as seen in Suwon Fortress and Changdeokgung), is perched high atop of a stone wall with 3 arch entrances. 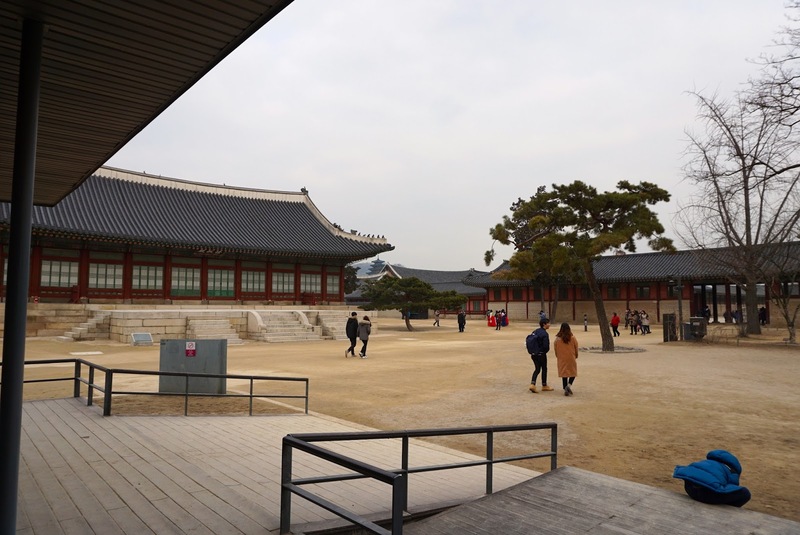 Passing through Gwanghwamun, a large courtyard awaits the visitors before one would reach a second gate in the palace grounds. 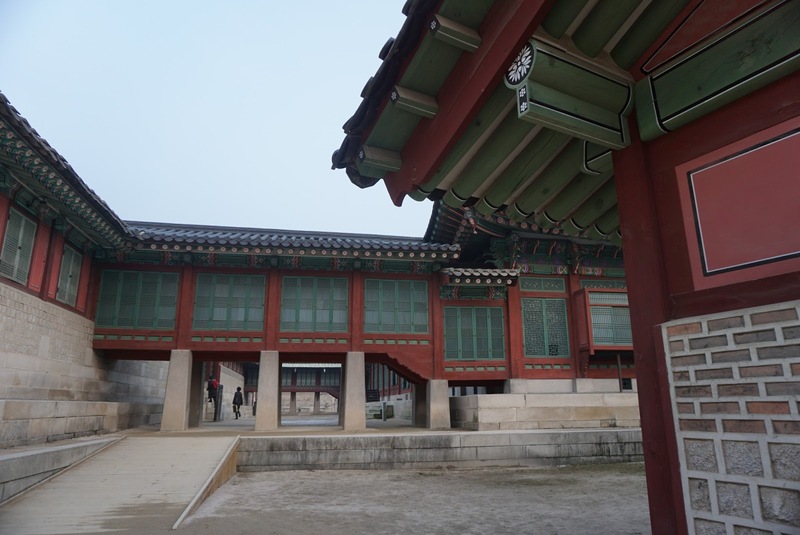 Heungnyemun, the second gate as one enters the palace, guards the entrance to the throne hall. 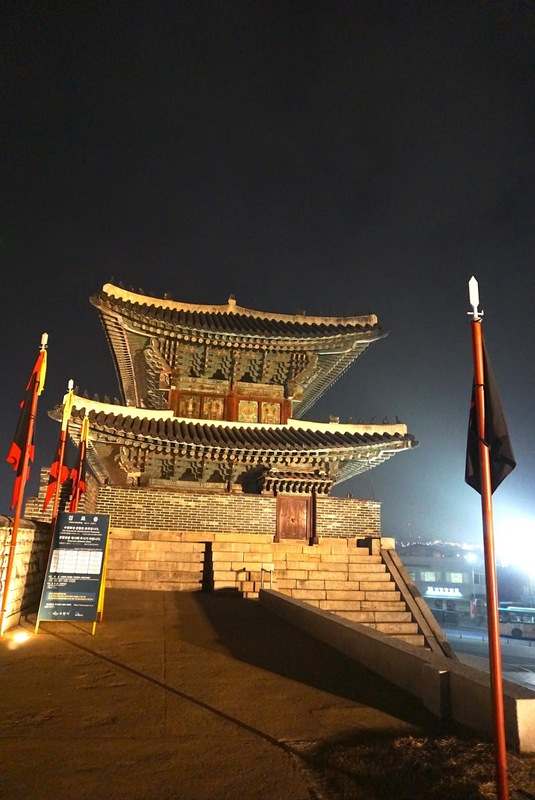 Heungnyemun, compared to Gwanghwamun, has a much simpler architecture. 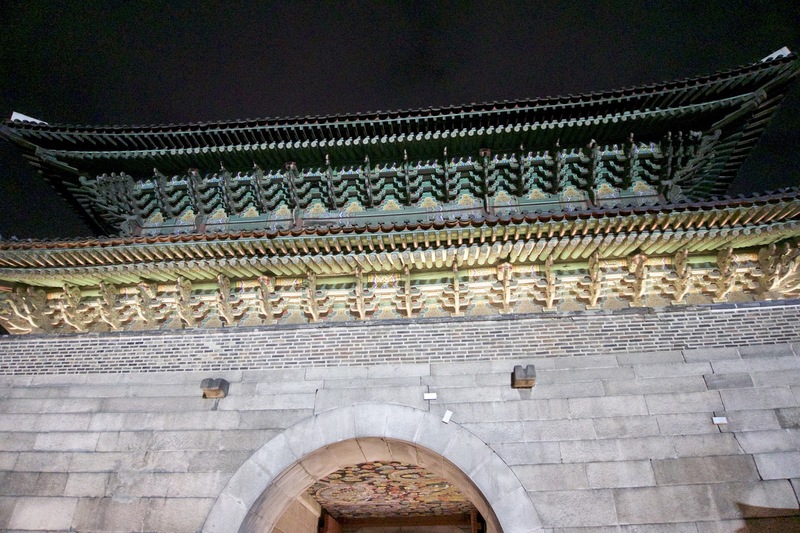 The gate also has 2 roofs stacking on top of each other, and painted in elaborate decors on its under roof. 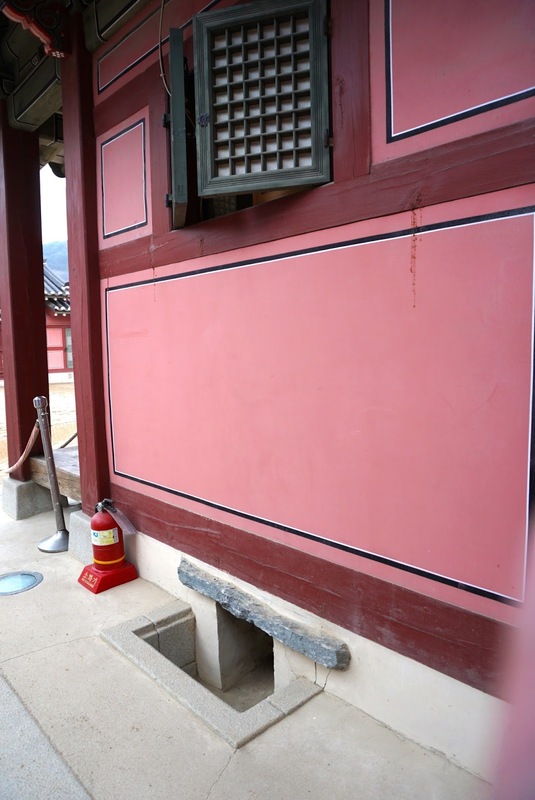 The base of the 3 arch wooden gate is painted in red. 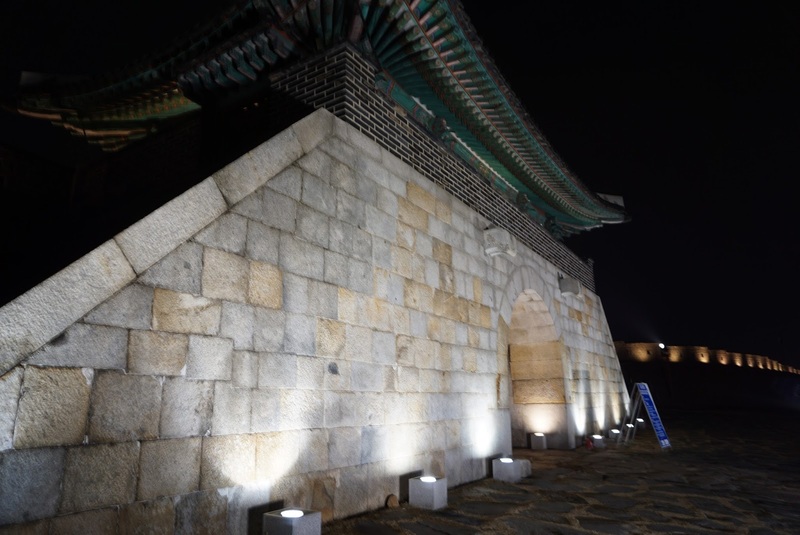 There are 2 additional doors at either side of the gate, forming part of the walls protecting the throne hall area. 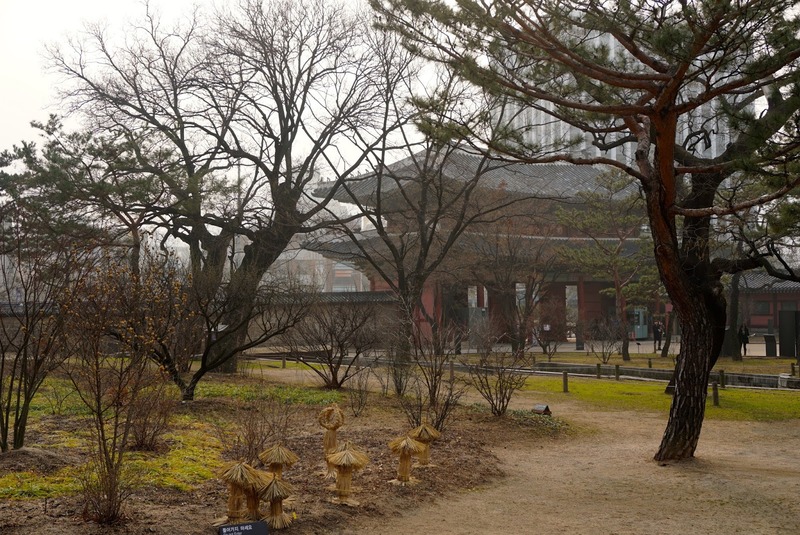 Passing Heungnyemun, between the gate and the throne hall is a large courtyard. 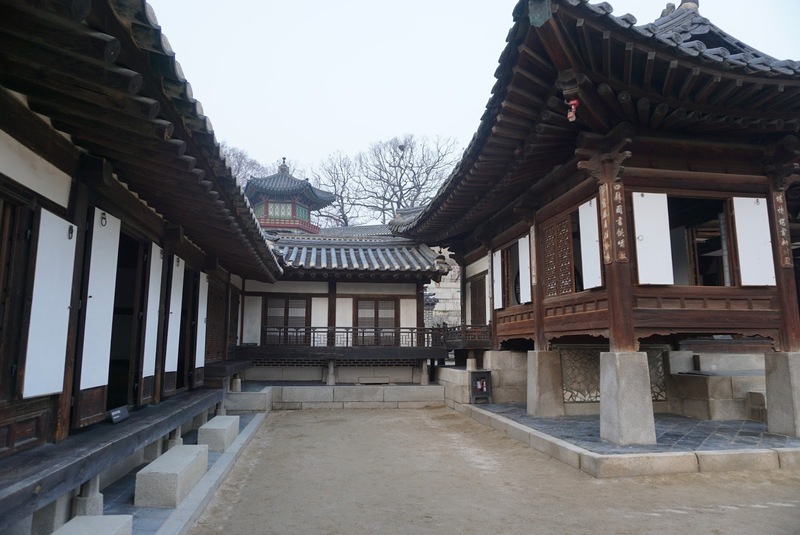 Similar to that of Changdeokgung, there are tablets on the ground of this courtyard marking where the various rank officials would stand when the King is holding his audience sessions with his subjects inside the throne hall. 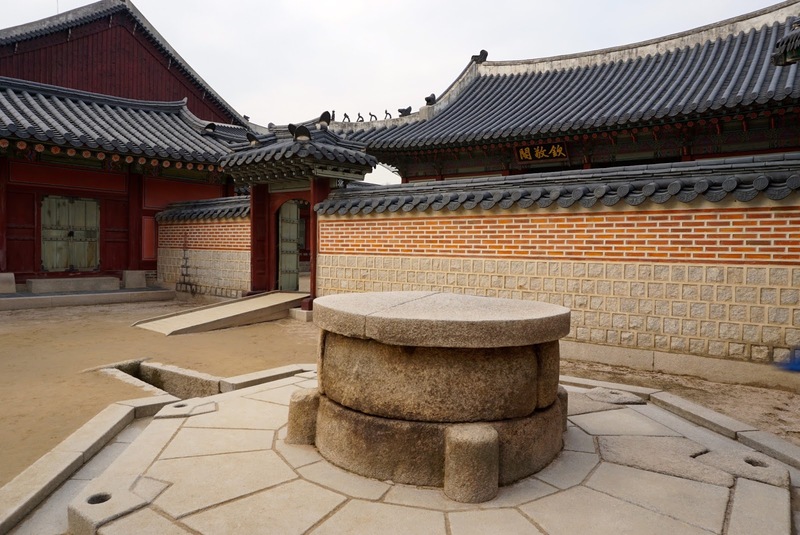 I would imagine the higher ranker officials will be housed inside the throne hall, while the relatively lower ranking officials would stand, according to their ranks as inscribed on these tablets, in this courtyard. 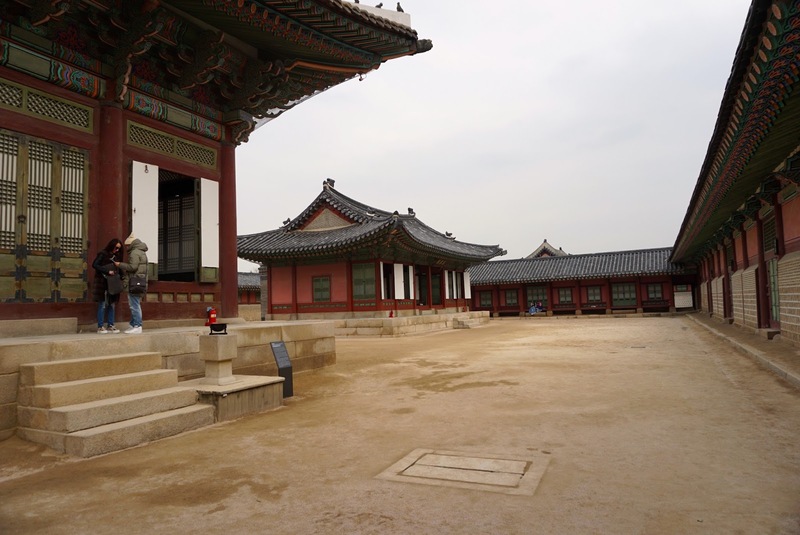 Before we head to Geunjeongjeon, we exited left of the throne hall area headed for Sujeongjeon. 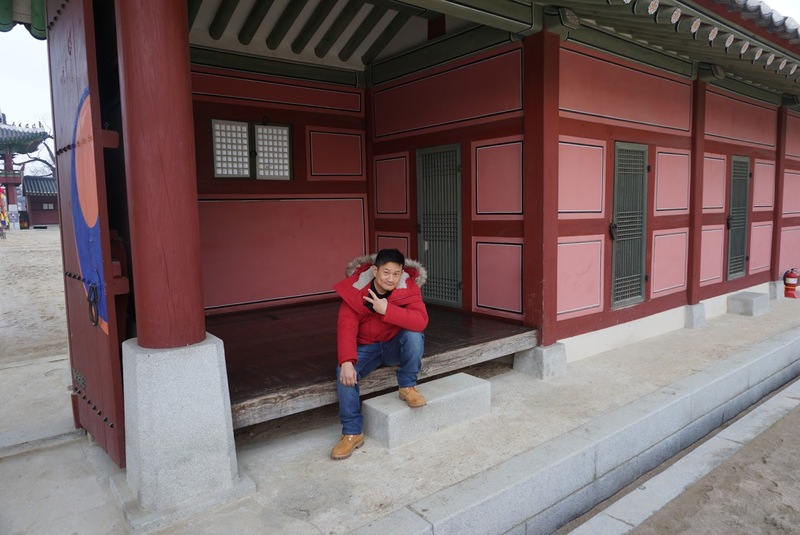 The lone building red building of Sujeongjeon, was once used as an office for the cabinet. 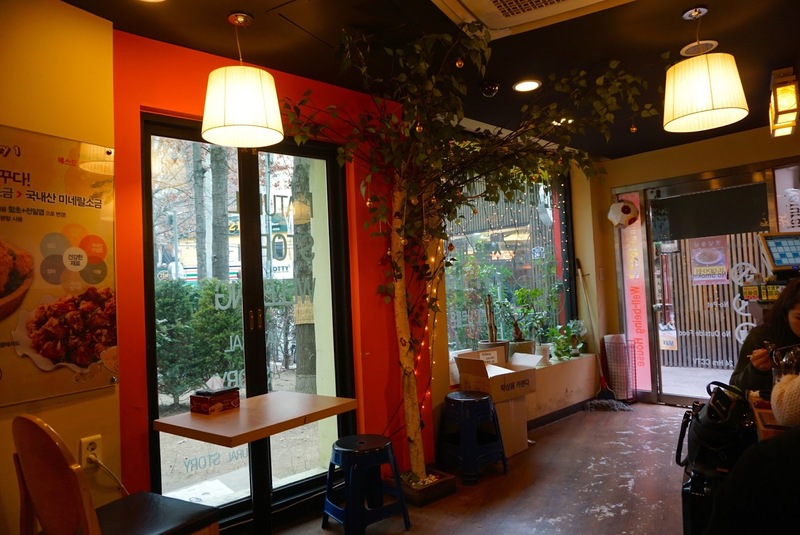 The building is fairly simple in its design and decor. 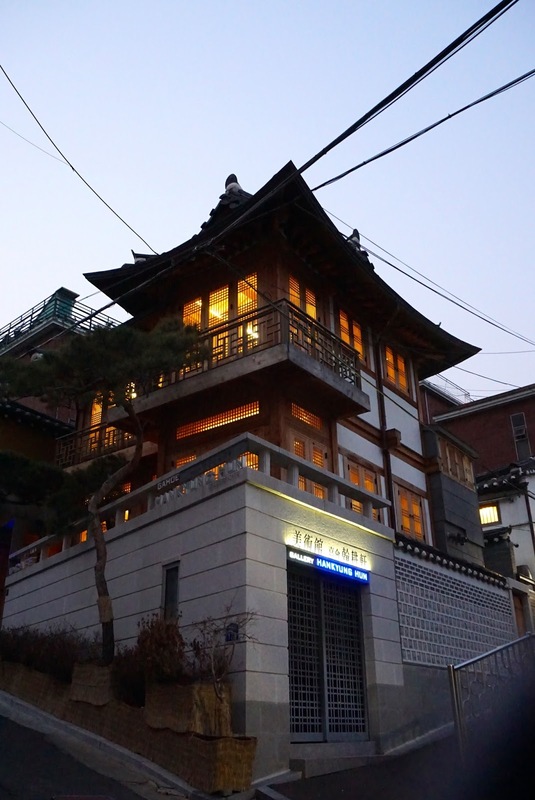 Opposite Sujeongjeon is a cafe and a gift shop where one can grab a cup of coffee or get some souvenirs. 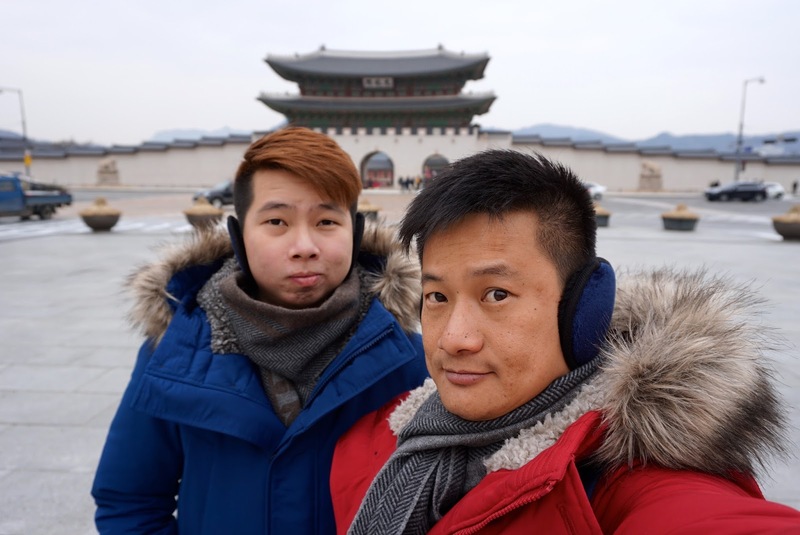 We moved backed into the throne hall area and headed to the throne hall. 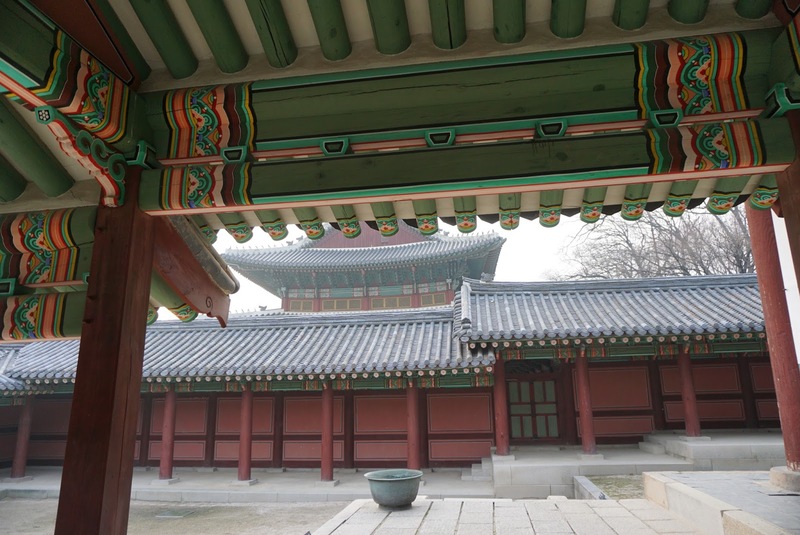 The throne hall, Geunjeongjeon Hall, is nested on top of 2 raised platforms. 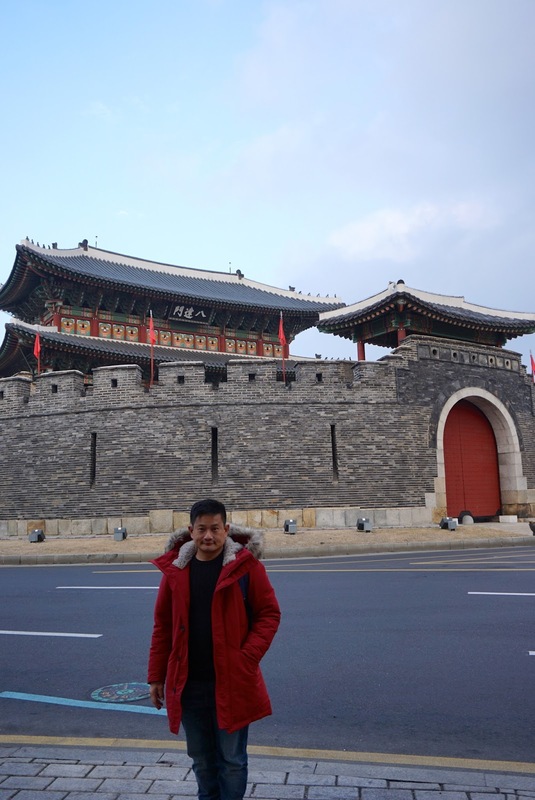 The throne hall is where the King held important state functions and court officials’ audiences. 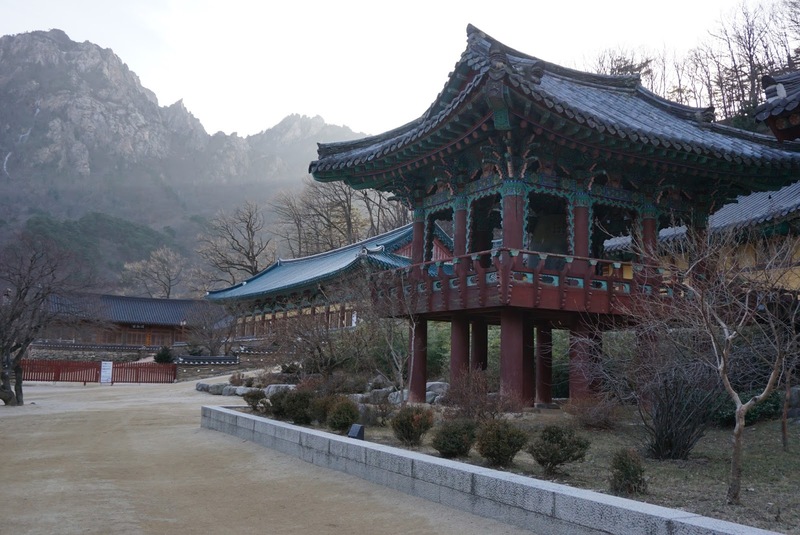 It also served as a venue where the new kings were being crowned. 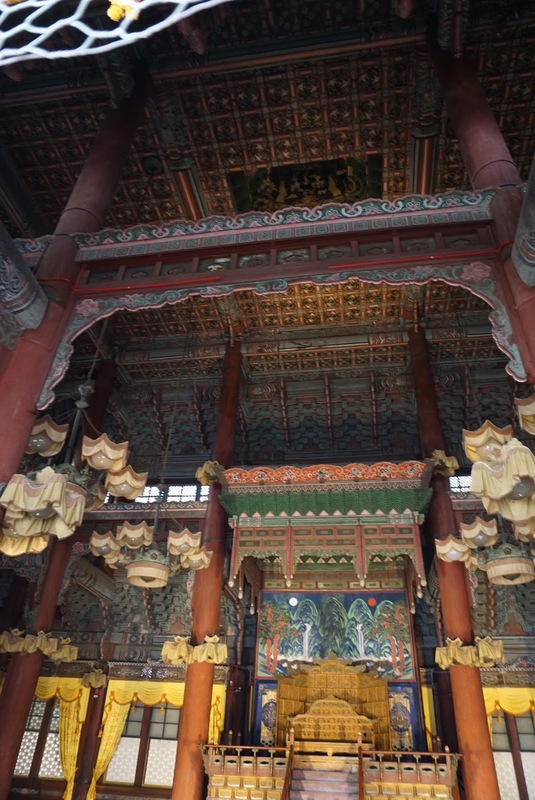 The decor of the interior of the throne hall is rather simple, covered with black tiles with high elaborated decorated ceilings, painted with red and green colour schemes. 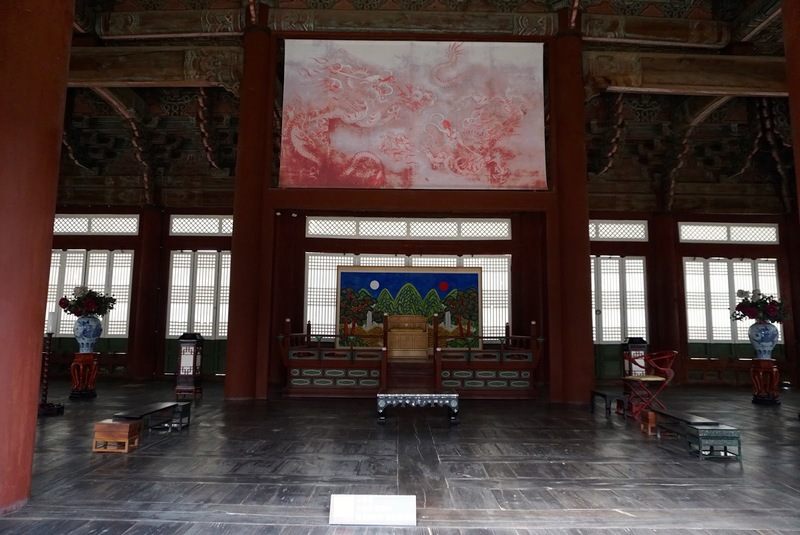 In the centre of the hall is the throne, perched on a raised platform, decked in red with a painting of mountain as a back drop, the throne hall looks different from that in Changdeokgung. 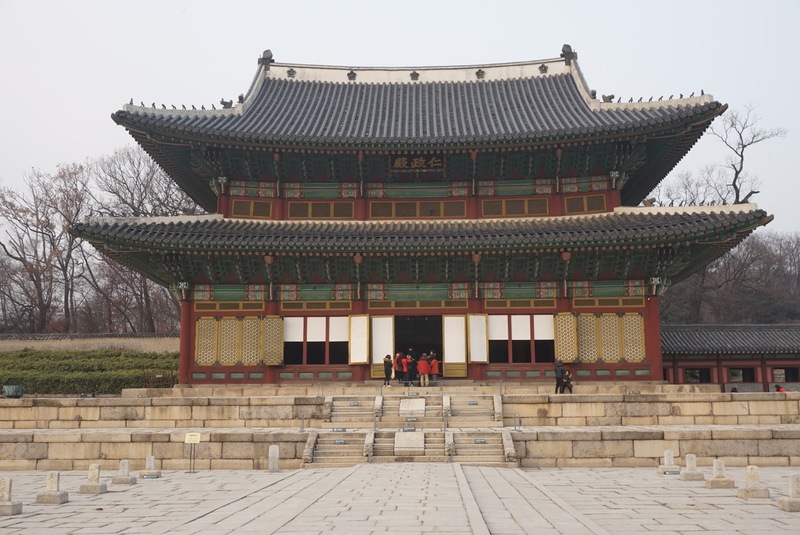 In comparison, the throne hall in Gyeongbokgung looks smaller and modern, while that in Changdeokgung looks roomier and older. 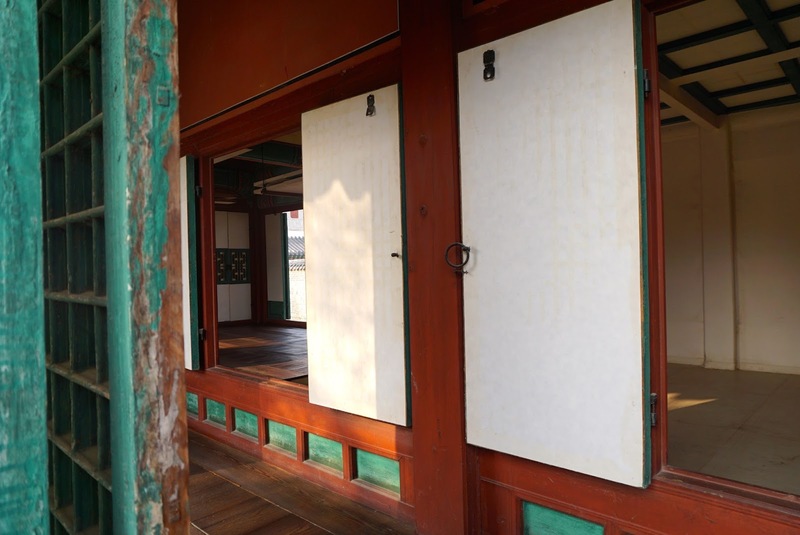 There are some furnitures in Geunjeongjeon, which probably serves to show visitors how the throne hall was decorated in the olden days. 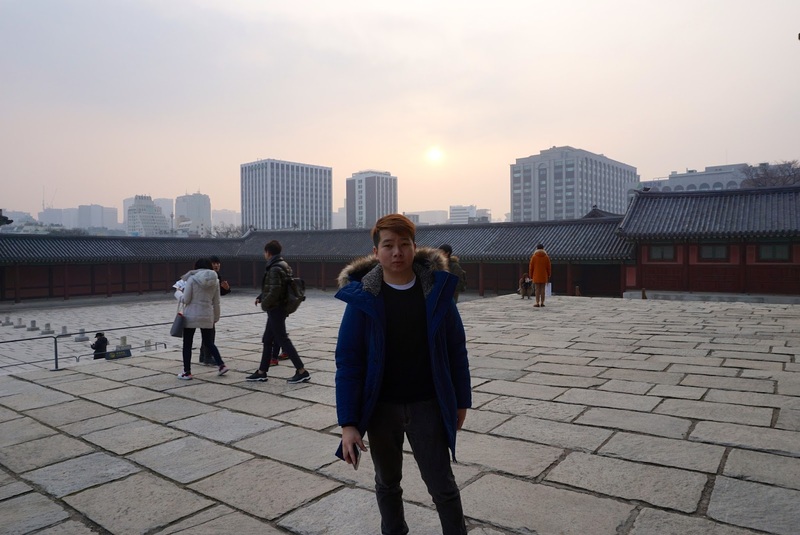 After taking some pictures of the throne hall, we headed to the rear of the throne hall to the Sajeongjeon Hall. 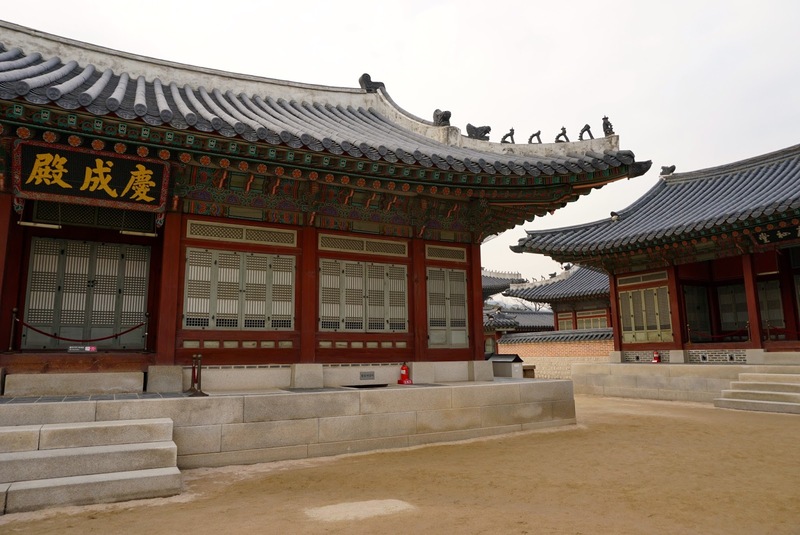 This simple stand alone building is one of the three buildings directly behind the throne hall. 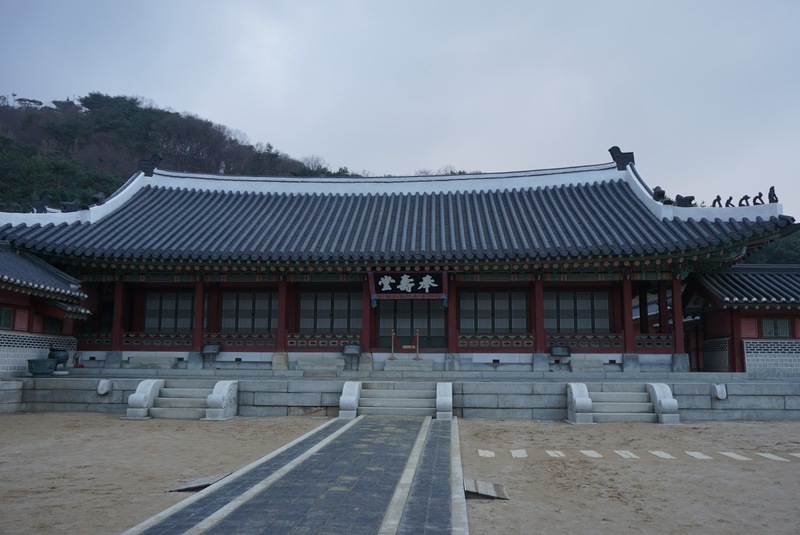 It is at Sajeongjeon where the king carried out his daily kingdom affairs, akin to the office of the king. 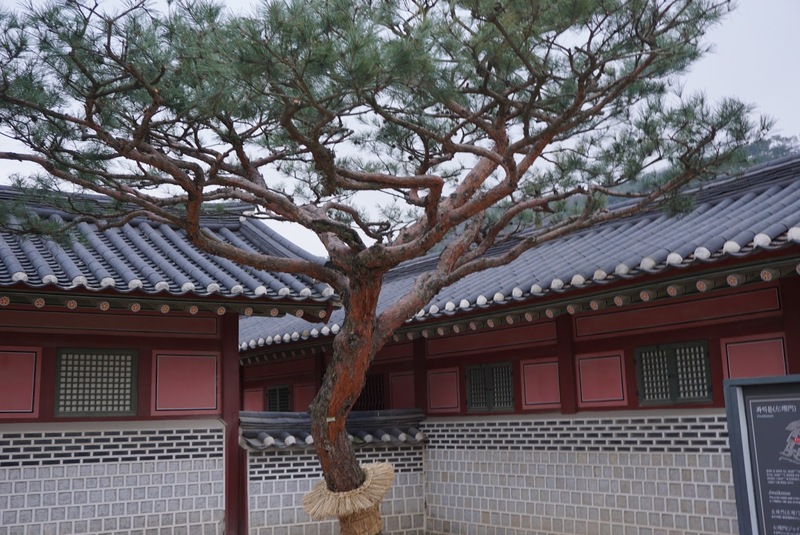 The interior of Sajeongjeon feels like a miniature version of Geunjeongjeon. 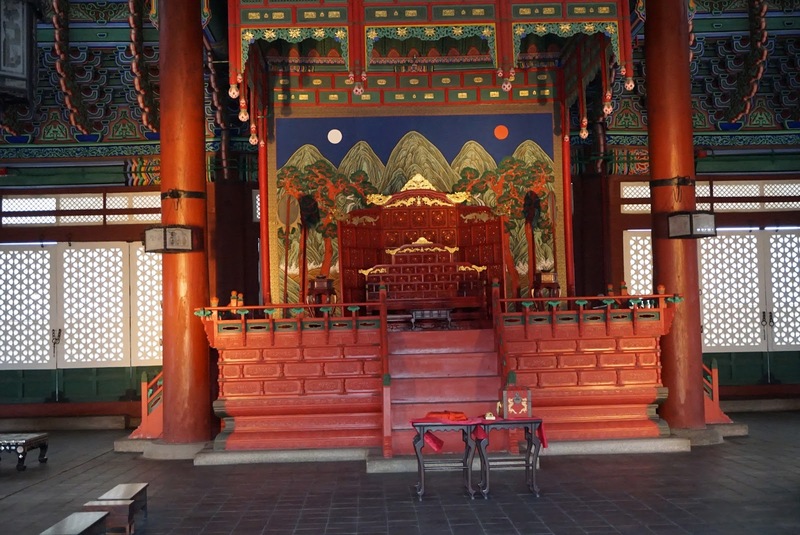 There is a smaller throne in the centre of the building, with portrait of mountain again as backdrop to the throne. 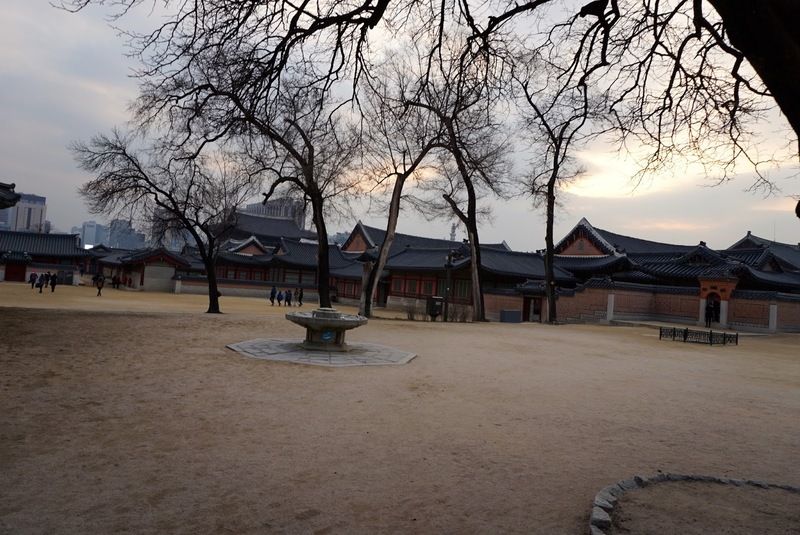 Together with the buildings to the left (Cheonchujeon) and the right (Manchunjeon) of the Geunjeongjeon, this area forms the office quarters of the palace. 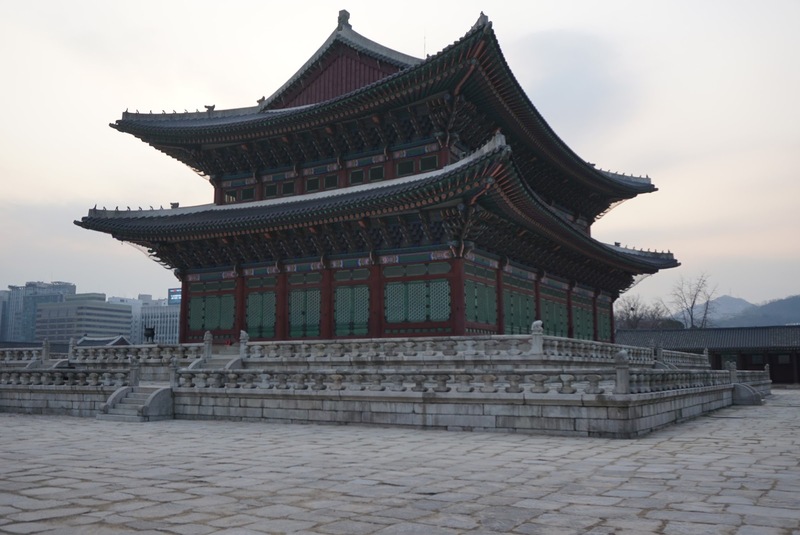 The king would use the building in the centre, whereas his ministers uses those to the left and right. 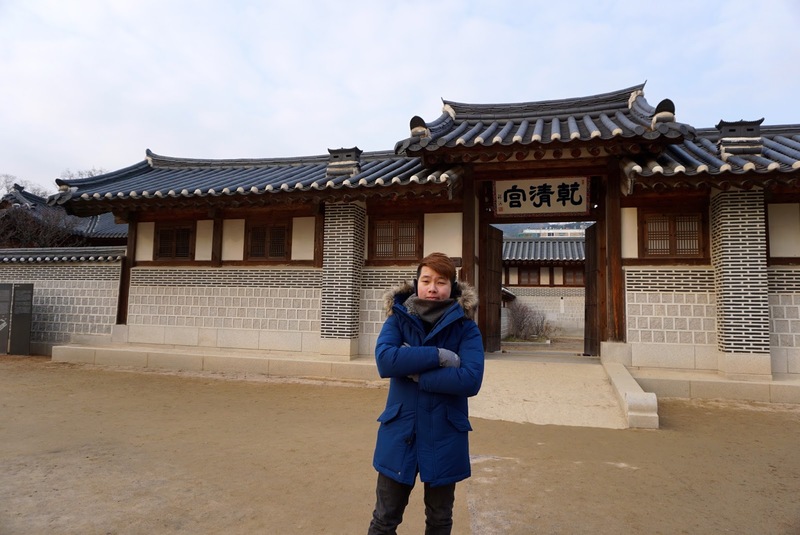 Passing a gated wall to the rear of the office quarters, we arrived at the living quarters for the royal family. 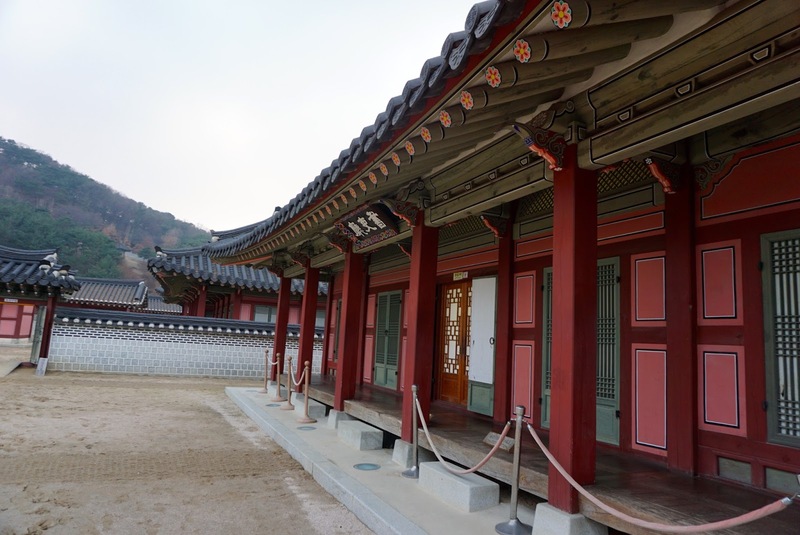 The centrepiece of this area is the king’s sleeping quarters – Gangnyeongjeon Hall. 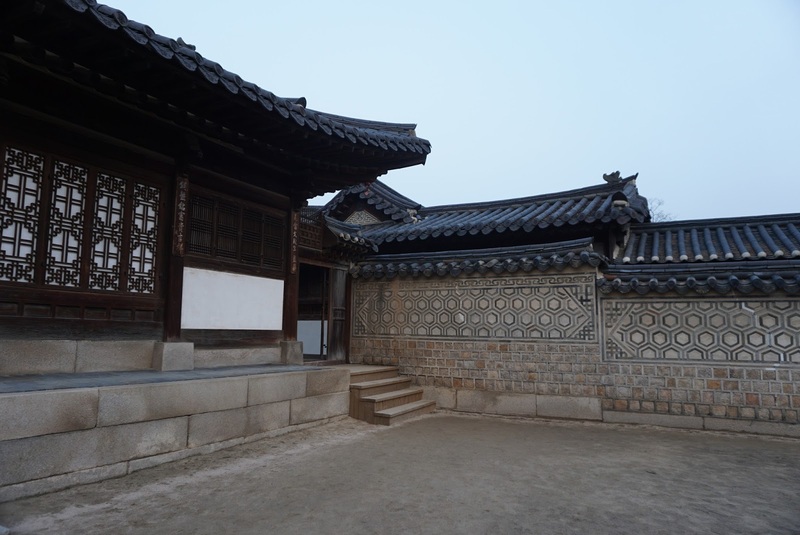 The centre portion of Gangnyeongjeon Hall was left open for visitors to see how it looked inside. 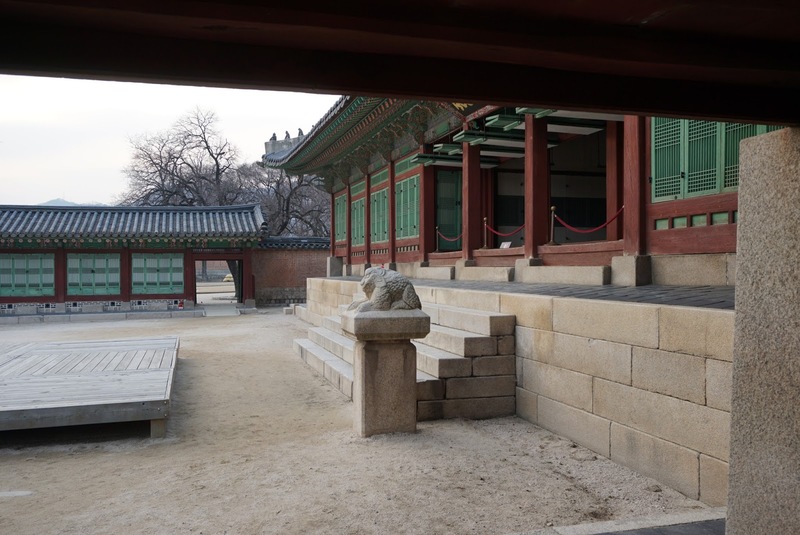 This open area is rather large and I would imagine this is where the king would entertain some of his subjects and even his queen and concubines. There wasn’t any furnitures placed here at the time of our visit. 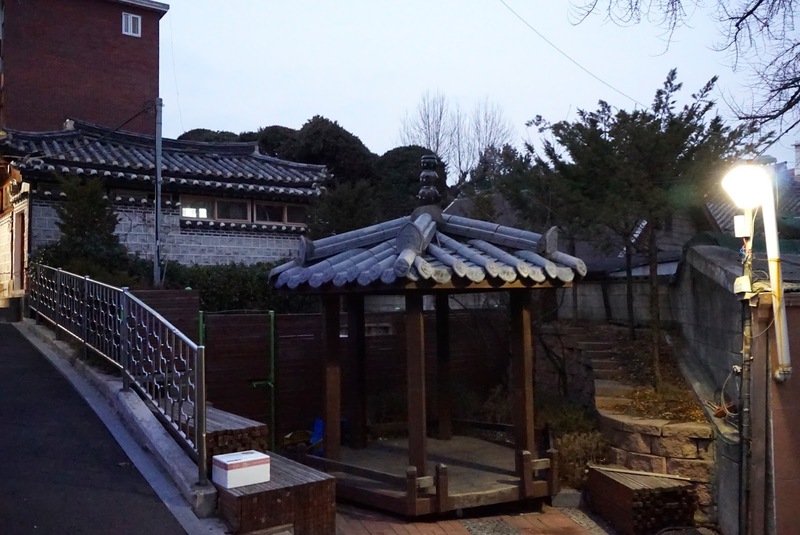 There are some buildings around Gangnyeongjeon Hall, which are closed to visitors. To add to the confusion of the purposes of these other buildings around the King’s chambers, there isn’t any signages around to explain the purpose of these buildings. 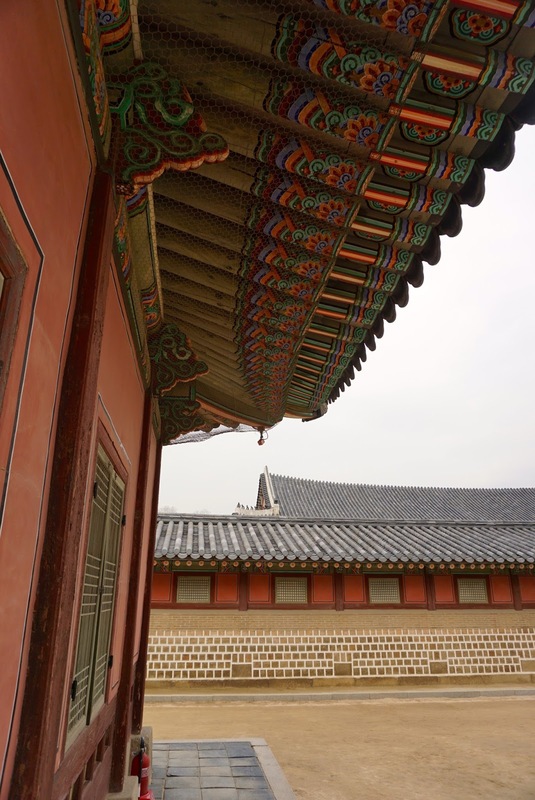 I can only imagine these are perhaps quarters for the king’s bodyguards, who were likely to keep watch over the king while he is in his chambers. 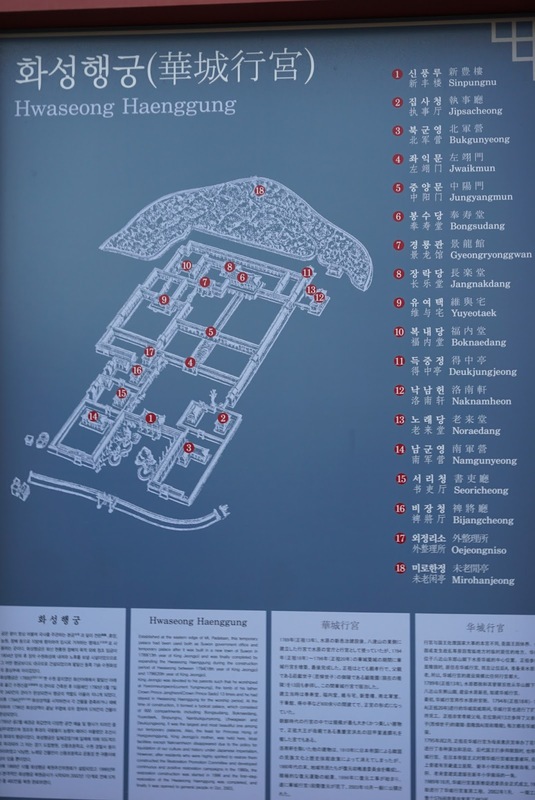 As we did not get a copy of the map around the palace (the compounds of the palace is really huge), my friend and I roamed around the remaining palace grounds, without knowing what is what. At certain point, all the buildings looked the same to us and we were starting to get bored. 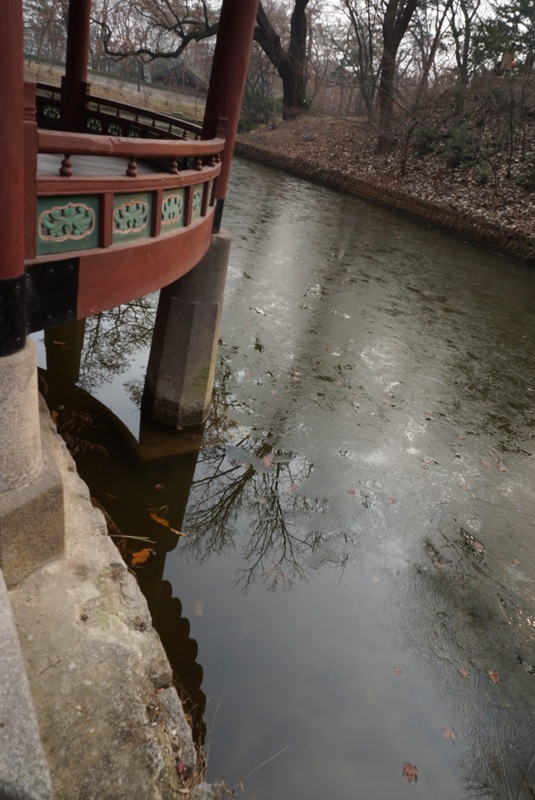 As we were walking around from buildings to buildings, we ended up in an open area where we saw a frozen pond with a man-made island in the centre, connected by a small bridge. 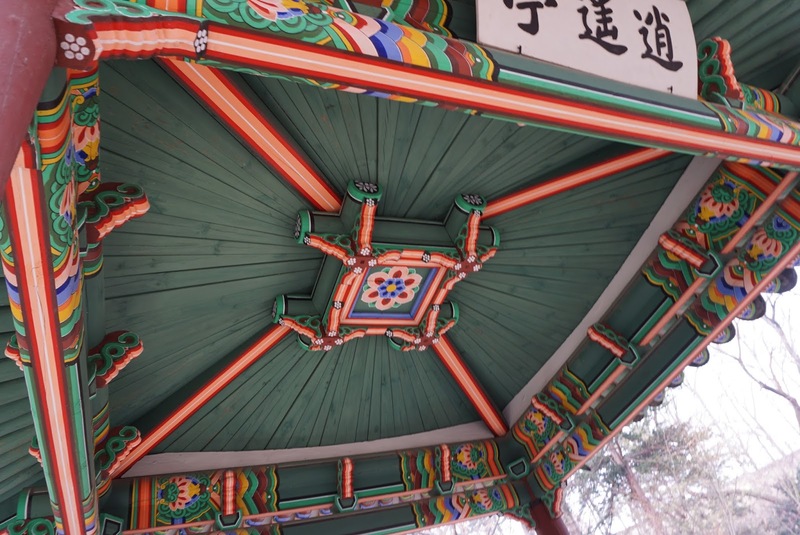 On the island is a 2-storey pagoda building decked in mostly green painting. 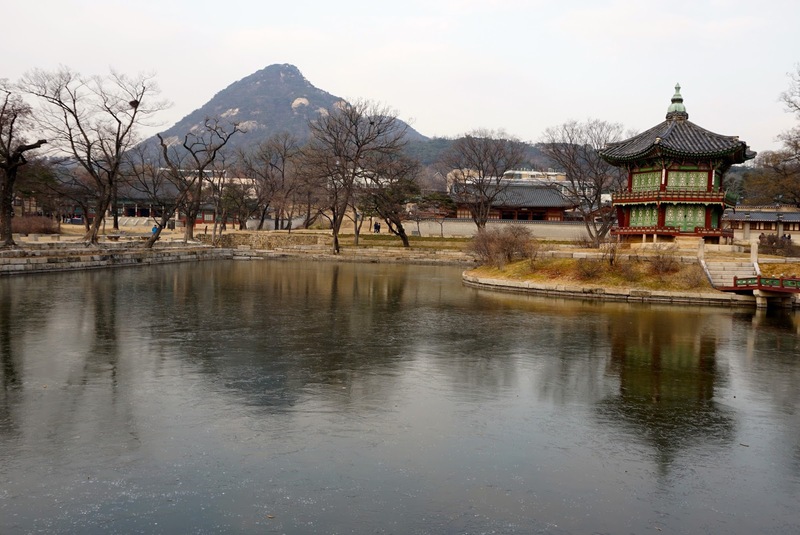 I reckon the pond and the pagoda built in front of a mountains forms a picturesque and tranquil scene. Walking past the pond, we headed to the buildings to the north of the pond. 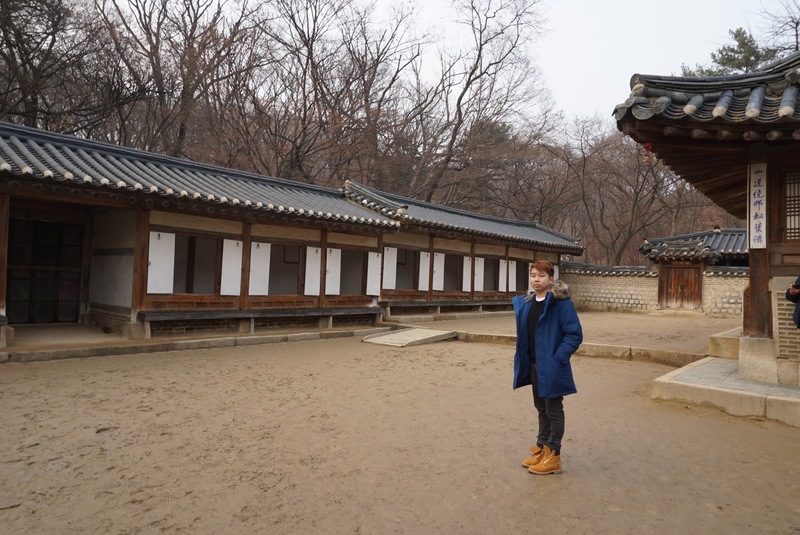 This set of buildings looks very simple and small as compared to the other areas of the palace. 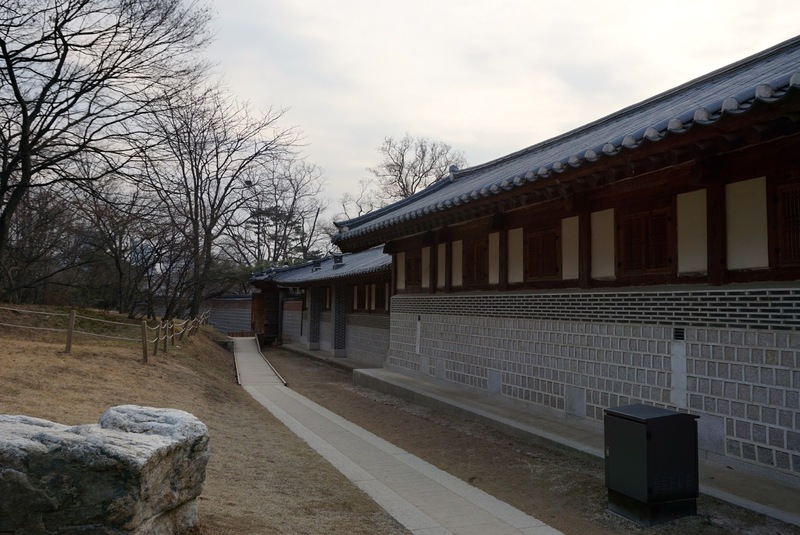 A little research reveals this compound- Geoncheonggung residence is an annex of the palace where the king and the queen would stay to enjoy some peace and quiet, away from the hectics of running the country. 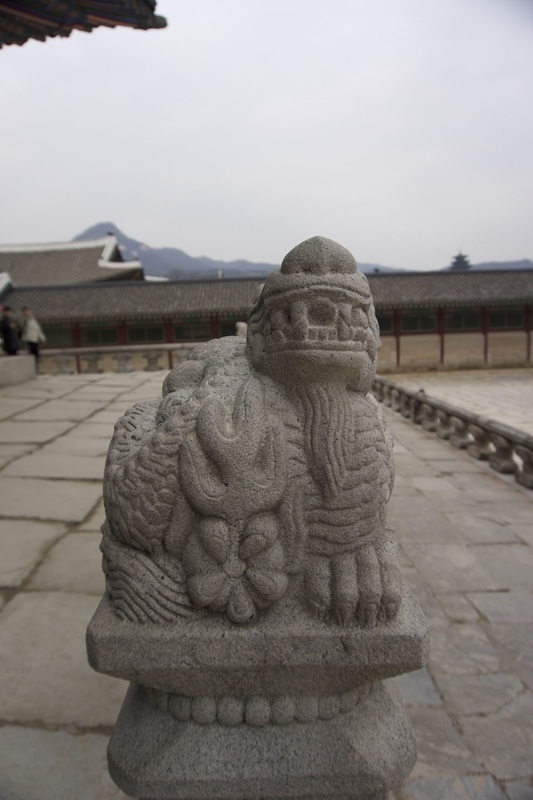 There are a few buildings within the compounds of Geoncheonggung consisting of the sleeping chambers for the king and the queen, as well as a library. 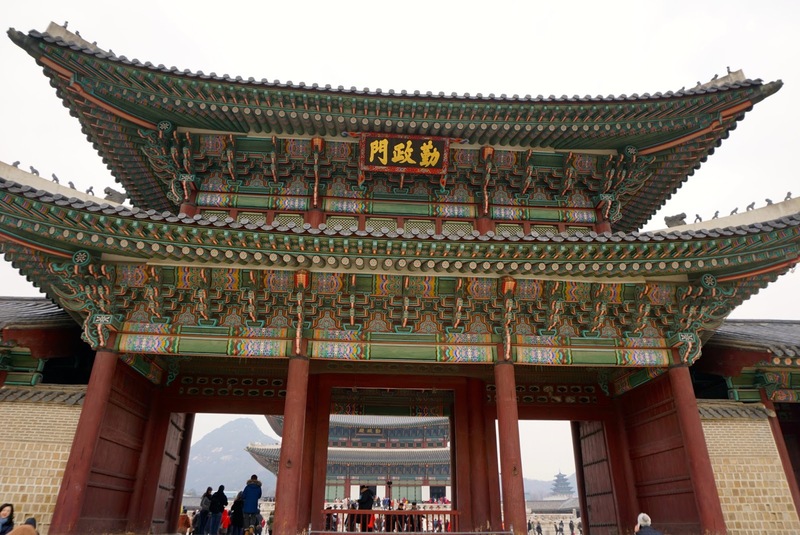 We continued our tour inside of Gyeongbokgug and came across a side entrance to the palace. 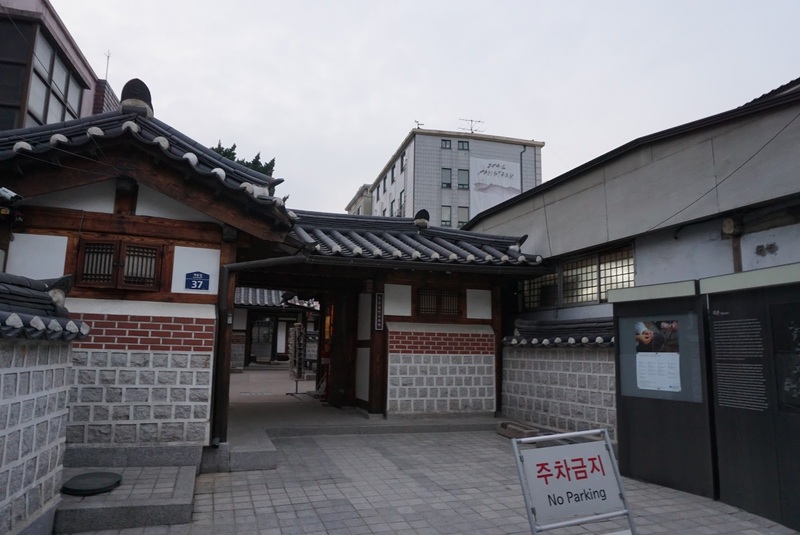 This happens to be an entrance to the Korean Folk Museum. 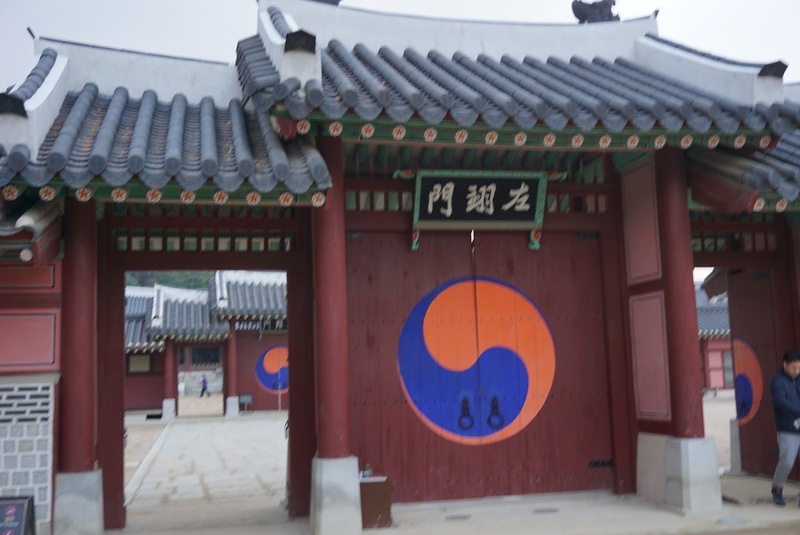 A staff stationed at the entrance came up to us and encouraged us to visit the Korean Folk Museum. 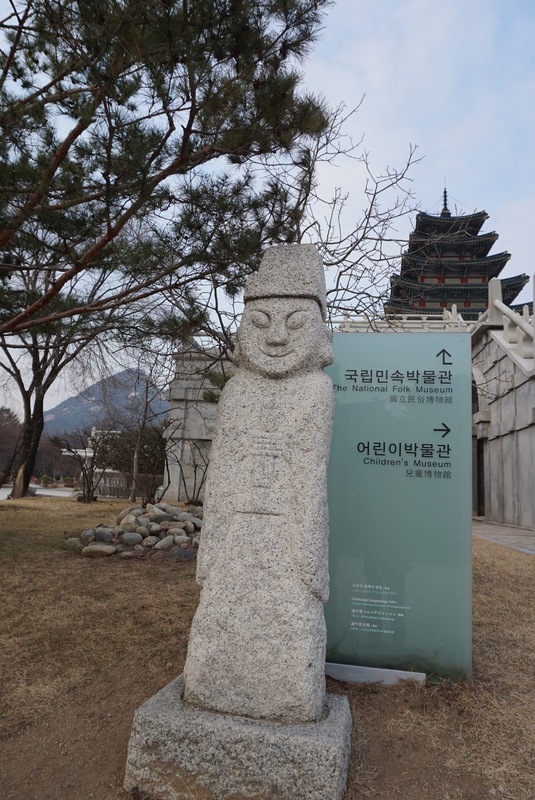 Entrance to the museum is complementary and we can gain re-entry into Gyeongbokgung with our ticket later. As we thought we could afford a moment of detour, we decide to heed the advise of the staff and make a quick visit. As we were not really interested in museum visits, we saw some interesting structures at the compounds outside the museum and headed to these structures instead. 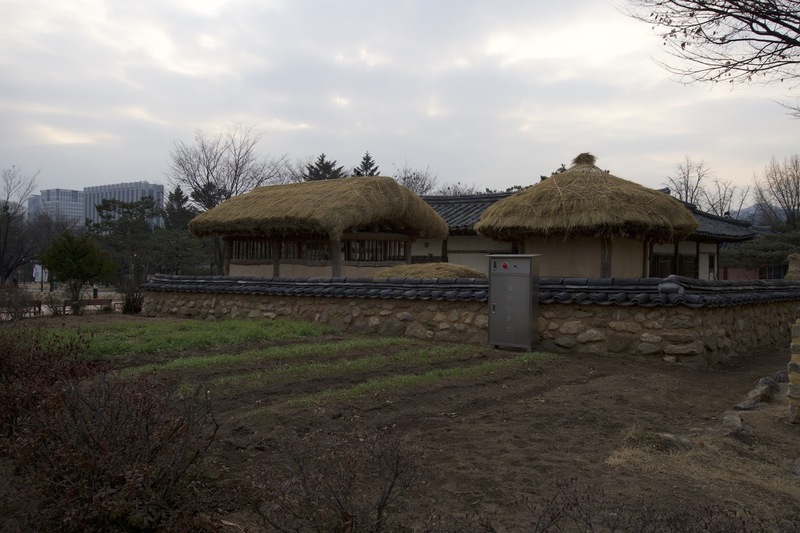 This is the open-air exhibition area which showcases rural life as well as modern and contemporary streets of Korea. 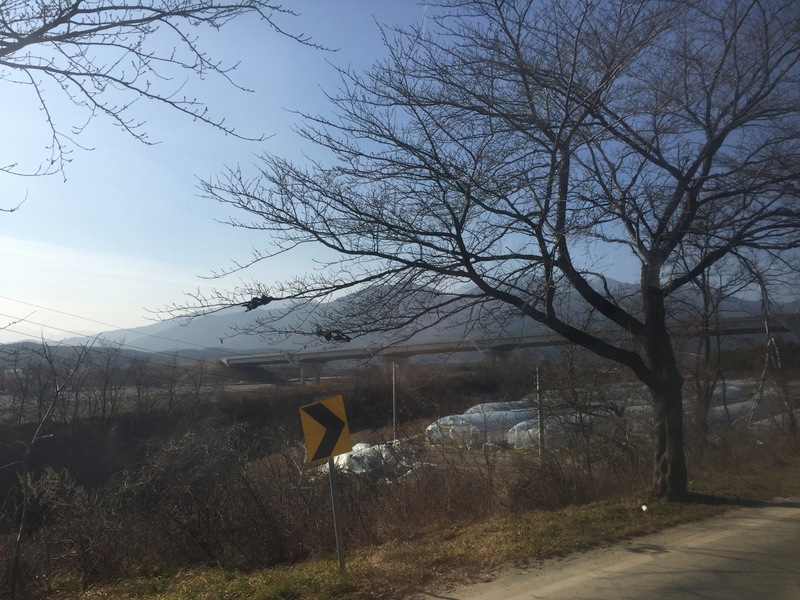 We headed to the rural area to find a farm house and a mill on display. 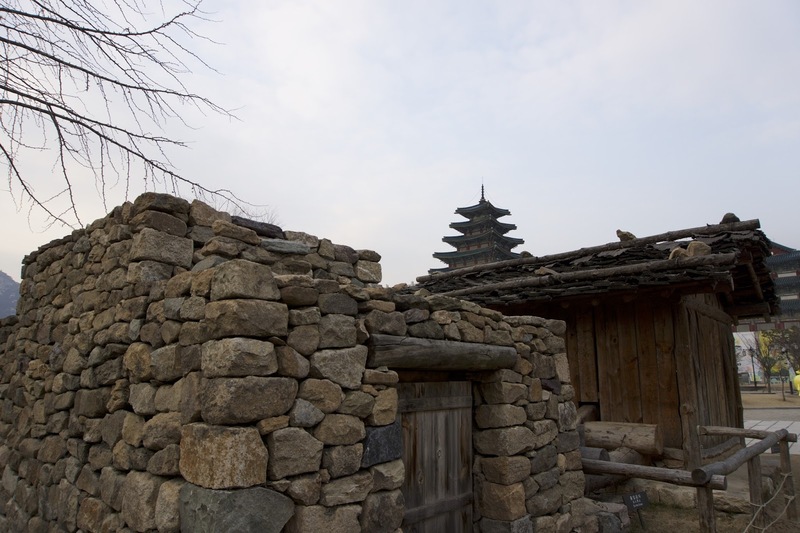 Nearby the rural farm house is an open area with spirit posts, which were used by the villagers to prevent natural disaster and bring about bountiful harvest. 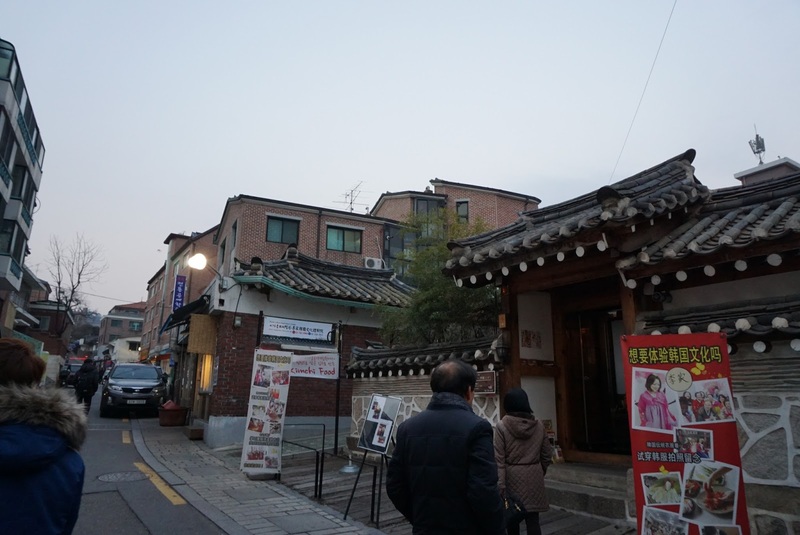 Next to the mill, is a Street of Memory, which comprises of street scene of Korea in the 1970s. 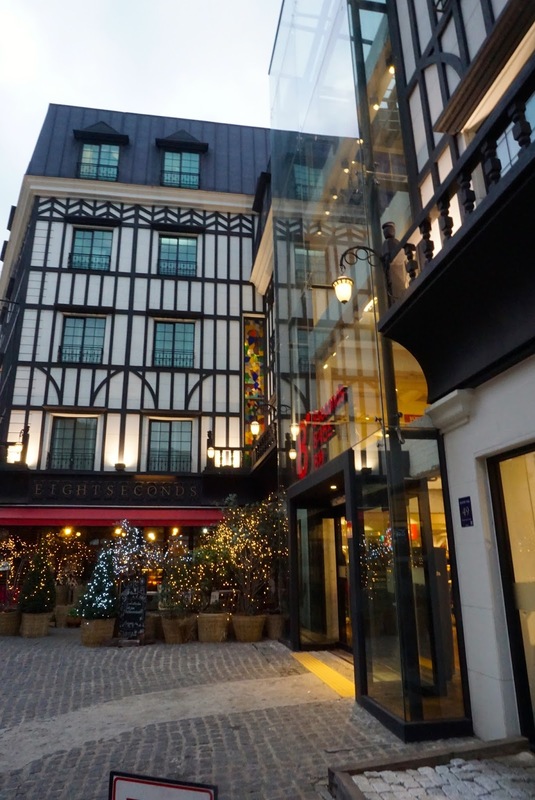 There are some shops replicated here. 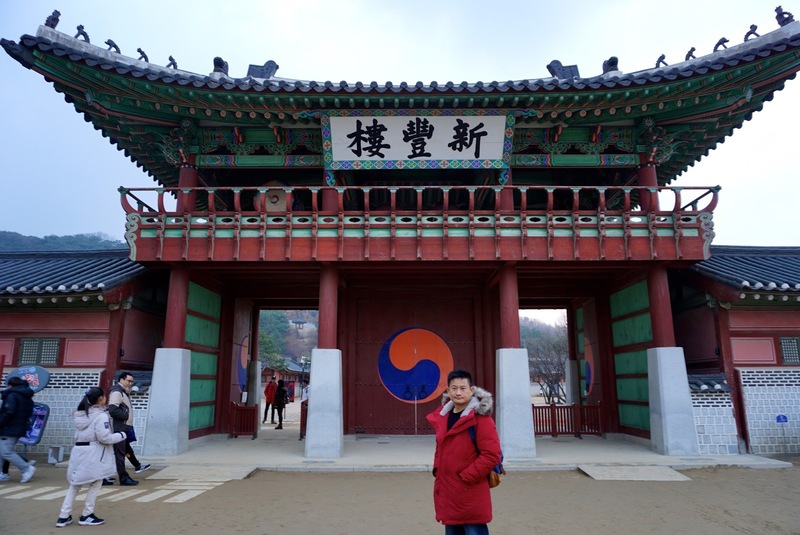 We headed back into Gyeongbukgung after taking some pictures here. 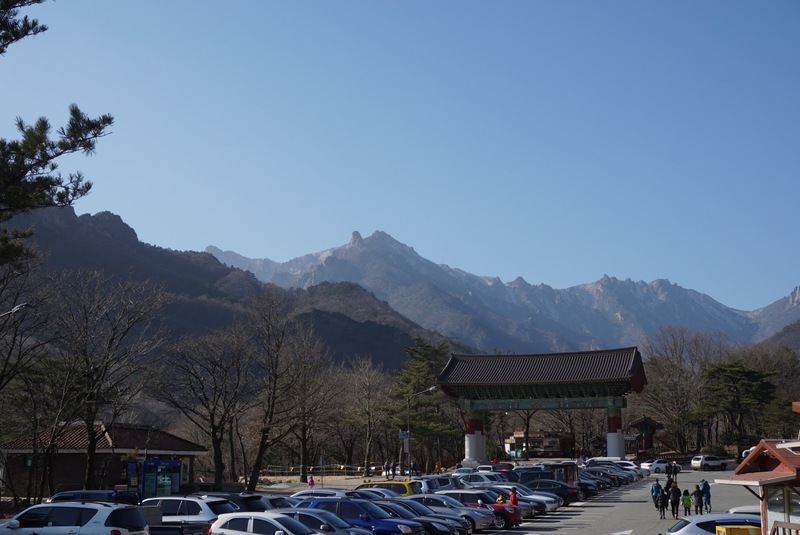 Heading back into Gyeongbokgung, we continued where we left off. By this time, the palace is about to close and we could only brush through some of the buildings, hoping to cover as much as we could in the remaining time we have in the palace before it calls off the day. 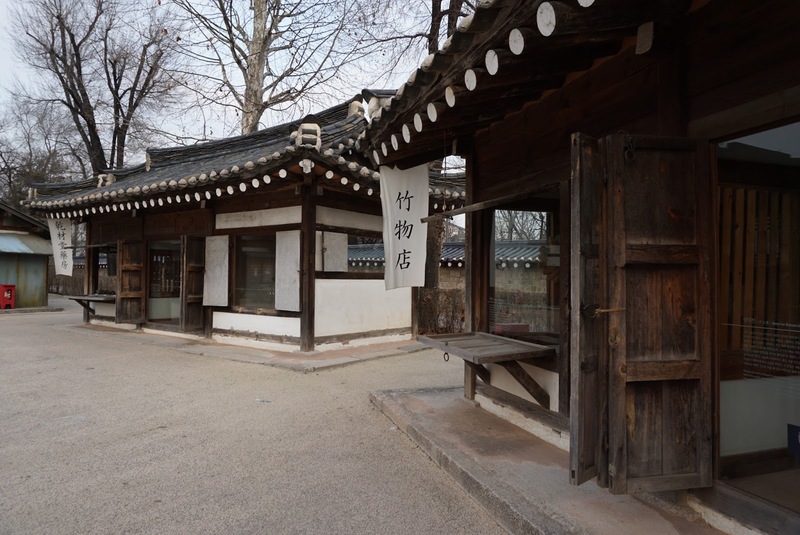 As we headed southwards towards the entrance of palace, we came across the Jagyeongjeon Hall, the living quarters of the adoptive mother of King Gojong, Dowager Jo. 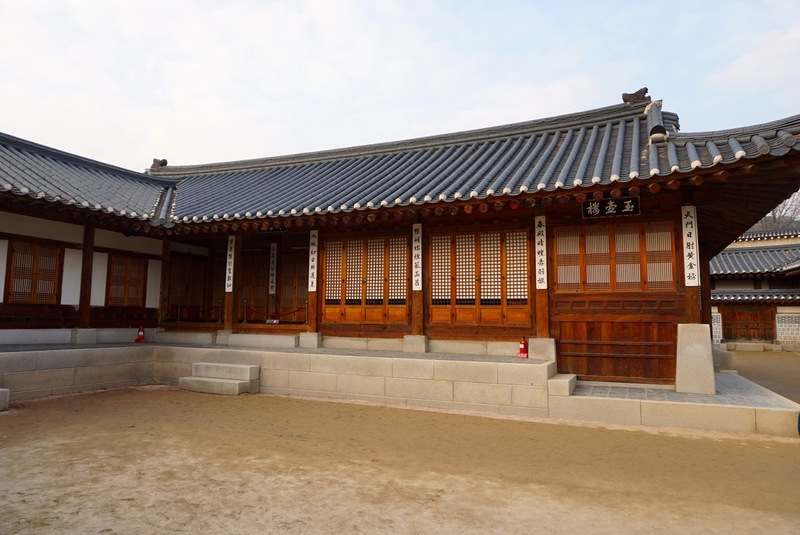 This hall is composed of two rooms with Ondol (heated) floors, Bogandang and Jagyeongjeon Hall and a veranda, Cheongyeonnu, to the southwest. 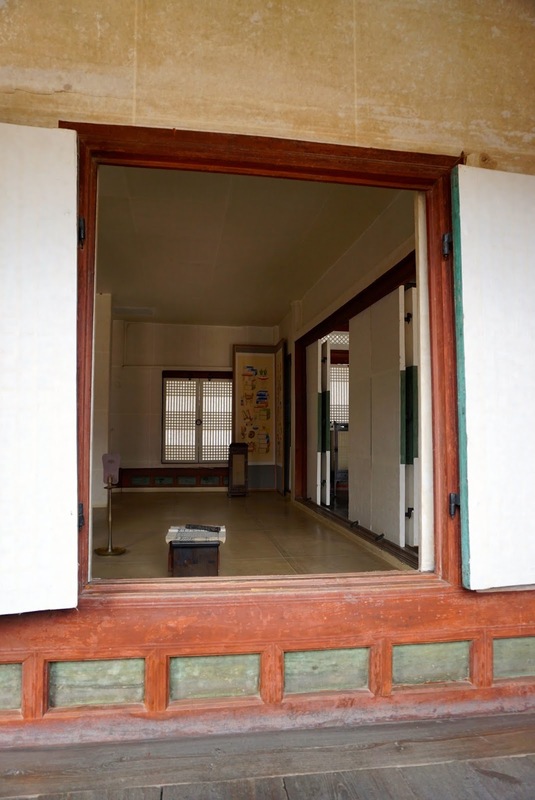 The east side of Cheongyeonnu is connected with another room. 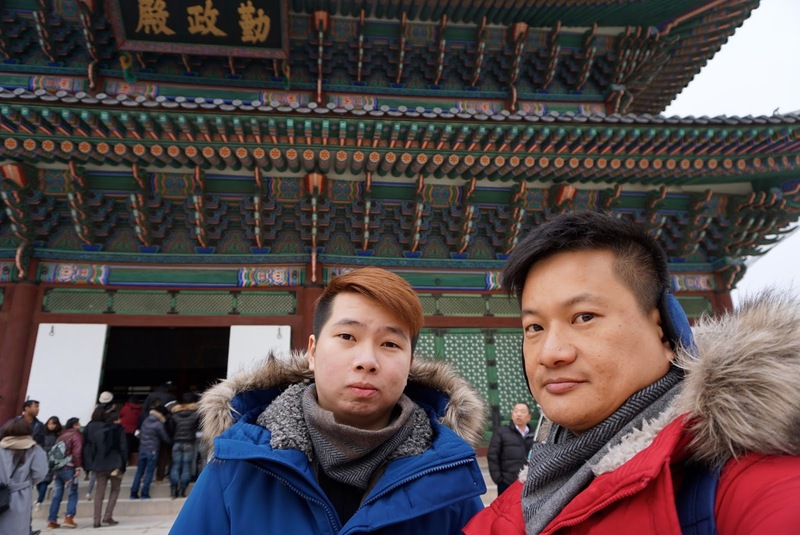 As the palace was about to close, we hurried back to the entrance of the palace and decided to stop at the throne hall to take some pictures. 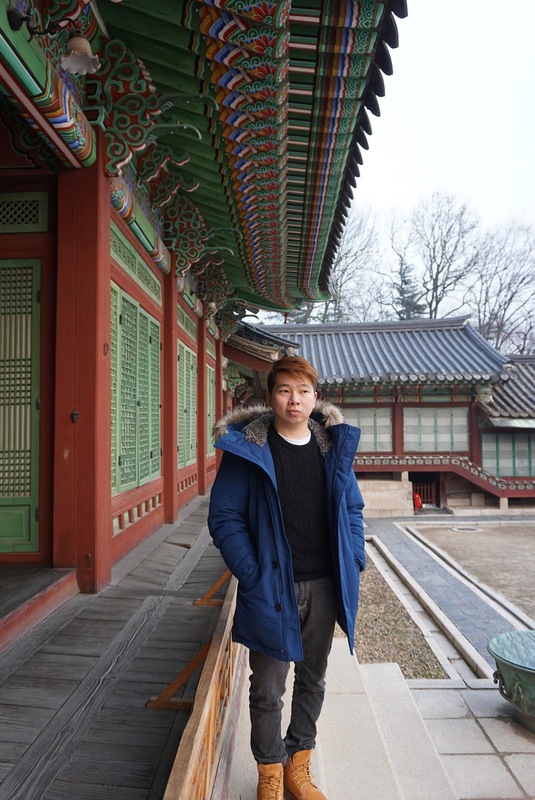 After taking some pictures, we headed out of the palace. 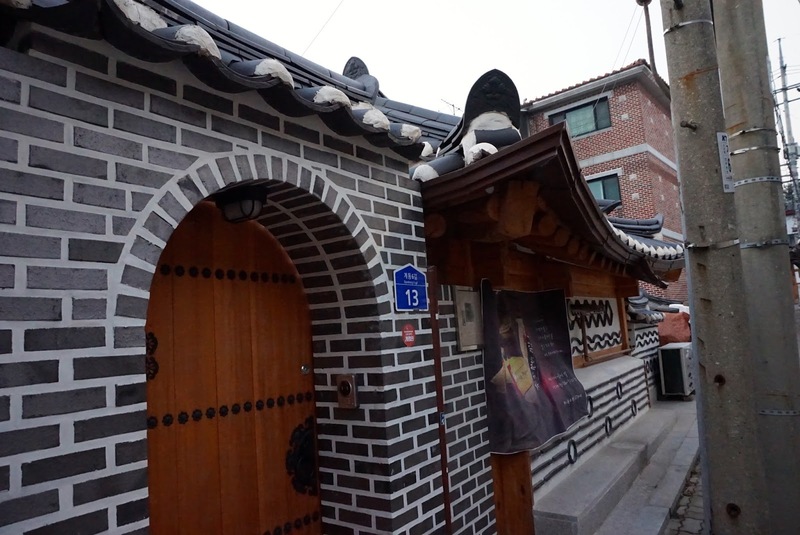 One of the places we wanted to visit is the Bukchon Hanok Village. 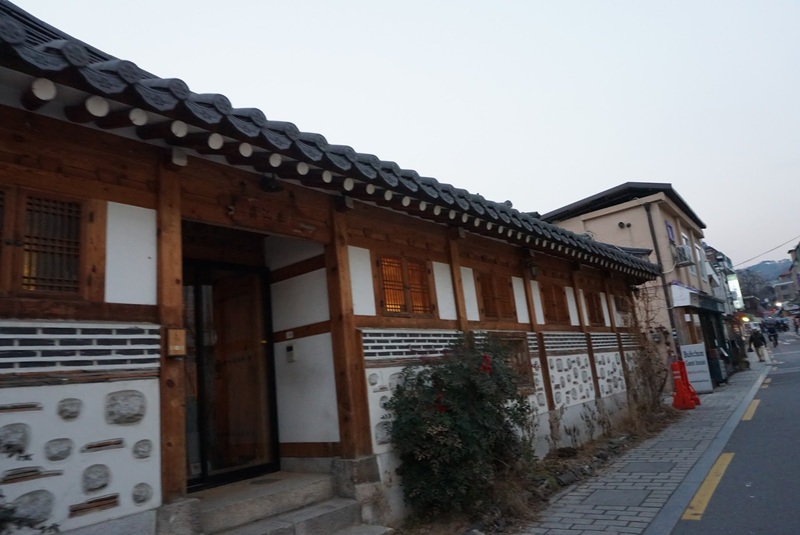 Bukchon Hanok Village is a a residential area which still retains the traditional Korean house architecture. 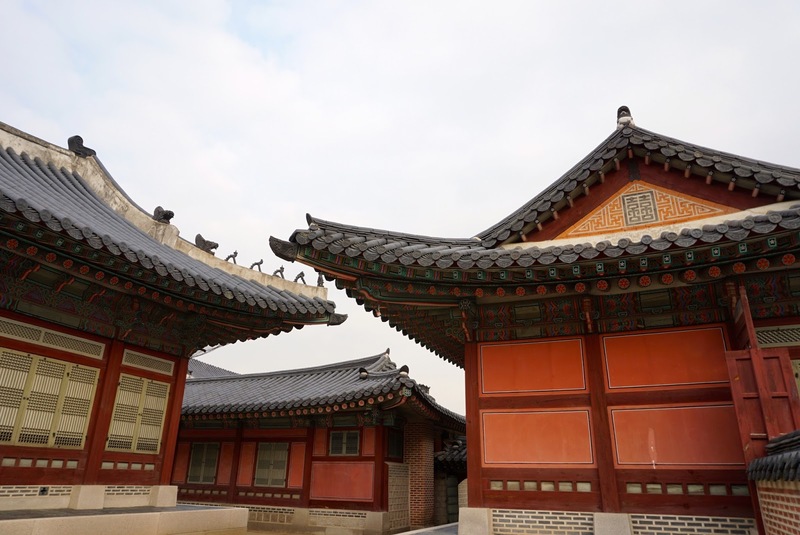 As the village is smack in between Gyeongbokgung and Changdeokgung, it is a short distance from Gyeongbokgung. We relied on Goggle map to bring us there on foot. 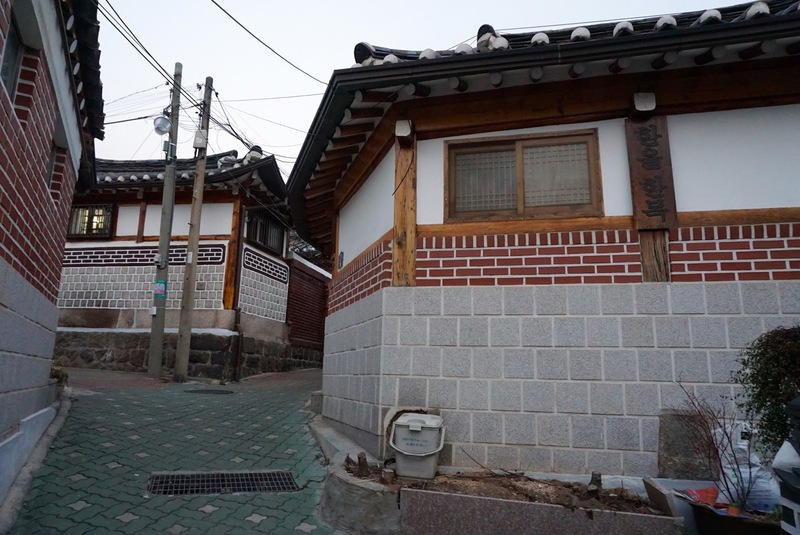 As soon as we reached where Bukchon Hanok Village, we were expecting to see some traditional housings the moment we reached Bukchon Hanok Village. 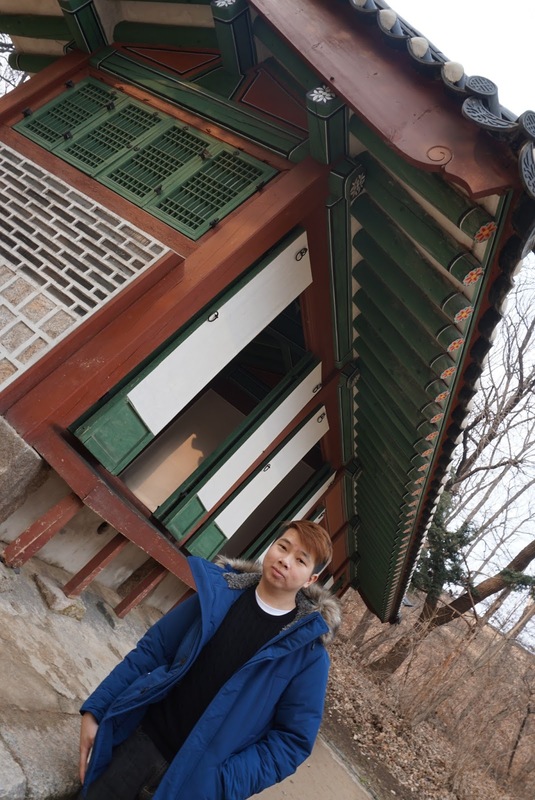 We were disappointed to see some modern architecture, we continued to walk towards a more secluded part of the area and soon some traditional buildings came into our sight. 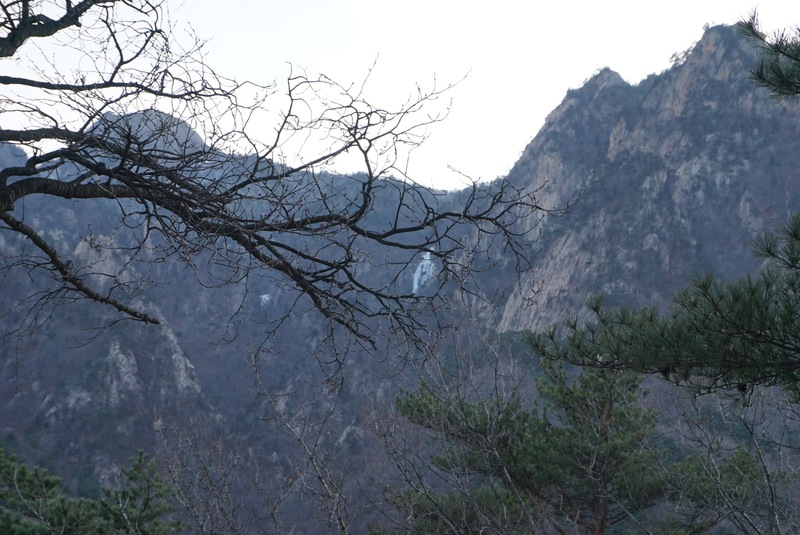 As it is already close to nightfall, most of the tourists would have already called it a day here. 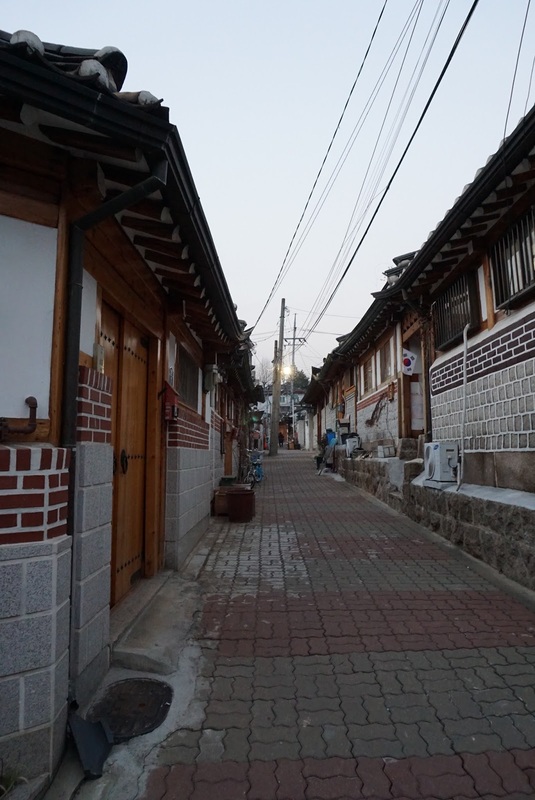 Strolling along the alley of Bukchon Hanok Village, looking at the various traditional houses is indeed a joy. 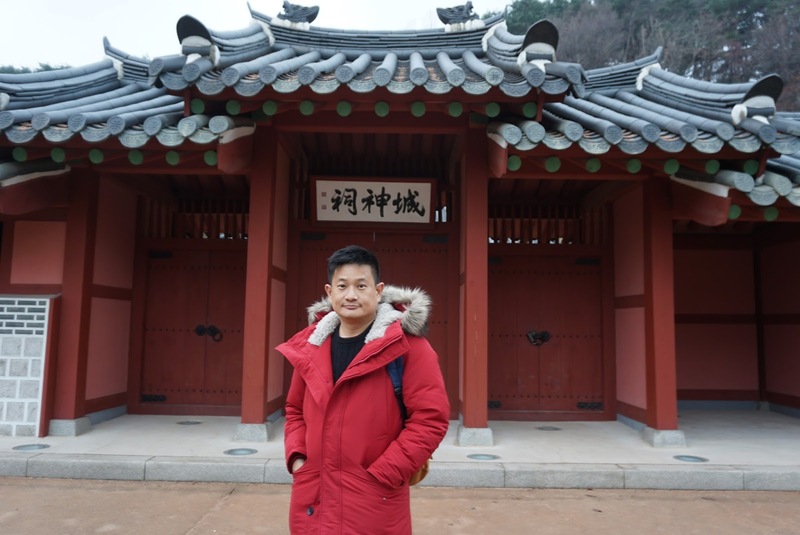 Soon all the buildings looked repetitive, we decided to get out of Bukchon Hanok Village and visit Namsan once more, hoping that there will not be a crowd like day 1 of our trip in Korea. 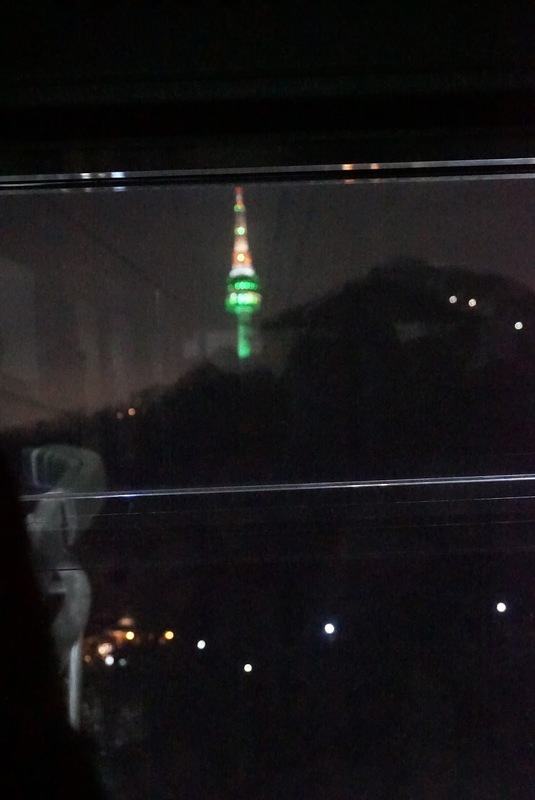 By this time, we were rather familiar on which subway station to alight and how to get to Namsan Cable car station from the subway station. 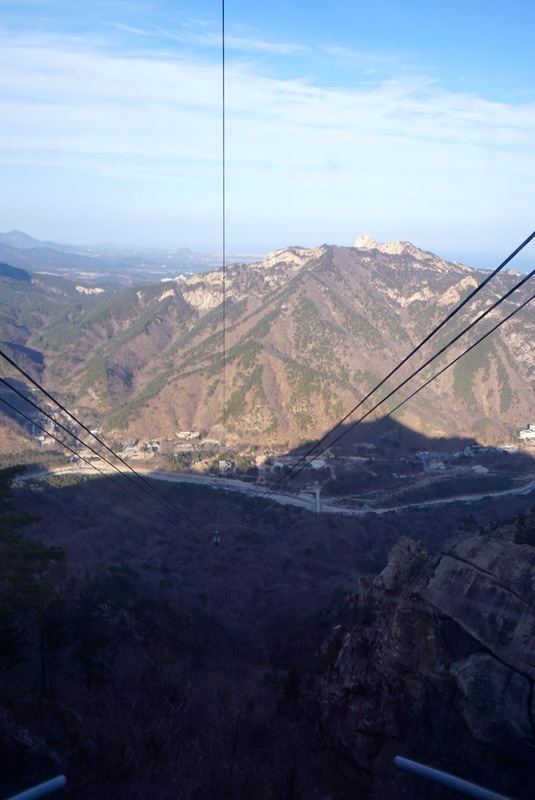 It did not take us long to reach the cable car station. We were not disappointed for our trip here. 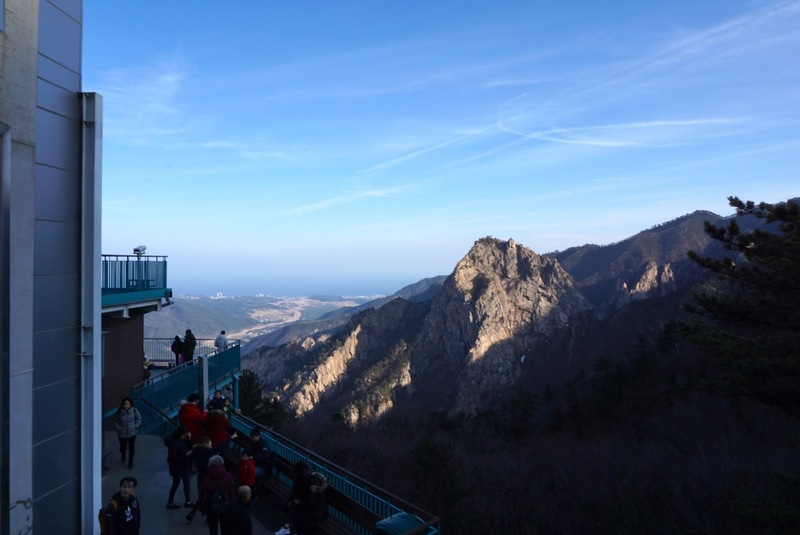 There was hardly any queue at the cable car station, we could board the cable car as soon as we bought our tickets. 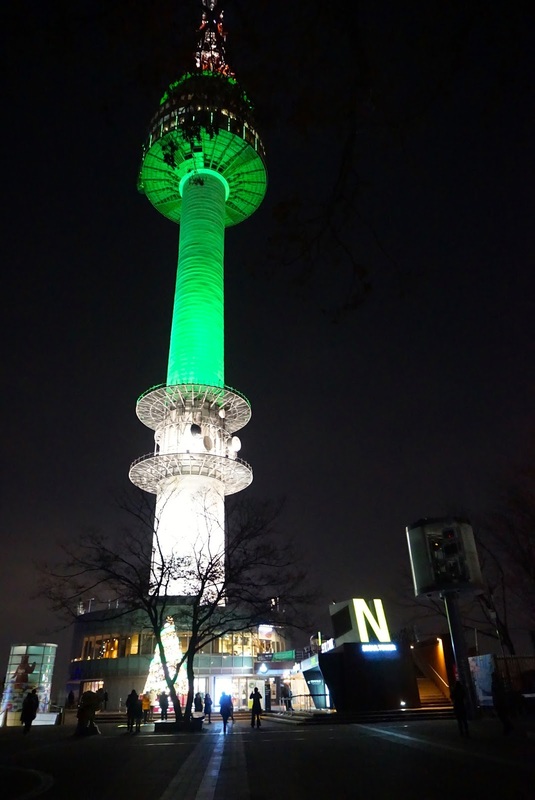 The ride from the cable car station to Namsan station took less than 5 mins and we soon found ourselves at the base of N Seoul Tower. 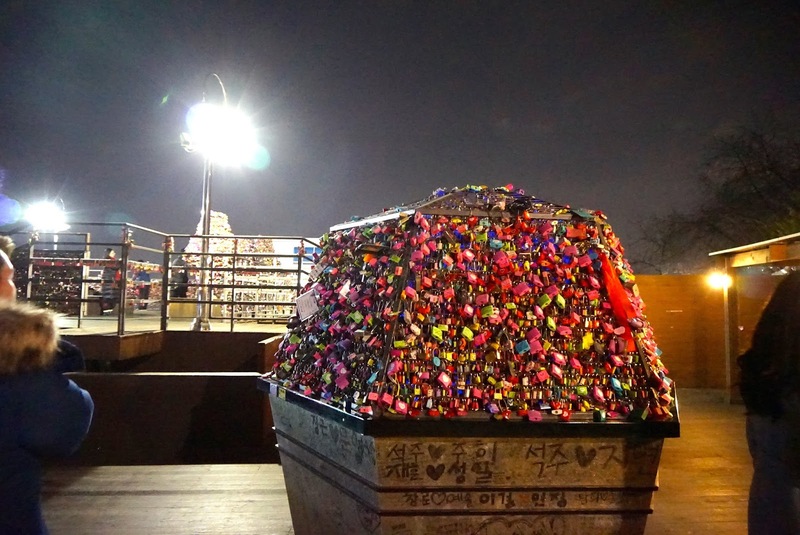 Namsan is famous for couples placing a pair of padlocks here and throw the key out at Namsan. 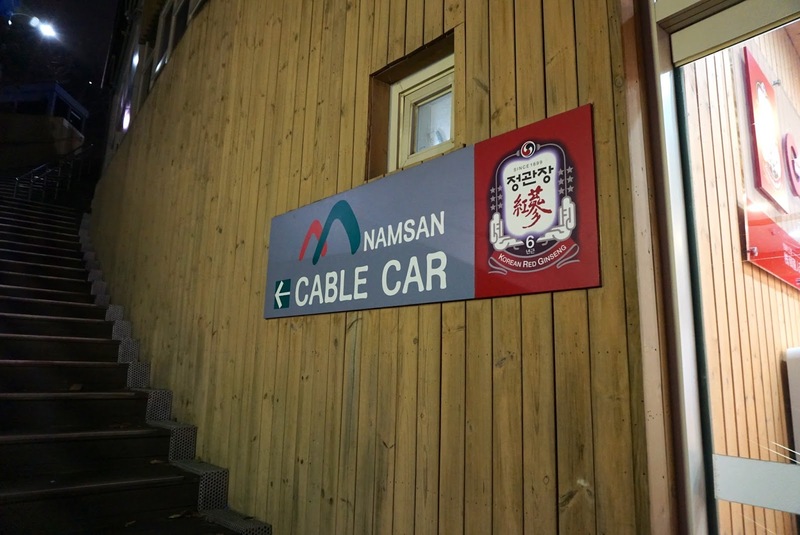 To facilitate this, there are grills near the cable car station in Namsan set up for people to do so. 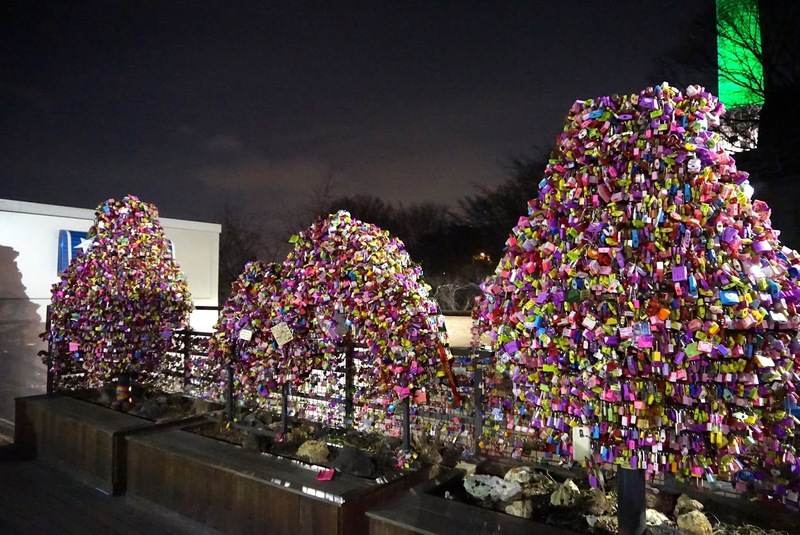 The amount of locks here is practically countless. There are more unused grills around. 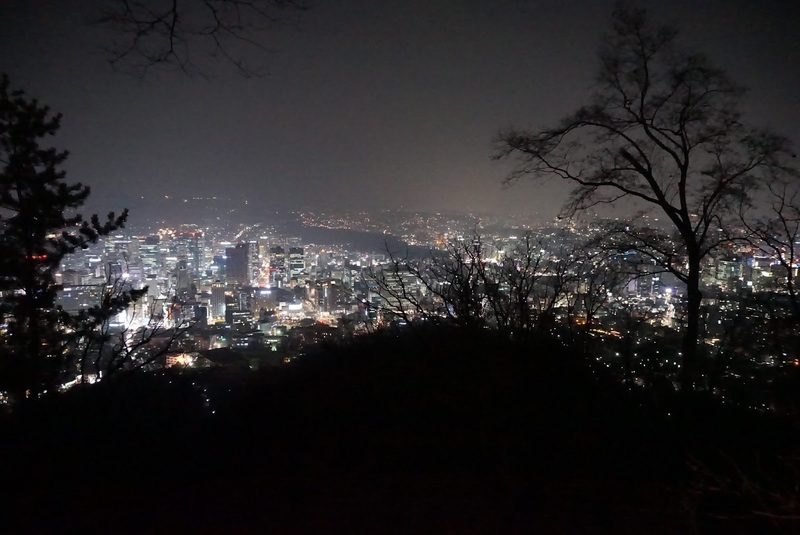 We headed to the view point near the padlocks to catch a glimpse of Seoul at night. 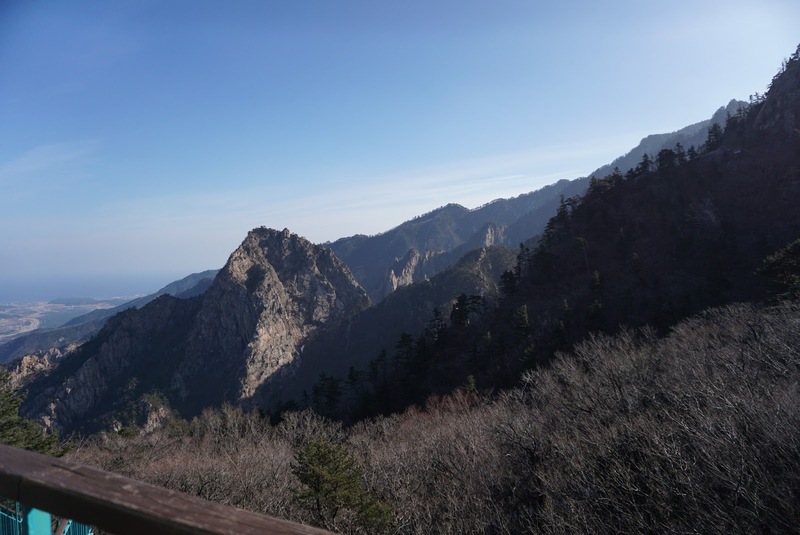 The view here is stunting, coupled with the cold winter wind blowing, and not too much of a crowd (only a handful of people were here at the time of our visit), the feeling is free and peaceful. 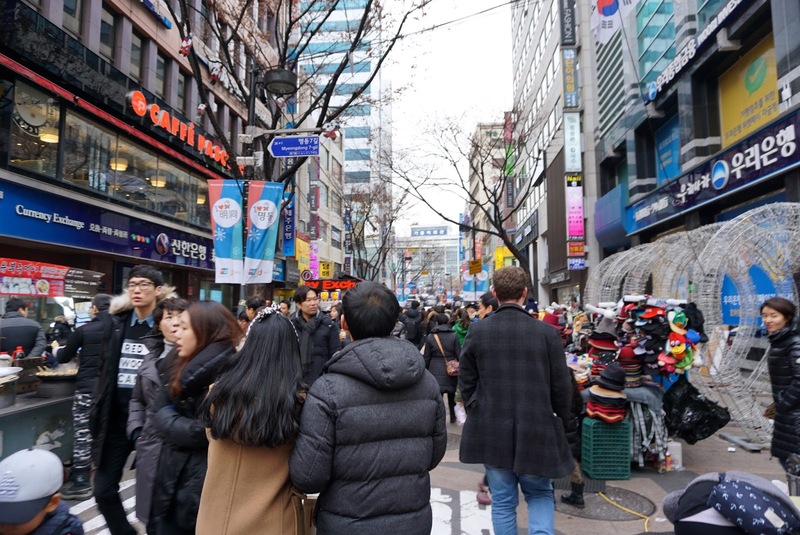 From the viewpoint, we could see the busy Myeongdong shopping area, with the shoppers and cars near Myeongdong shrunk to the size of an ant, the feeling is great! 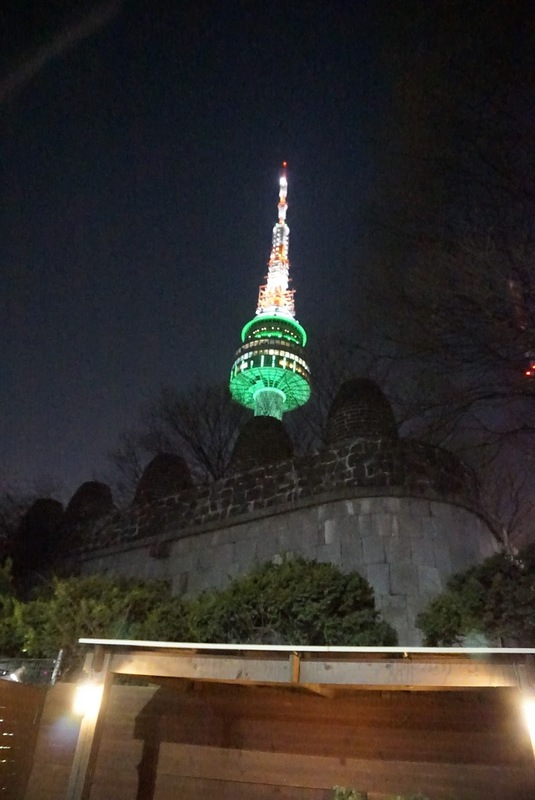 After we took some pictures of Seoul at night, we headed towards N Seoul Tower. 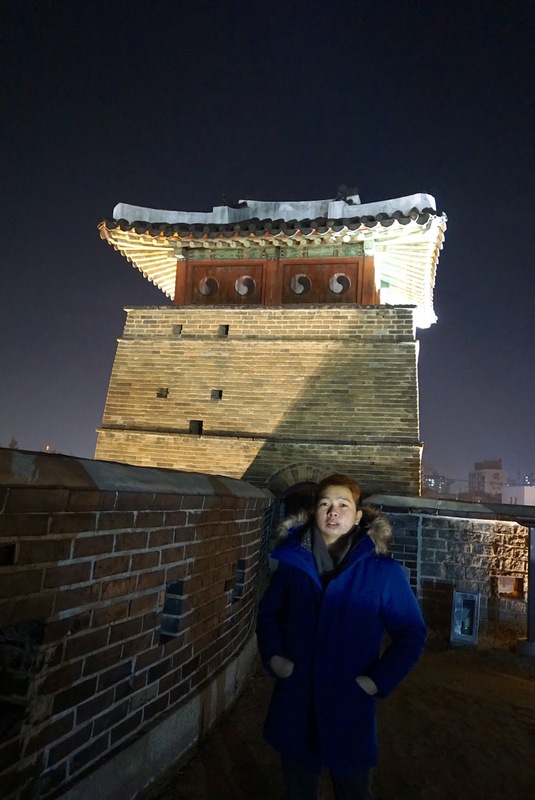 At the base of the tower, we found out that we would have to pay entrance to get up to the tower. As we were hungry, we opted to spend our time filling our stomachs instead. 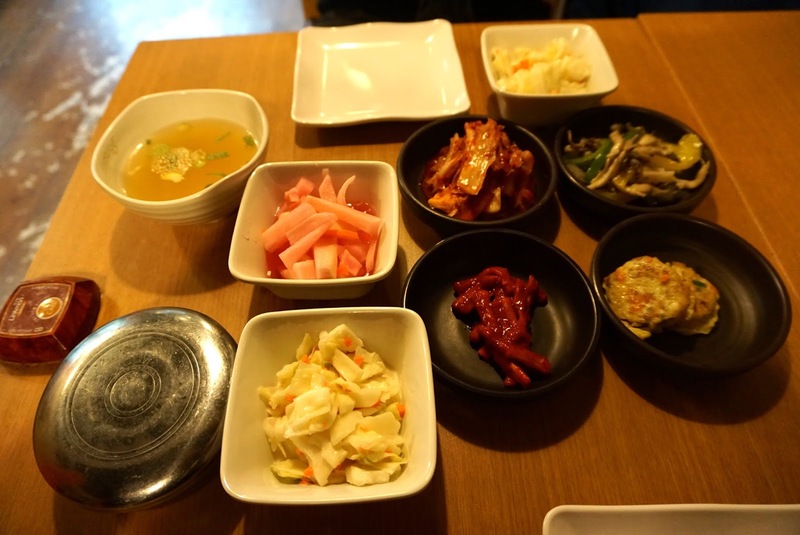 We headed to one Korean restaurant and got our stomachs filled. 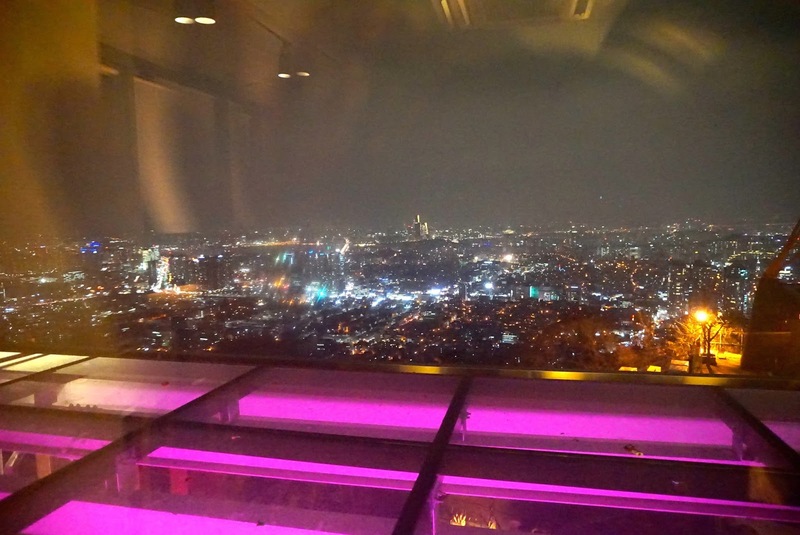 Though the food at the restaurant isn’t really fantastic, the view from our table is enough to compensate for the lack of taste in the food. 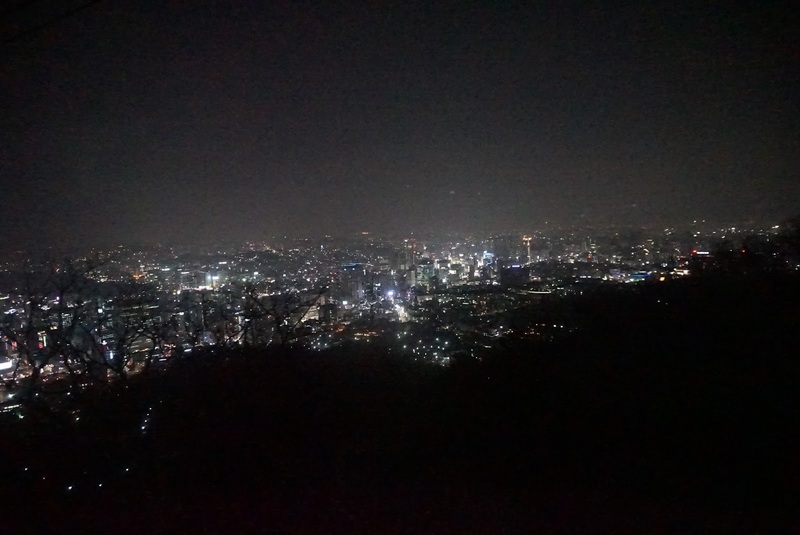 After dinner, we headed back to the view point again and took in the view of Seoul at night. 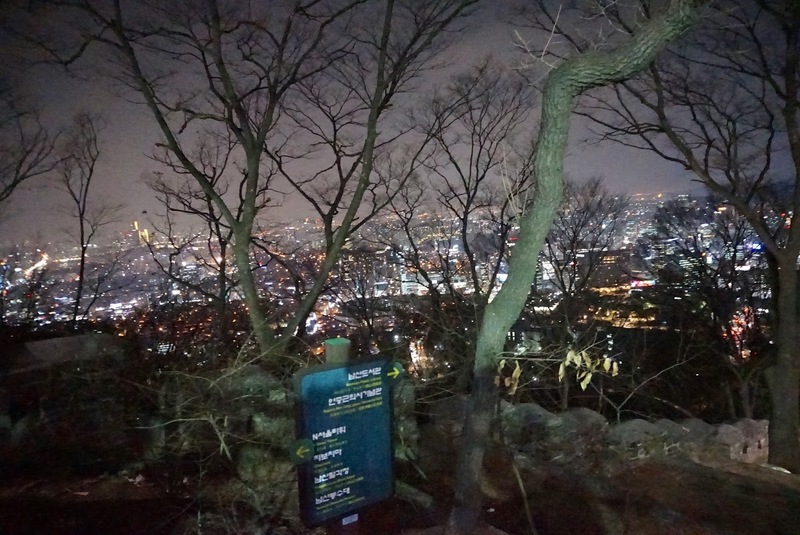 No wonder comments from people who have been here were recommending to visit this place at night. It gives one a different feeling, a feeling of peace and zen, rather than having to squeeze with the crowd we had the luxury of time and space. 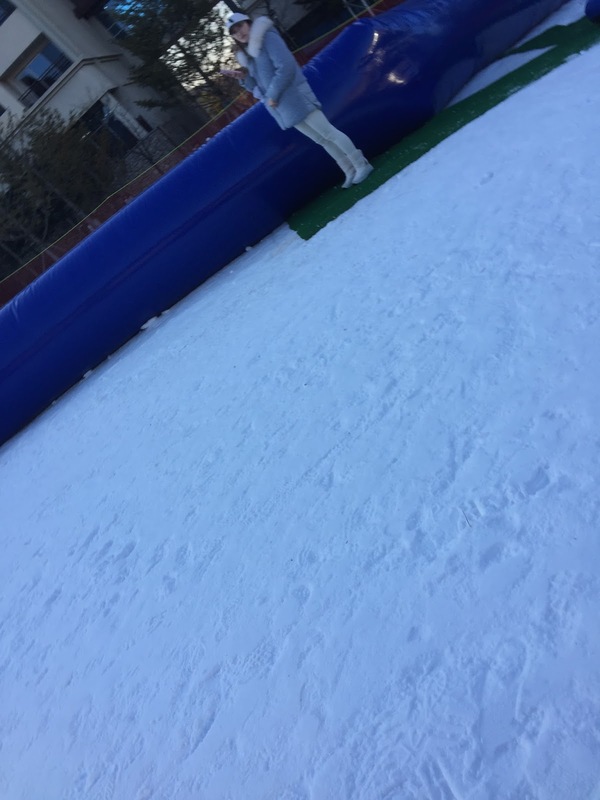 We also did not have to take pictures with people in them. 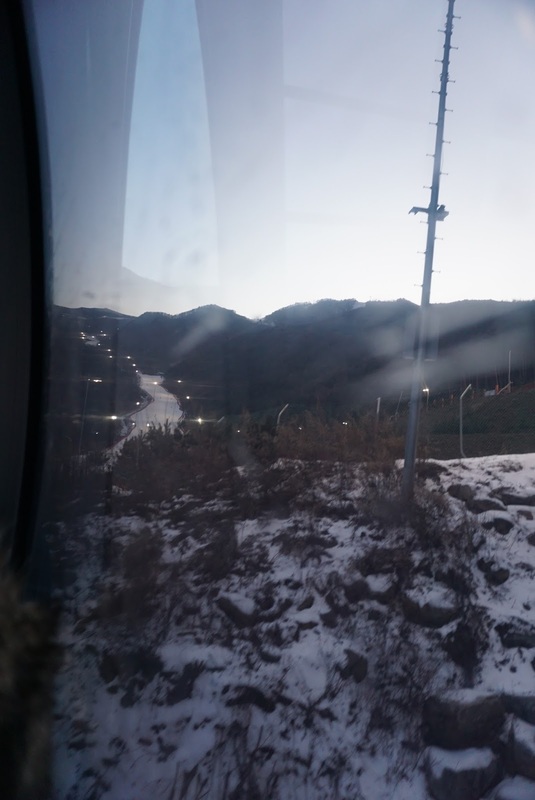 As the temperature seem to get colder by the minute, we headed towards the cable car station for our ride back to the base. Alighting from the cable car, we followed the crowd to what appears to be a single cabin tram up to the base of the cable car station. At this point, I turned to my friend and commented “I felt cheated”. 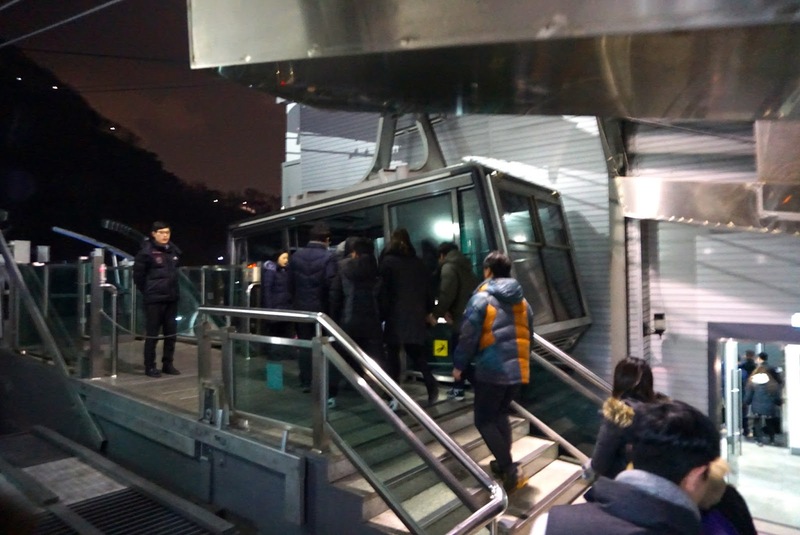 Now to walk up the cable car station from Myeongdong subway station requires one to walk up slope, with this tram system, it made getting tot he cable car station a breeze and effortless. 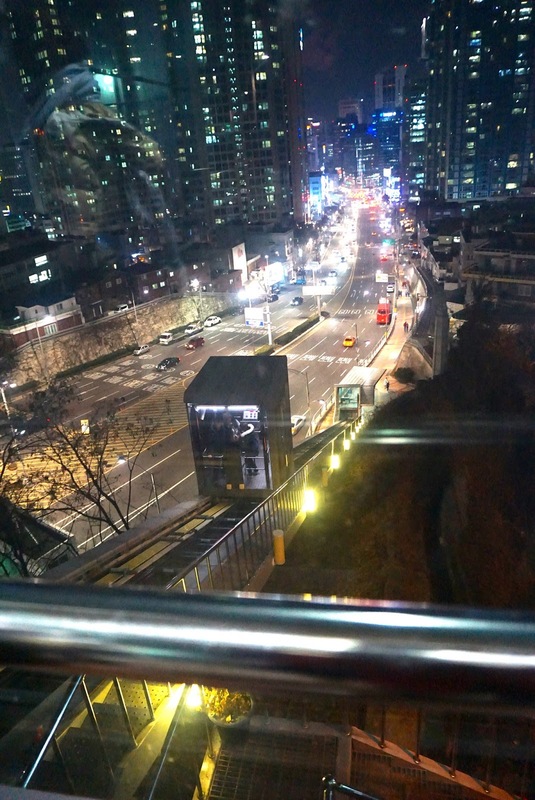 We headed to Myeongdong to walk around when we reached the base stop of the tram system. 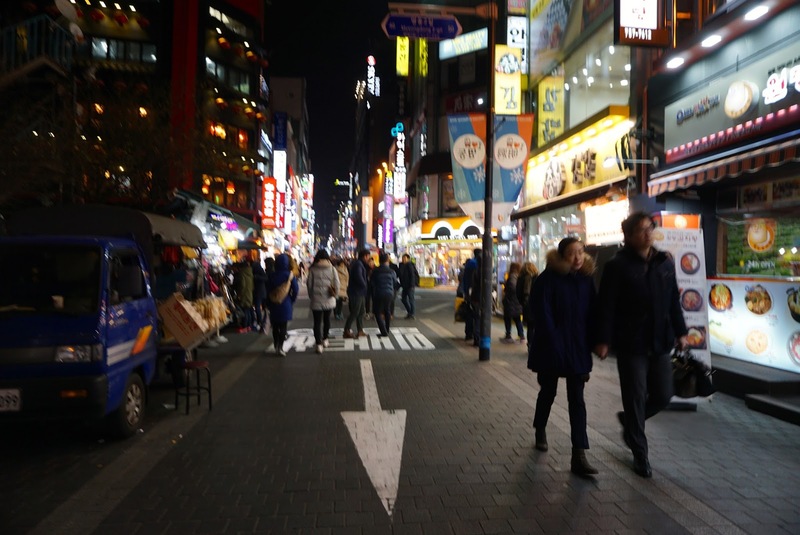 Myeongdong at this hour, despite close to 10pm, was still buzzing with life. 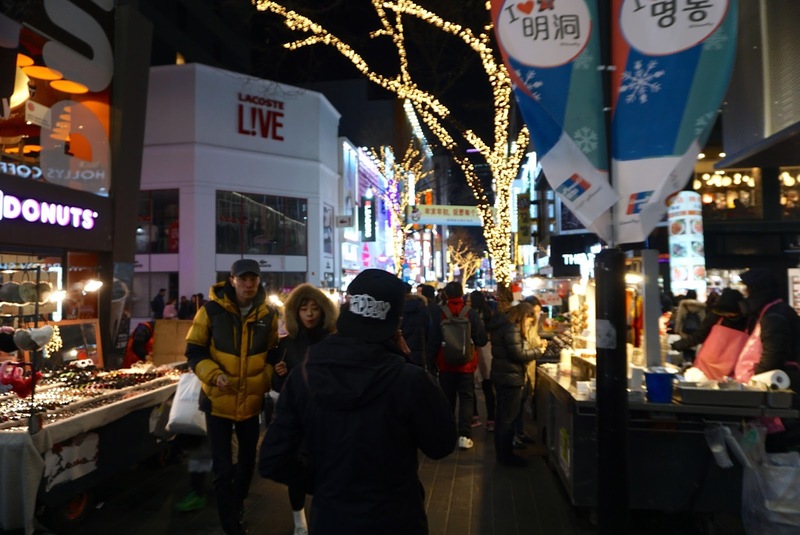 Thought most of the shops are closing, the street food vendors and pushcarts selling goods does not seem to abide by the 10pm close shop timing. 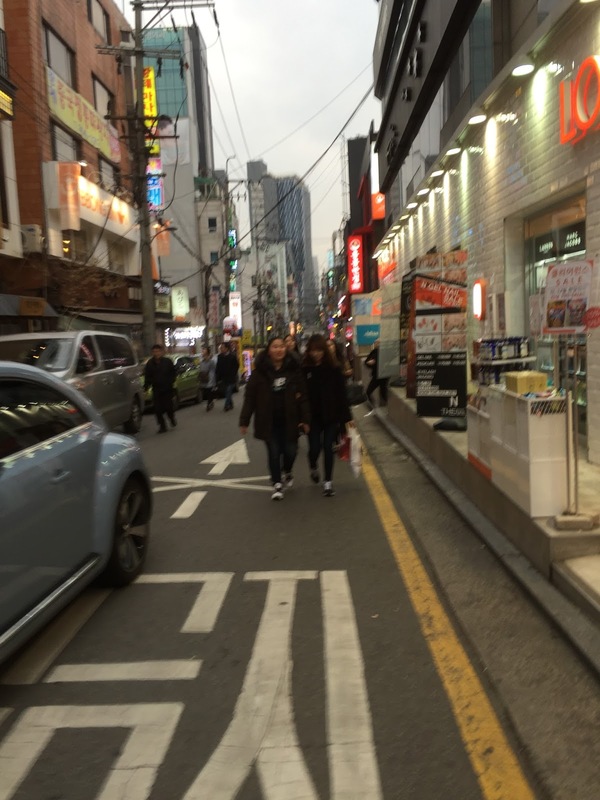 We did some final shopping and walked around, munching on street food as we walk along Myeongdong. 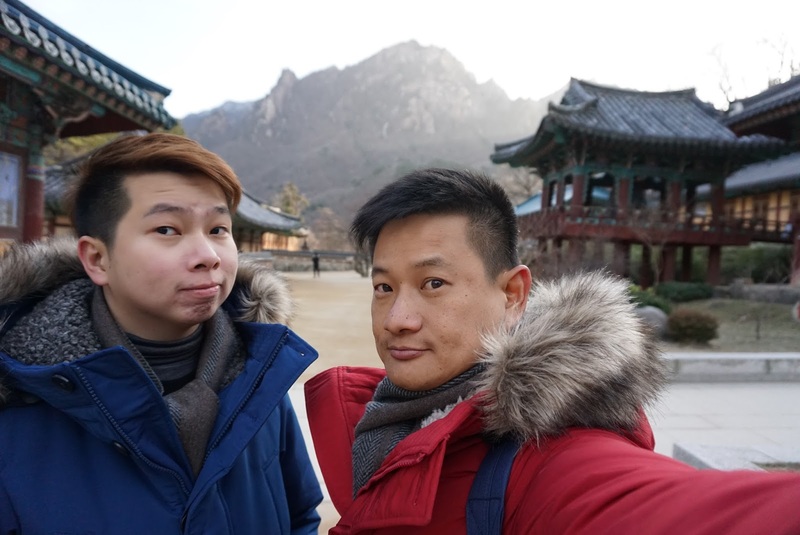 As we had to wake up early the next day to catch our flight out of Seoul, on top of that we have yet to pack our luggage for our trip home, we decided to call it a day and headed back to the hotel. 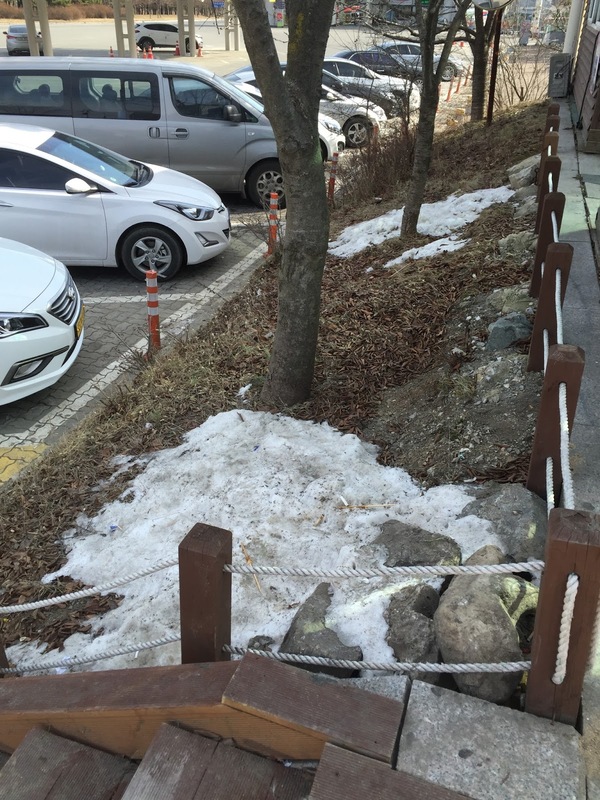 I would consider this day to be the climax of our Korean trip as today is the day we will be seeing natural snow for the first time. 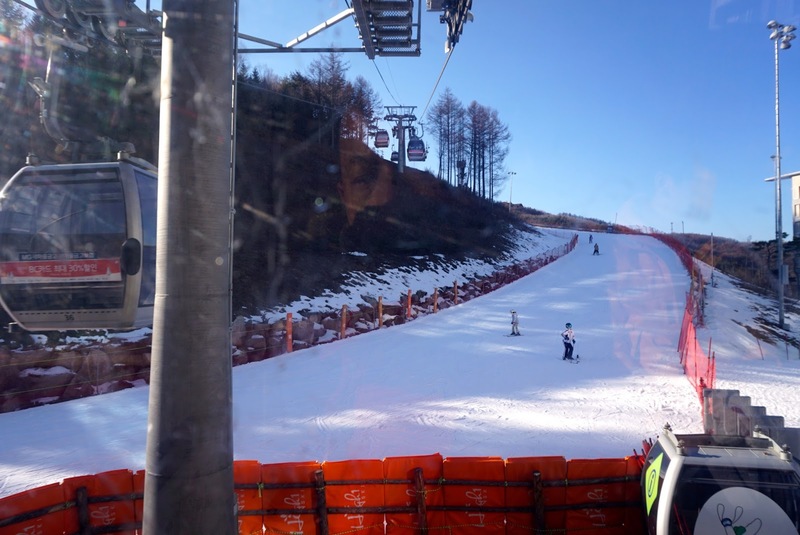 We planned to head out to the Ski Resort today, as with the day before, we planned to visit the ski resort on a weekday so that we will not be bumping into too large a crowd at the ski resort. 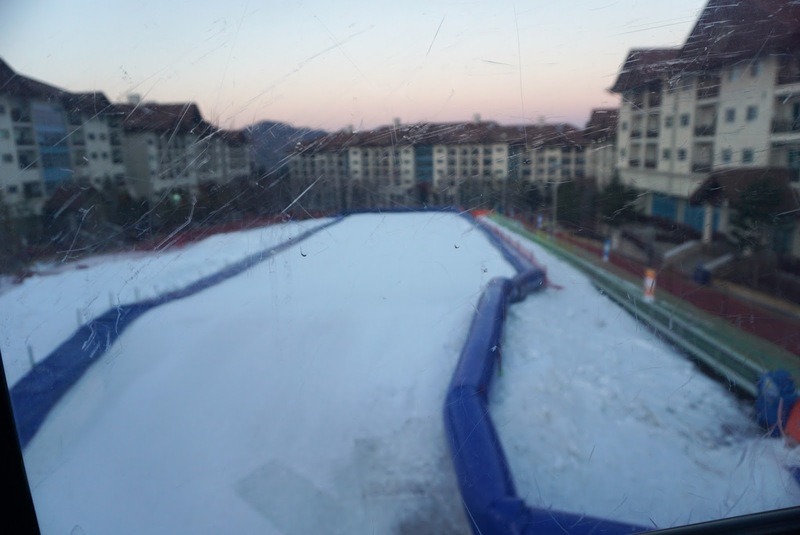 I was hoping to see snowing at the ski resort, after all it is the middle of winter and the past 4 days in Seoul we were rather disappointed that it did not snow at all. 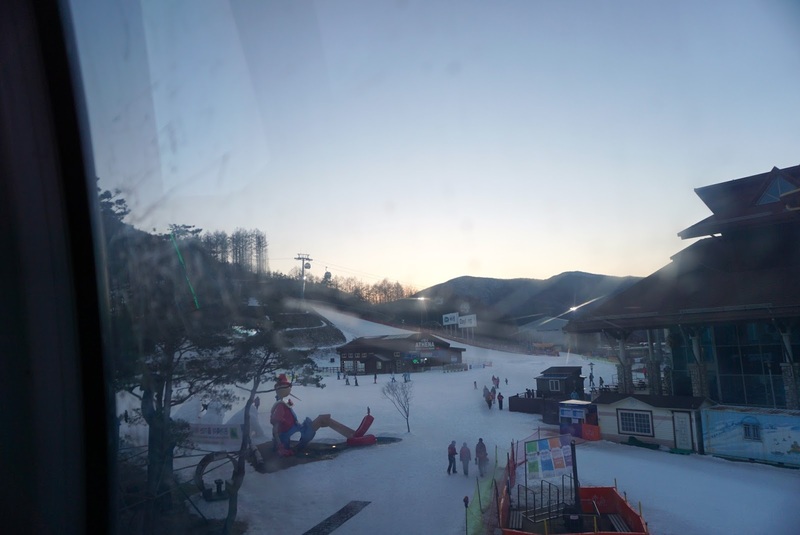 Talking about ski resort, there are a number of ski resorts in Korea. 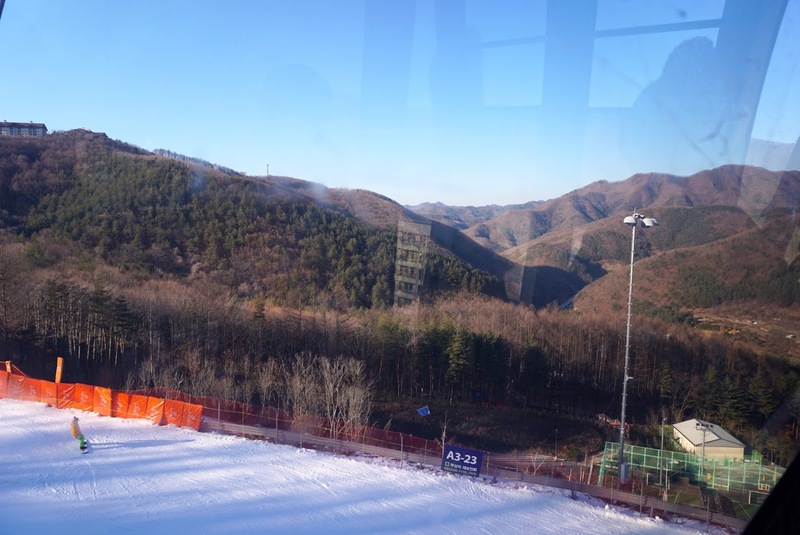 There are several ski resorts located nearby Seoul, whilst some others are further into other nearby provinces. 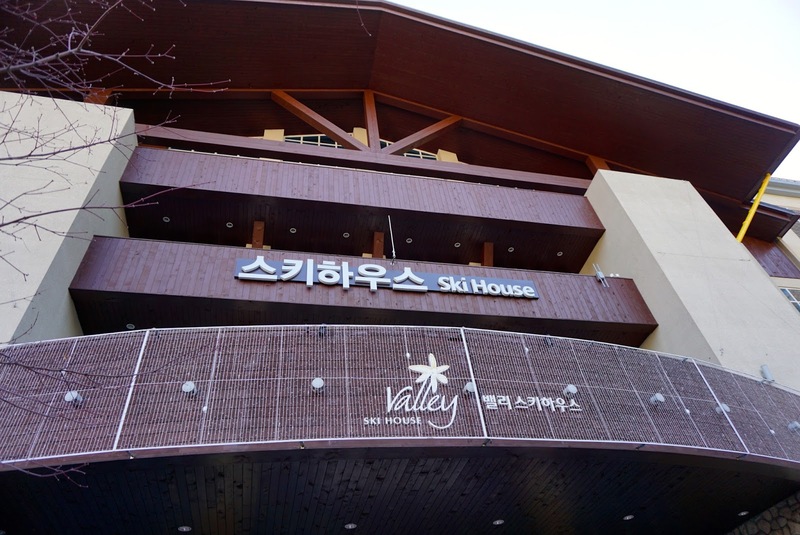 We chose to visit High1 Ski Resort partly due to the fact that this resort was designated to host the upcoming 2018 Winter Olympics to be held in Seoul. 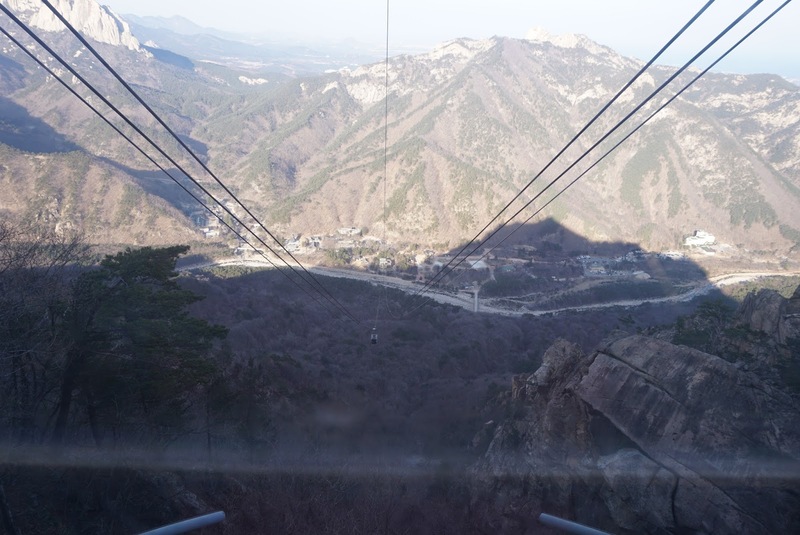 The other reason for our choice to visit here is the opportunity to ride the gondola up to the peak of the Baekwoon Mountain standing some 680m above sea level, where we thought we might catch some great views of the surrounding mountains. 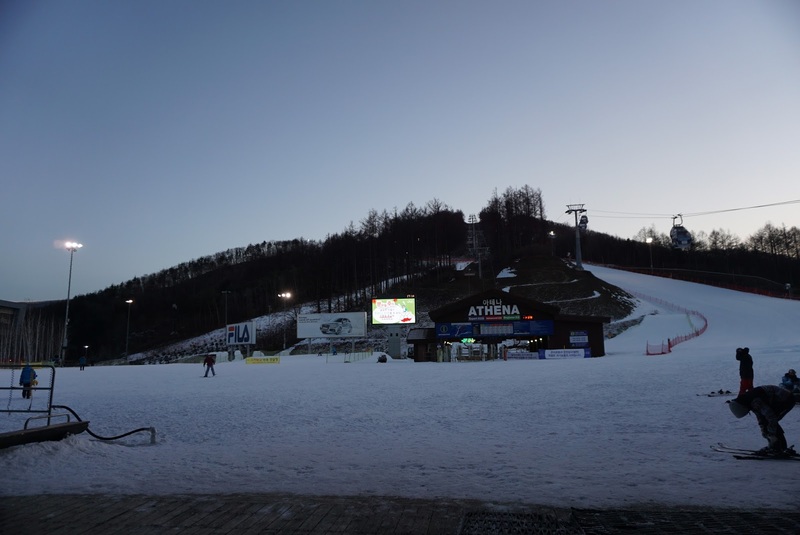 High1 Ski Resort is located in Jeongseon, Gangwon-do, about 170km Southeast of Seoul. 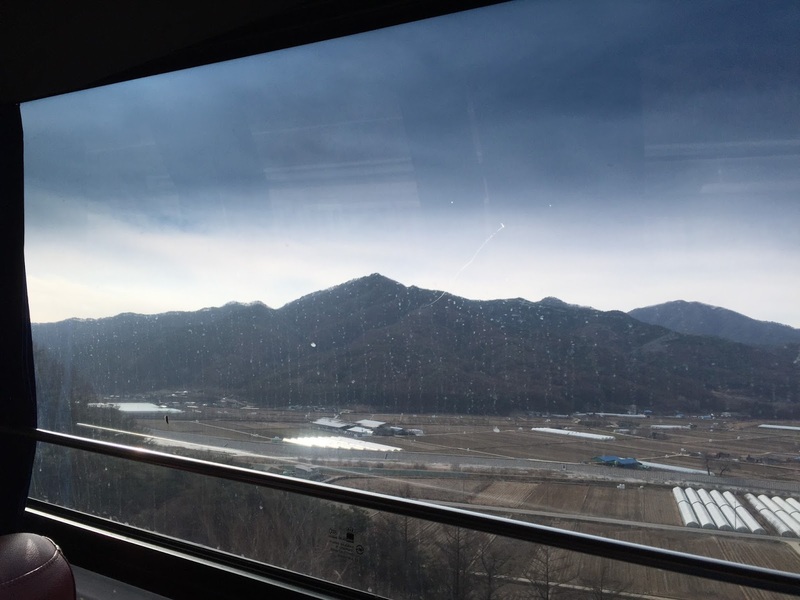 There are several options of getting to the resort, we opted to take the interstate train as I thought it would be an experience to ride on the Korean railway system. 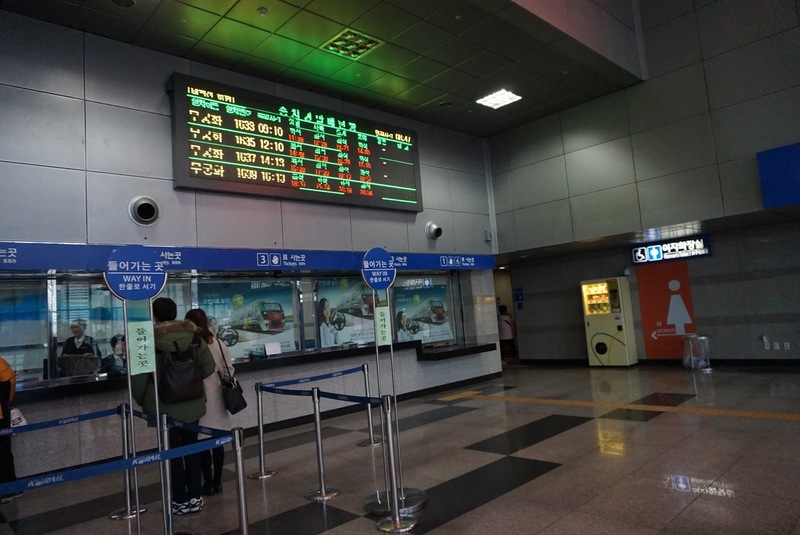 Getting the train tickets is a breeze with the ability to allow passengers to book their tickets 1 month in advance on the Korail website. 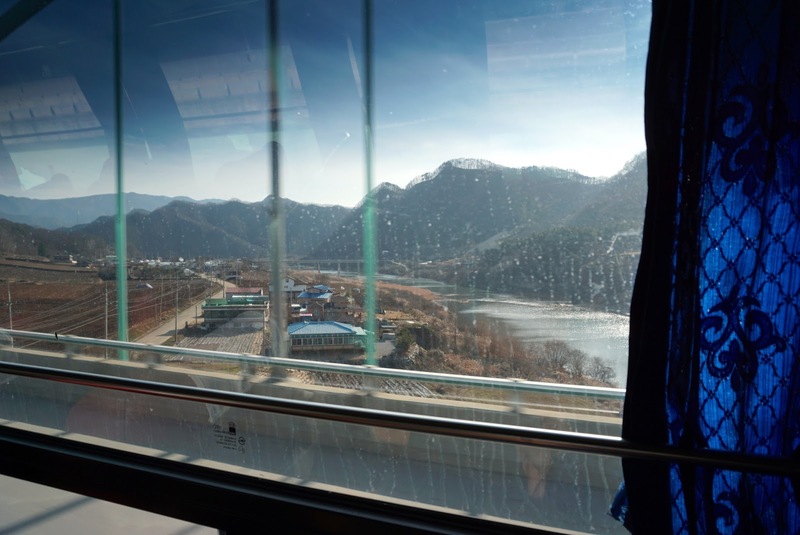 We booked our return tickets online from Seoul to Gohan which is the nearest train station to the resort, opting for the first class train travel (the price difference between first class and standard class is a mere ₩2,000 each way). 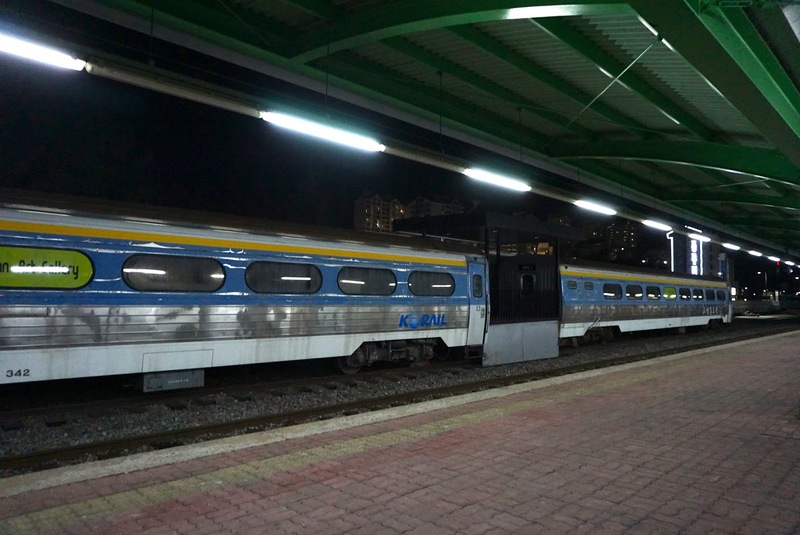 The train departs from Cheongnyangni Station (and not Seoul Station). 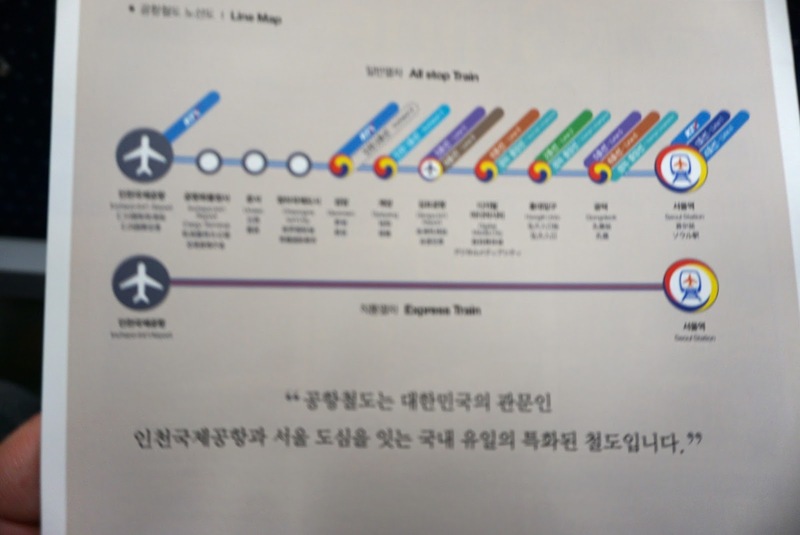 We took the subway to Cheongnyangni Station and got our tickets from the ticketing counter by showing the print out of our booking. 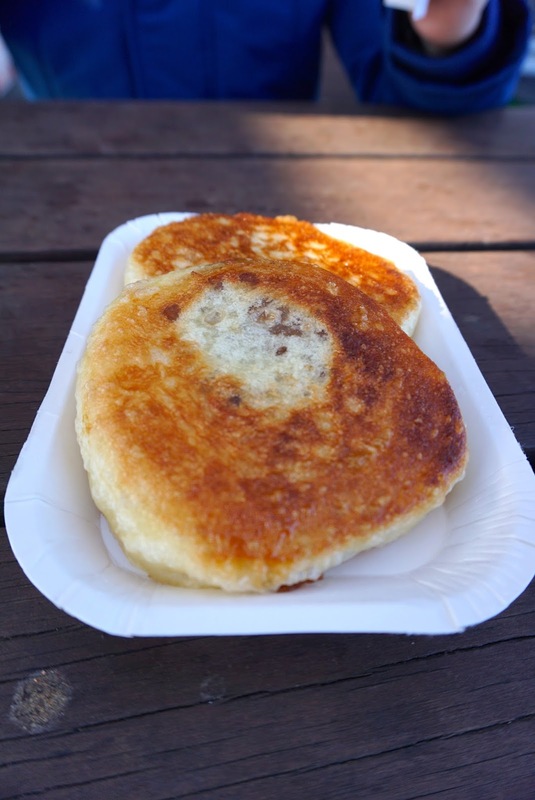 As we did not have breakfast after leaving the hotel for the train station, we thought since we still have around 15 mins before the train departs, we will have sufficient time to pack breakfast and have it on the train. This is just the beginning of what will go wrong will go wrong! 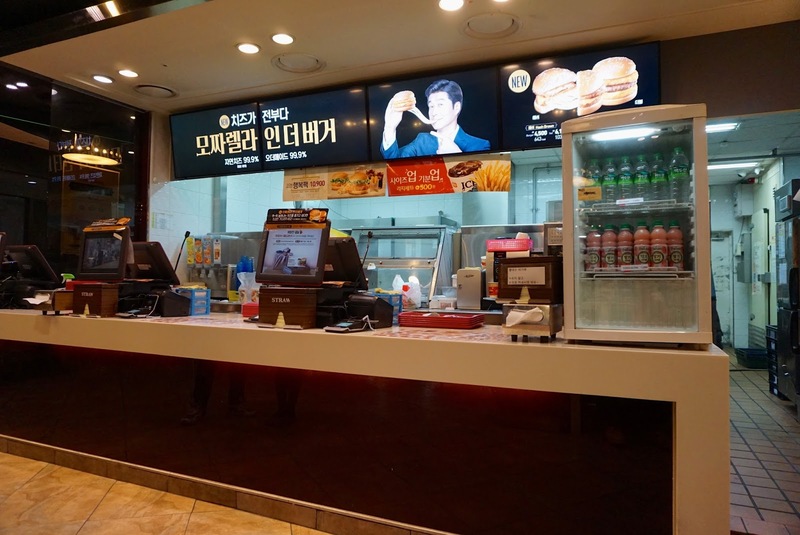 We headed for the local fast food joint (it is the only one that opens at 9am in the morning). 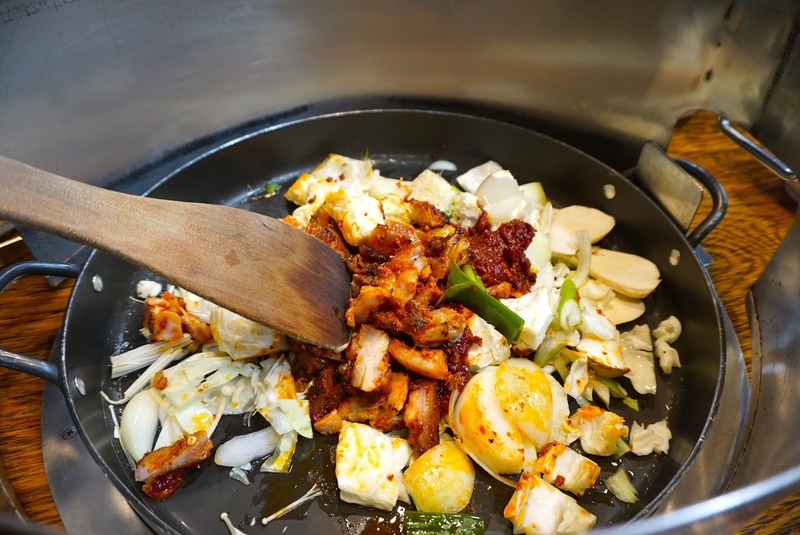 After ordering our takeaway, we were told that we would need to wait for around 5mins for our food to be ready. Since we have 15 mins to spare, 5 mins would be within our tolerant and we went ahead with the order. However it took them 10 mins to prepare our breakfast. 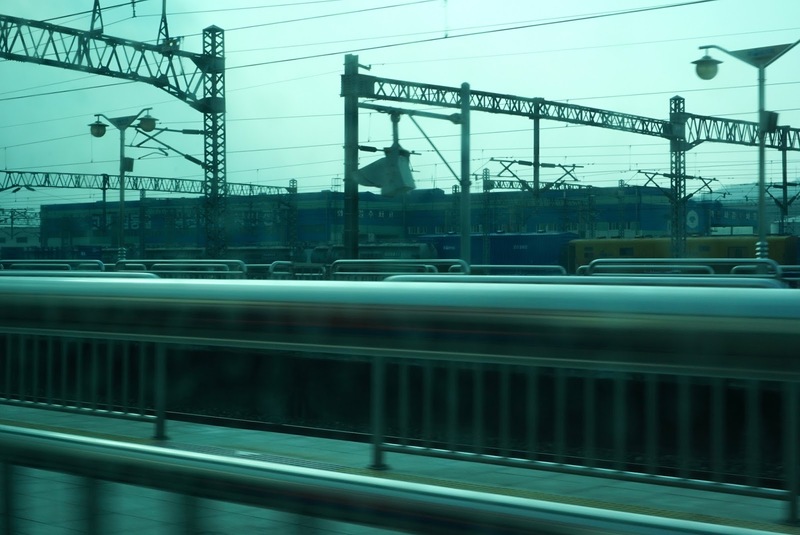 Seeing what little time we had left, we made a dash for the train platform. 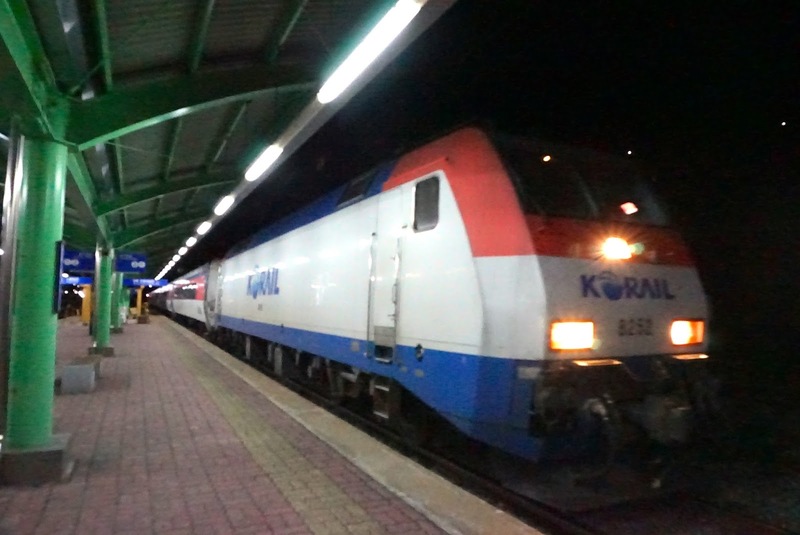 Without reading the sign properly, we headed towards what pointed out to be Korail platform. By the time we reach the platform, we sensed something is not right as it seem that the platform is meant for the subway. We asked a local and he kindly pointed the right platform for us. By the time we reached the platform, we were already 3 mins late and the train had departed. Our only option at this point is to go back to the ticketing counter and check the next train departure timing. 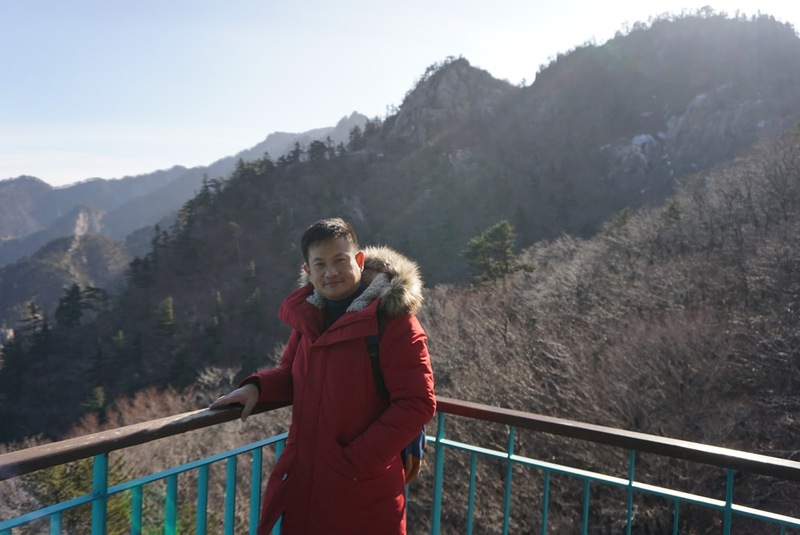 We were told by the staff that the next train would leave Cheongnyangni Station for Gohan Station at around noon time, which means we will only reach the resort at 3pm. 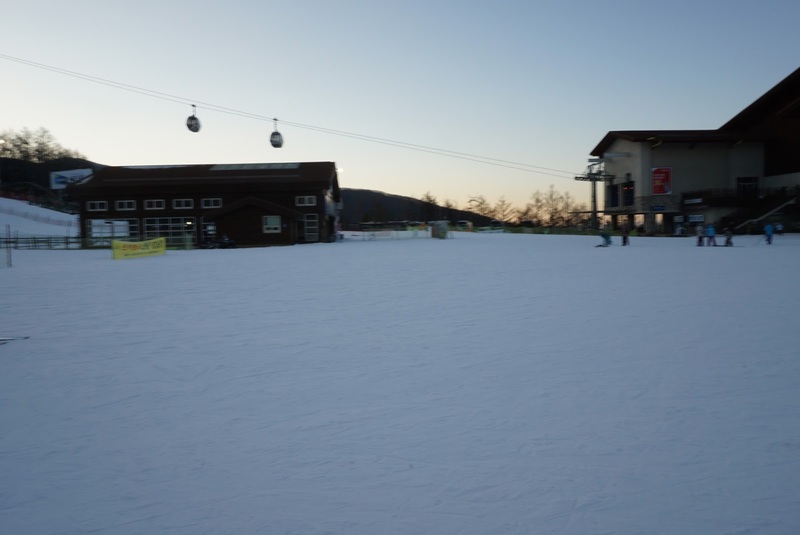 Our return ticket is booked for at around 5pm, which means we wouldn’t have much time to have fun in the snow. 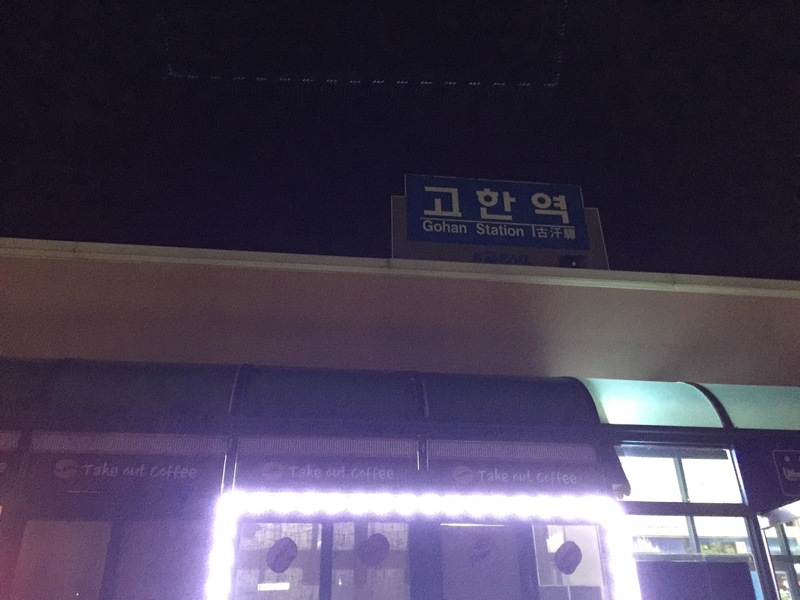 Waiting for the next train is not an option for us, hence I checked with the staff if there are any other ways to get to Gohan area. 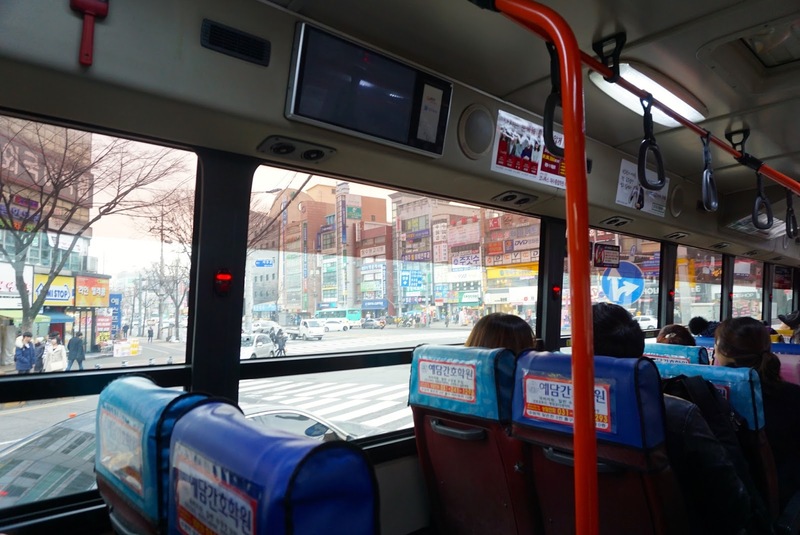 We were delighted to learnt that we could take a bus from DongSeoul Bus Terminal and it would take us around 2.5 hours to reach there. 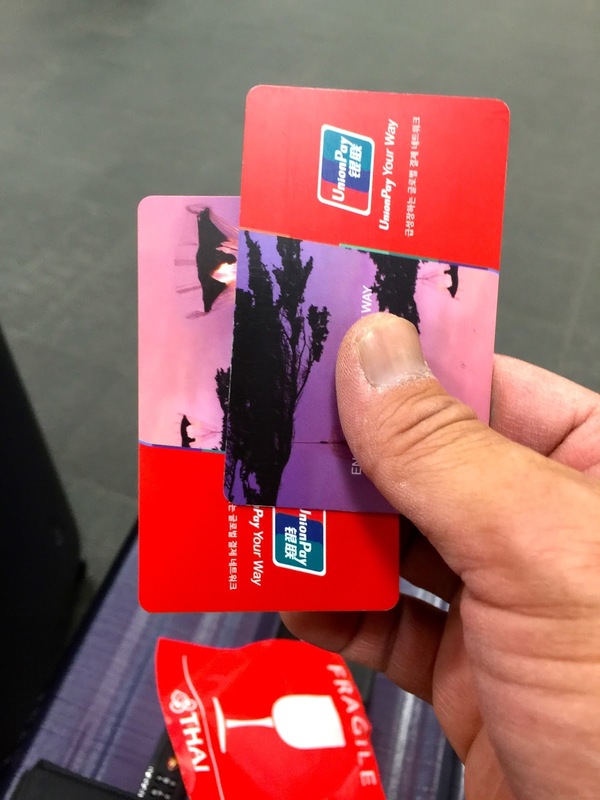 We were pleasantly surprised to learnt that the train company would refund our missed train fare (less some administrative charges). 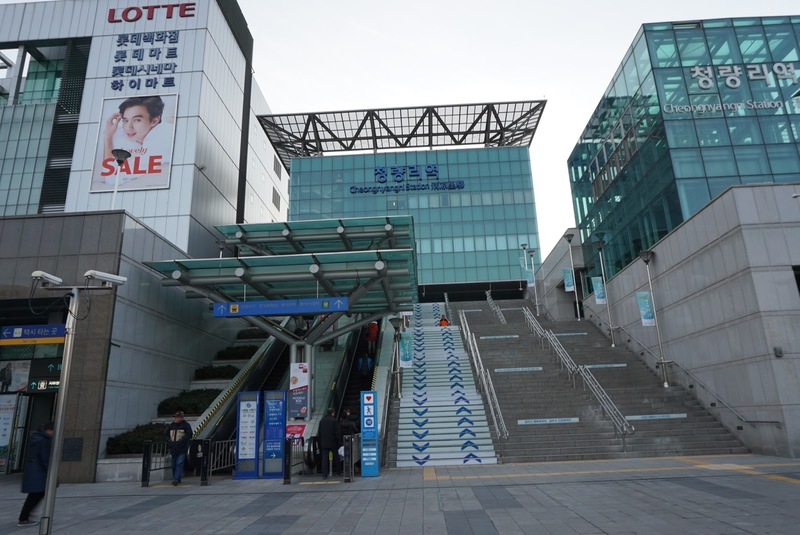 After getting our refund, we headed to the subway and made our way to DongSeoul Bus Terminal. 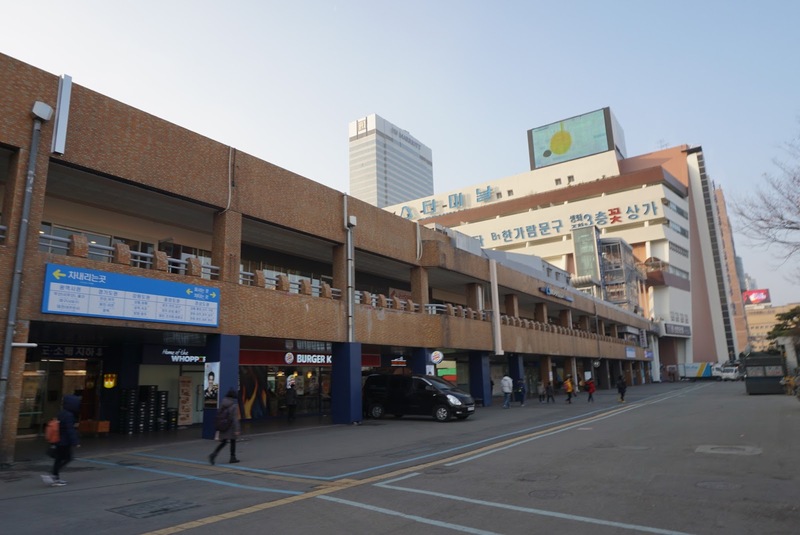 DongSeoul Bus Terminal is located next to Gangbyeong subway station, which is just a few stops from Cheongnyangni station. 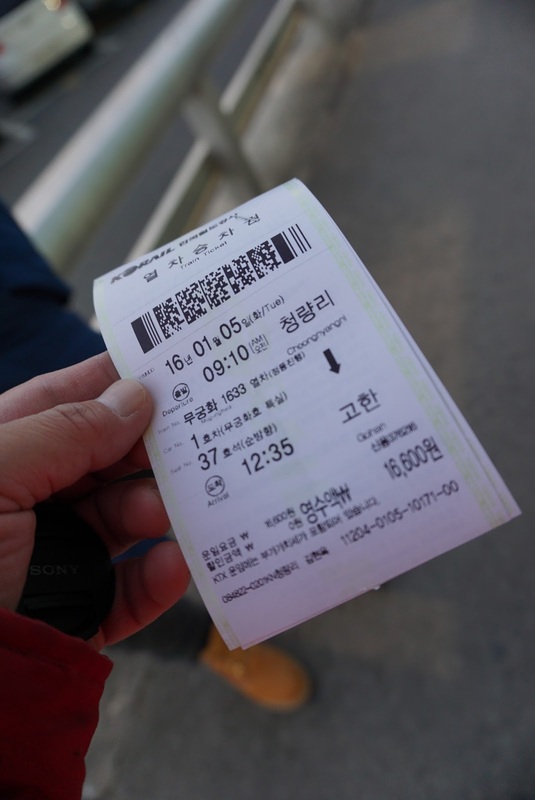 We arrived at the Bus terminal and quickly got our bus tickets to Gohan (costs us ₩14,500 each for the one way trip). Since there are some time to kill, we found a place and finished the breakfast we just bought awhile ago. 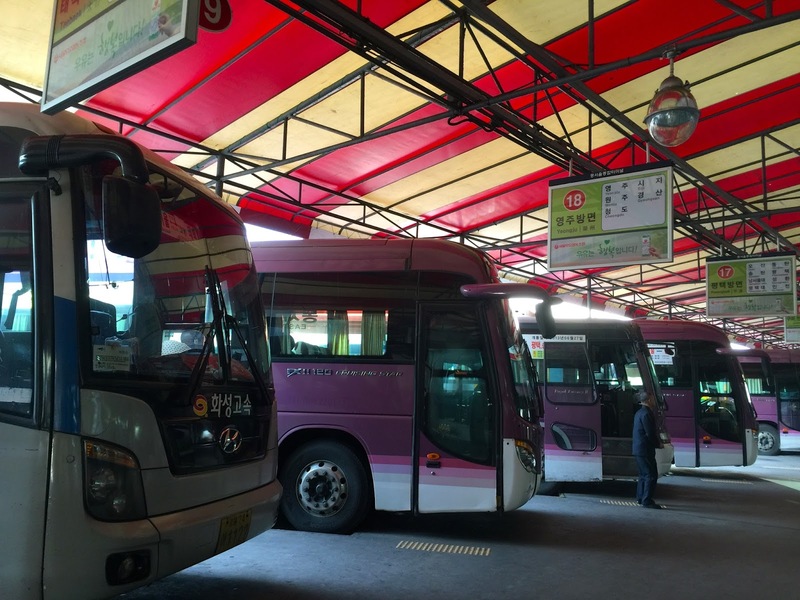 We arrived at the bus bay for our ride to Gohan 15 mins before the scheduled departure to prevent missing the bus. 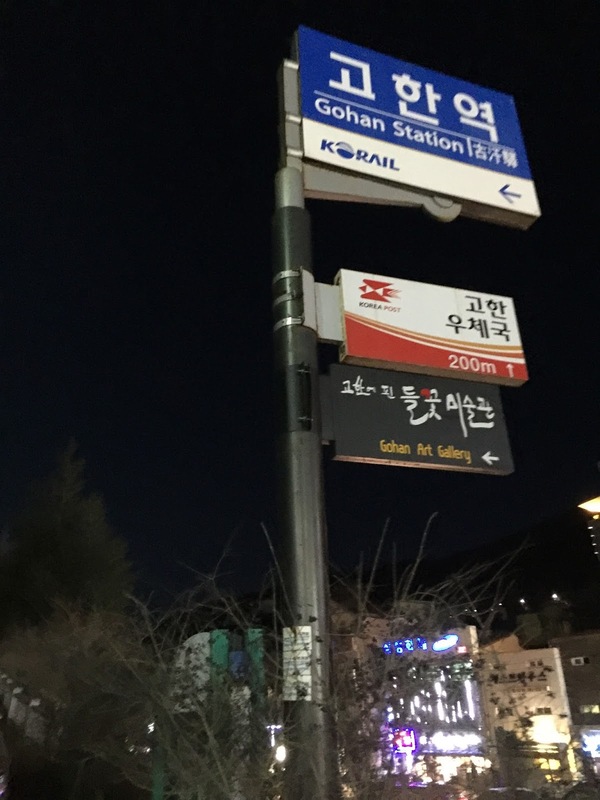 The bus departed on schedule to Gohan. 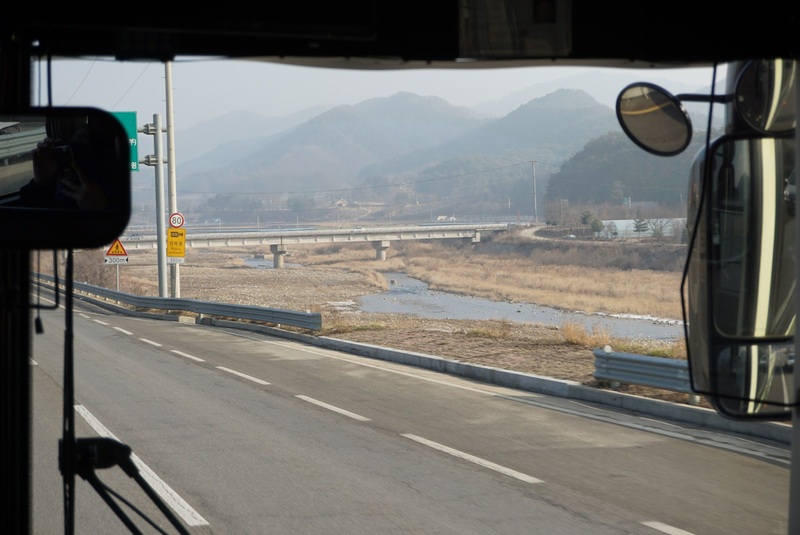 Around 1.5 hours into our ride, the bus pulled into an area for a pit stop, unlike the bus we took the previous day (operated by a different company), there were no announcement how long the pit stop will be. 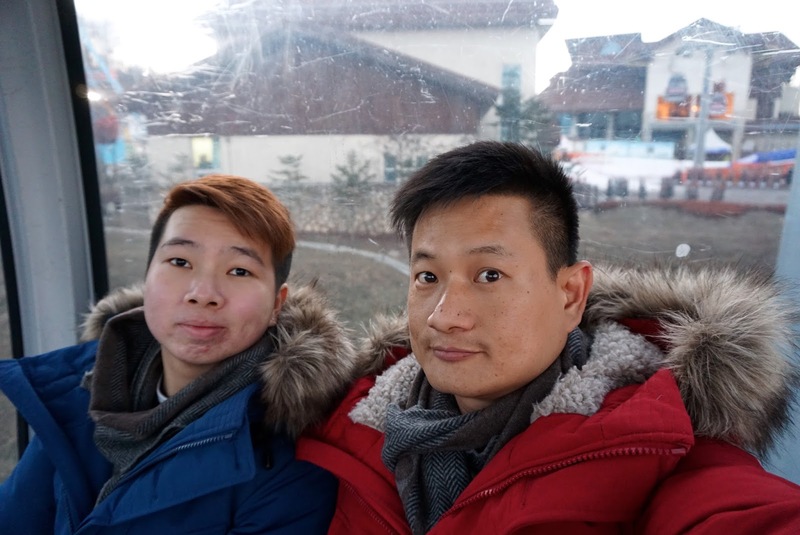 We got down the bus to buy some drinks and at the same pit stop we got ourselves some ear muffs. By the time we returned to where the bus parked, the bus was not there. At this time we realised that the bus had left without us! Wow twice within one morning things had turned south for us. 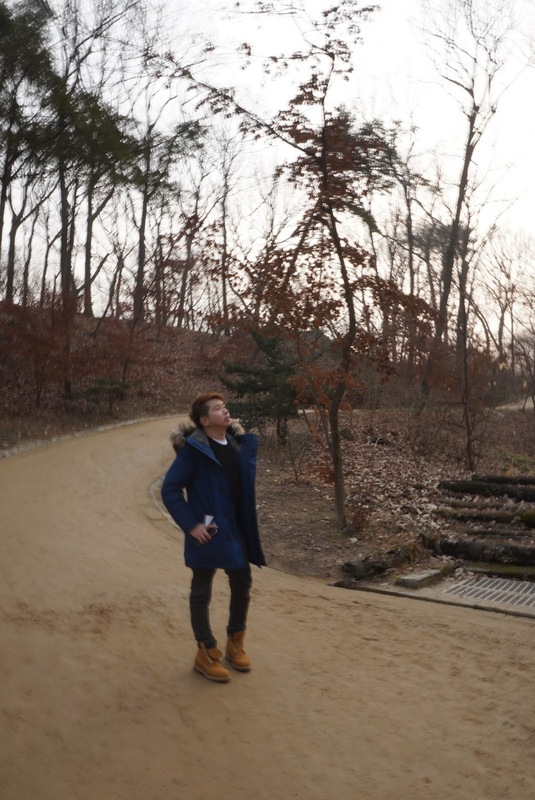 At this point we were thinking what to do, there isn’t really a bus stop and we are in the middle of nowhere. 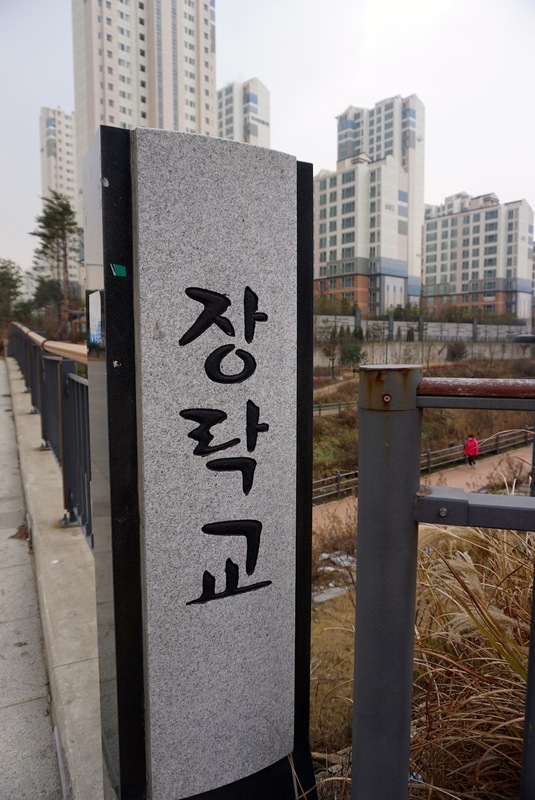 To make things worst, we do not even speak Korean to even hitch a ride from others. 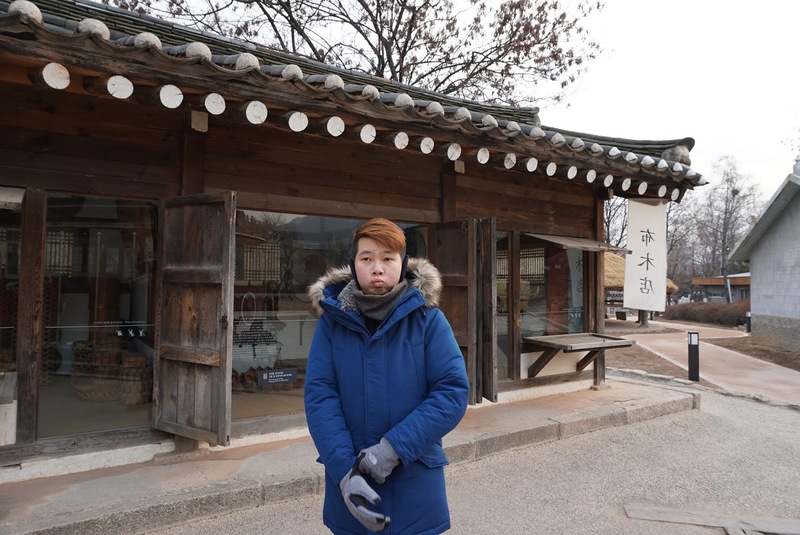 After some time, we approached a couple of Korean ladies and told them our bus had ditched us. They do not seem to understand what we are talking about, but some how know we were lost! The ladies pointed us to an information booth, where we seek help. 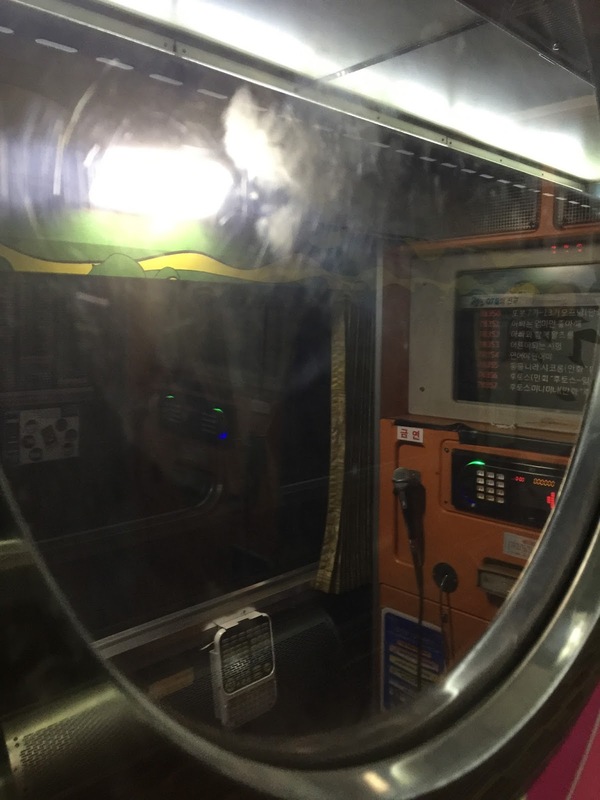 At the booth, we explained to the staff our situation and showed her our bus ticket. With her limited knowledge of English, we surfed the web to get the number of the bus company. The staff managed to call the bus company, luckily the guy at the other end spoke good English and told us they will arrange for another bus to come and fetch us in 30 to 45 mins time. We waited patiently and dare not move from the booth. Peeking out of the windows occasionally to see if the bus has arrived. Around 1 hour later, 2 buses called into the pit stop and both drivers came up to the booth to fetch us. Soon we found ourselves on our way to Gohan. Another 1 hour has passed and the bus called into a bus terminal. 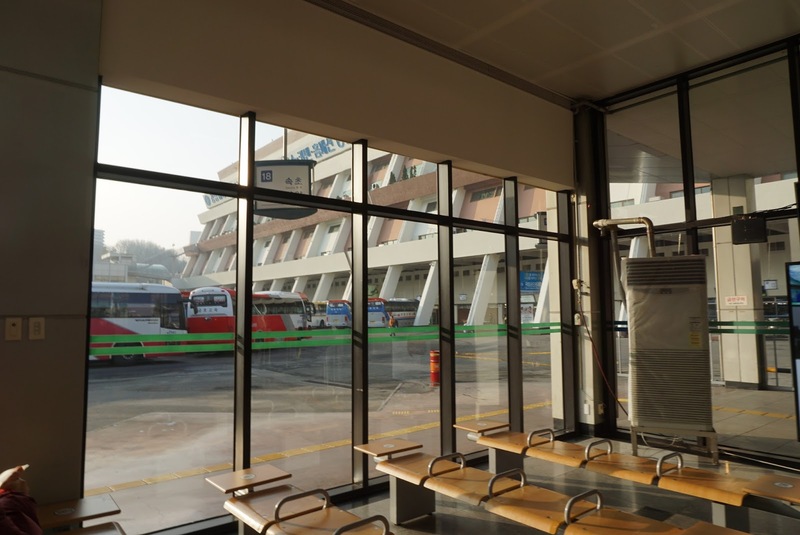 From our Google map (which I kept it on ever since our first bus ditched us), I know we were suppose to alight at this bus terminal. To play safe, we asked a fellow passenger whom confirmed we were at Gohan. 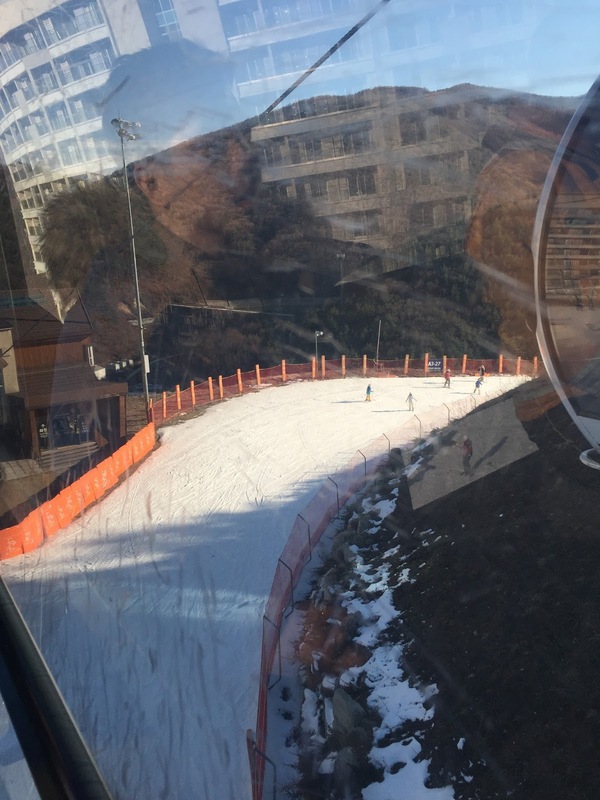 From here we took a 5 min cab ride to reach High1 Ski Resort. What an eventful day! As there are multiple alighting points at the resort, we told the cabby to drop us at the Valley Condominium. On our way to the resort from the bus terminal, we were expecting the scenery to change from greenery to pure white, however no such luck. 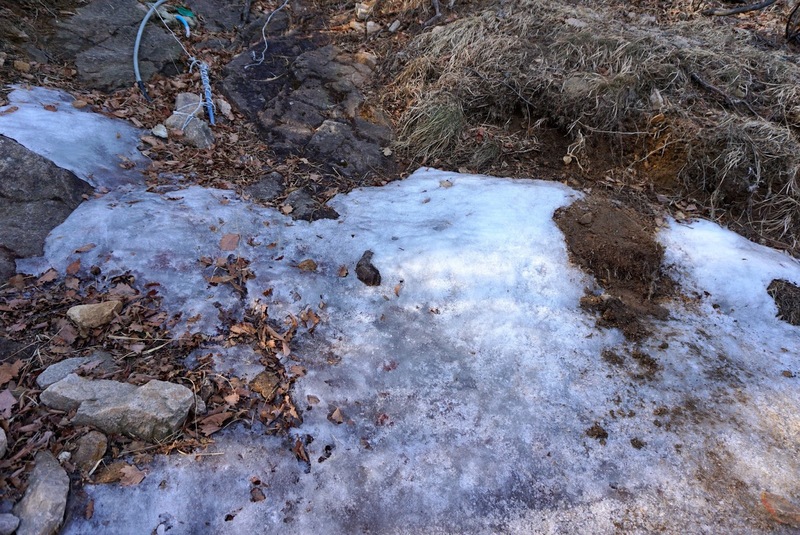 At the point of our alighting, we still did not sight any snow. 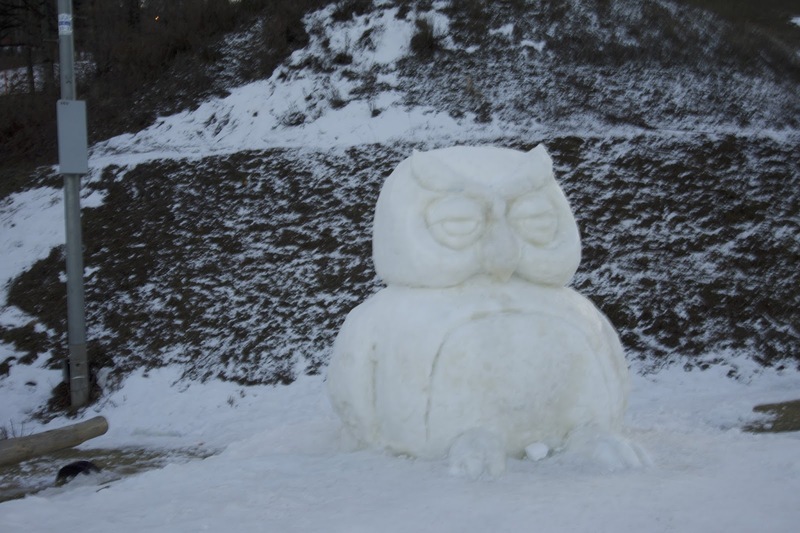 I was a little disappointed that it was not snowing. 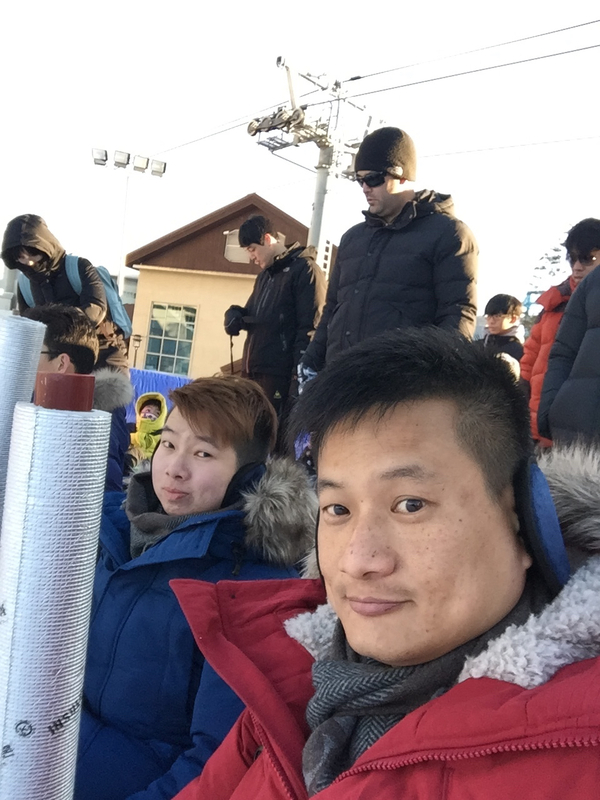 At the Valley Condominium area, there is an information counter where we enquired more about where to sledge. 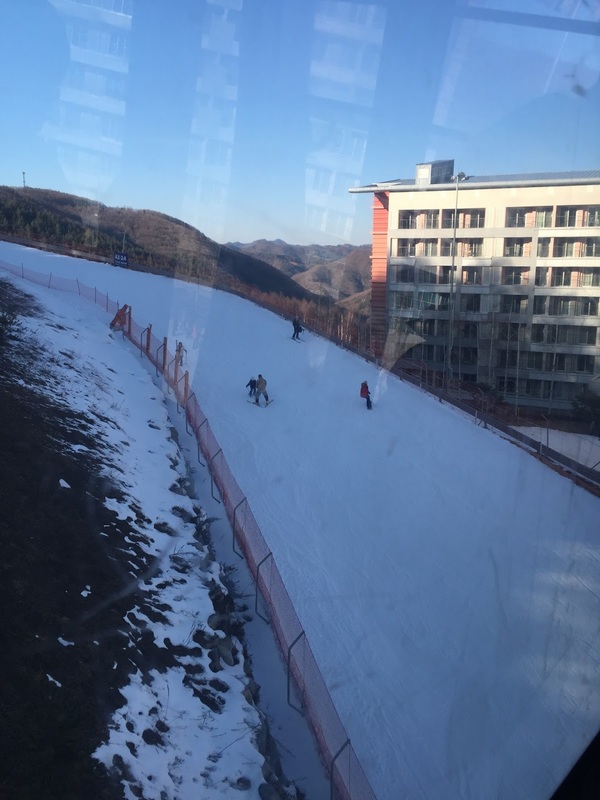 Since we only planned for a day trip, we did not have much time to learn to ski, plus the little adventure of missing the train and bus ditching us, took up a fair bit of time. 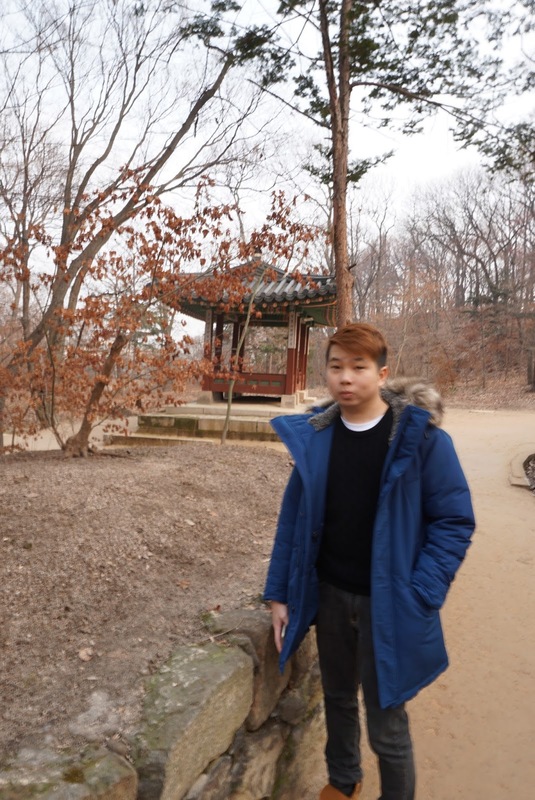 After we got the information from the counter, we headed outdoors. This is the first time we see snow! 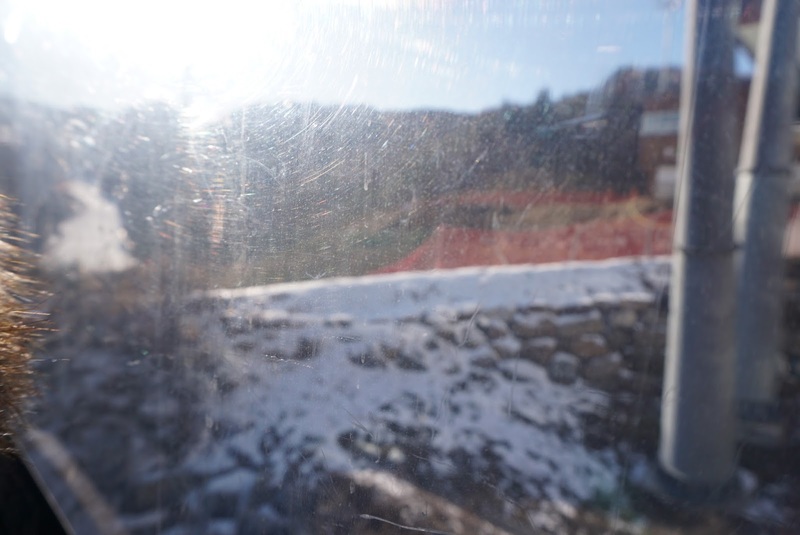 We soon went back in and took a complementary gondola to Mountain Condominium. 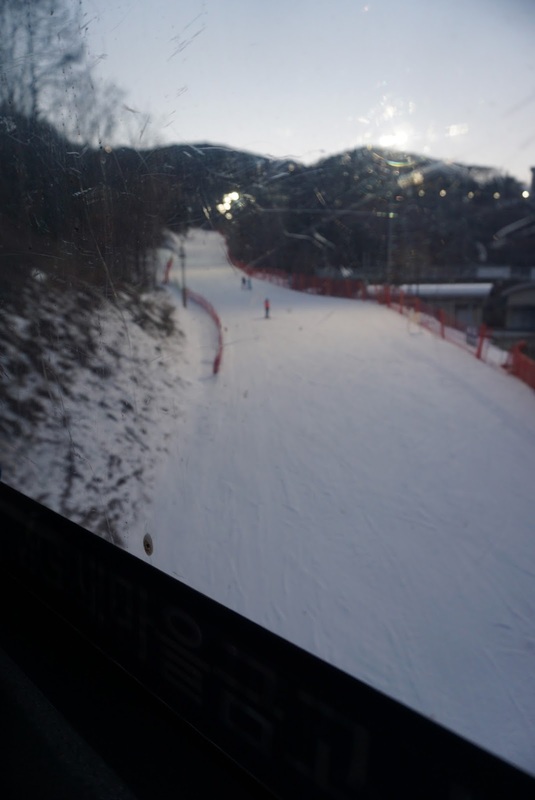 The ride up the Mountain Condominium took around 10 mins. 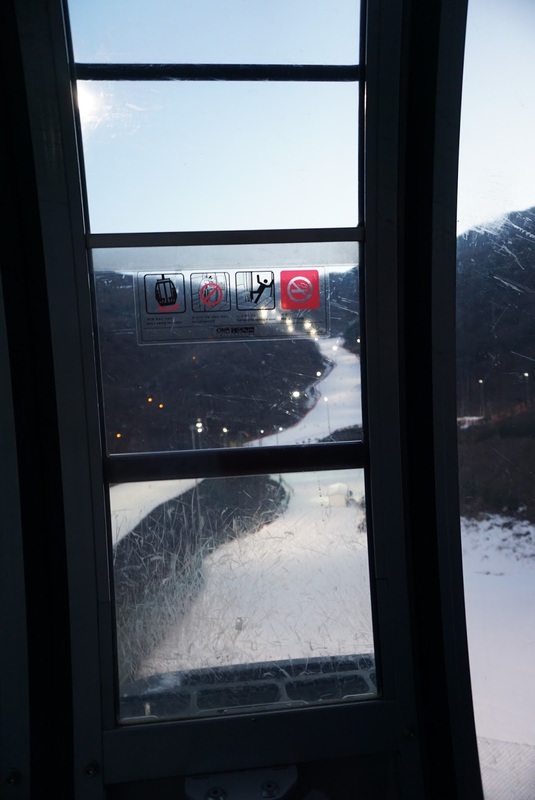 The 10 mins gondola ride we saw ski slopes and snow! 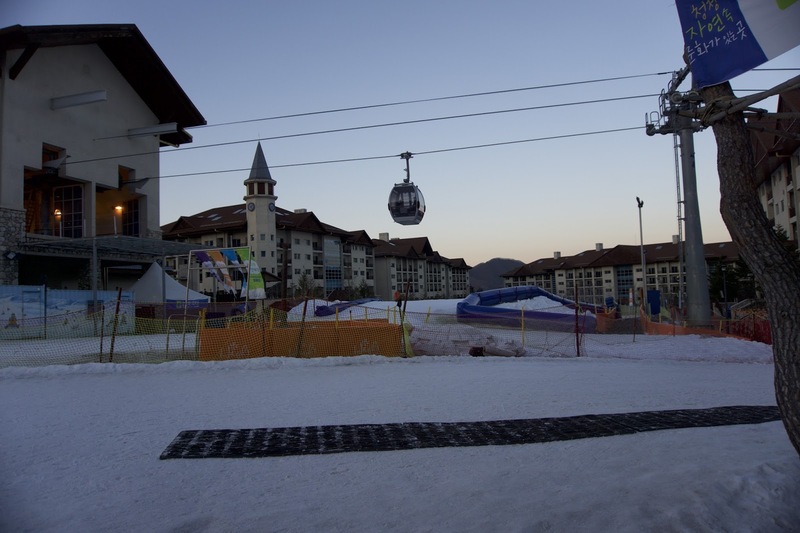 Although we knew these are artificial snow, we can’t help but feel excited about playing in the snow. Arriving at Mountain Condominium stop, we got off the gondola and headed to a cafeteria for lunch. 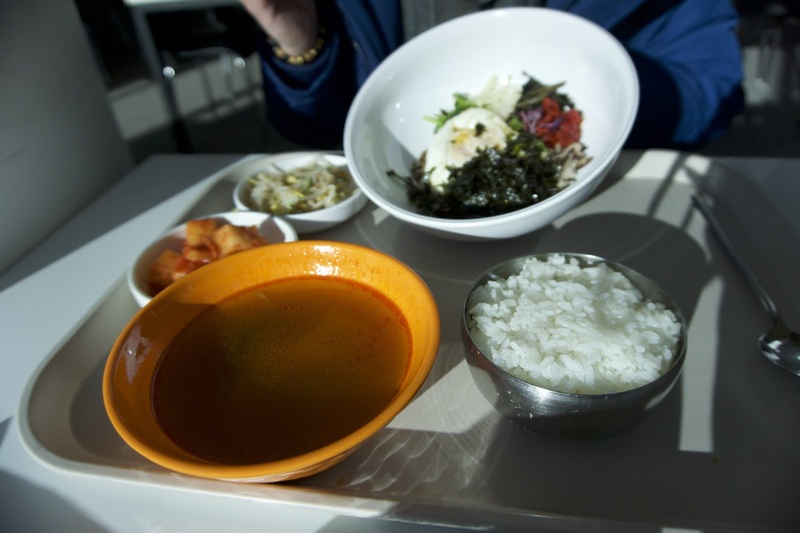 The cafeteria serves very simple and limited food. 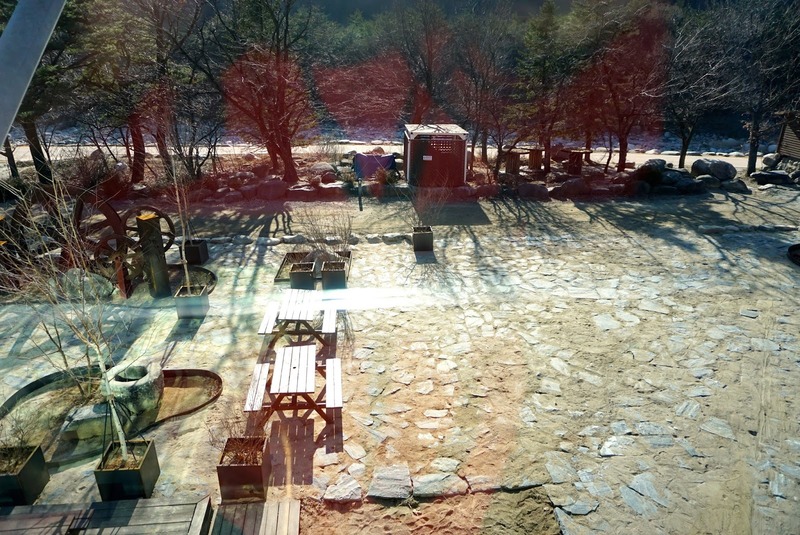 We opted for the Korean food and had our lunch facing the snow scenery outside the building. 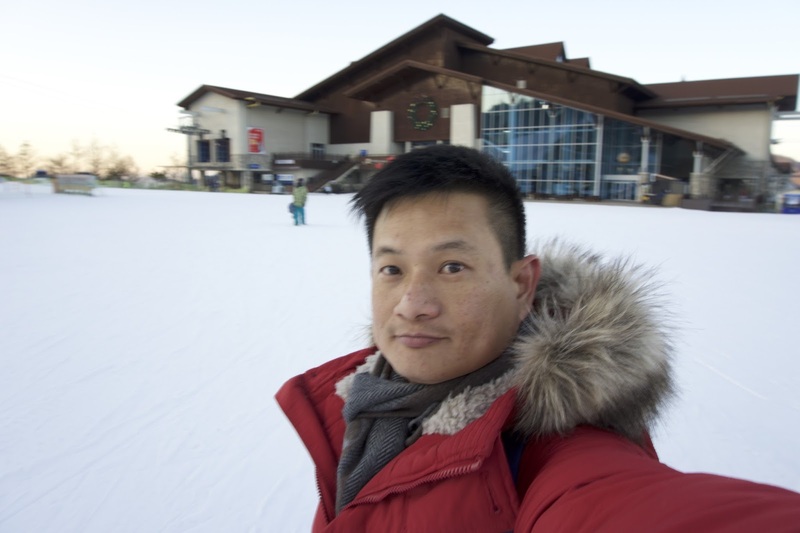 After lunch we headed outside to walk around the snow (yes we know this is artificial snow, coming from the tropics, the snow still excites us). 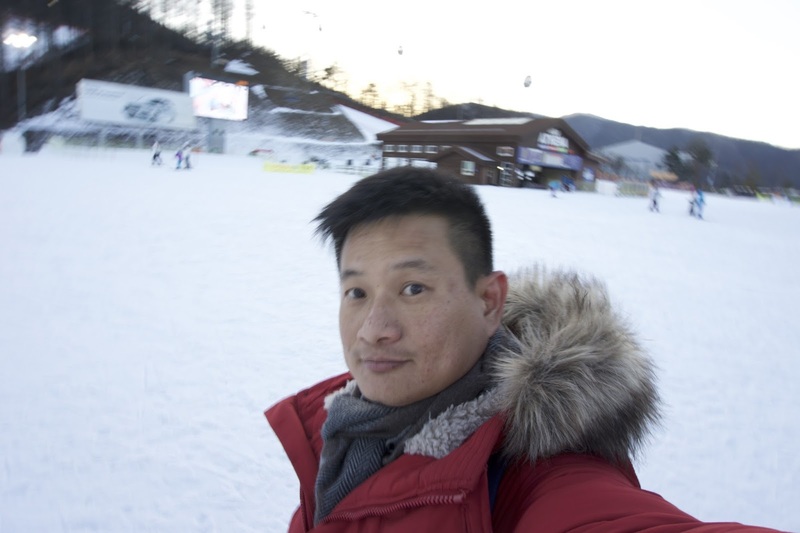 Speaking about the snow, it isn’t as soft and fluffy as we had expected and felt hard and slippery. 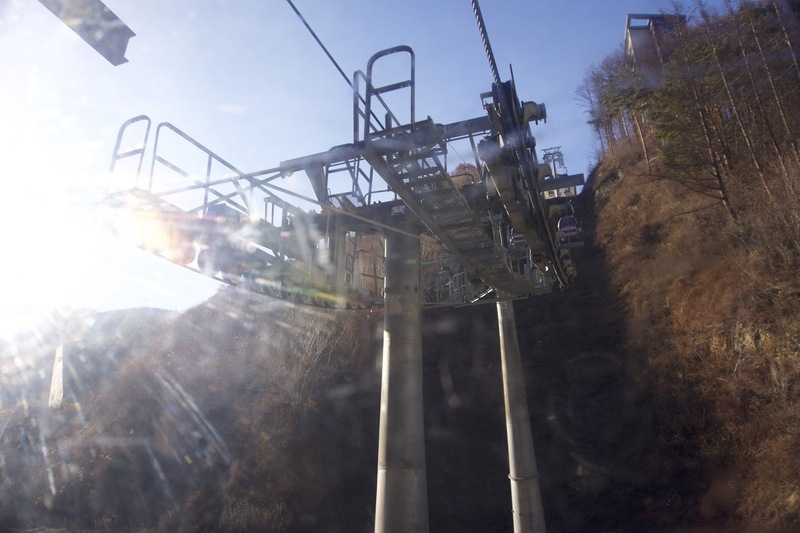 We originally planned to get on a gondola and head towards the Mountain Top station and perhaps even across the valley. 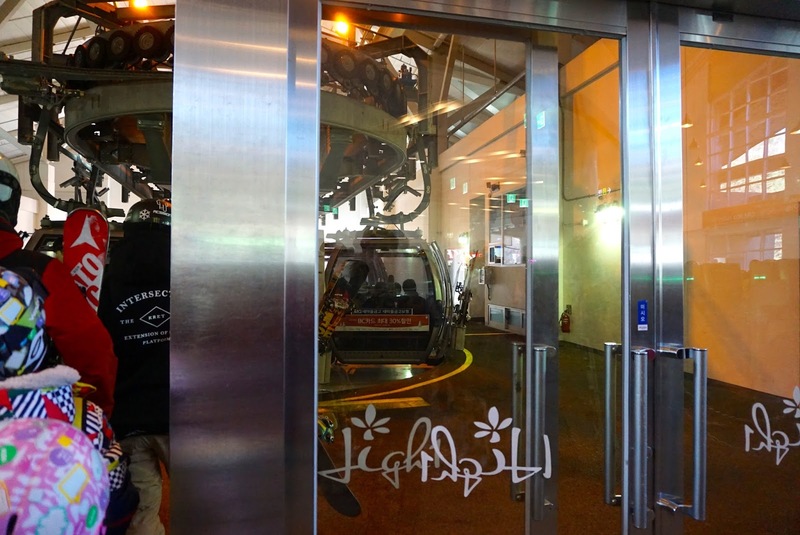 When we enquired about the gondola, we were informed that it was closed. 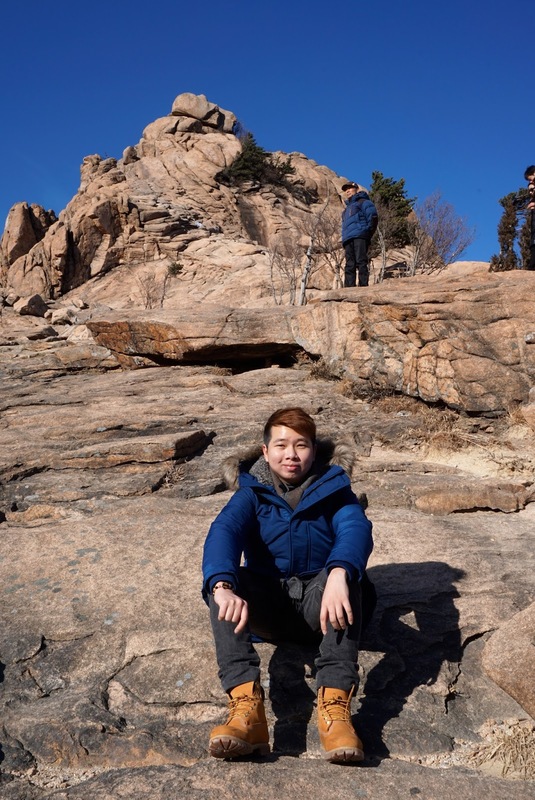 We felt a little disappointed that we did not get to go to the top of the mountain. 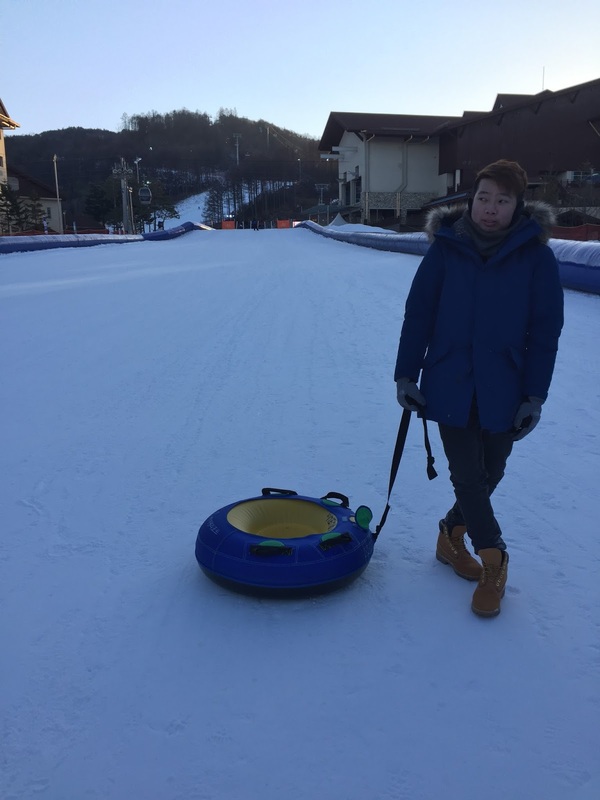 We did not want to let the events of the day disappoint us and went sledging instead. 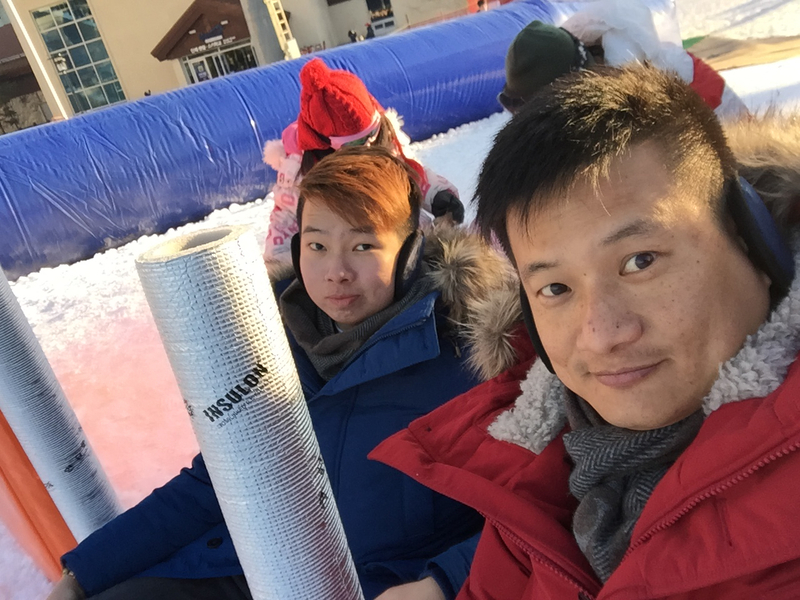 Coming from the tropics, we had zero knowledge of skiing, plus the little time that we had left at the ski resort, sledging was about the only other thing we can do. After paying for our sledging, we headed towards a hut to collect a rubber tube, that will be used for sledging. At first there were quite a crowd sledging. 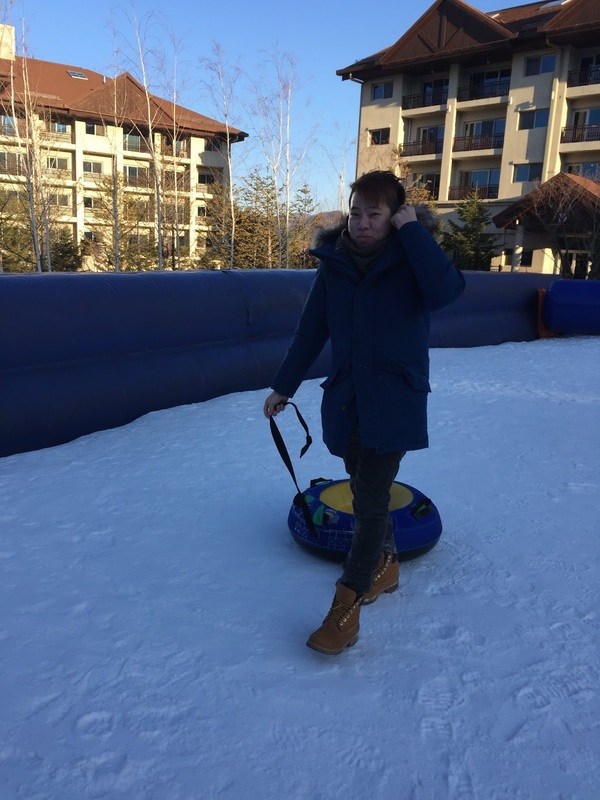 As we went for more rounds on the sledge, the crowd thins out. 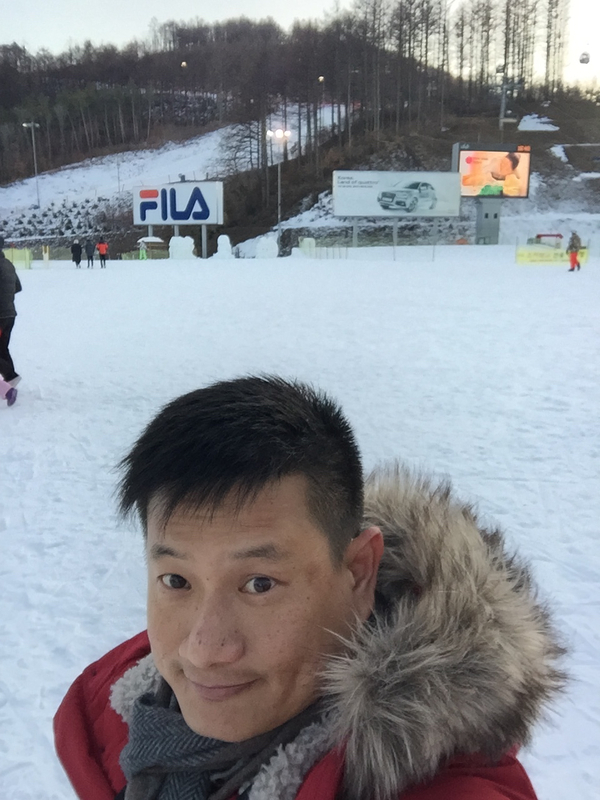 After awhile, the crowd dissipated that we did not even have to wait for our turn to sledge down the slope. 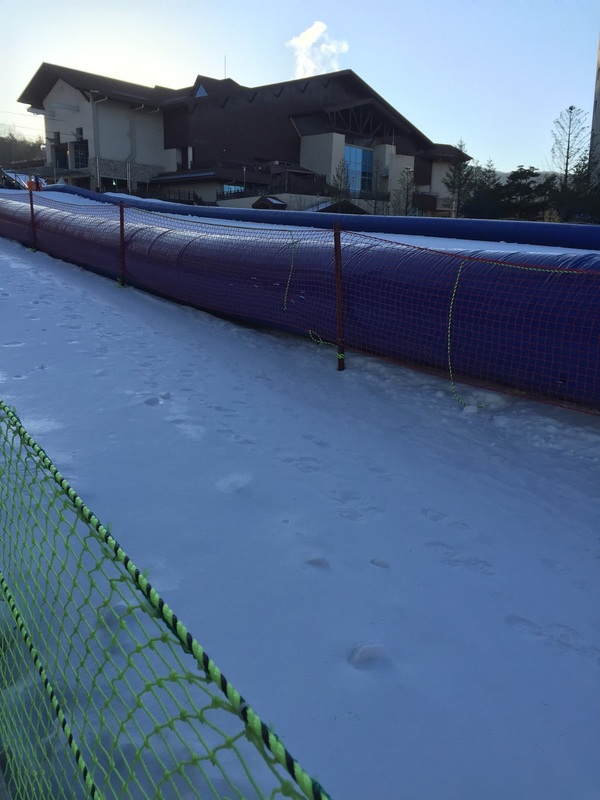 For my first run on the sledge down the slope, I bumped into the rubbery safety barrier that was put up by the resort, as I did not know how to slow down. The staff did not even helped to slow me down. After crushing onto the barrier, no help was offered to get me up. 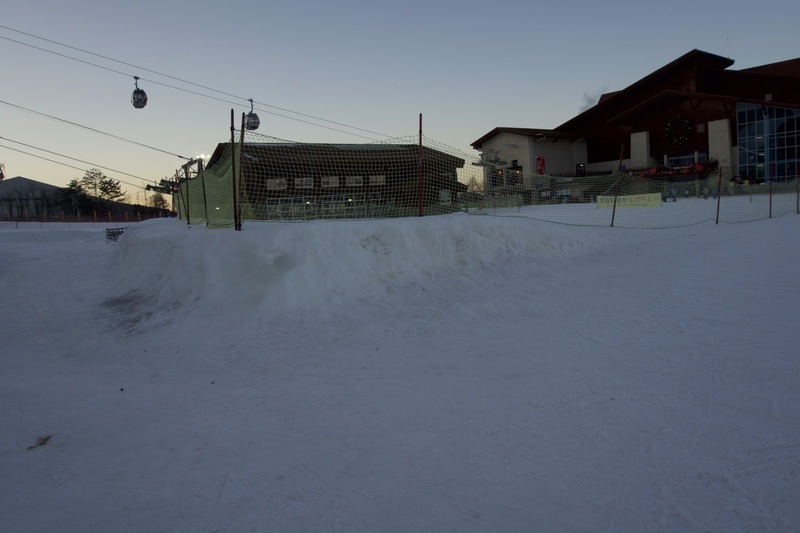 However after a few runs, I learnt to control the speed and slow down eventually to prevent crushing onto the barrier. 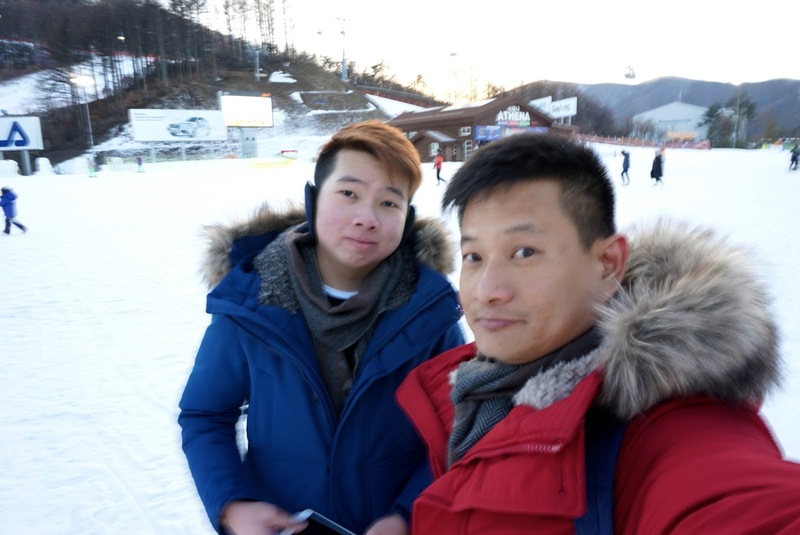 We must have done the sledging for more than 10 times. Before long, we were told they are closing for the day. 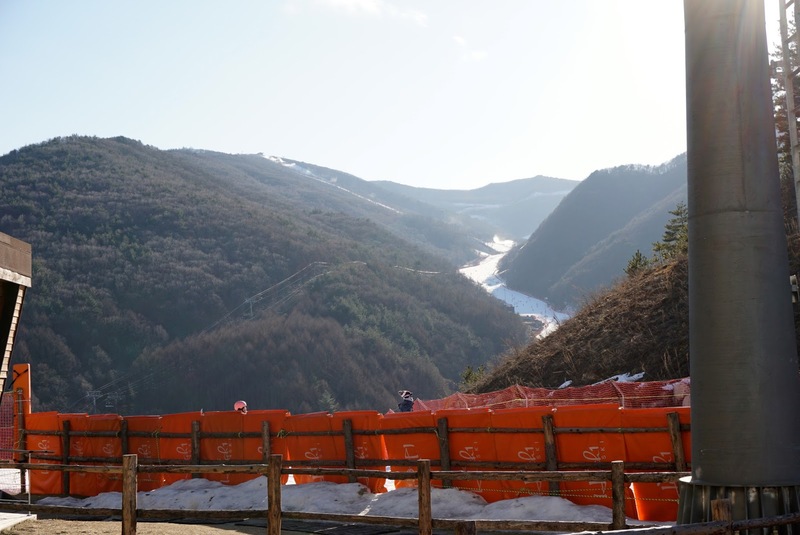 After returning our rubber tube sledges, we went around the area to take pictures of the surroundings. 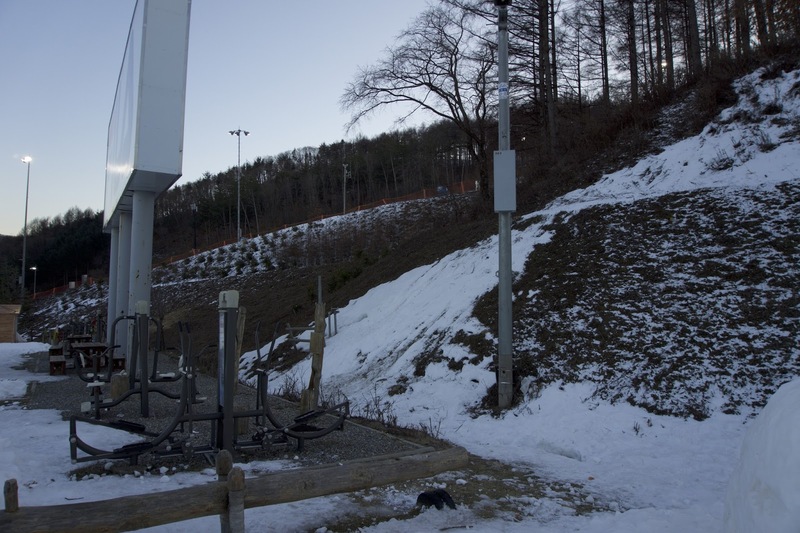 The view at the base of the ski slopes in the evening was stunting. Snow blanketing what would be a grassland in spring and summer, with the colours that the sun set effect has painted the sky, coupled with no crowds, the surrounding just felt peaceful. 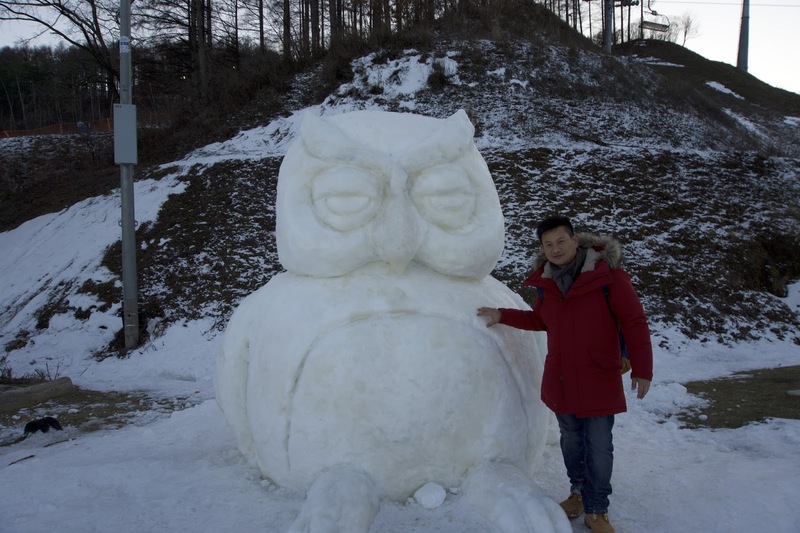 We spotted some ice sculptures in the area and headed to take pictures with it. Other than walking on the snow and taking pictures, there are practically nothing much we can do around here at this time when all the actions ceases to operate. 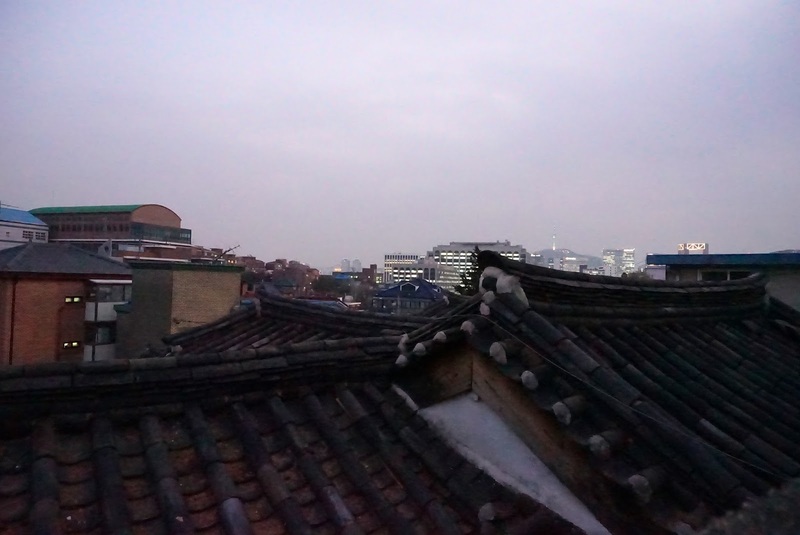 Looking at the time, it is almost time for us to head back to the train station and catch our train back to Seoul. We had to pull the rubber tube sledge back to the start point. Fortunately there is a make shift travellator . 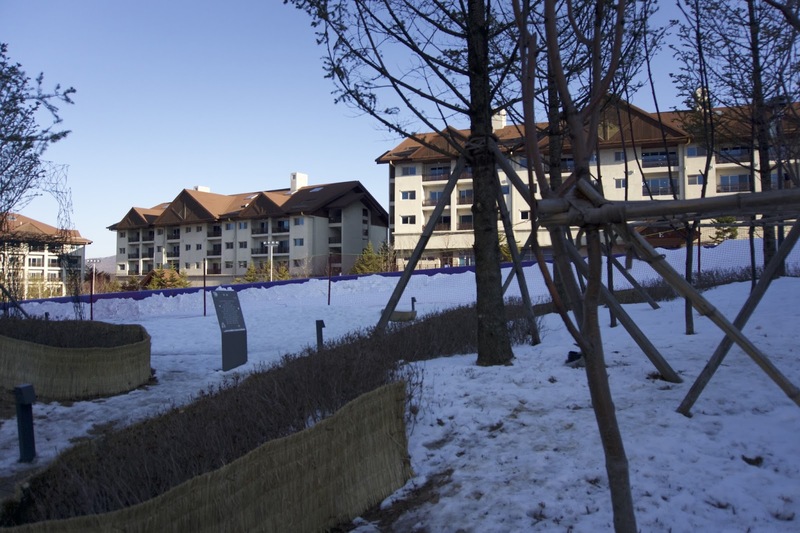 The Ski Resort provides regular complementary shuttle service to and from Gohan train station. 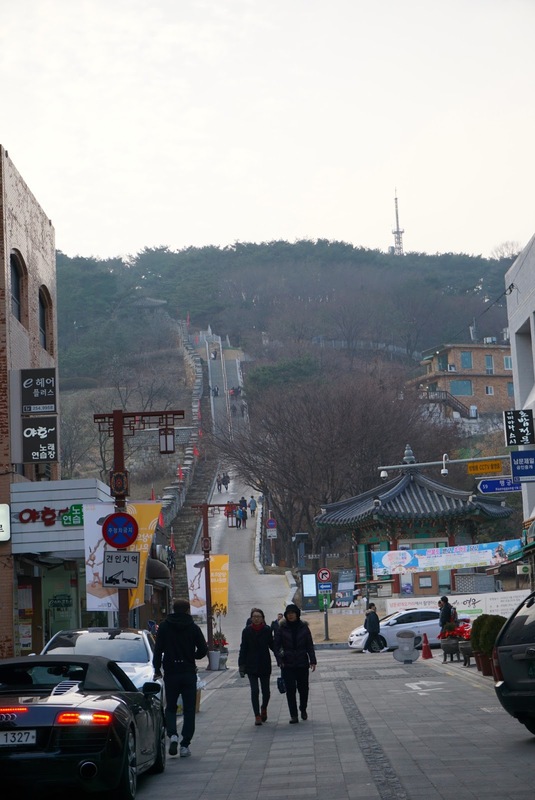 Gohan station is situated on top of a slope and a 2 min walk from the place the shuttle service dropped us. The train station looked deserted when we arrive. We approached the ticketing counter to confirm that we were at the right place and were informed that the train will be calling in on platform 2. We did not want to miss the train again, hence we waited at the waiting room for the train despite being 30 mins early. 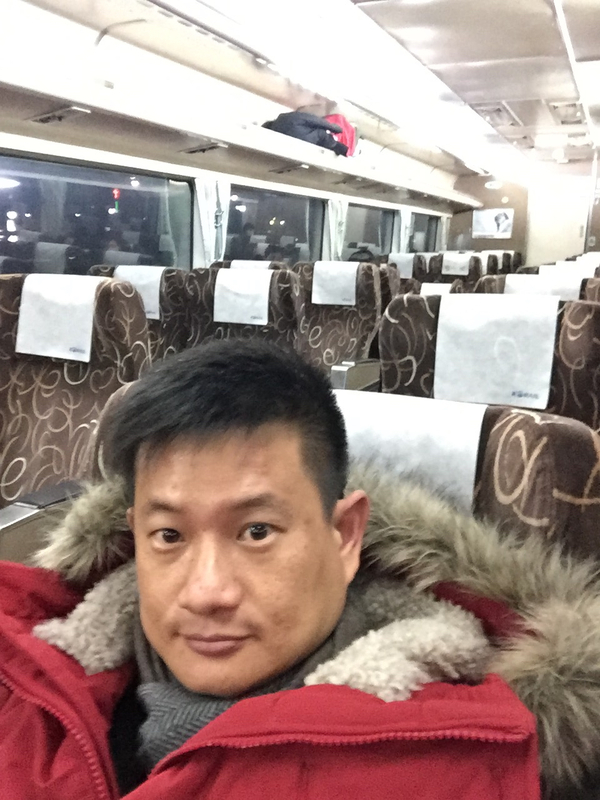 Soon the train pulled into station and we were surprised that there are not many people traveling in First Class. 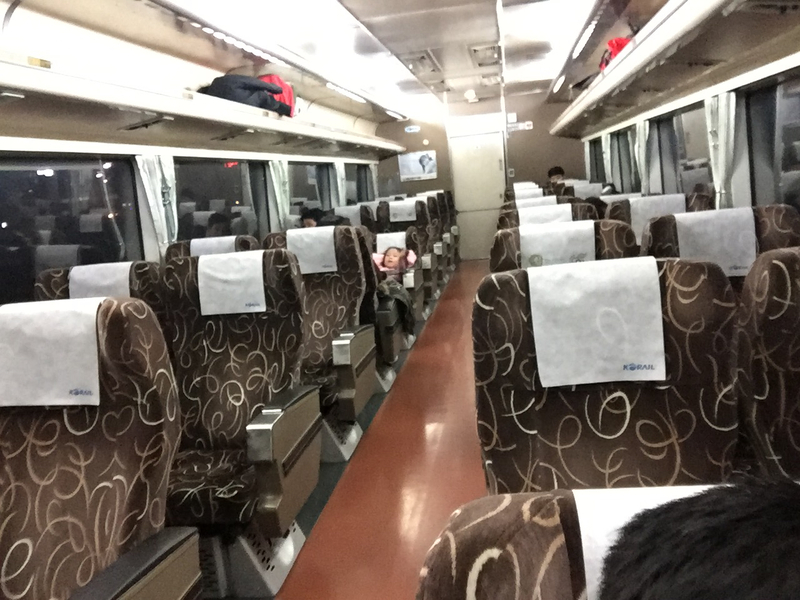 The seats in the first class car were large and comfortable, perfect for a good nap on our 3 hour ride back to Seoul. 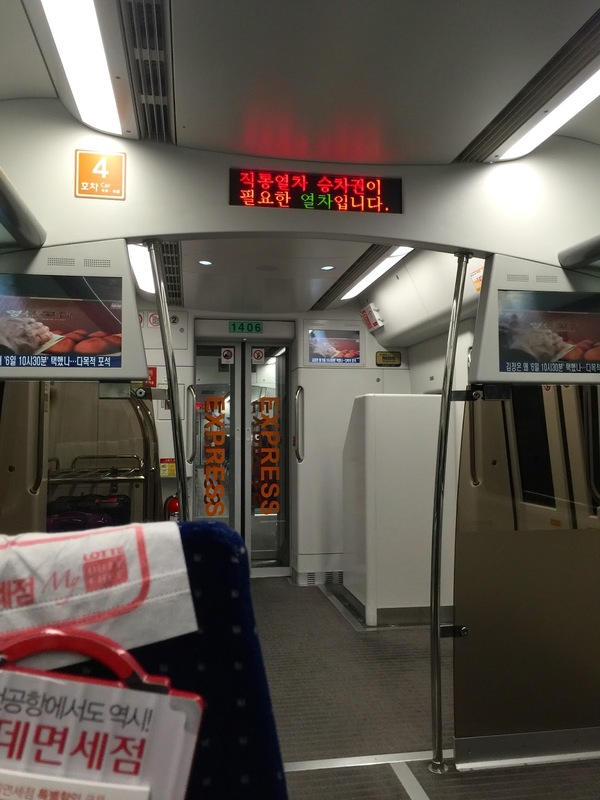 About 1 hour into the ride, an announcement came on to the PA informing passengers of a cafeteria in car number 4. Curious, I went to car number 4 to take a look. 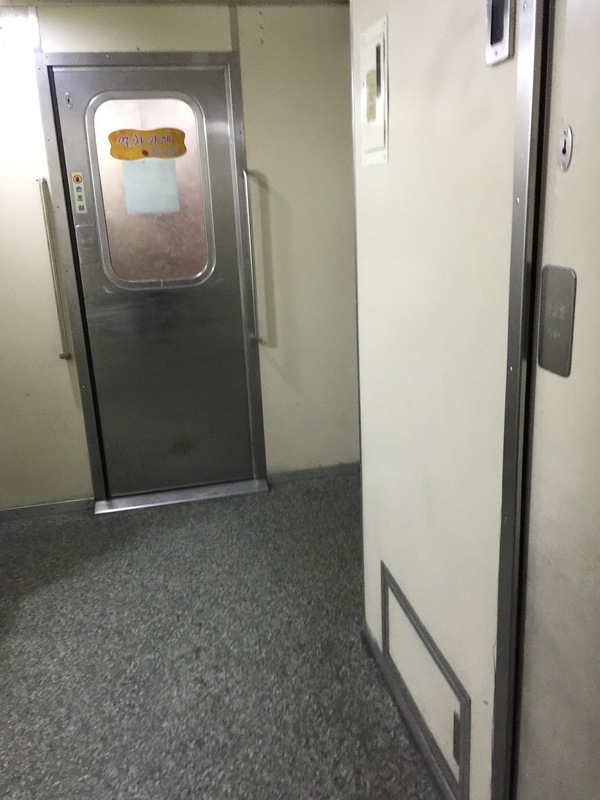 As I pass through 2 other standard class cabins (the seats here are slightly narrower than first class), instead of seeing a car full of sets, an rather empty cabin greets me. At one side of the cabin, there appears to be 4 private rooms. As I peek into these rooms, I realise these are karaoke rooms, some configured with 2 seats and 1 with one huge seat. 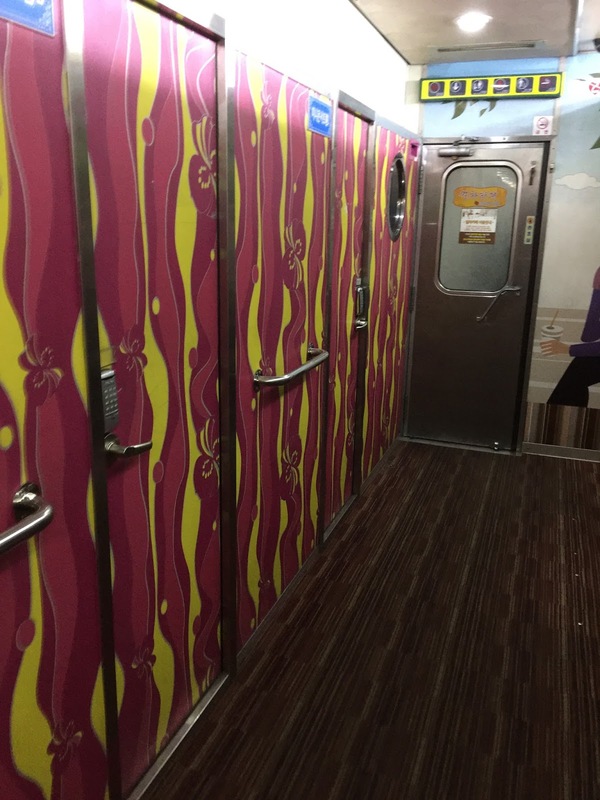 I thought this is rather refreshing, to have karaoke rooms on the train! 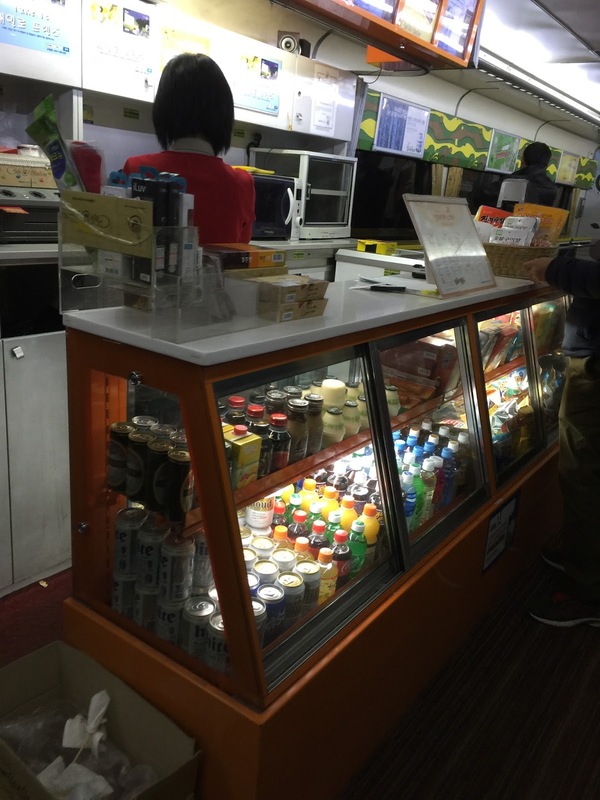 In the centre of the cabin is a counter, selling snacks and drinks. I ordered some snacks and the staff even heated up for me. 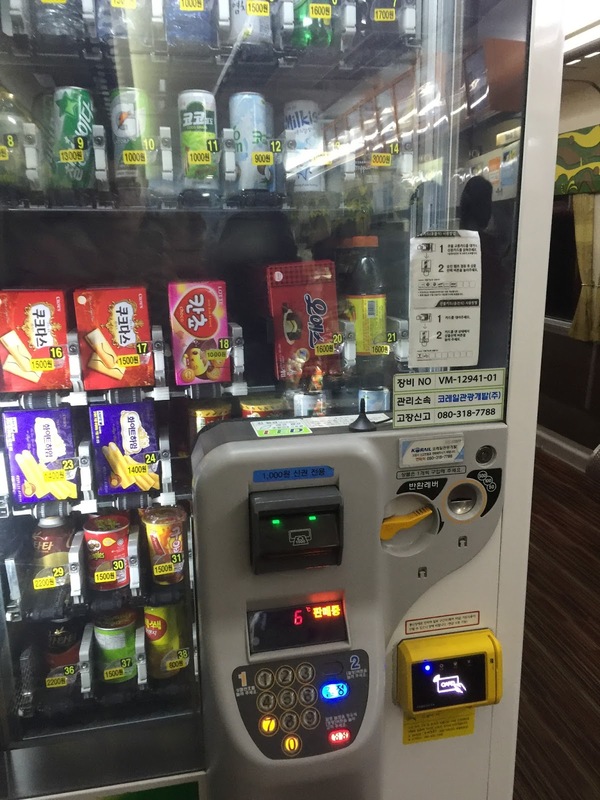 There are also vending machines onboard located in the cafeteria cabin. 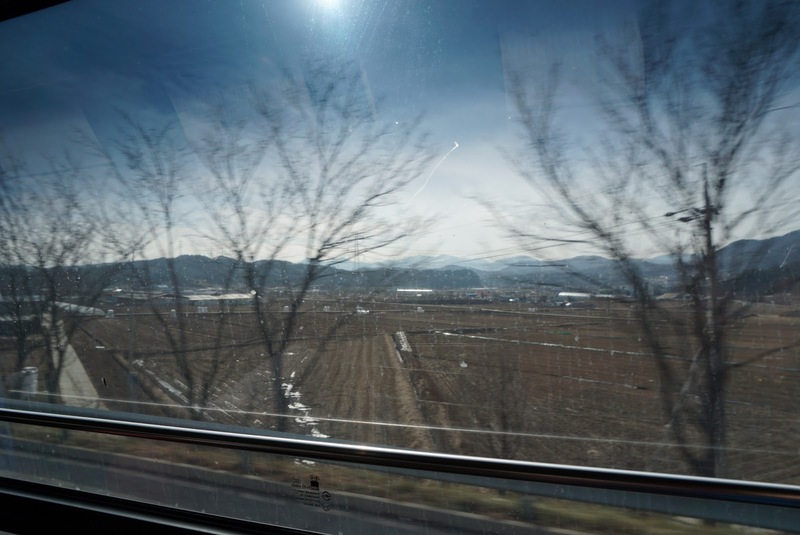 Further down the cabin is a row of seats facing the window with a long table for passengers to snack on while watching the changing scenery outside the train. 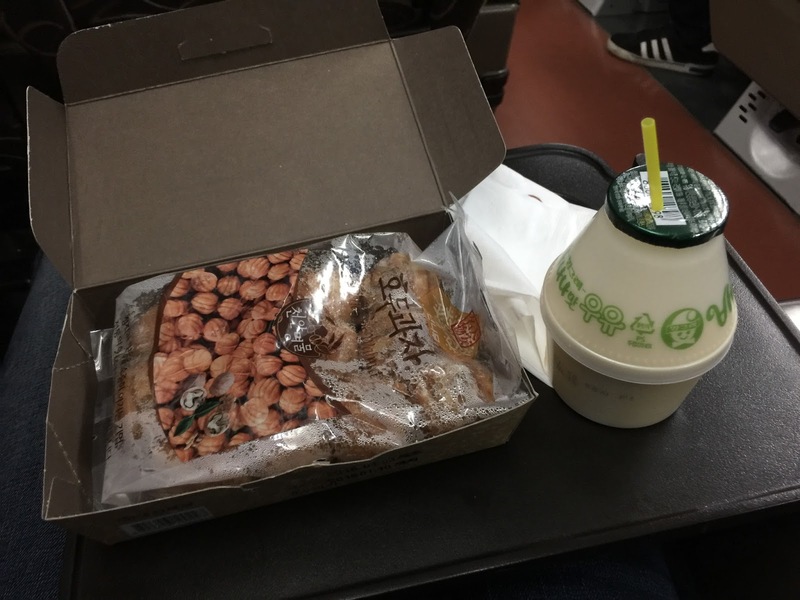 After getting my snacks, I headed back to my seat for the rest of the journey. 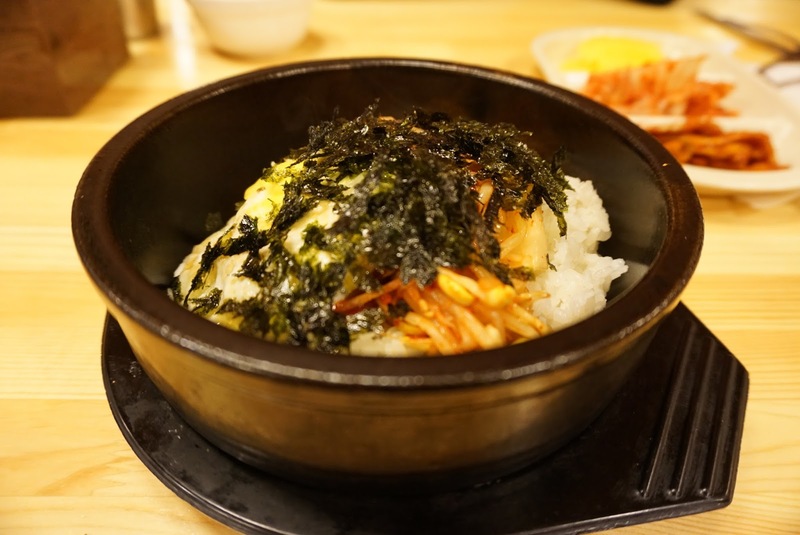 When we reached Seoul we were famished, we headed to Myeongdong to hunt for dinner. 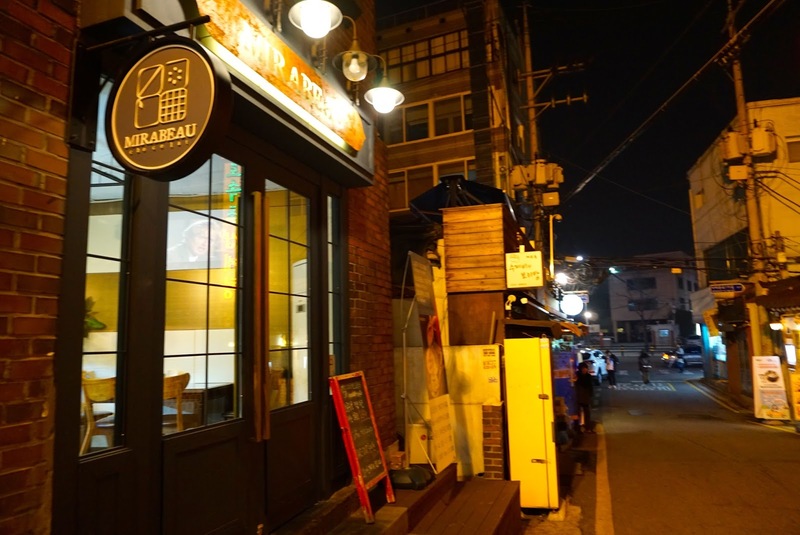 As it was close to 11pm, most of the restaurants were closed or about to close. 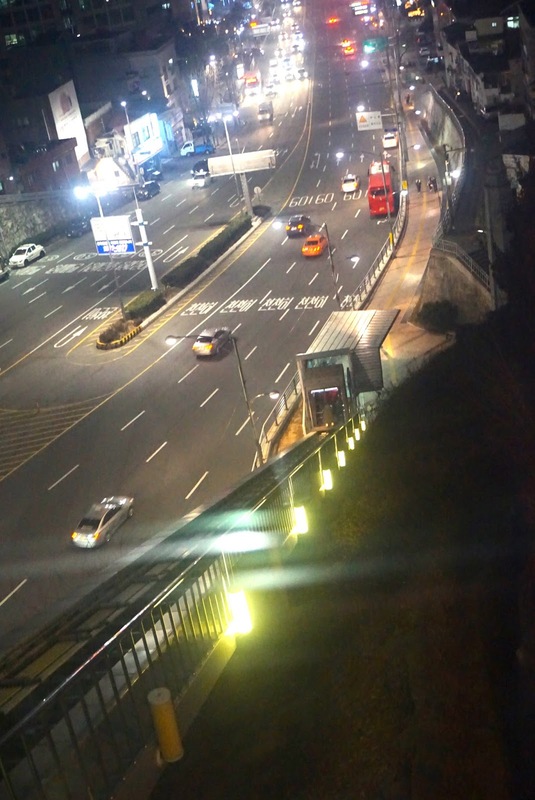 Myeongdong at this hour seem peaceful, without the crowds. It felt as if the whole area went to sleep. 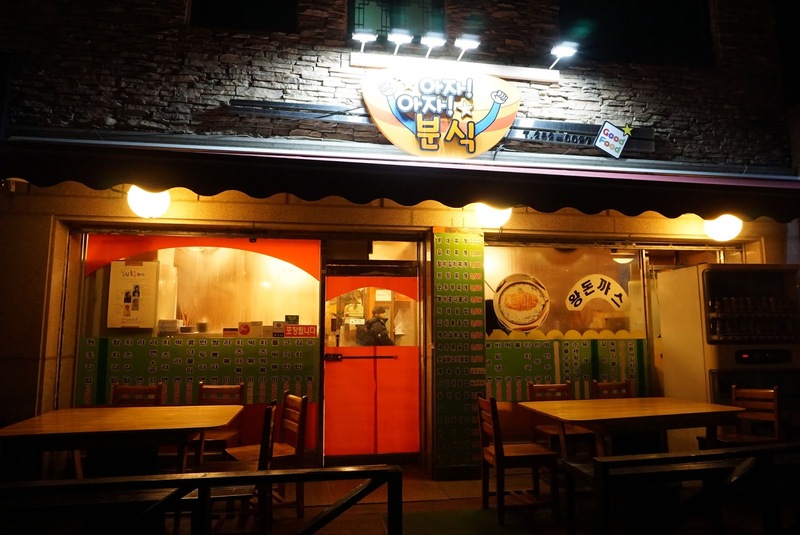 As we were walking, part shopping (some shops are still opened), part hunting for food, we chanced upon a restaurant that serves teppanyaki style hot plate chicken. 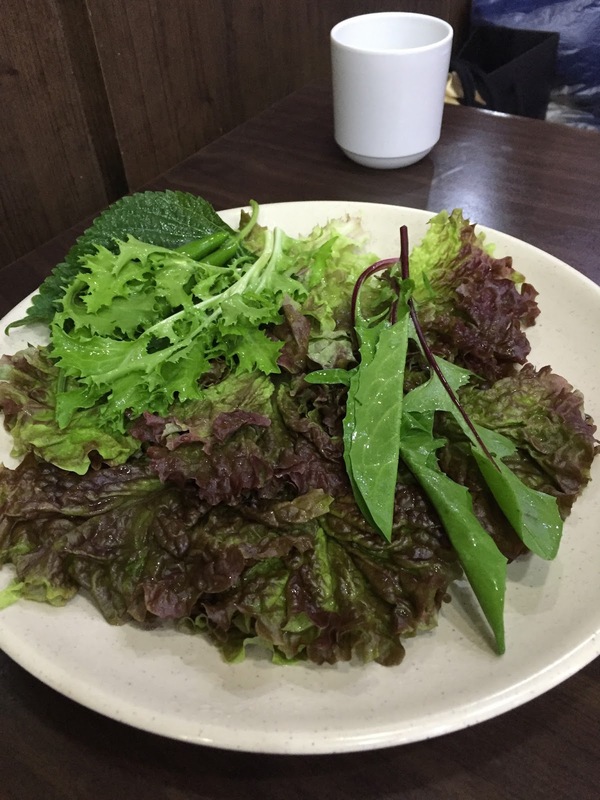 We ordered a portion for 2 and the food did not disappoint. 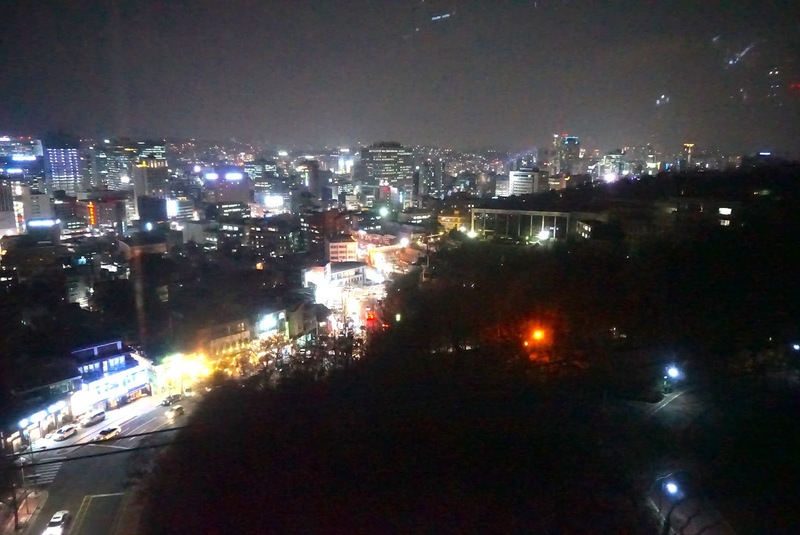 After dinner, we hailed a cab and headed back to the hotel to rest for the night. 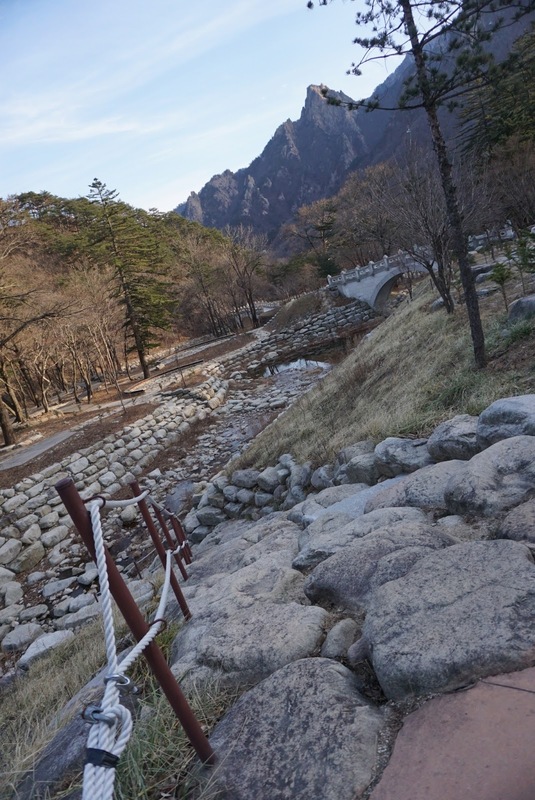 In our plans for this Korean trip, today is the day we visit Seoraksan National Park. 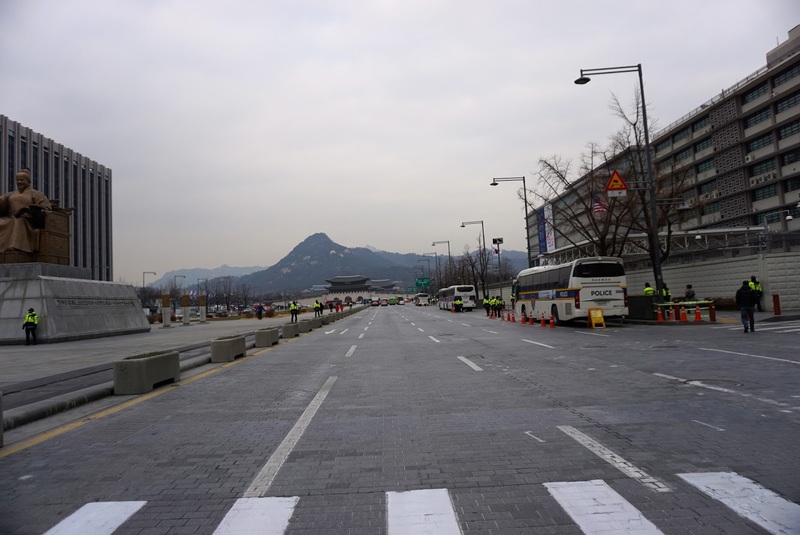 By planning the day trip on a weekday, we will be able to avoid the crowds. 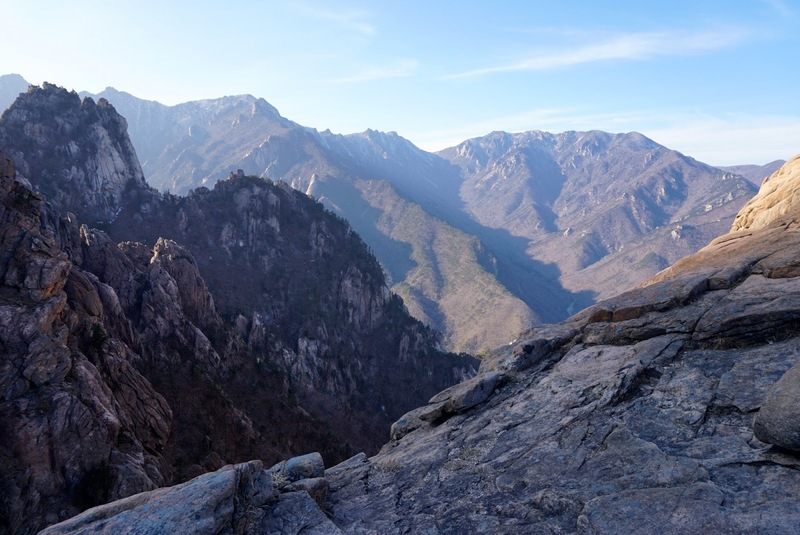 Seoraksan National Park is located in Gangwon-do, some 3 hours from Seoul. 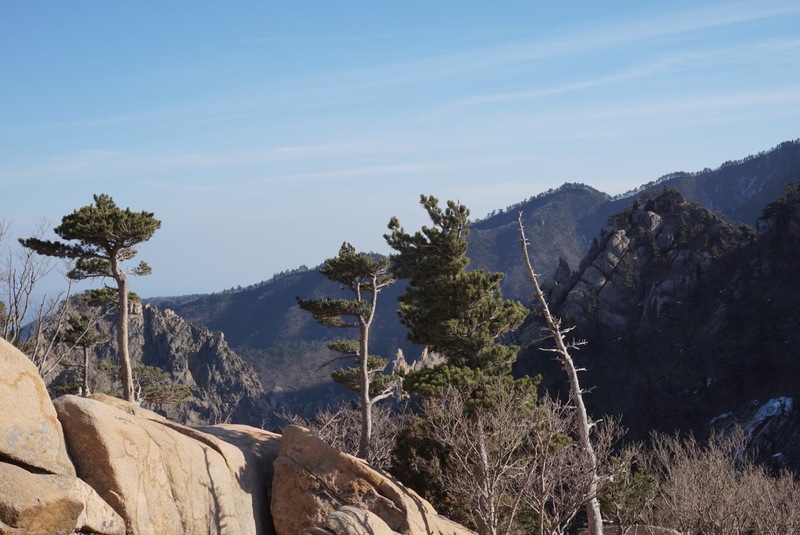 Seoraksan National Park is one of the most beautiful and most visited National Park in the entire Korean Peninsular. 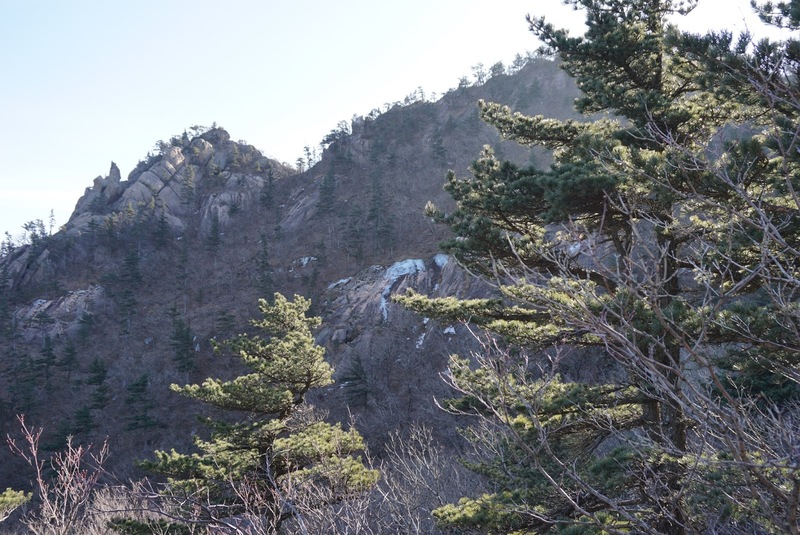 It is designated by UNESCO as a Biosphere Protection Site. 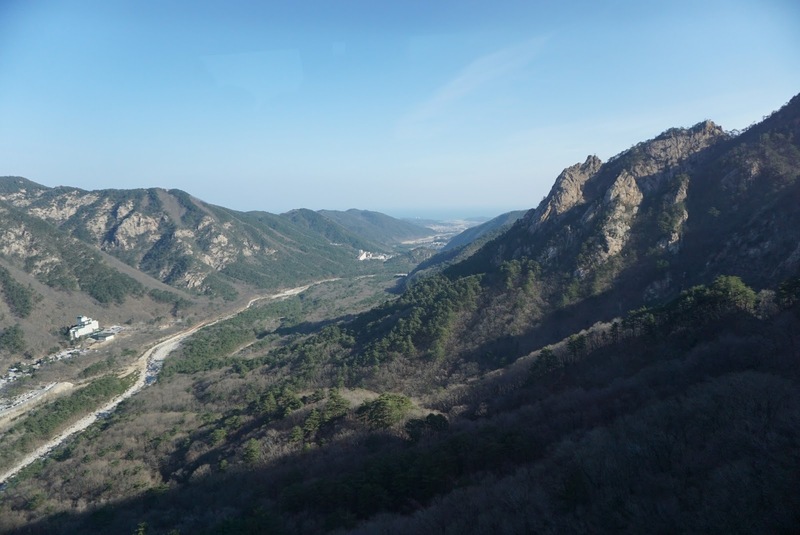 To get to Seoraksan National Park, we had to take a bus from Seoul Express Bus Terminal to Sokcho and transfer to a local bus. 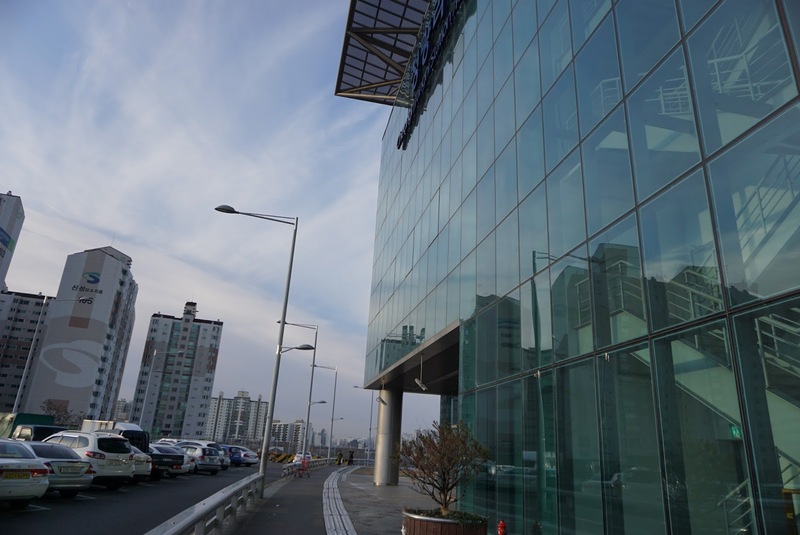 Seoul Express Bus Terminal is accessible via the subway and is located at the Express Bus Terminal Station (Exit 1). 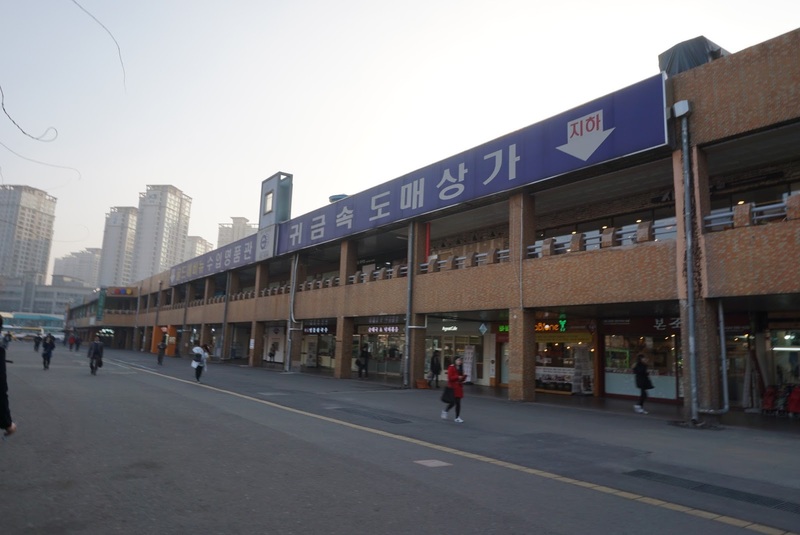 We headed for the ticketing booth the moment we reached the Bus Terminal and got the tickets (costs ₩18,100 one way) for the next Express Bus to Sokcho. 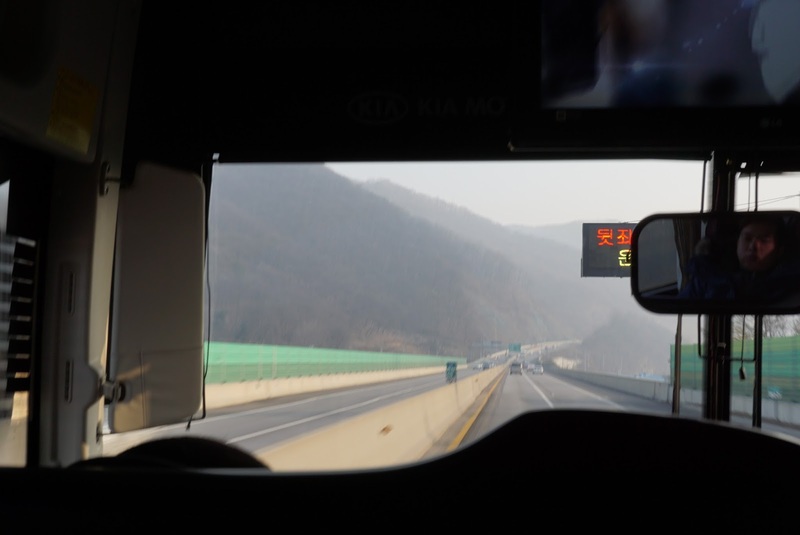 The bus ride from Seoul to Sokcho takes about 2.5 hours, with a pit stop in between. 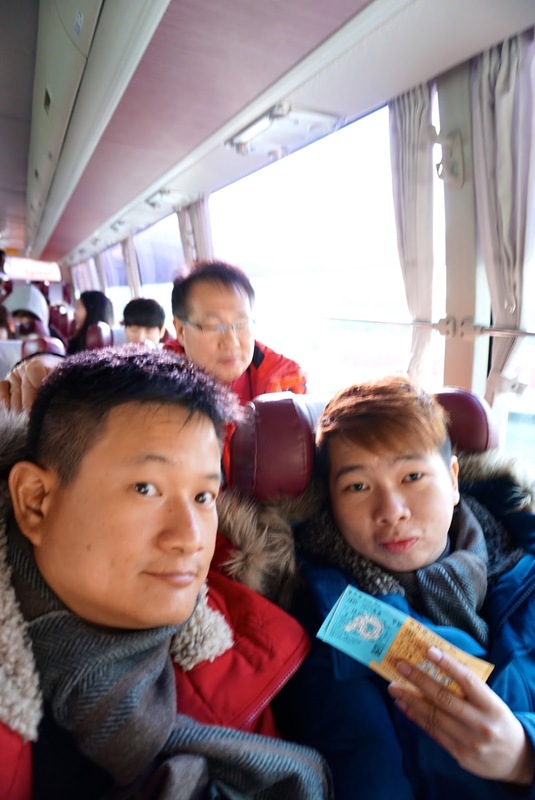 The express bus to Sokcho is very comfortable furnished with wide leather seats, which enabled us to catch a nap. 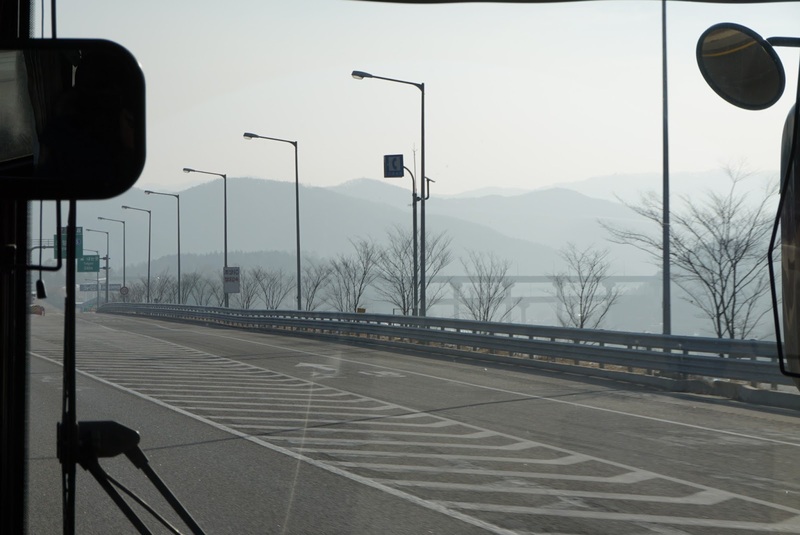 The bus has a 32in LED TV at the front, showing Korean dramas. 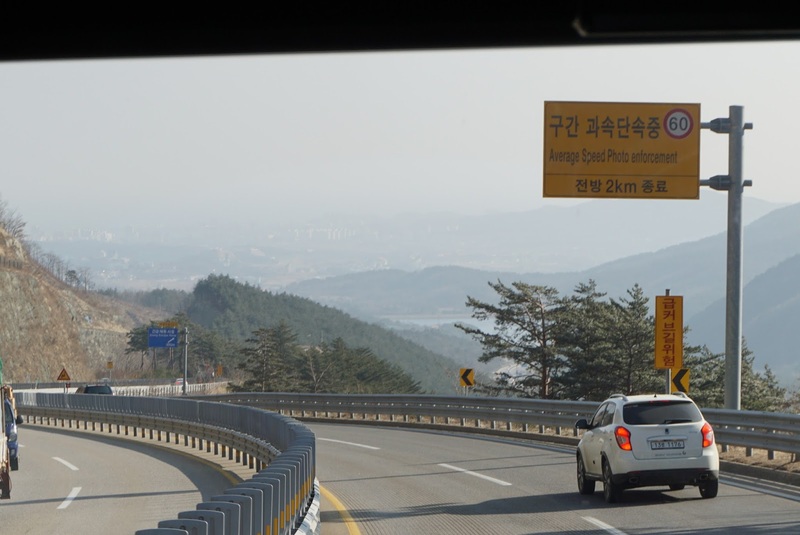 Before reaching the pitstop and subsequently Sokcho, announcements were made. The bus driver even went around counting the number of passengers he has onboard before driving off. 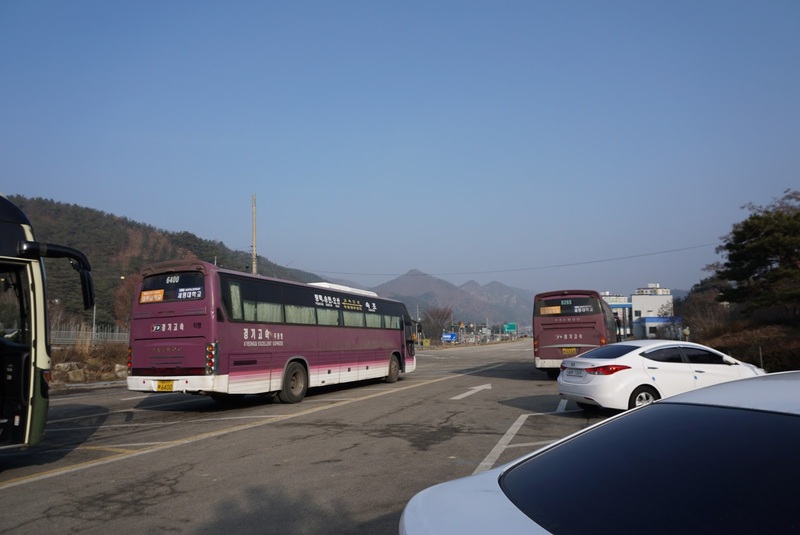 Buses 7 and 7-1, from the opposite side of the bus terminal, goes to Seoraksan National Park from Sokcho Express Bus Terminal. 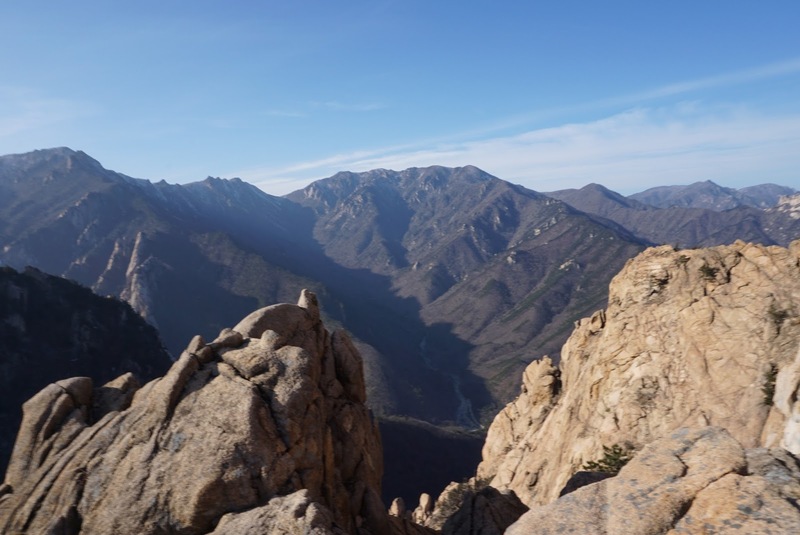 The ride to Seoraksan National Park takes around 1 hour from Sokcho Express Bus Terminal, with scenery changing from coastal to mountainous through some farm lands. 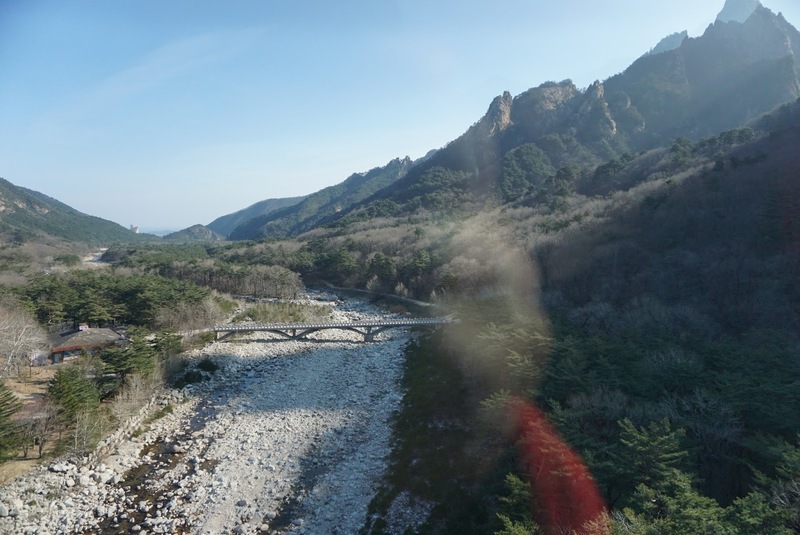 Seoraksan National Park is at the end of the bus service. 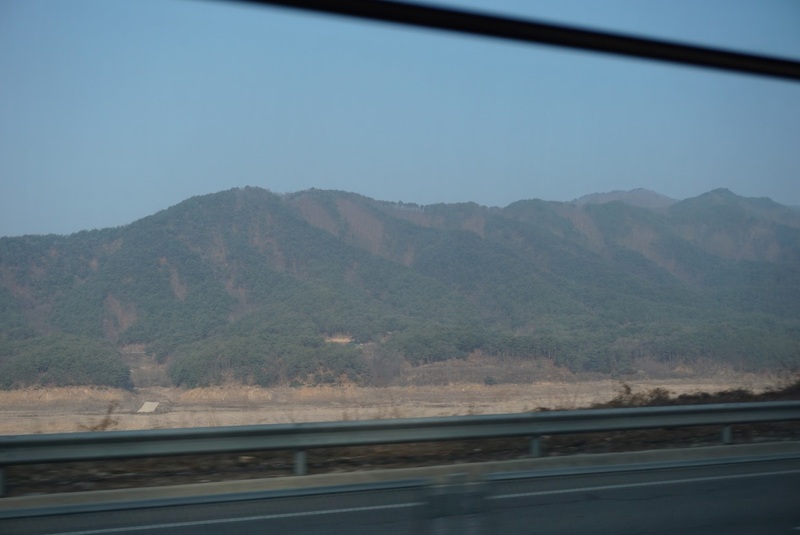 We alighted the bus at Seorak-dong, we were captivated by the majestic mountains in front of us. I cannot imagine under 1 hour ago, we were still facing the coast line, watching the waves hitting ashore as we were riding on the bus. 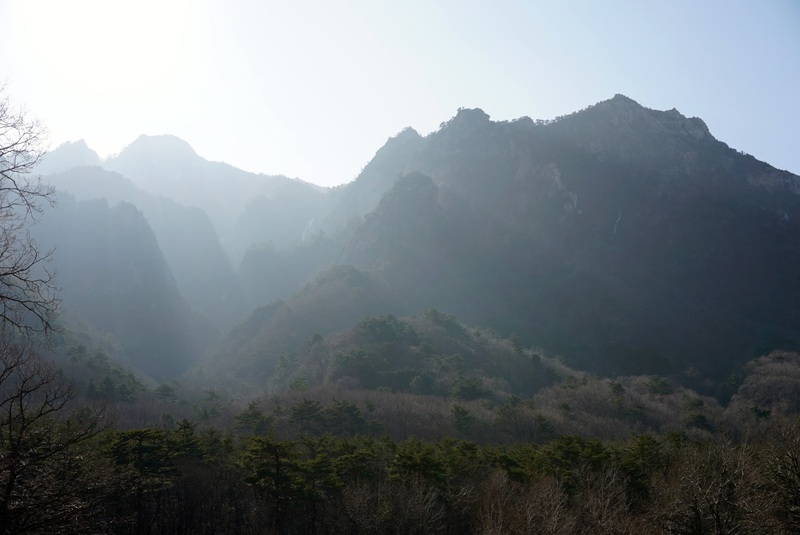 Moments later we were greeted by the mightiness of the mountains that were in front of us. I can’t help but marvel at the wonders of Mother nature. 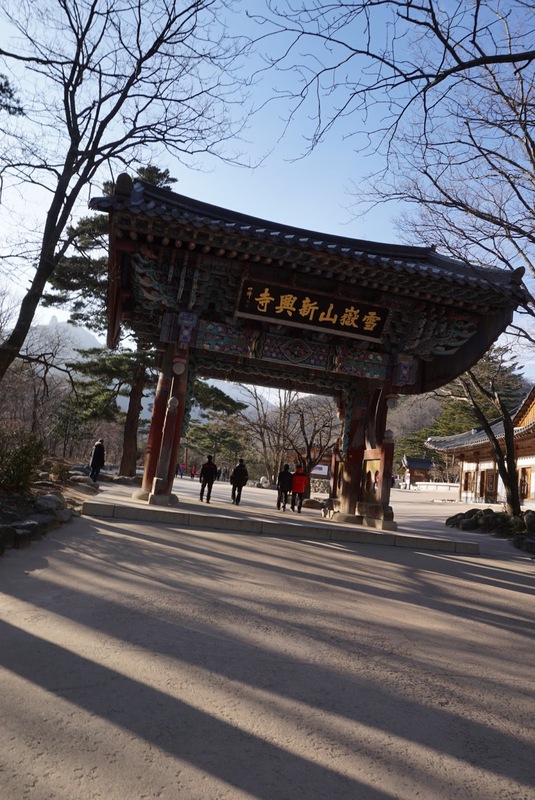 We were greeted by a Korean style arch way, marking the entrance to Seorak-dong, confirming we were at where we were suppose to be. 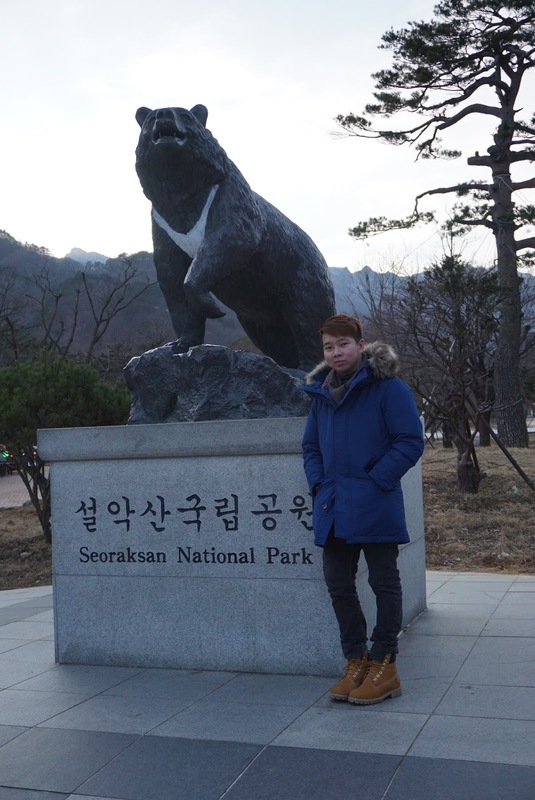 A short walk from the archway, a large metal statue of a bear, that is an icon in this national park. 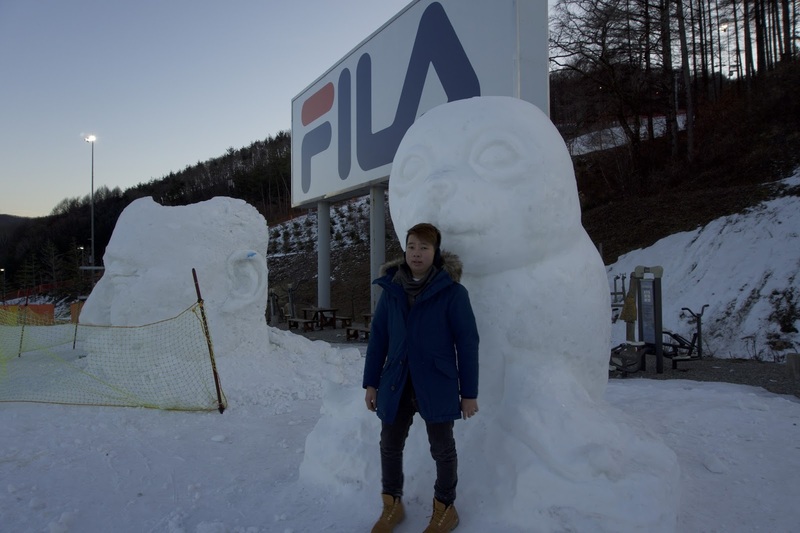 Almost all visitors would stop here to take a picture of this statue. As there were people awaiting to take pictures, we skipped our photo opportunity with the bear and decided to come back later. 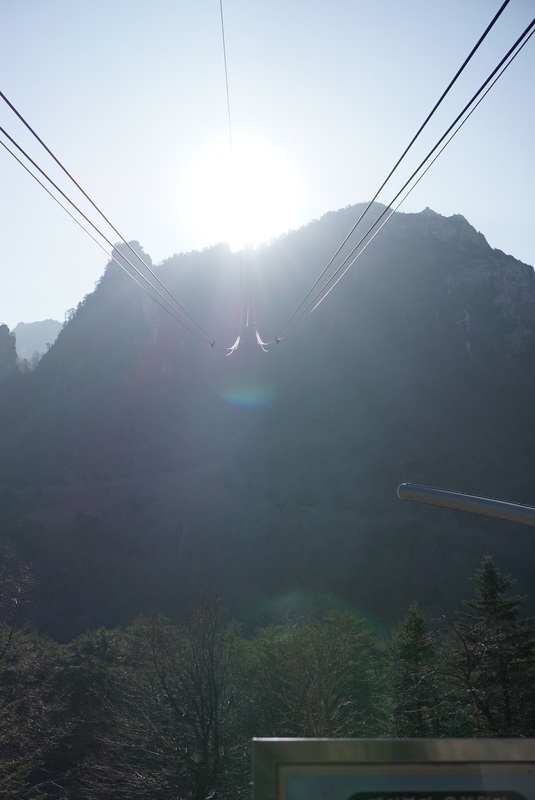 We headed for the cable car station, which would whip us up into the mountains within mere minutes. 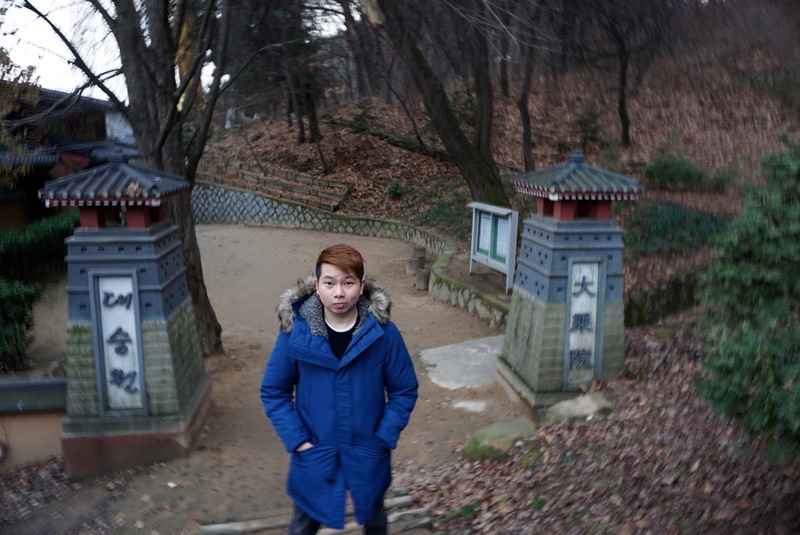 After having our meal, we headed to the Gwongeumseong Fortress. 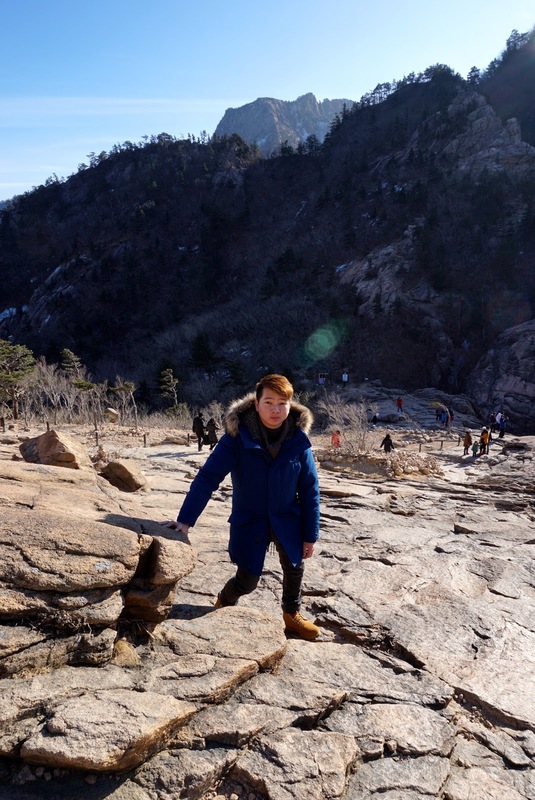 The 30 min walk with well laden walkways and stairs, is more of a walk then a hike. The journey is mild and is suitable for all ages. 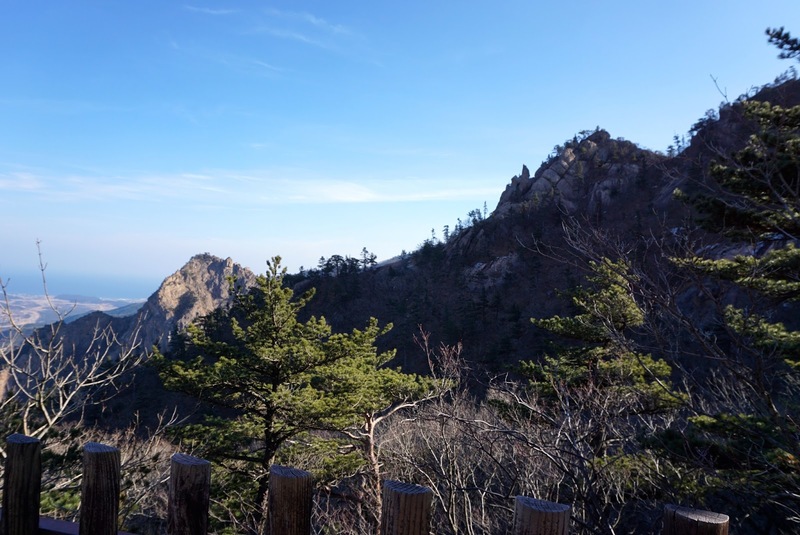 Gwongeumseong Fortress is situated some 860m above sea level and was the situated on top of the mountain where the cable car station is. 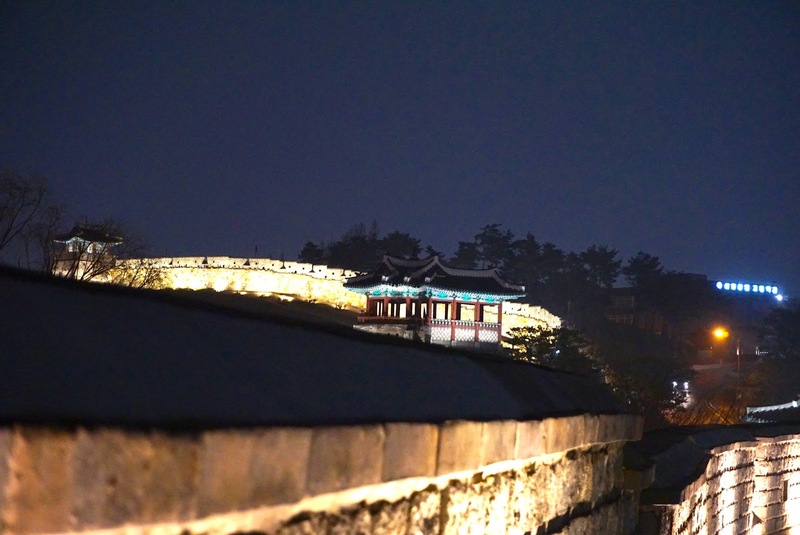 History of the castle was sketchy and is believed to be built by the 23rd King of Goryeo Period. 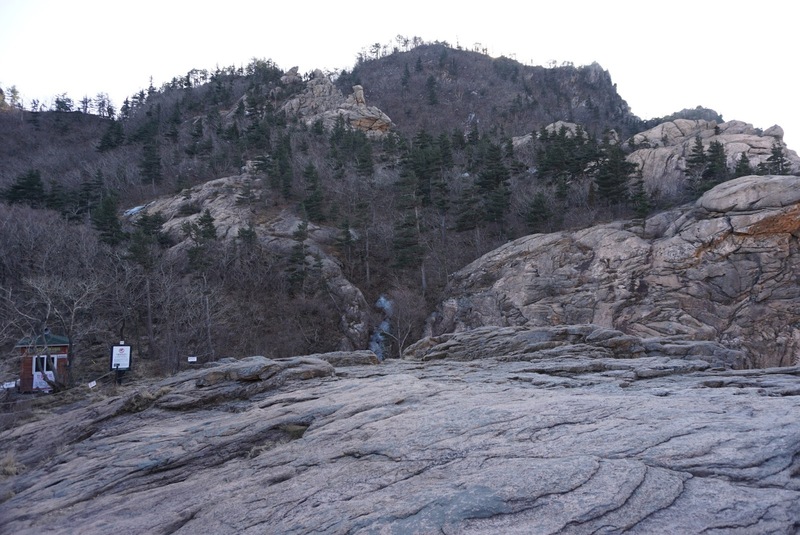 After passing through some well maintained pavement, the area opens up to a vastness of rocks. 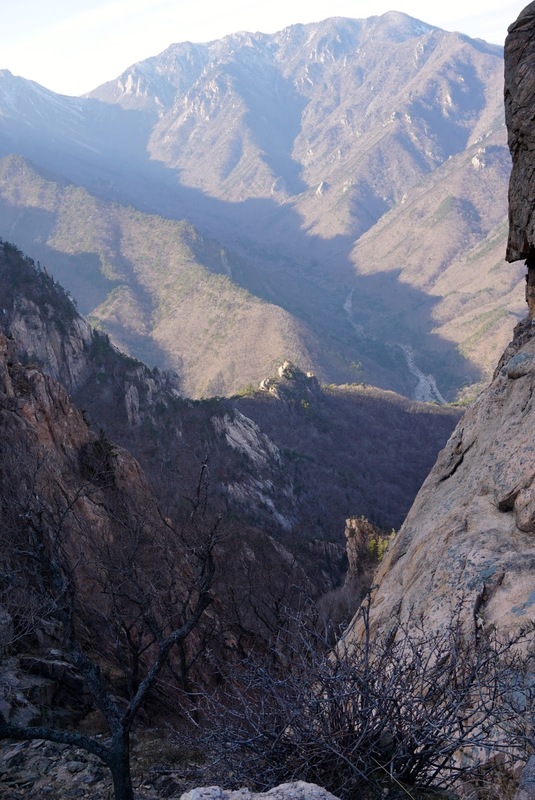 This is where one would have to be careful when walking up to the edge or the top of the mountain. 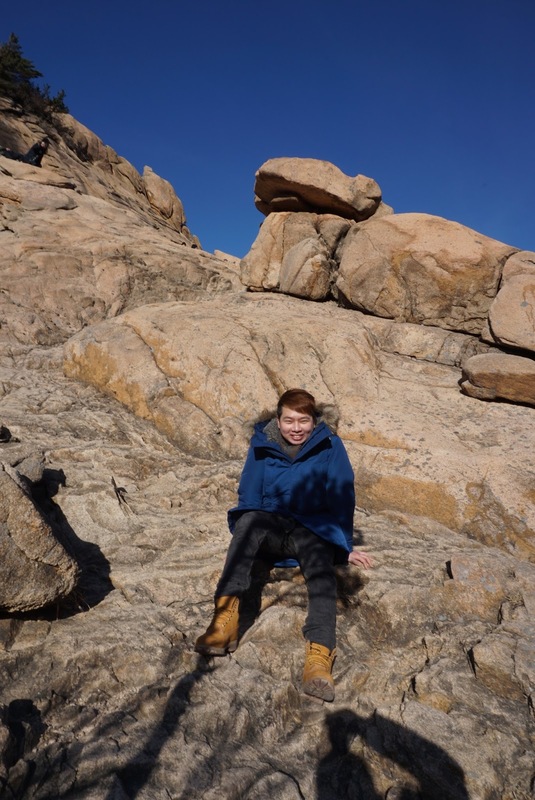 At this point, I was expecting to see some form of castle ruins or any reminisce of castle, however all I see was rocks and more rocks. 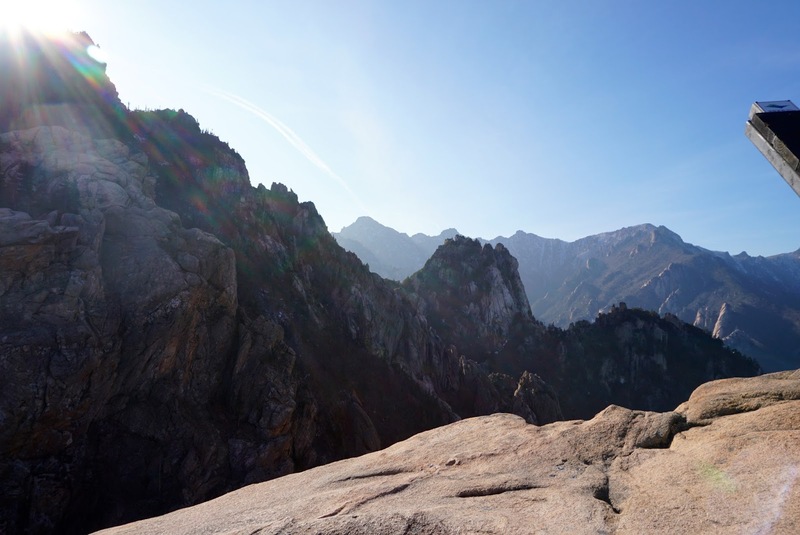 Does not seem to have any humanly made structures up here. Wonder how the fortress looks like in the earlier days. 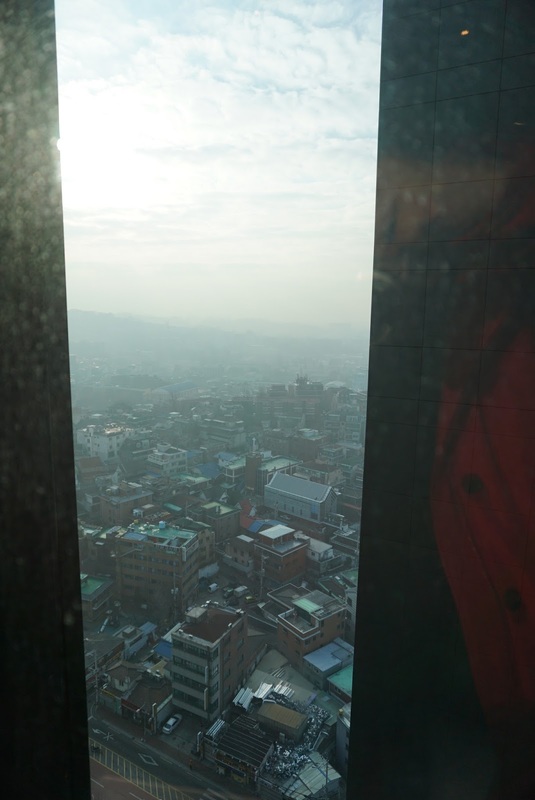 Nonetheless, the view here is simply breathtaking. 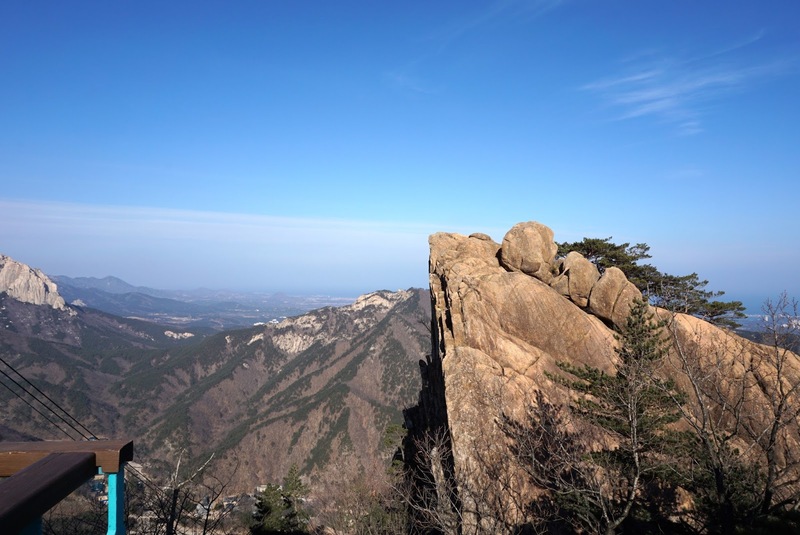 I walked up to the edge of the rocks and looked into the mountain ranges of inner Seorak. 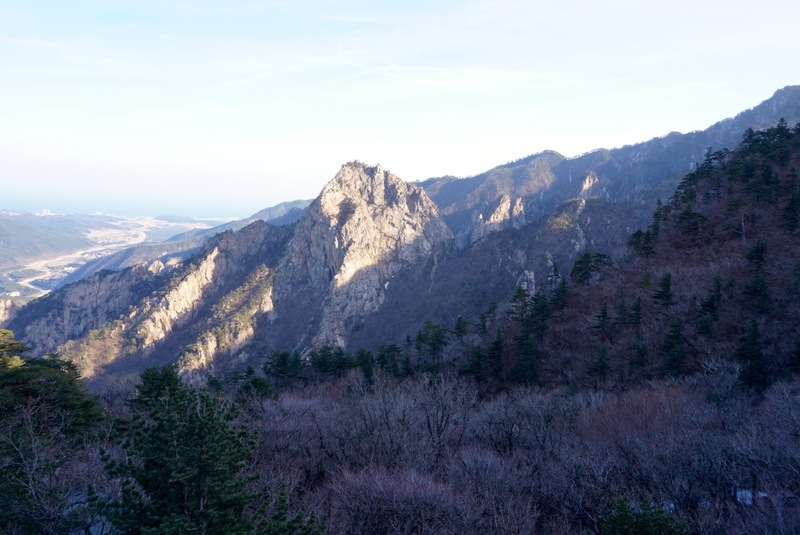 Miles and miles of unspoiled nature with no presence of mankind, draped in the clear blue cloudless winter sky of South Korea, this is a place where one can sense peace and zen. Great place for meditation or simply just absorb the wonder of Mother Nature. It is a good thing that we came on a weekday when the crowd was thin, we did not have to bump into a lot of people, which brings more peace into the area. 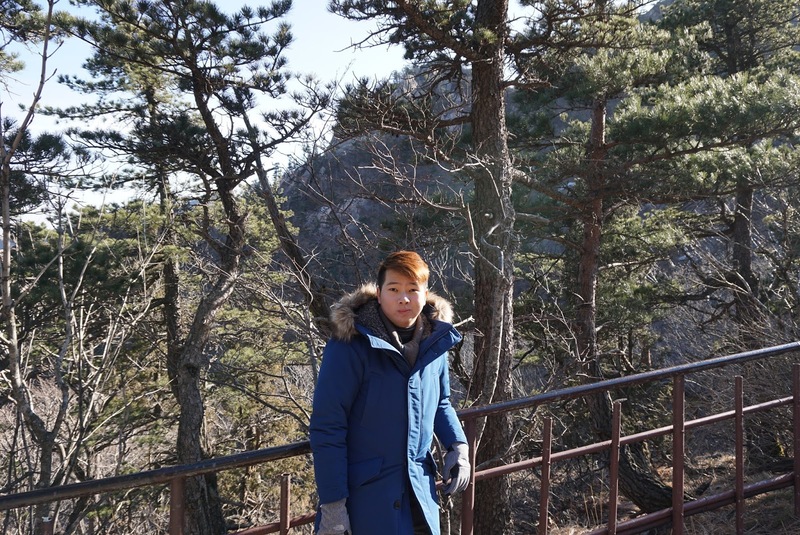 This is a place where one can enjoy the cold winter mountainous breeze. 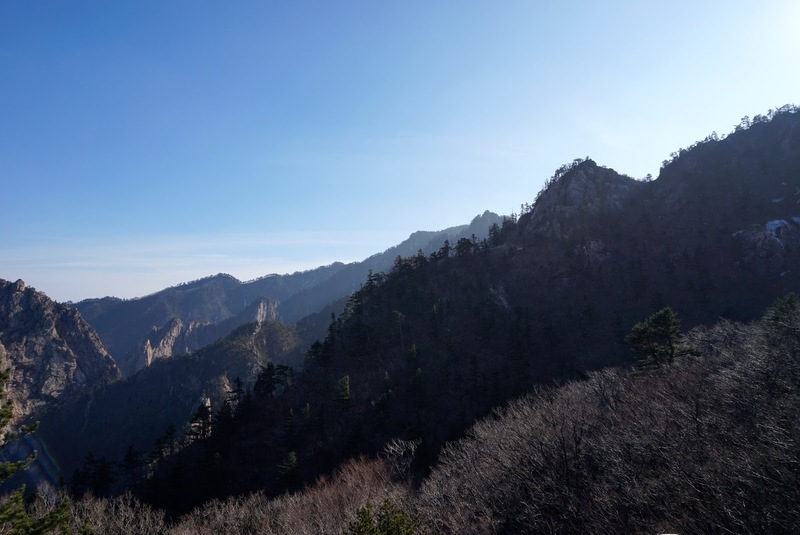 We headed further up towards the peak. 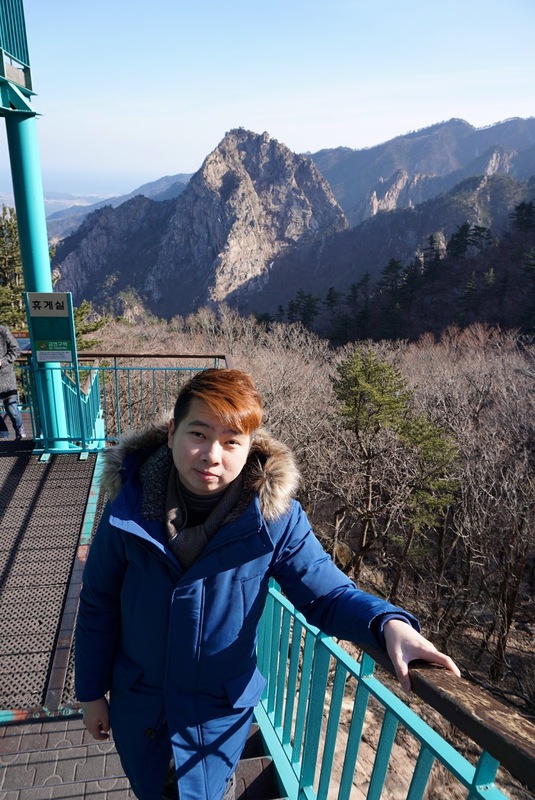 The upslope walk was easy despite having no clear marked path or handrails. 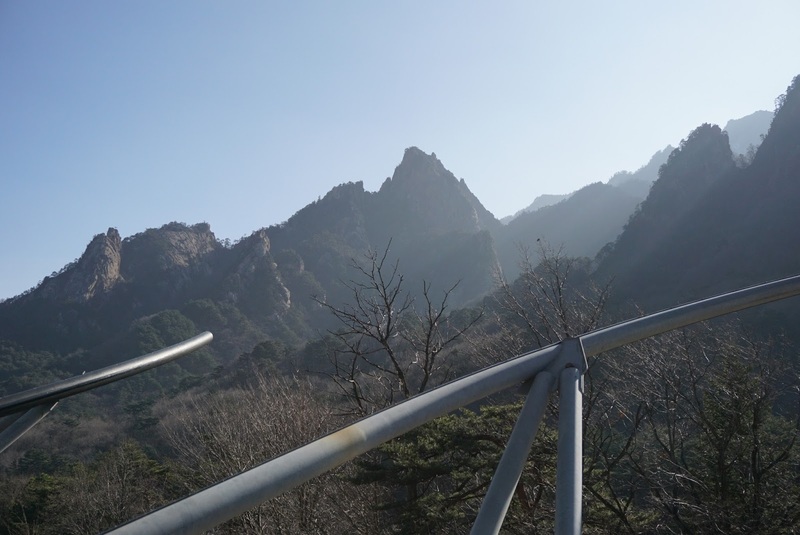 We simply followed the visitors up the slope towards the peak. 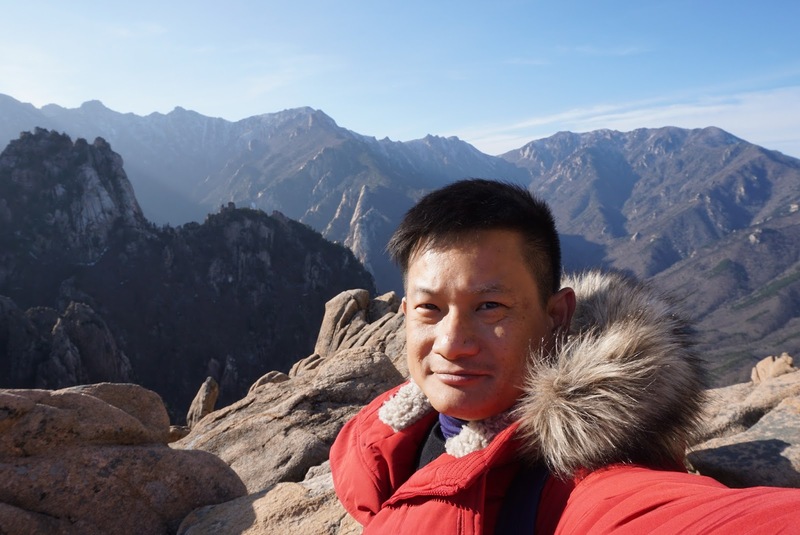 I did not go all the way up but stop near to the tip of the mountain. 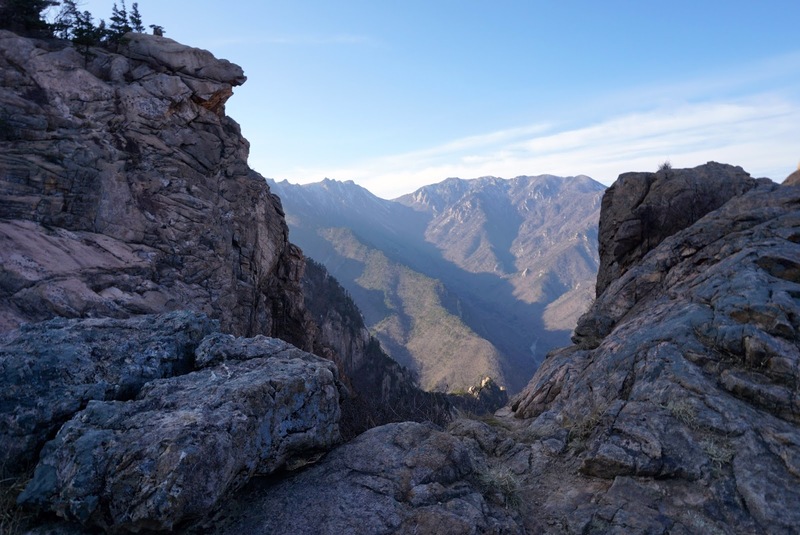 The view of the path that we took was fantastic. 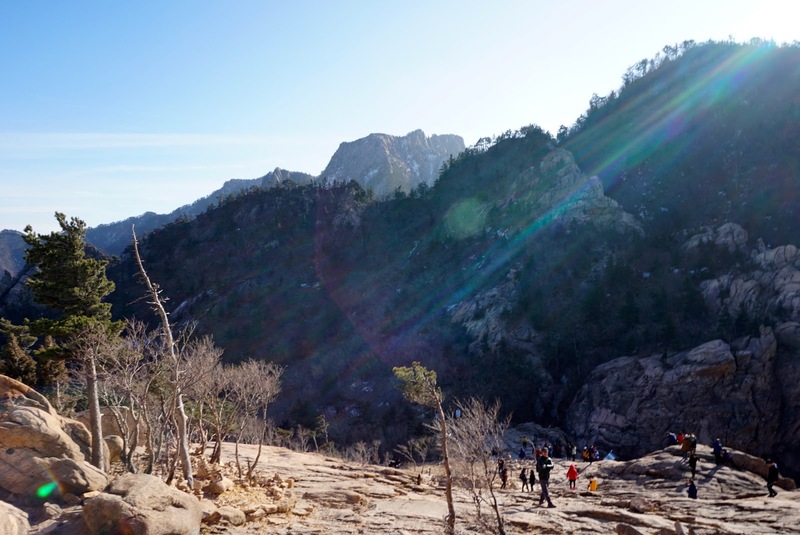 From up here, we started to wonder how in the world did we climb up here. 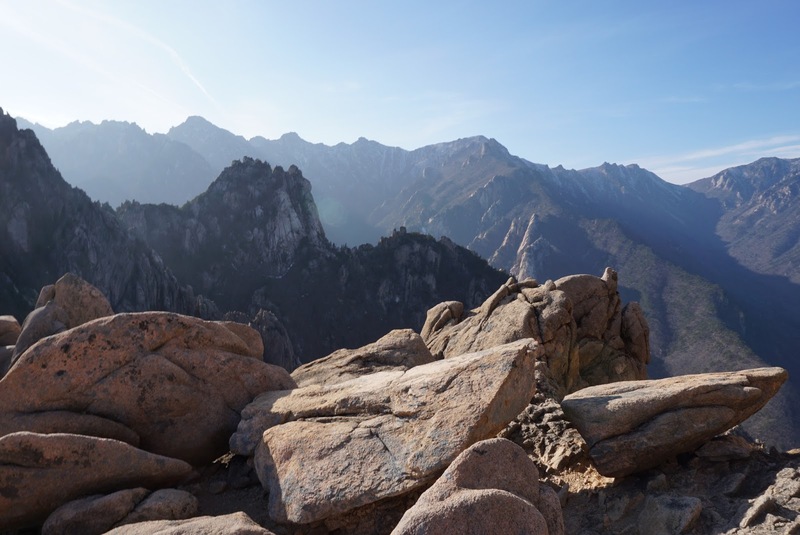 There are no paths but a bunch of rocks sitting on the slope perhaps for centuries. We stayed here for around 30 mins to relax and take in the view that is before us, a picnic would be wonderful, but we did not bring any food with us here. 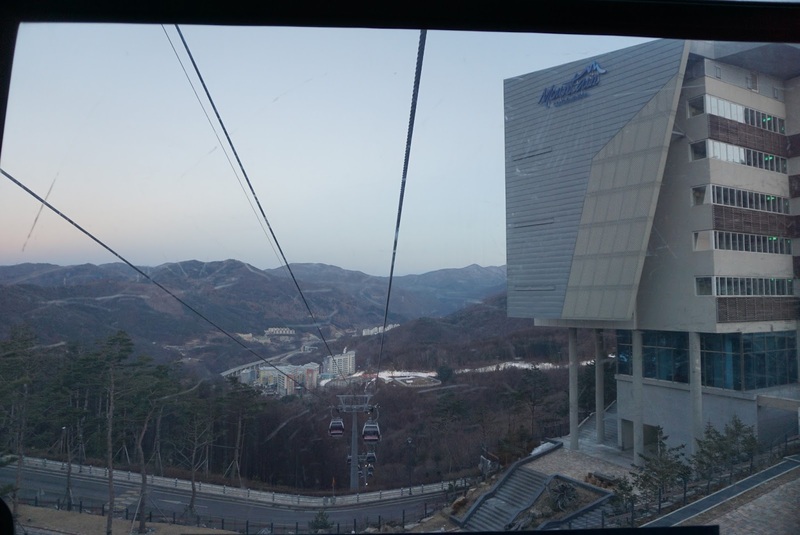 We headed back to the Cable car station for our ride down to Seorak-dong. Before that we stopped by the viewpoint to take more pictures. 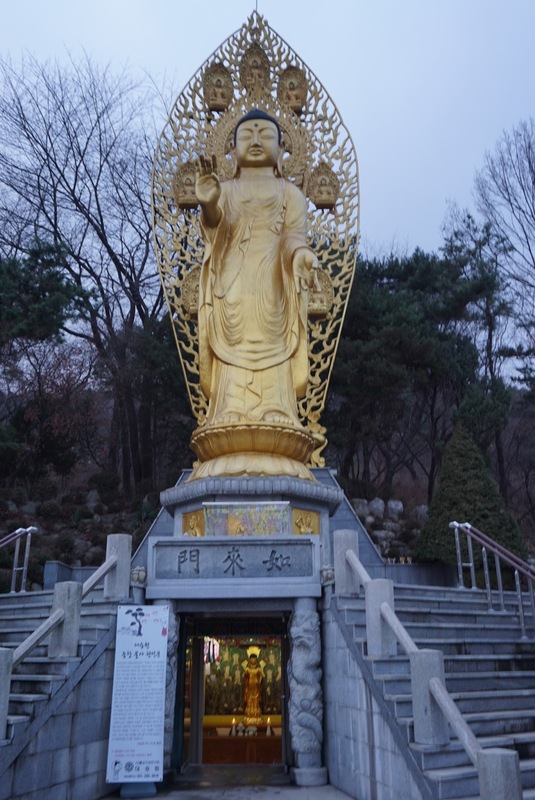 Arriving at the base cable car station, we headed to the other landmark within Seorak-dong – Sinheungsa Temple. 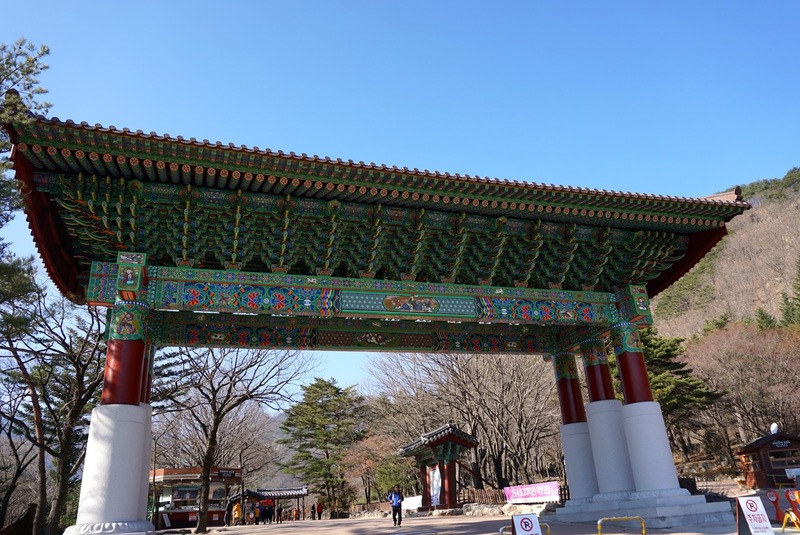 Passing a Korean-styled archway that reads Mt. 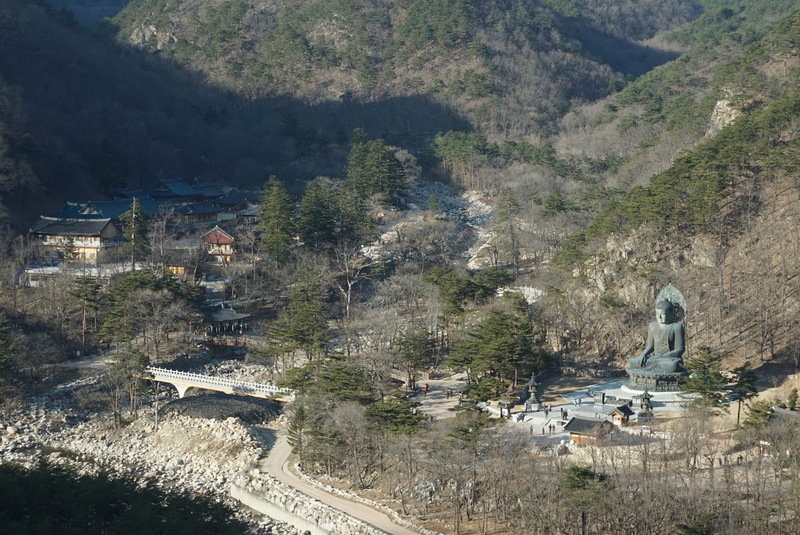 Seorak Sinheungsa Temple (it is written in Mandarin rather than Korean), a large bronze statue of Buddha is located to the right. 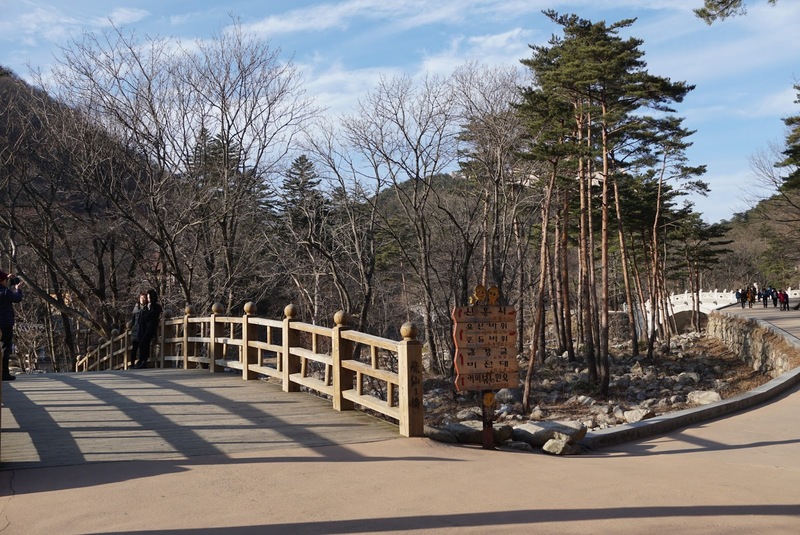 This is where most people would stop over and pray to Buddha before heading further in towards the temple grounds. 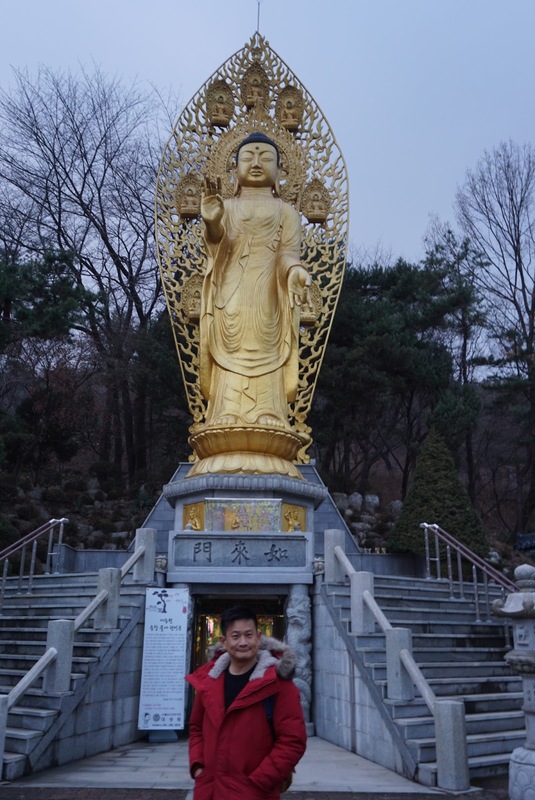 It takes 3 mins walk from the Buddha statue to the front door of the temple. 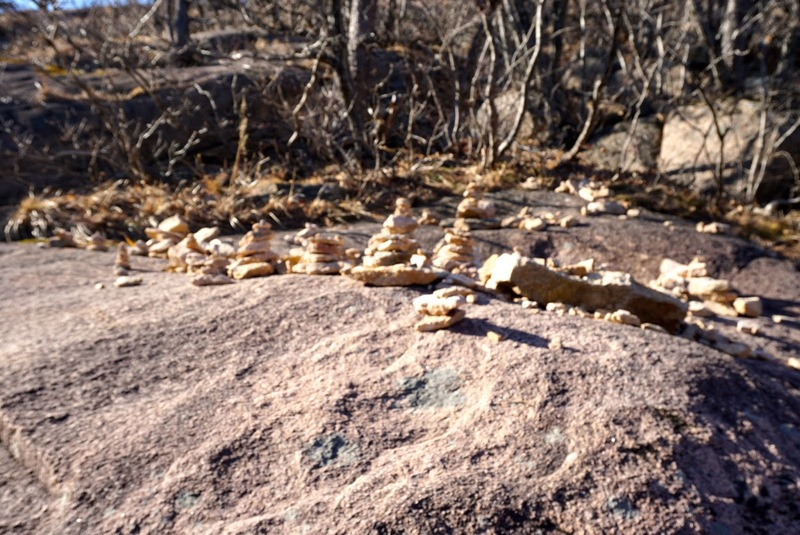 Along the way, on the side of the walkway, there are pebbles stacked on top of each other, made by those who visited here. 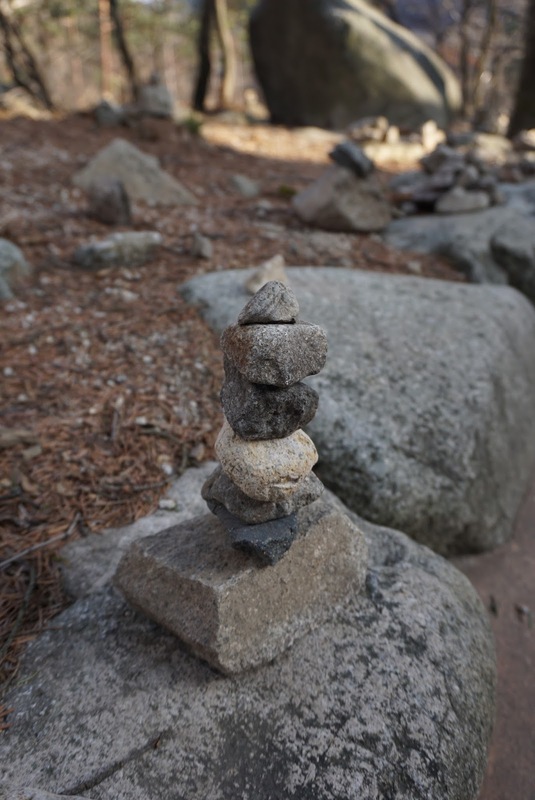 Local folklore believed that by stacking stones on top of each other without toppling, one would get their wishes granted. 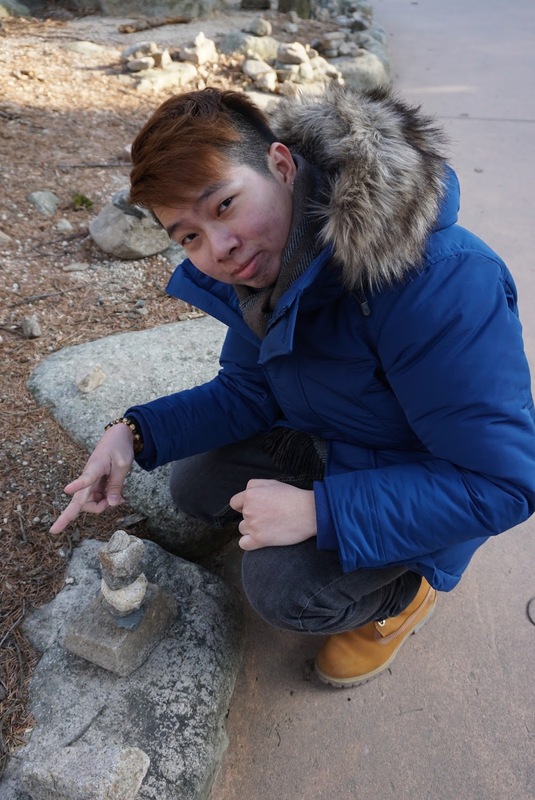 My friend successfully stacked 7 pebbles on top of each other. 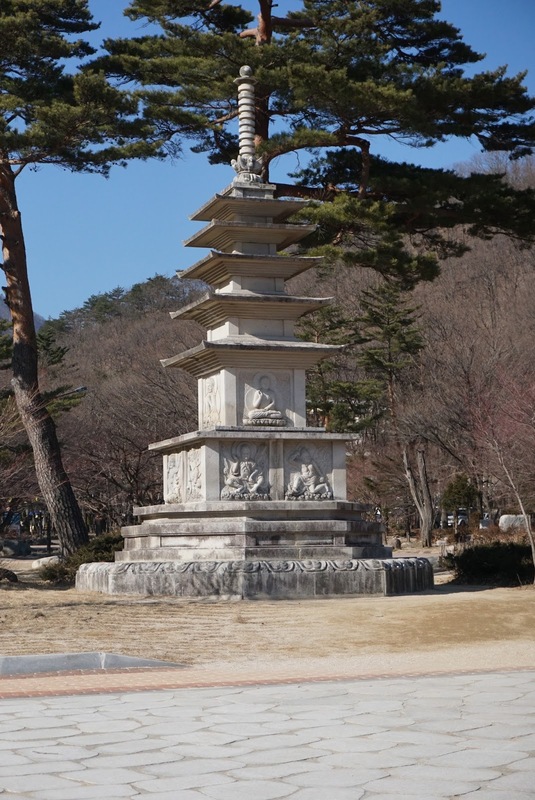 After pebble stacking, we headed to the entrance of the temple. 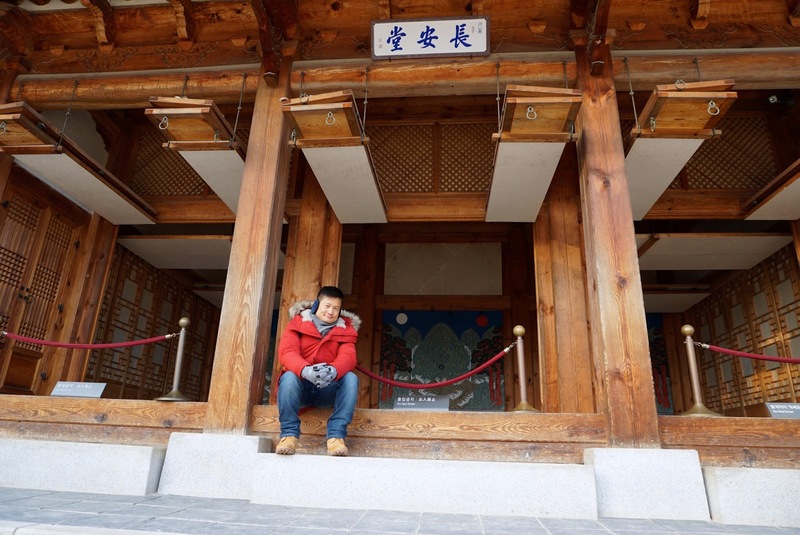 The wooden entrance to the temple looks like it has withstood the test of time. Like the wrinkles on an elderly person, the faded entrance still looked grand nonetheless. 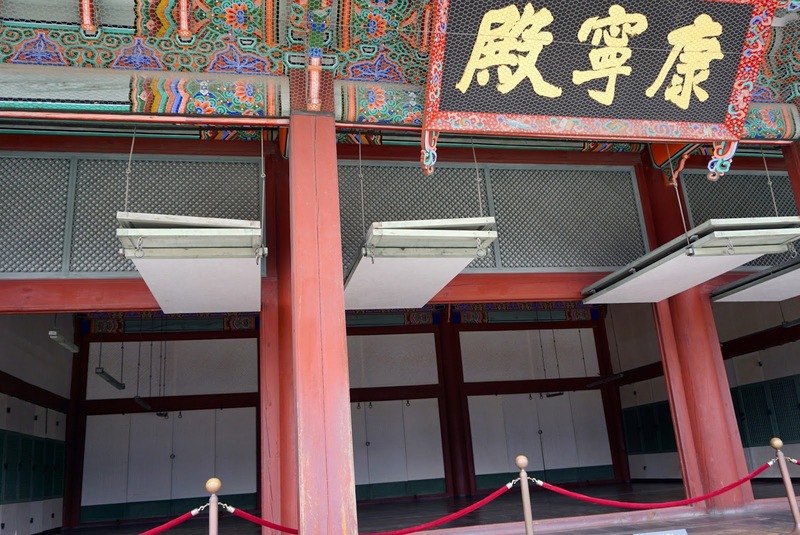 The entrance is essentially a building by itself, with 4 large statues of deities (2 on each side) guarding the entrance, these statues are meant to ward off evil spirits. 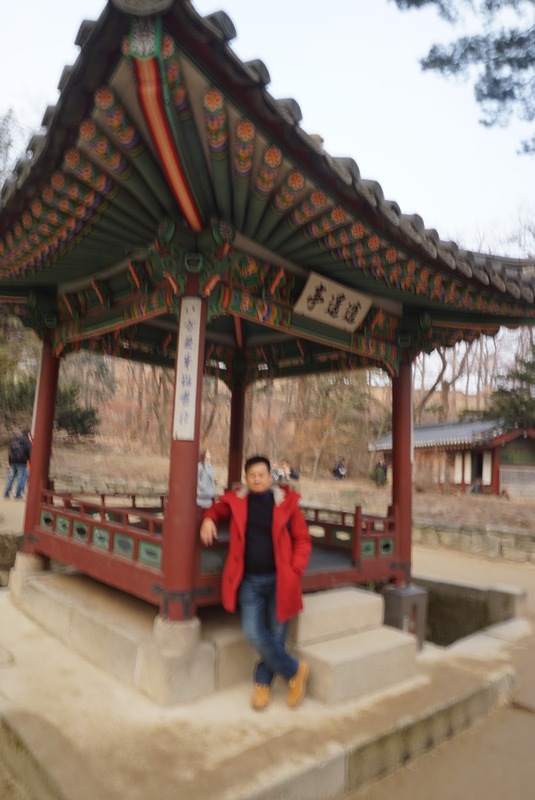 Passing through the main gate to the temple, a small raised pavilion attached to a building caught our eyes situated at the other end of the small courtyard. 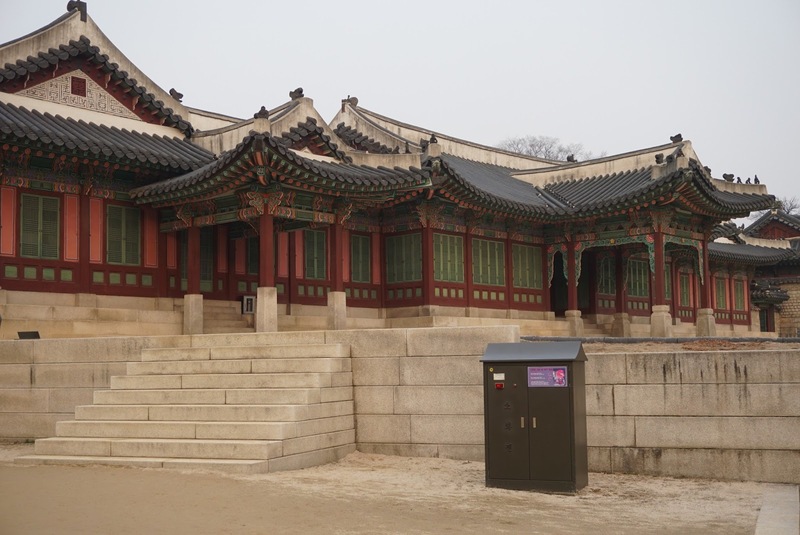 The pavilion looked elaborate and seem to have similar architectural style as those we have seen in Biwon at Changdeokgung the previous day. 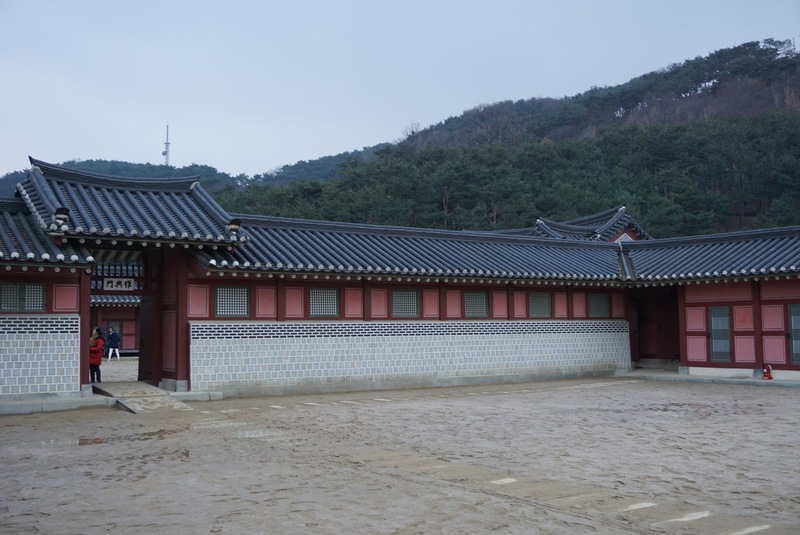 There is another section with a larger courtyard to the left after passing through the main gates to Sinheungsa Temple, however there seem to be some preservation works ongoing, this other area was closed off to the public. Skirting around first building after passing through the gates of the temple, there is a second elevated courtyard. Right across the courtyard, facing the direction of the main gate to the temple, is a building where a statue of the Buddha is housed in. 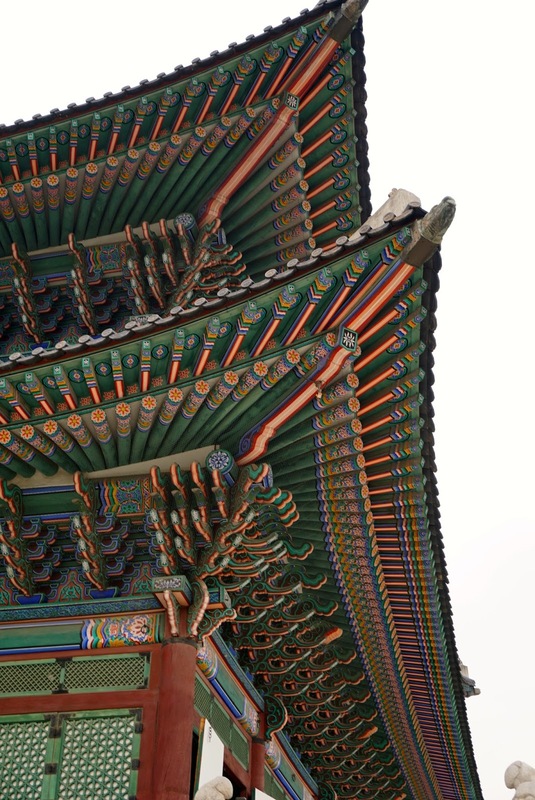 This building is painted in green with decorated under roofings. 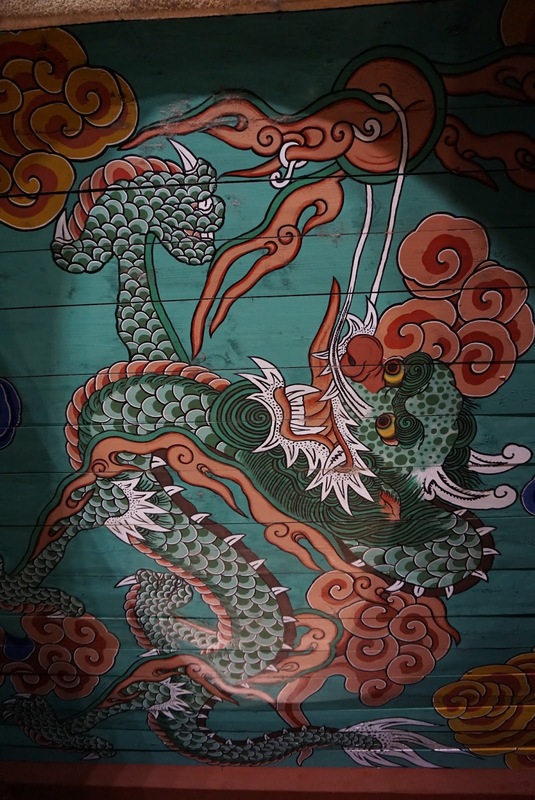 I spotted a couple of lion-looking masks on the under roofing on each side of the door where one enters to offer their prayers to the Buddha. 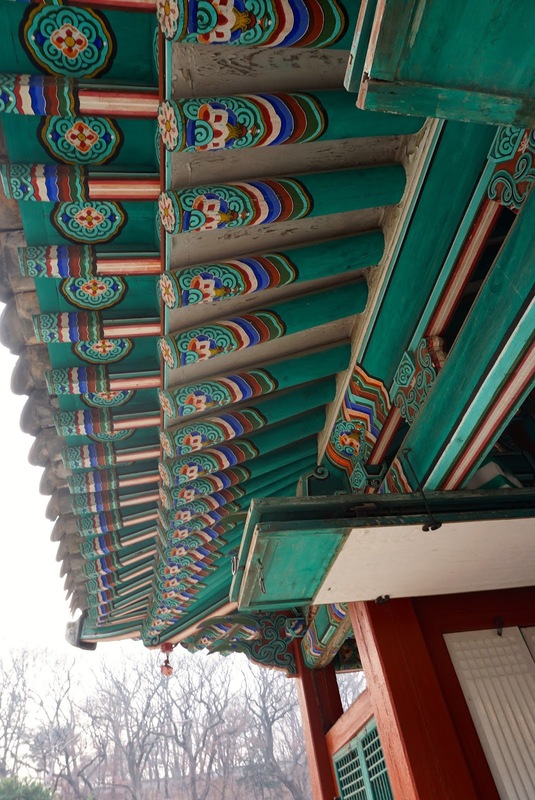 Next to this building is a smaller building, similarly decked out in green but less elaborately coloured. 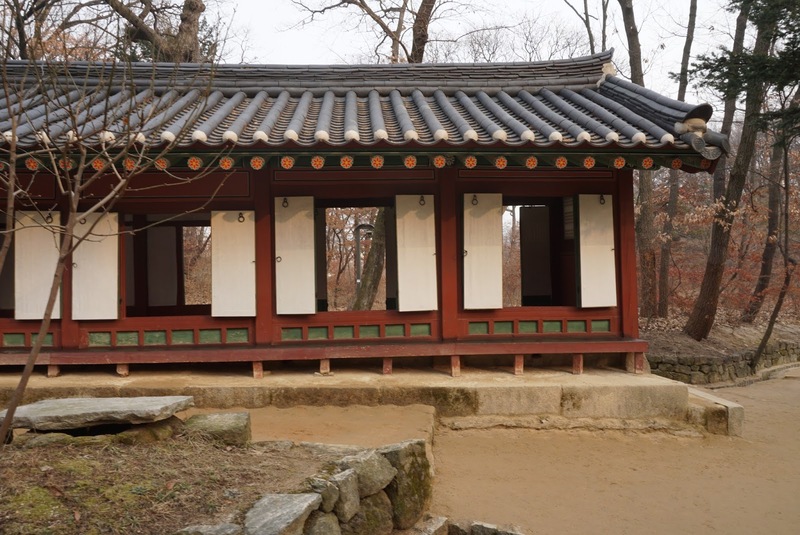 This building is contains the tablets of the ancestors of the local people. 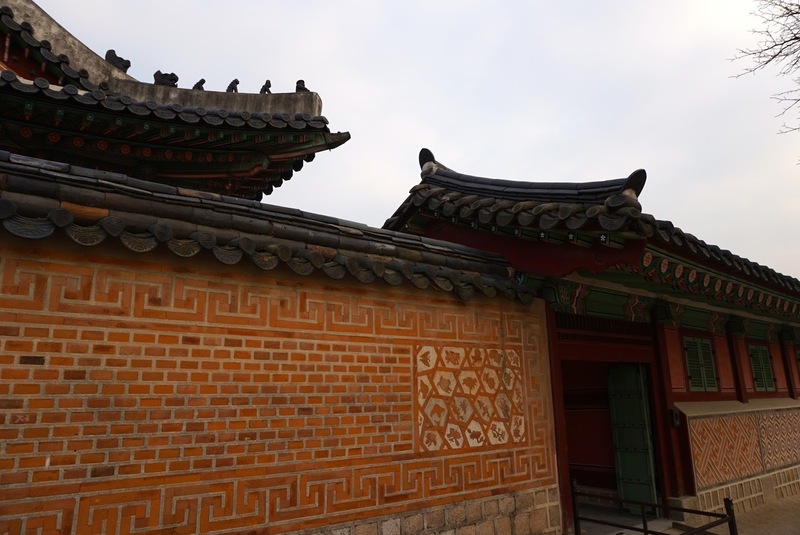 There are several yellow coloured buildings built on the side of the courtyard. 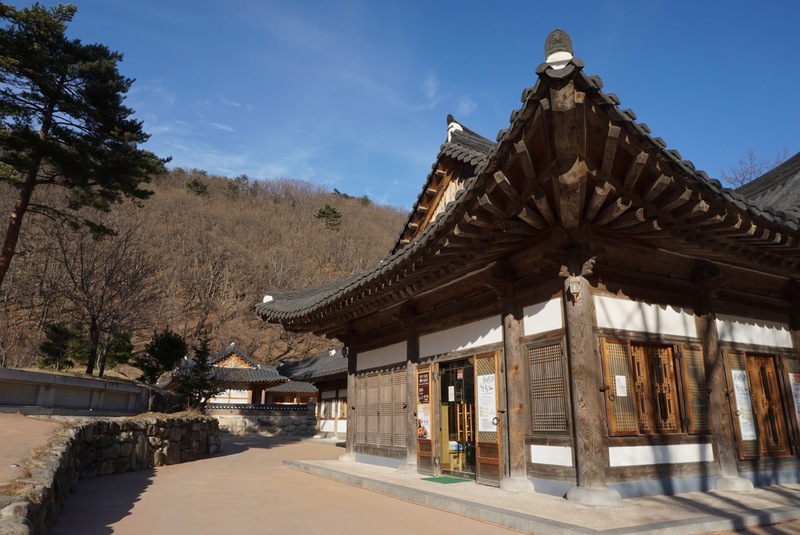 Perhaps due to the time we visited Sinheungsa Temple, when the crowds are thin, the temple appears to be very tranquil and peaceful. 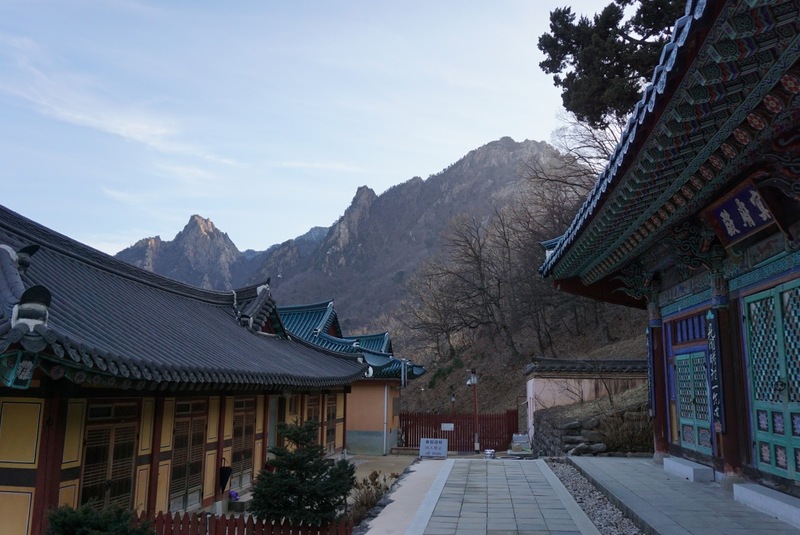 One can sit by the courtyard, breathing in the crisp fresh mountain air and forget all troubles. 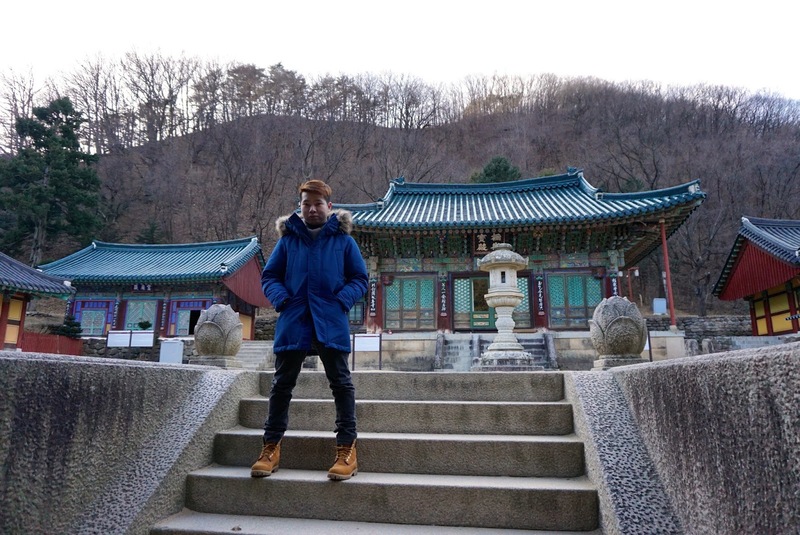 We headed out the temple tracing back the way we came from. 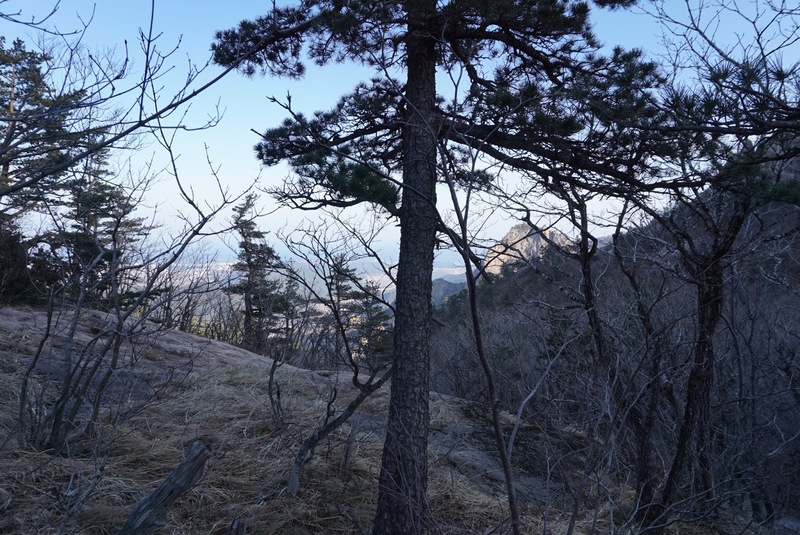 The whole Seorak-dong area screams of serenity. 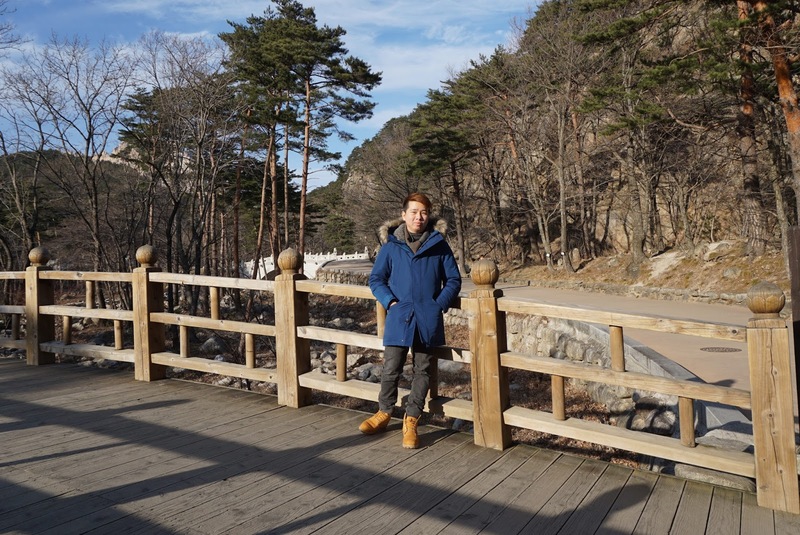 Passing through the bridge absorbing the wondrous view of the surrounding mountains, bathing in cold winter air is the reason why we visited Seroksan National Park. 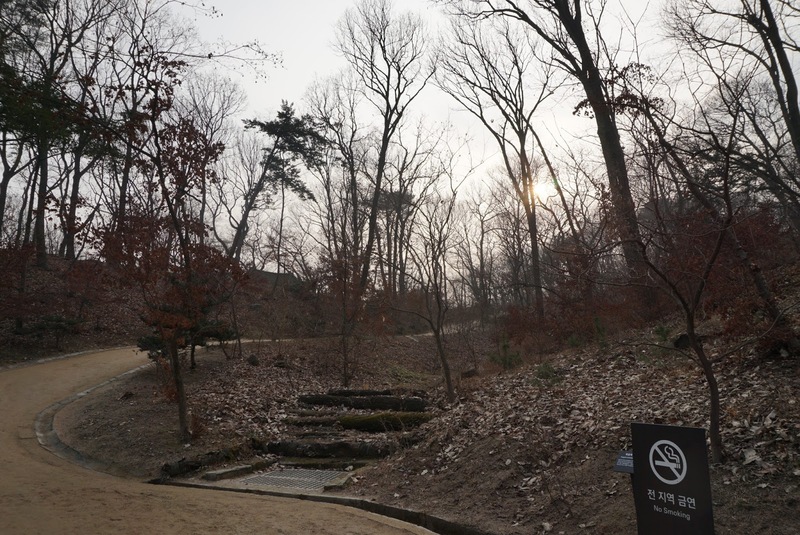 We reluctantly walked over to the main entrance of Seorak-dong. 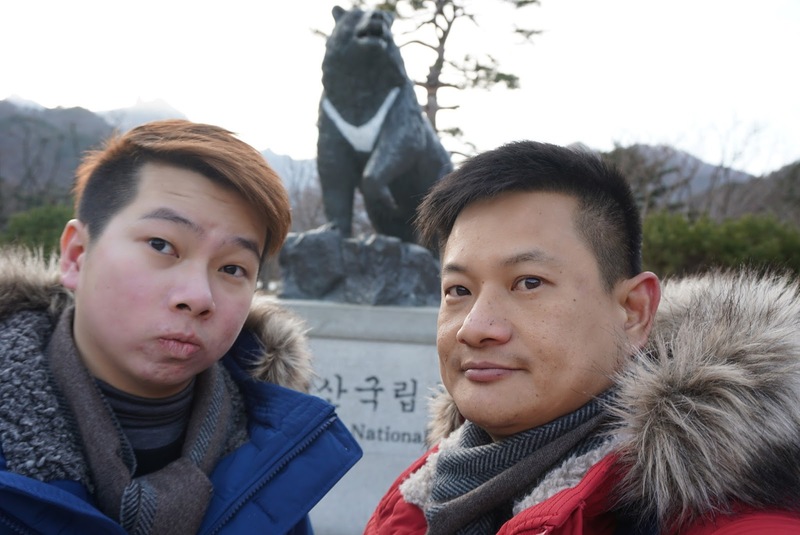 On the way we spotted the bear statue and took some pictures with the statue before heading back to the bus stop to wait for the bus that would take us back to Sokcho. 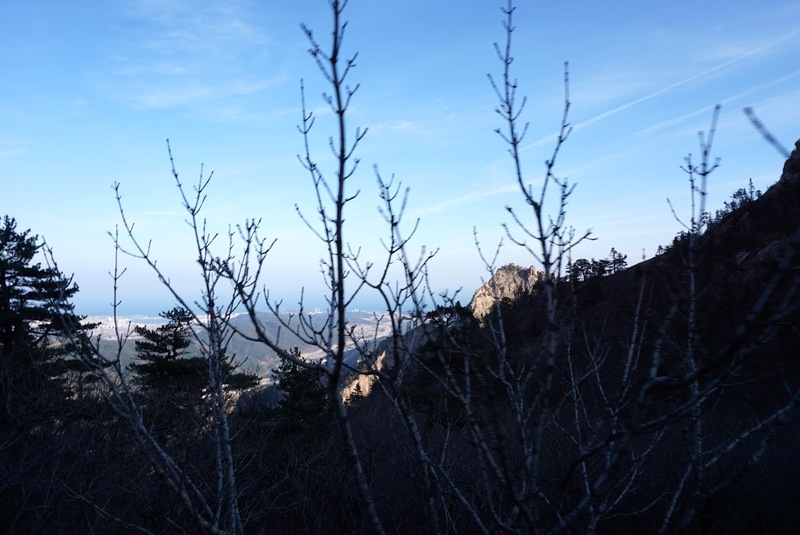 It did not take long for us to return to Sokcho. 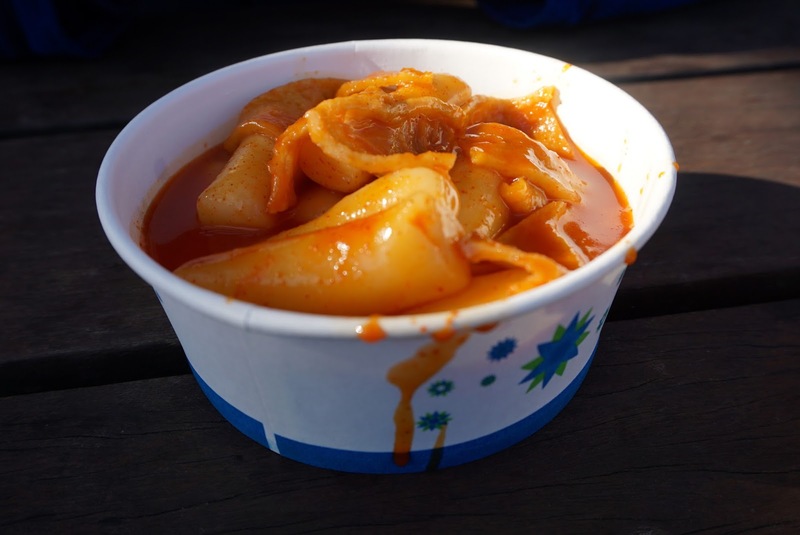 At this time our stomachs were gruelling, as we did not really had lunch. 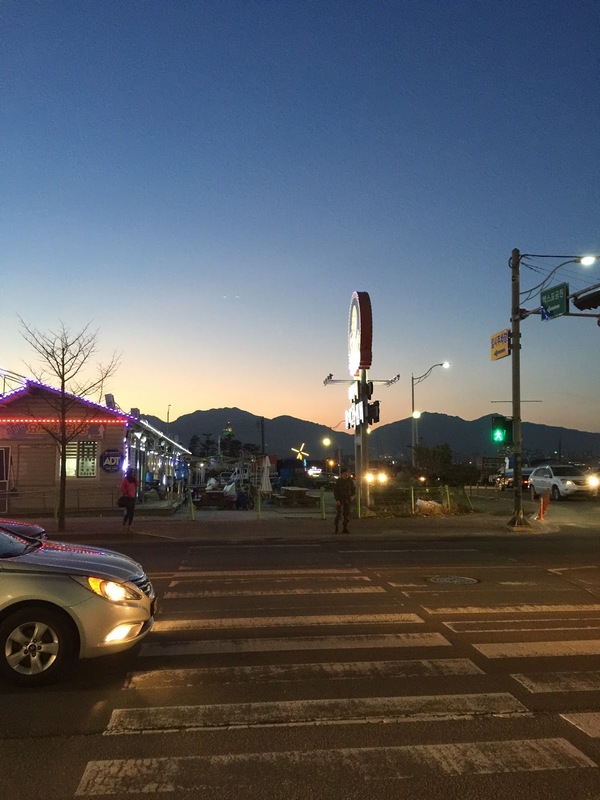 We wanted to have dinner at Sokcho before heading back to Seoul. 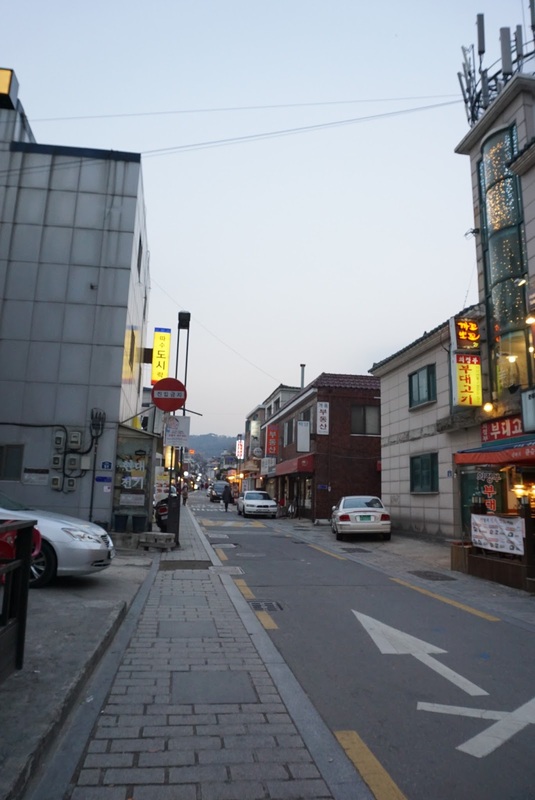 As we were walking along the streets near to the Express Bus Terminal, this part of the town looks sleepy. There are hardly any human traffic around. 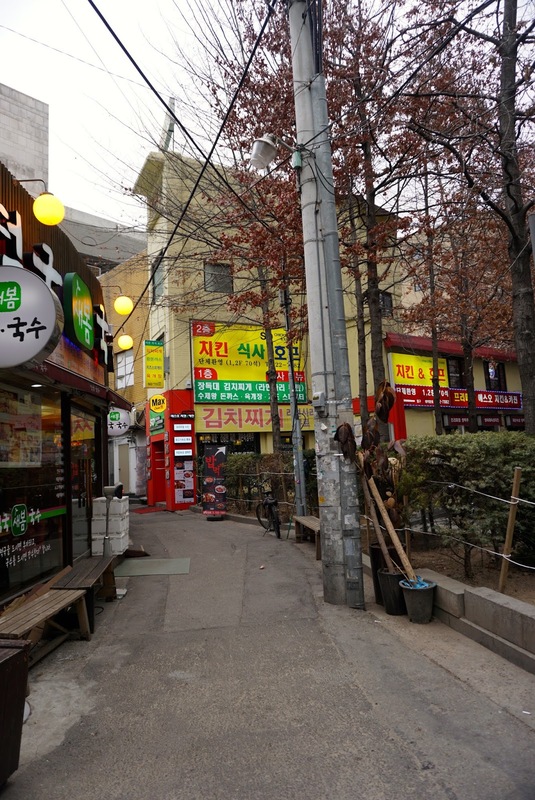 There are several restaurants that we walked past, however we are not too sure if they are open for business. 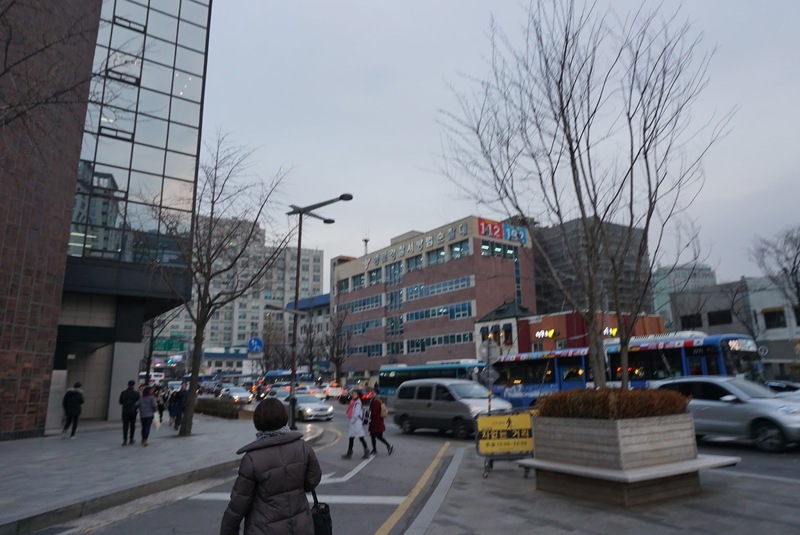 We ended up near the port area where there is a huge shopping mall and a fish market of some sort opposite. 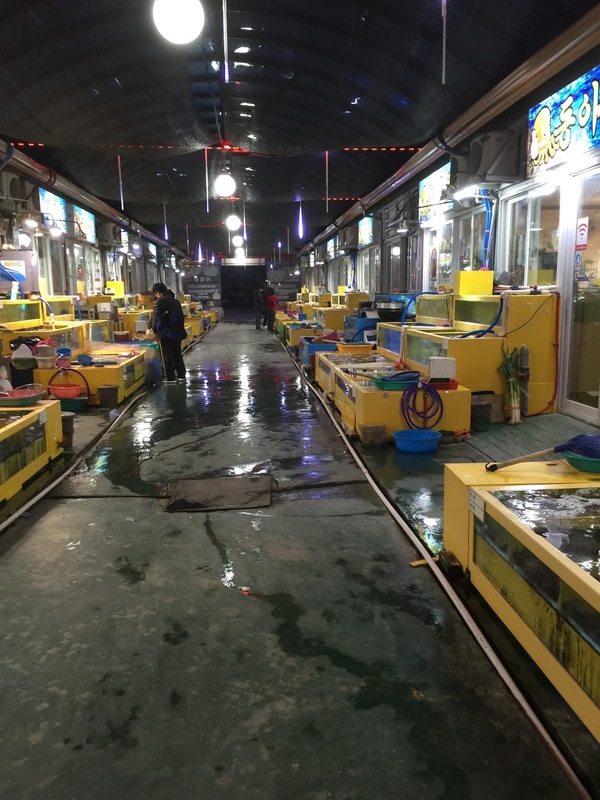 We headed towards the fish market and realised that we could get fresh seafood here, where the restaurants would cook the live seafood from the tank in front of the shop that customers chose. As we were not too sure if we could communicate with these restaurant owners, we gave this a miss and walked back towards the bus terminal. 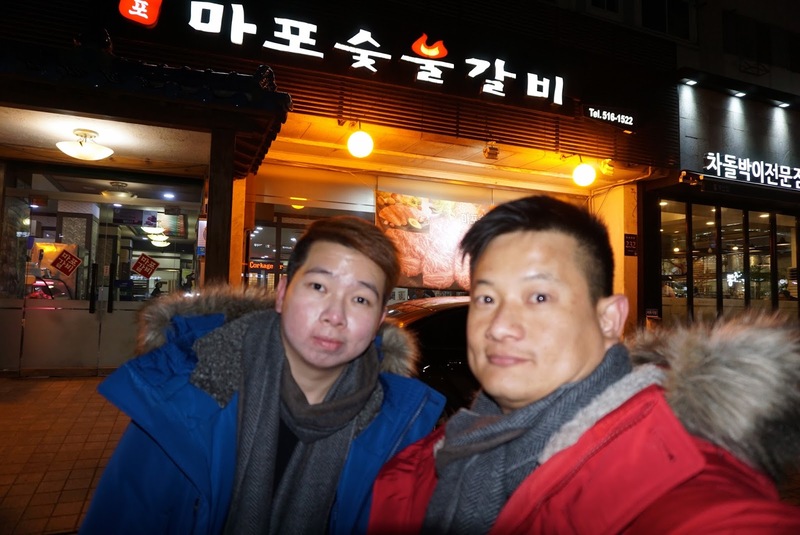 As we were walking back, we chanced upon a Korean BBQ restaurant and decided to have dinner there. 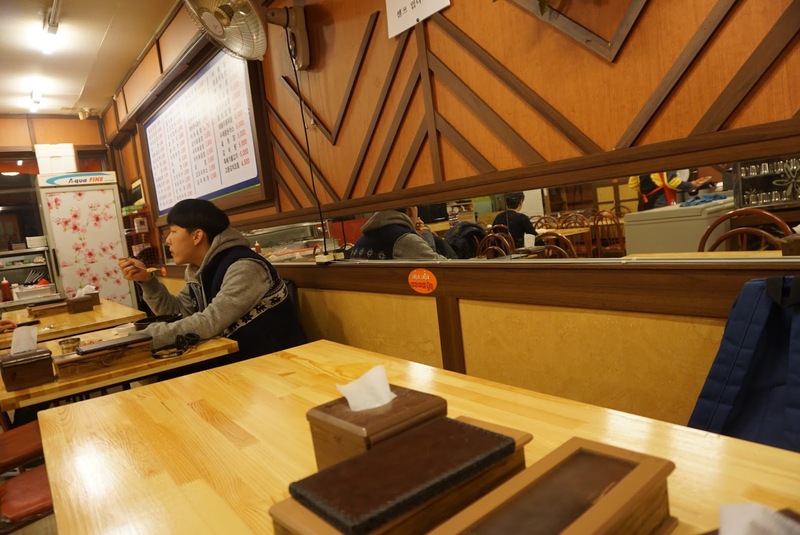 There were only one other table that was occupied by a local couple in this small family-owned restaurant. 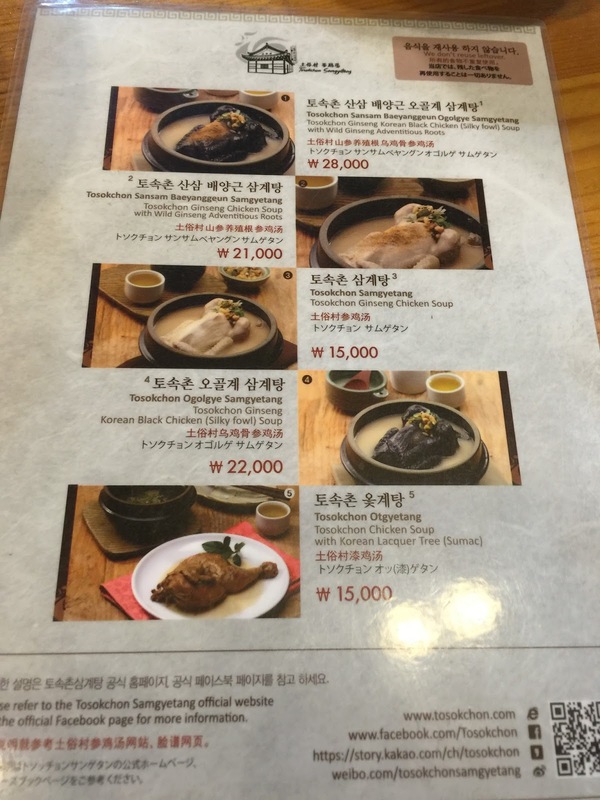 As we do not speak Korean (neither did the owner spoke any English), we were shown a menu with pictures on it. 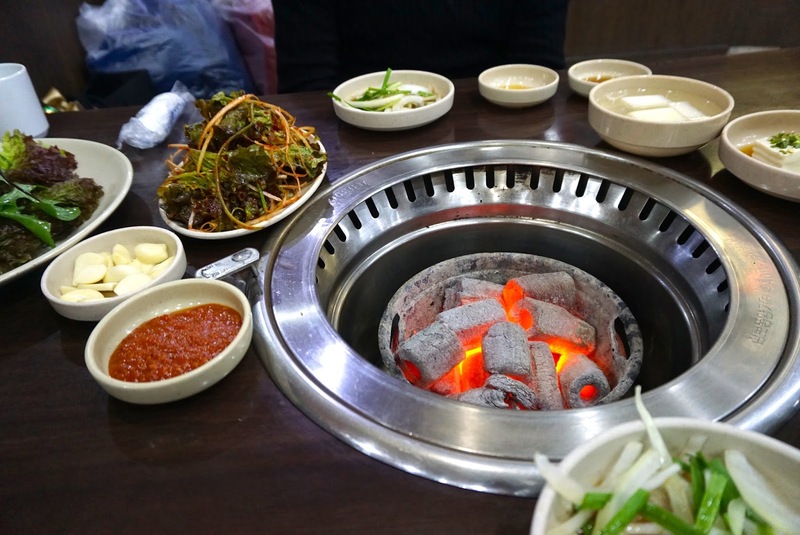 The owner was kind enough to help us BBQ the meat and topped up any side dishes that was empty. 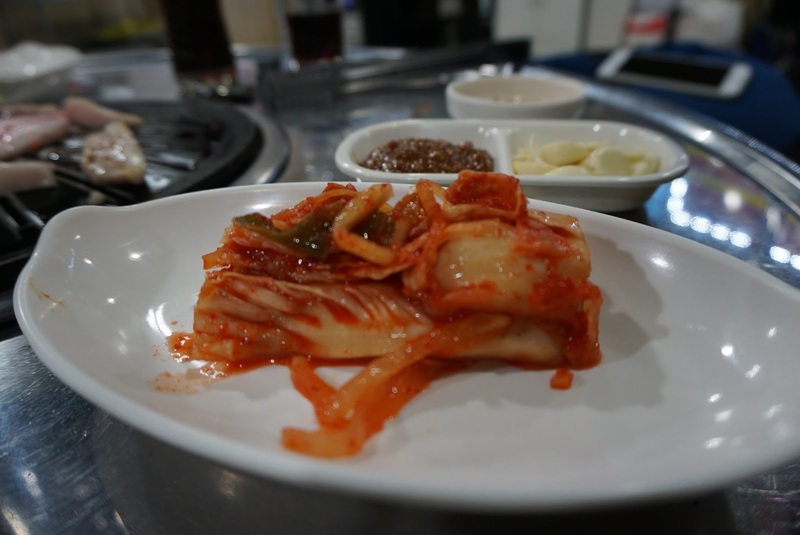 Compared to the BBQ dinner we had on our first night in Seoul, the food here pales quite a fair bit. 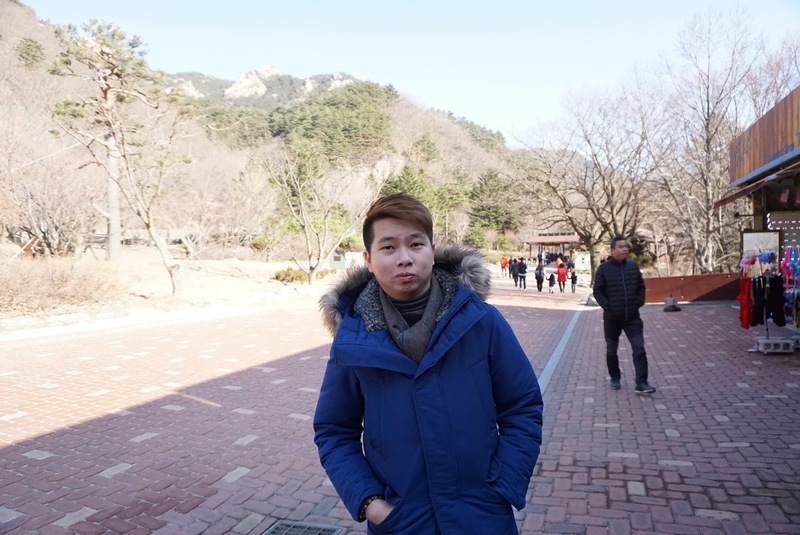 However it is sufficient to last us till we get back to Seoul. 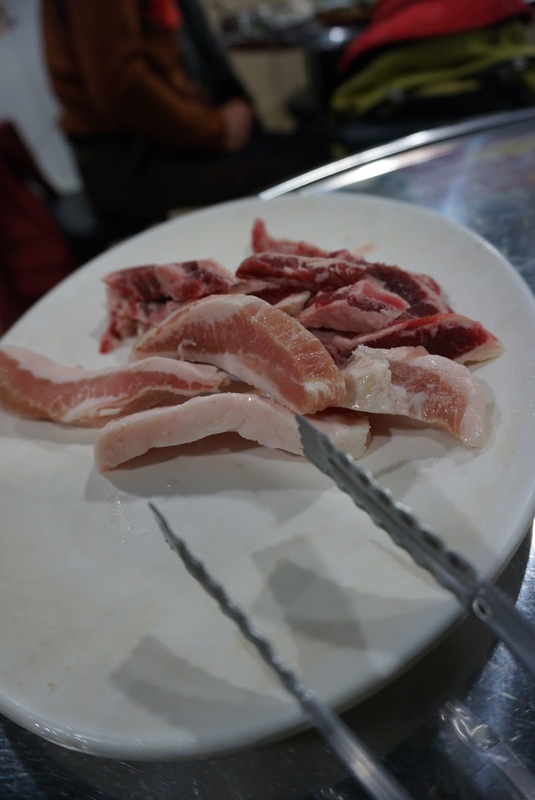 A point to note to those who do not eat beef, be careful when you order any non-beef products on the menu. We ordered pork ribs, which turned out to be beef. 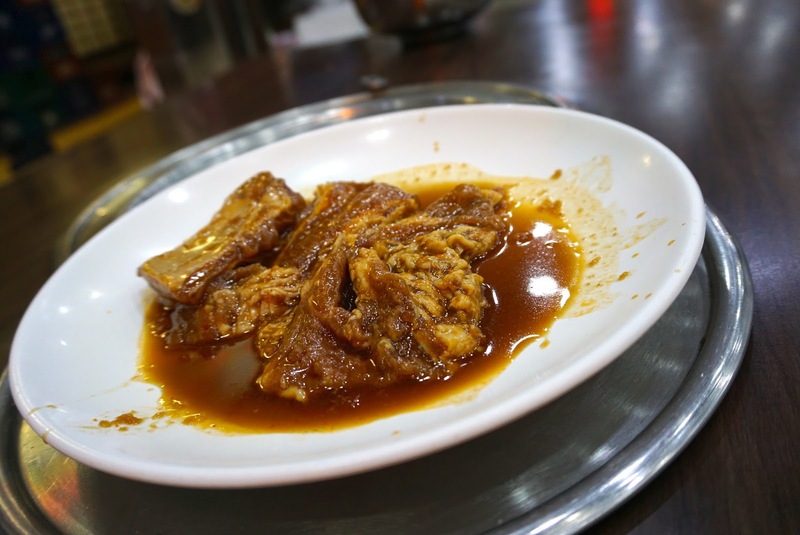 The menu stated as pork, however reading the Japanese translation, it mentioned beef. 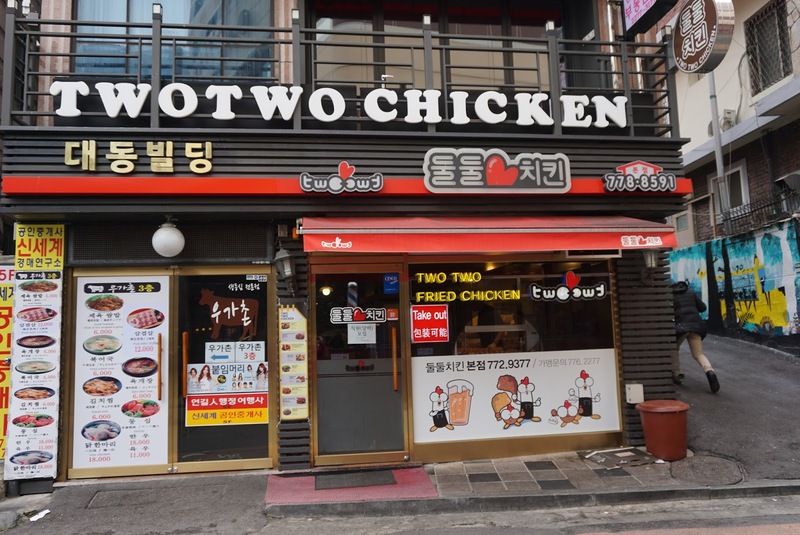 Initially I thought it was the translation in this particular restaurant, however I also seen the same thing subsequently in some restaurants in Seoul. Best to stay clear of such options if in doubt. 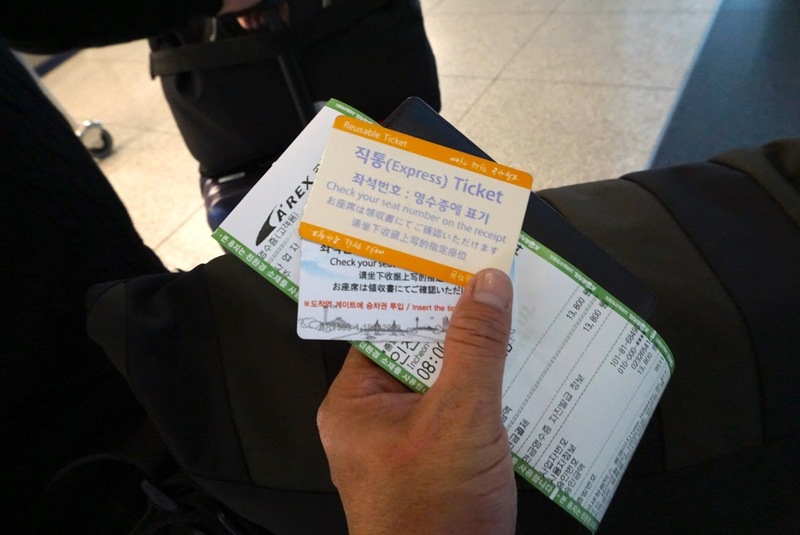 After dinner, we headed back to the bus terminal and got our tickets back to Seoul. 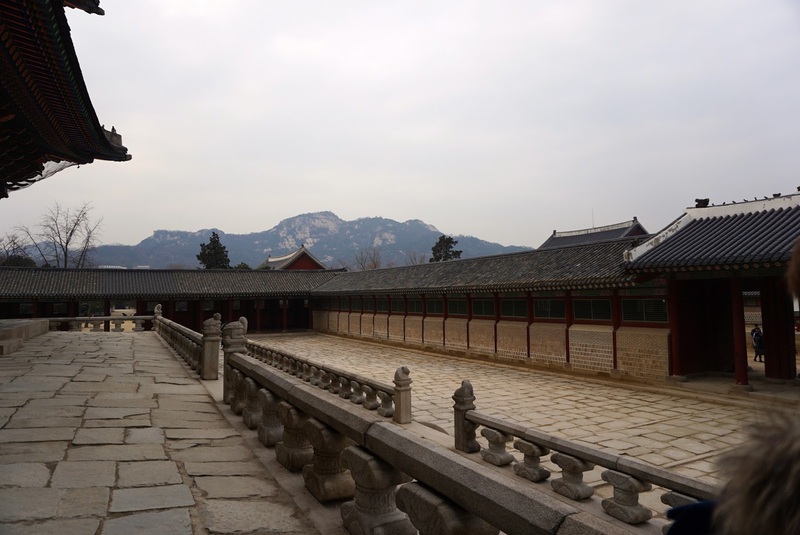 The original plan was to do both Gyeongbokgung and Changdeokgung in the same day with Bukchon Hanook Village slotted in between since the 2 palaces are nearby each other. 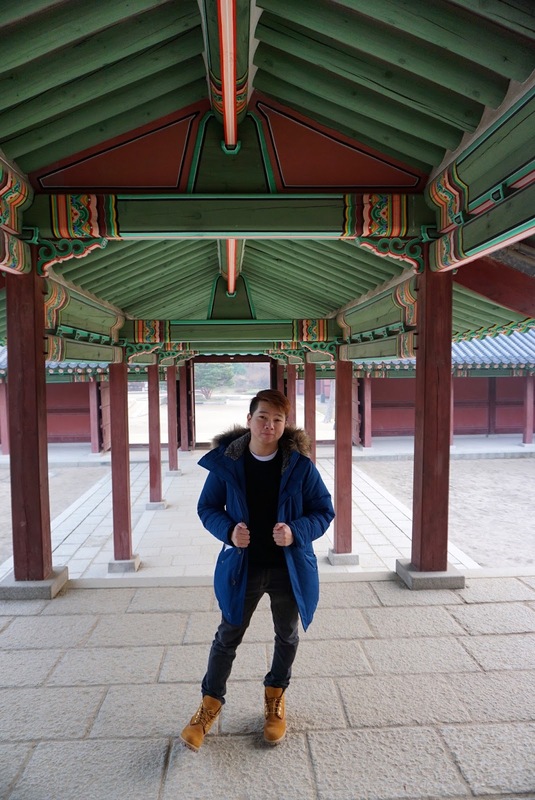 However this was not possible due to the amount of time that is needed to roam around each palaces, especially when we plan to visit the Biwon or the Secret Garden in Changdeokgung. Coupled with the fact that we woke up later than we should (well we are on vacation after all, the beauty of free and easy trips is time is up to us to plan and adjust). 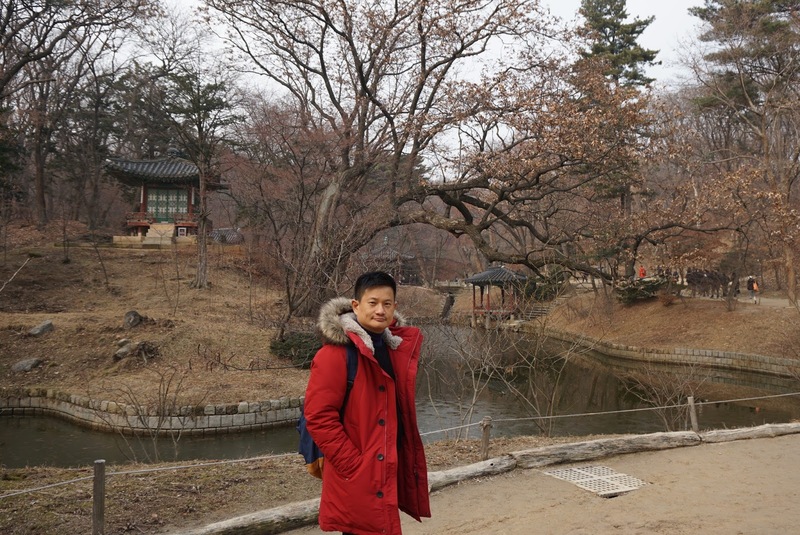 Getting to Changdeokgung is a breeze thanks to the convenience the Korean Subway System brings. 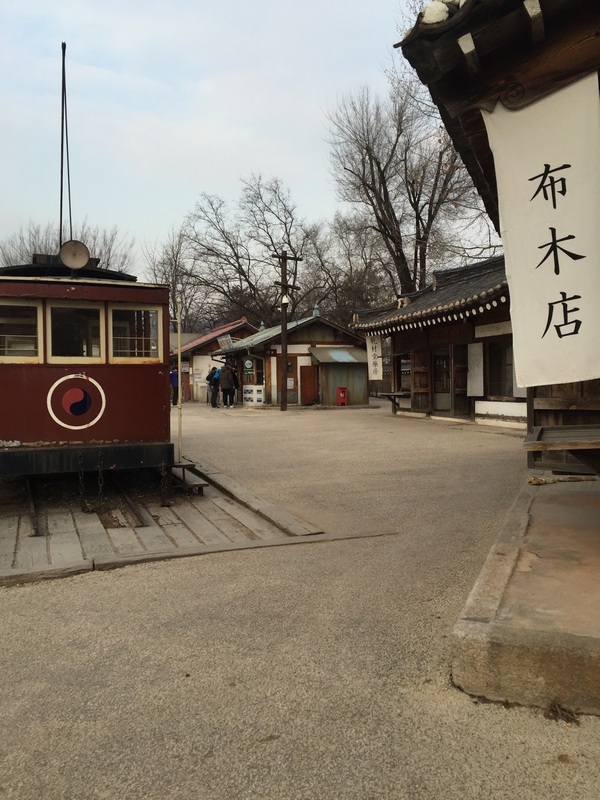 To get to Changdeokgung, one would need to alight at Anguk Station. 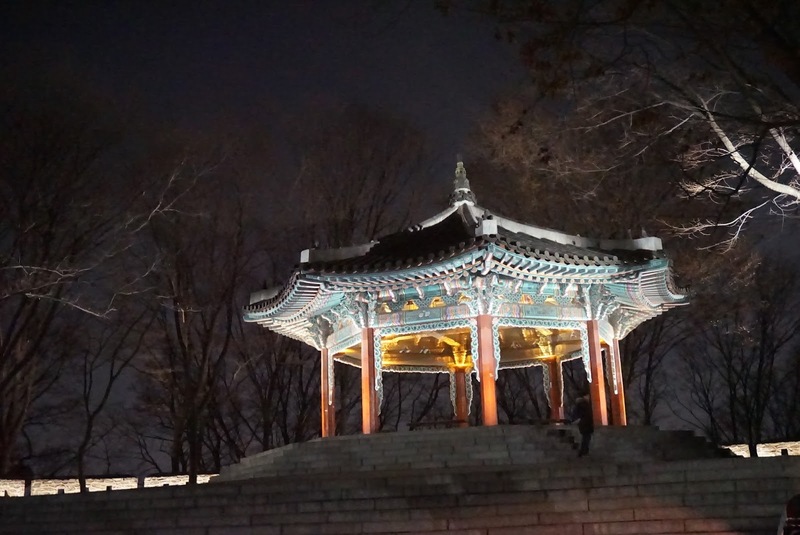 Take Exit 3 and Changdeokgung is a mere 5 mins walk from the exit. 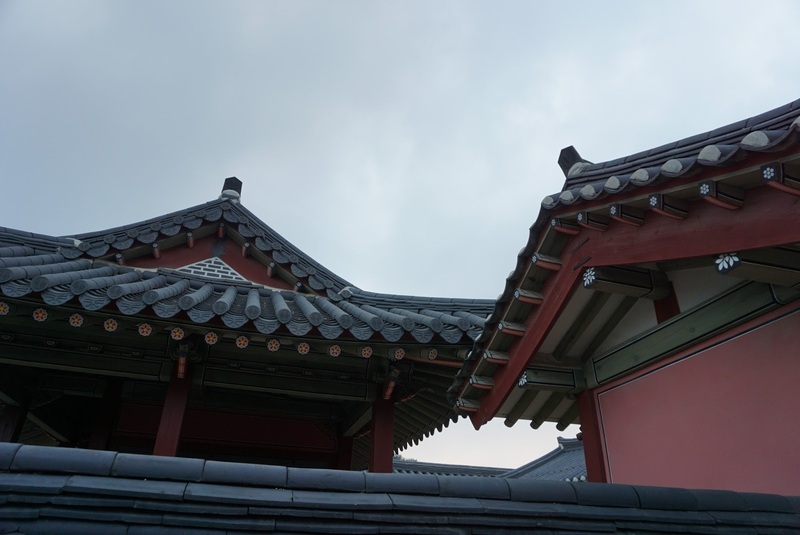 There are 5 palaces (namely Gyeongbukgung, Changdeokgung, Changyeonggung, Deoksugung and Gyeonghuigung) spreading around in Seoul. 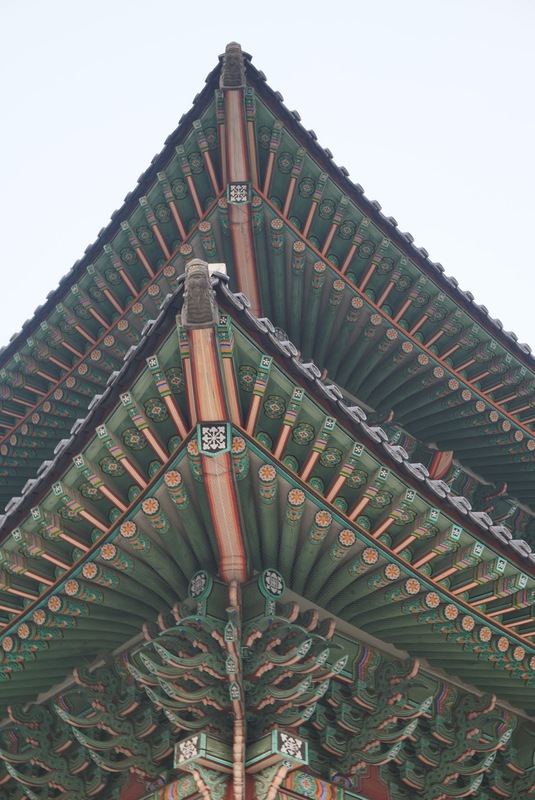 Changdeokgung, built in 1405, served as a secondary palace to Gyeongbukgung and was the first to be rebuilt when all the palaces in Seoul was destroyed during the Japanese invasion of 1592. 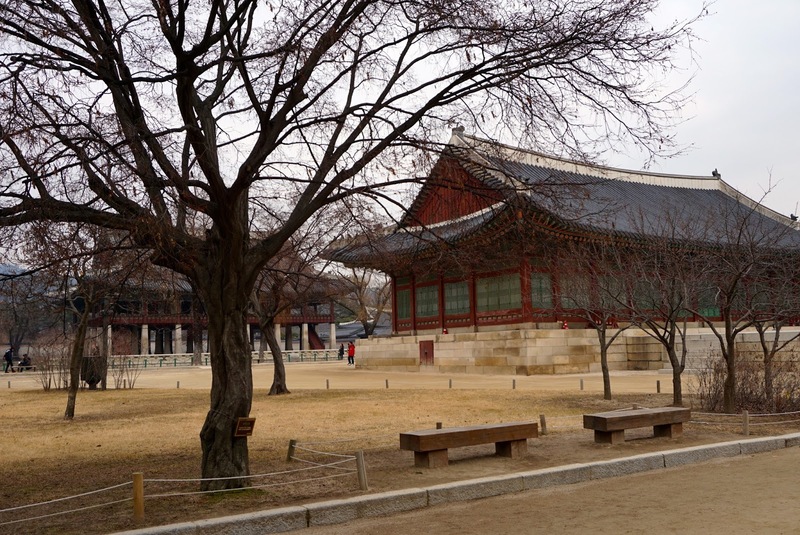 Since Changdeokgung was the primary palace where the King and his ministers decided state affairs for about 270 years. 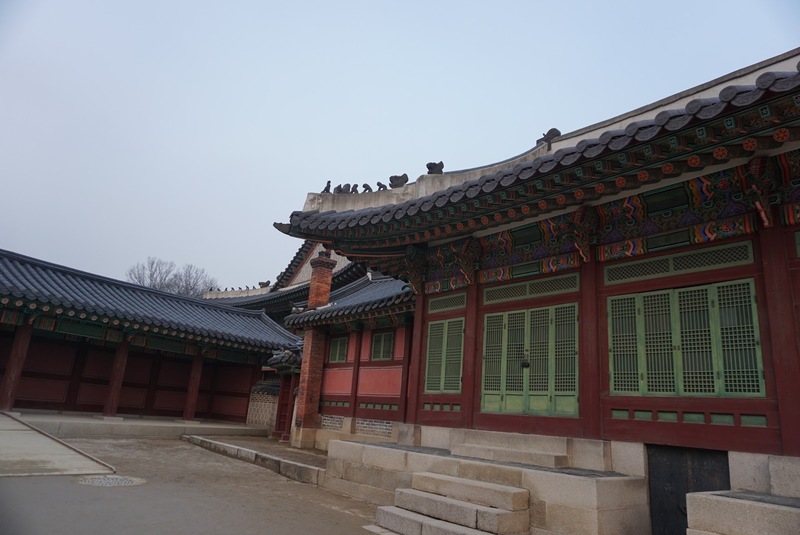 Biwon is the very reason why we visited Changdeokgung, covering about 2/3 of the entire palace grounds. 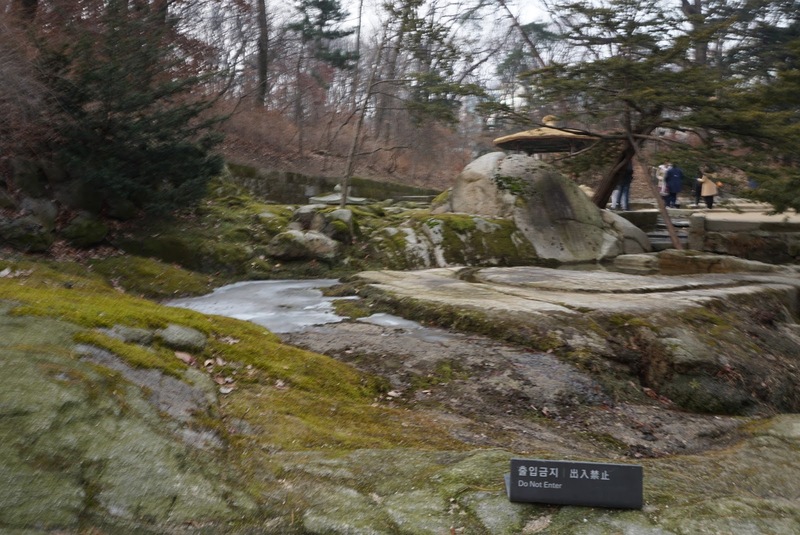 There are limited number of visitors allowed on a daily basis into this Secret Garden. 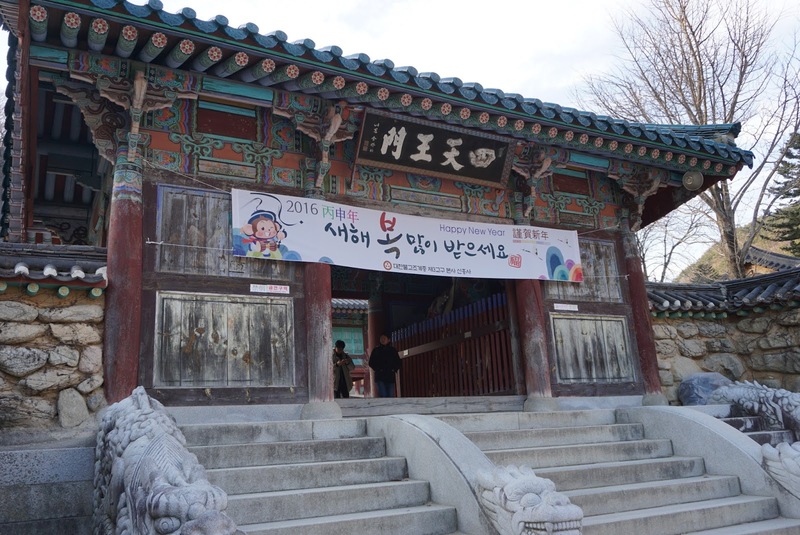 When we arrived at Changdeokgung, we realised that the last English tour for Biwon is about to start. 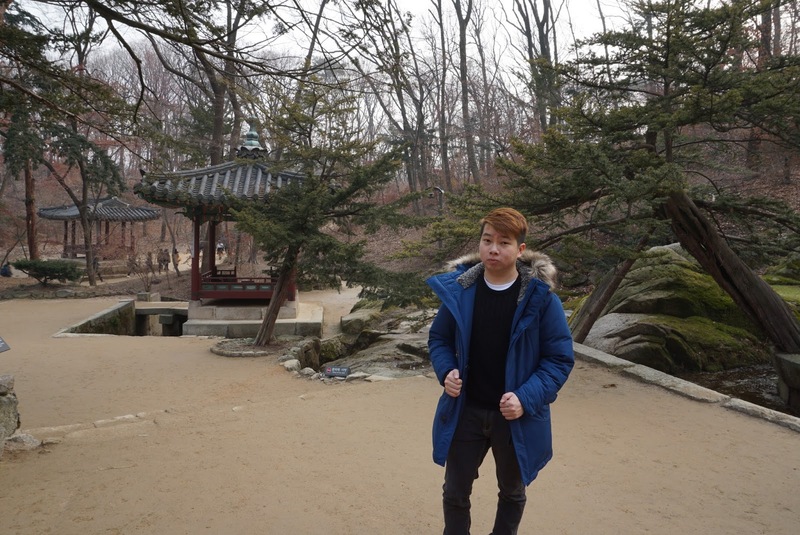 Hence we decided to do the Biwon first and allocate the rest of the time to roam around Changdeokgung. 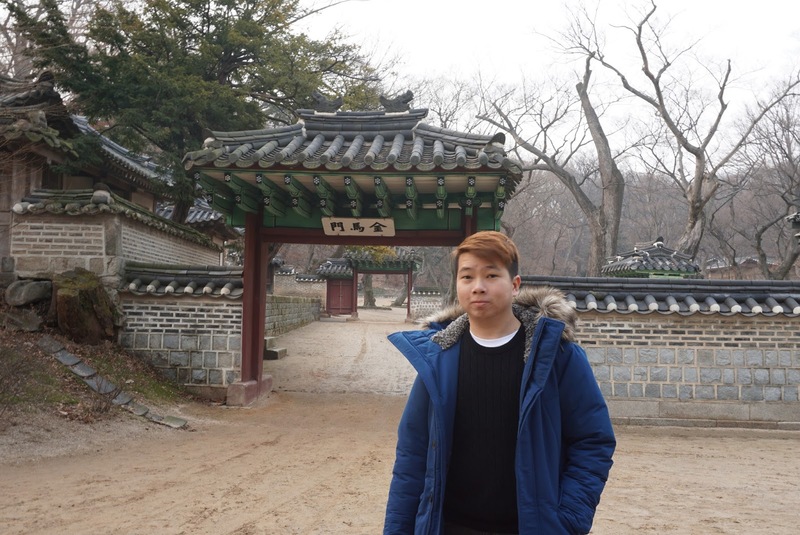 We quickly got the tickets to Biwon Tour and Changdeokgung. 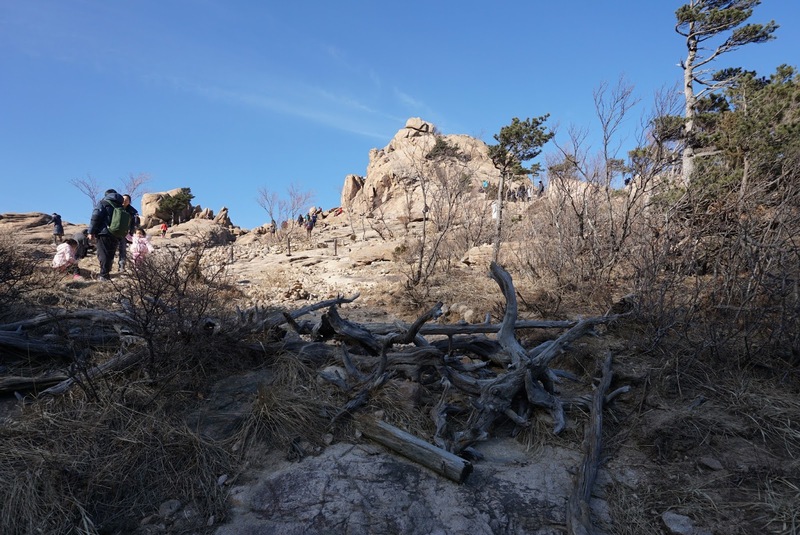 To access Biwon, one must join a guided tour, which has 3 runs daily for the English tours during Nov to Feb (and 4 English tour groups from Mar to Oct). 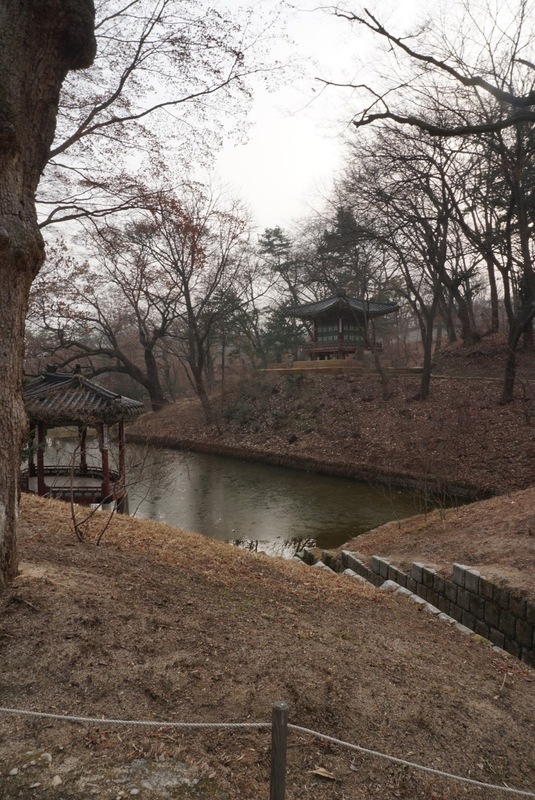 Biwon was known by several names, Huwon and Geunwon, but the name Biwon was officially known after King Kojong, the 26th King of the Joseon Dynasty and the first emperor of Korea, bestowed the name to the garden. 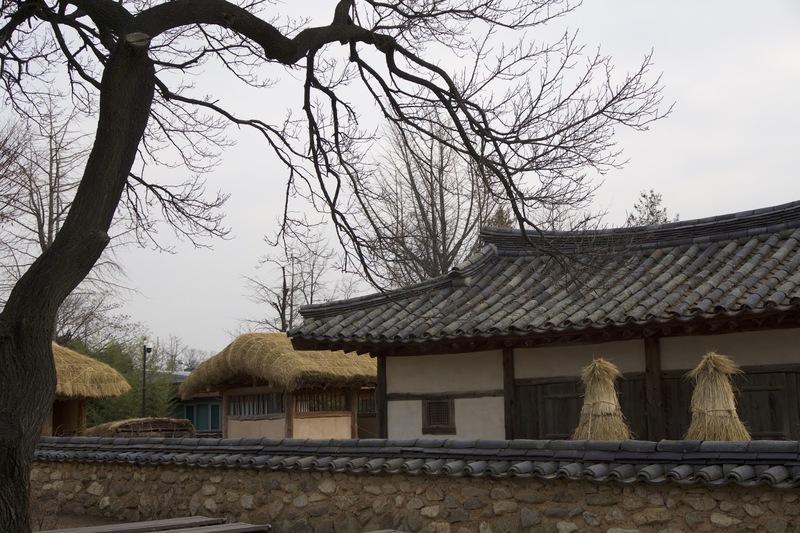 Biwon was constructed to serve as a leisure place for the Royal family and palace women for centuries. 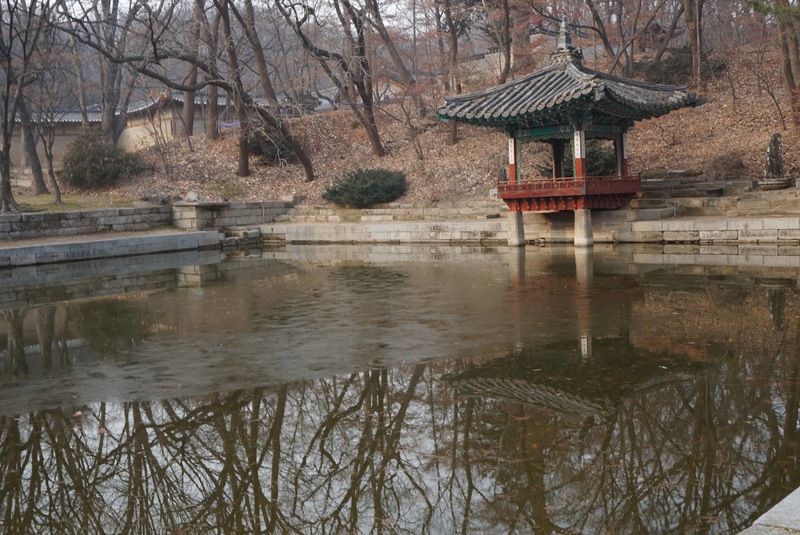 A rectangular pond – Buyongji Pond, greets visitors to Biwon and this is the first sight after walking for around 3 mins from the entrance to the garden. 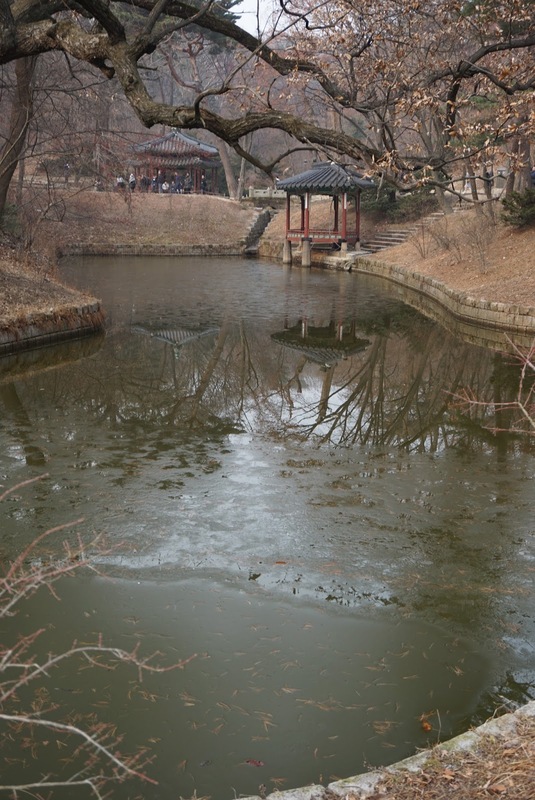 The pond was covered with a thin sheet of ice at the time of visit. 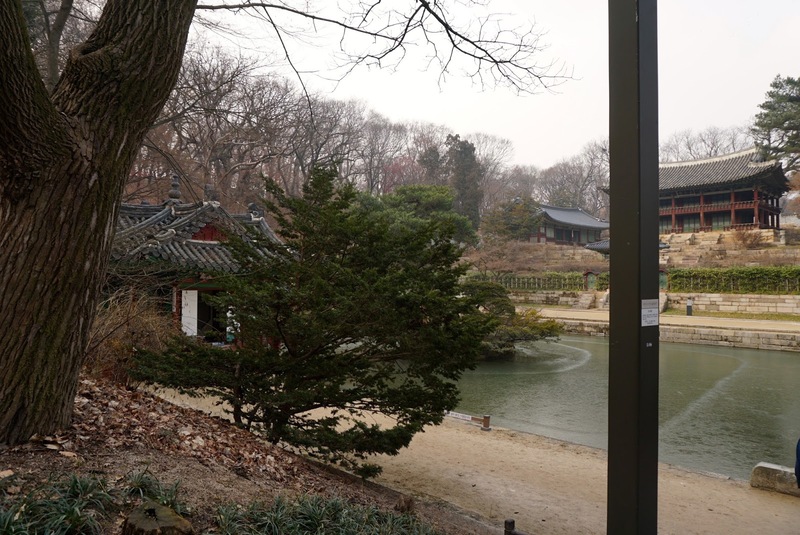 There are 3 buildings surrounding the pond. 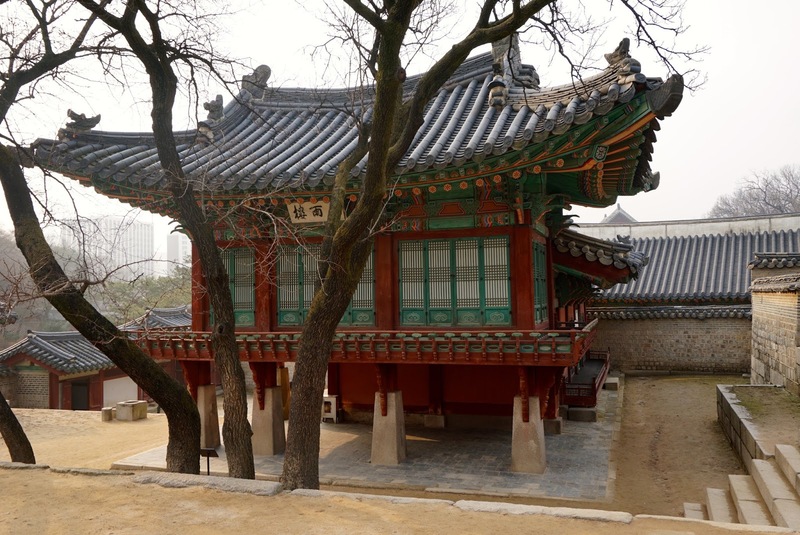 Nearer to the entrance to the garden is the Buyongjeong Pavilion, the only building with a criss-cross roof in the entire Biwon area. 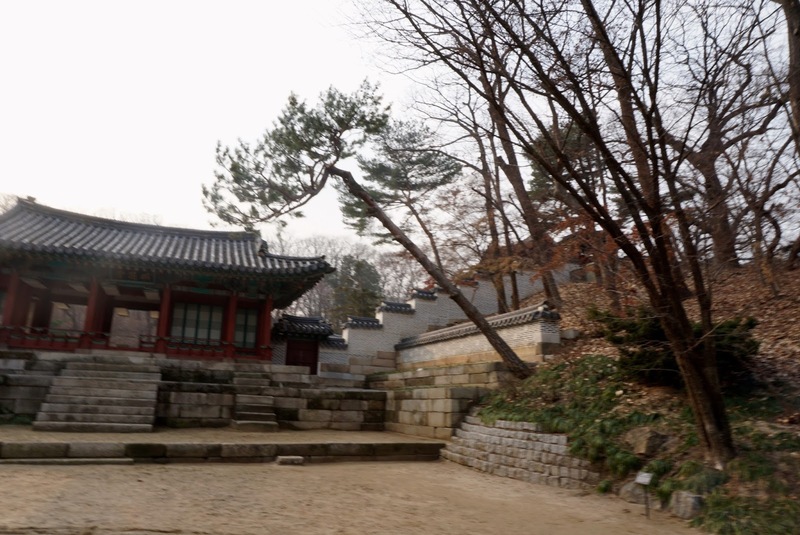 There is a building nested on a small slope opposite the pavilion, known as the Juhamnu Pavilion, this is the place where the scholars hired by the King used to study. 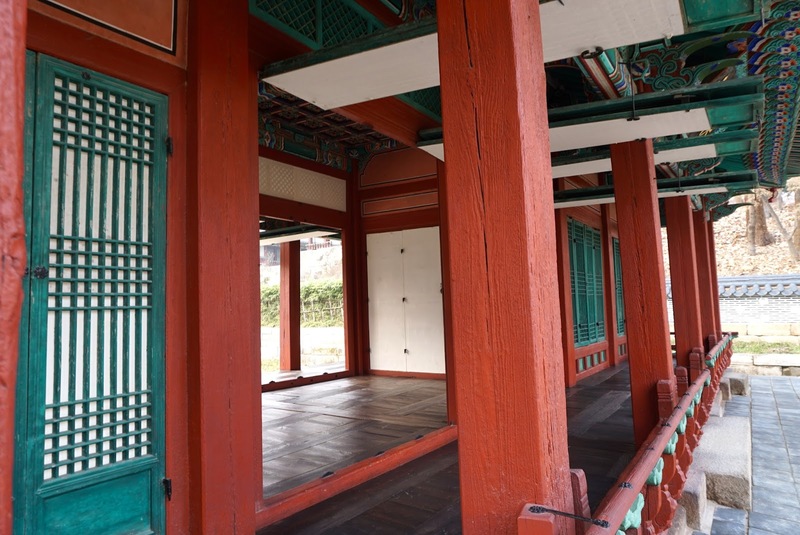 There is also a reading room for the King inside this 2-stoery building. It is a shame that this building was out of bounds to visitors these days. 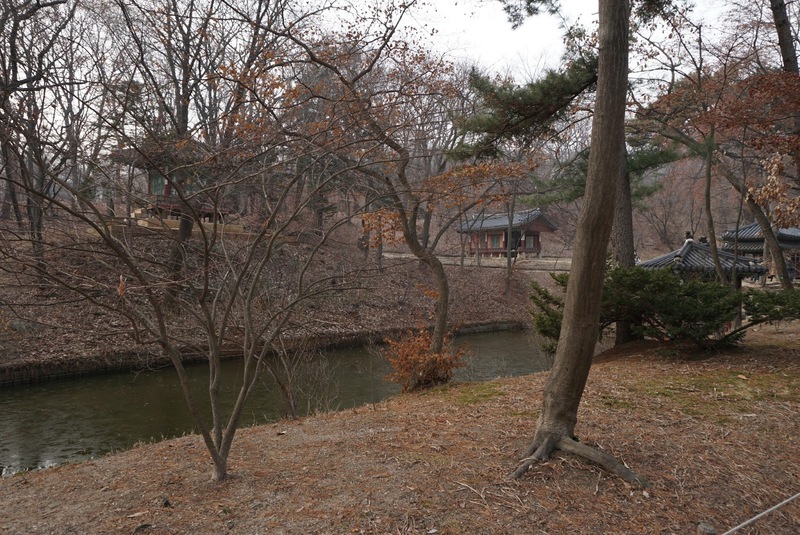 On the side of the pond, between Buyongjeong and Juhamnu Pavilions is a single storey red structure. 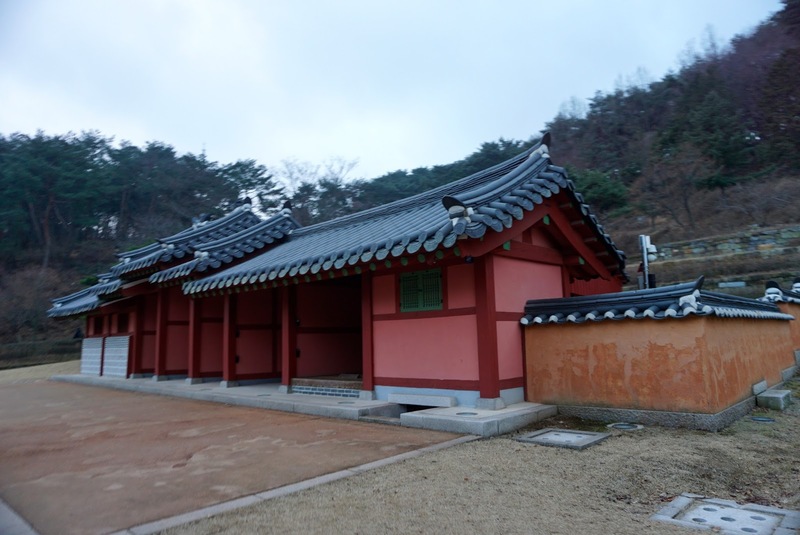 This structure used to be the examination hall for scholars taking the royal exam. 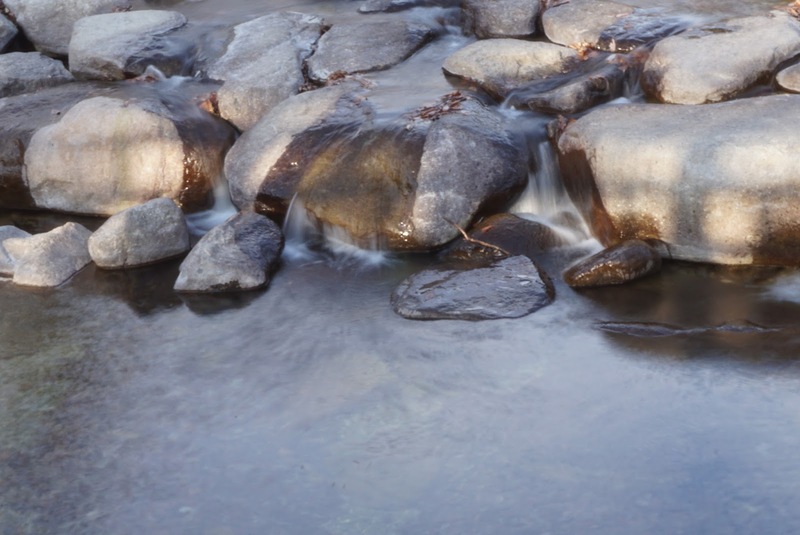 There is a certain peace and tranquil lurking around this area, and visiting this place is certainly therapeutic. 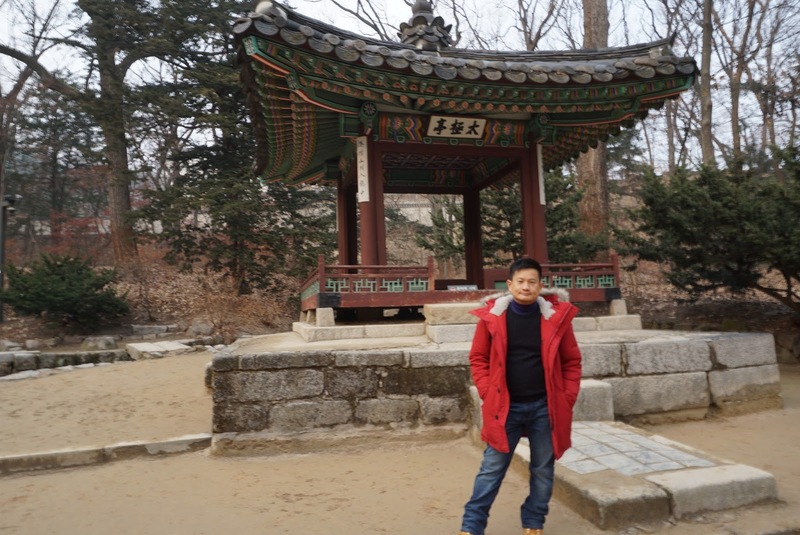 After given about 5 mins for us to roam around this small area, the tour guide proceeded to lead the group to Ulduhap and Aeryeonji Pond. 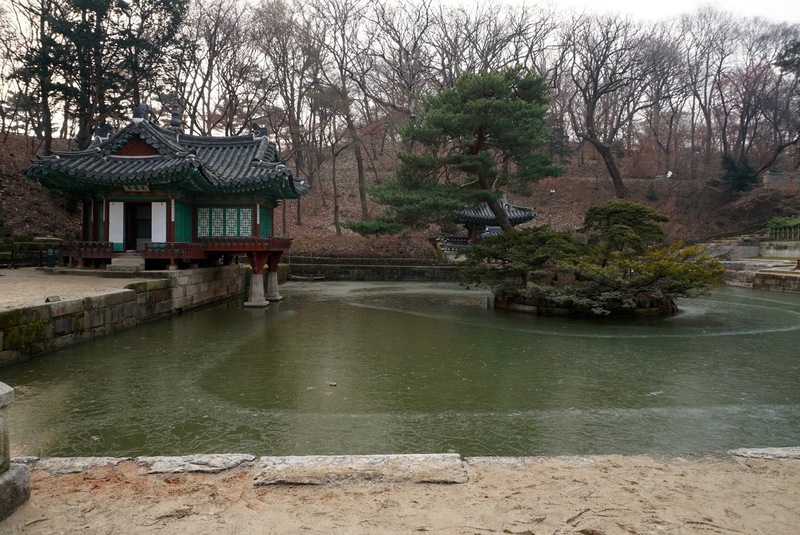 The Aeryeonji pond small square shaped pond lies beside a rather small building (Ulduhap) that looks rather common, which is different from the rest of the brightly painted palace buildings. 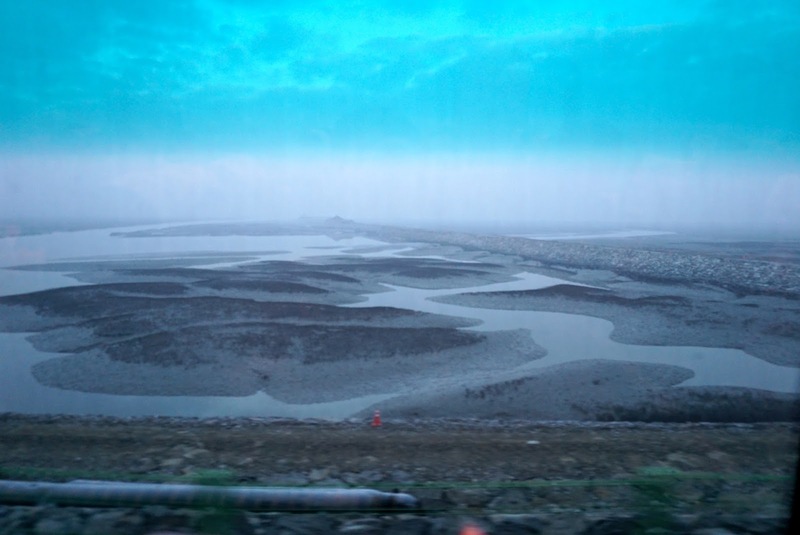 It is here that the crown prince once studied. The tour made a brief stop here for us to take some pictures and we moved on to the next area. 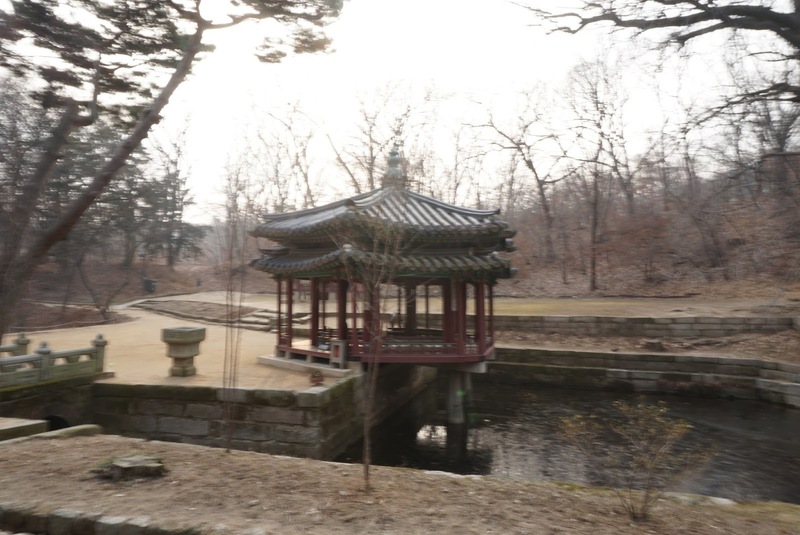 The third stop on this guided tour through the Secret Garden is the Jongdeokjeong Pavilion area. 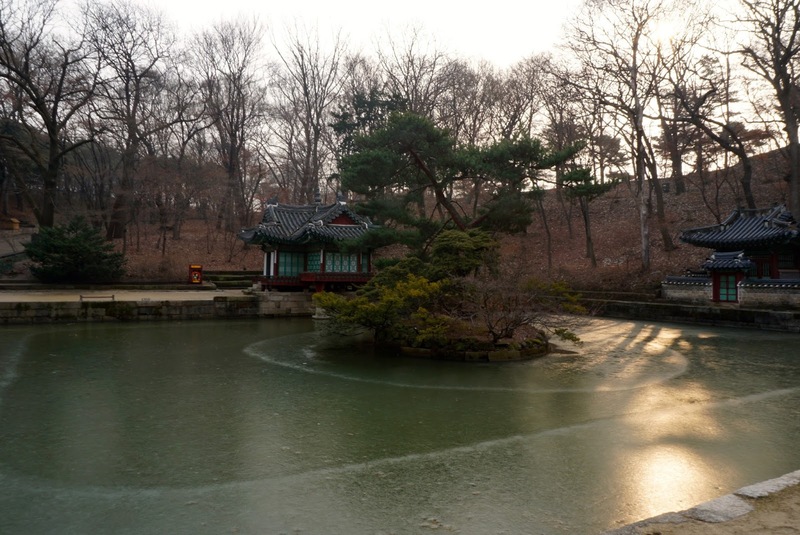 This area comprises of 3 pavilions and a small house overlooking an irregular-shaped 2-segment pond. 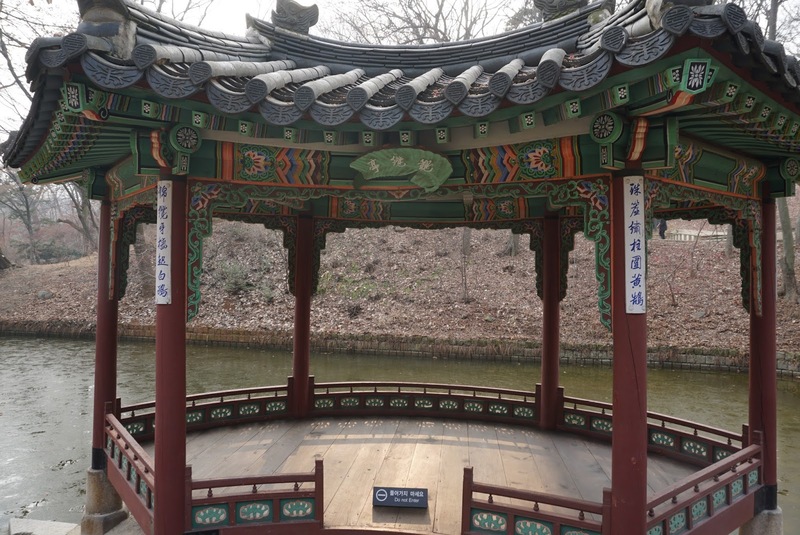 A pavilion (Gwallamjeon Pavilion) that is situated at the edge of the pond is built resembling a fan, while the other on higher ground is a slightly bigger octagon-shaped pavilion (Jongdeokjeong Pavilion), overlooks the 2 section of the pond. 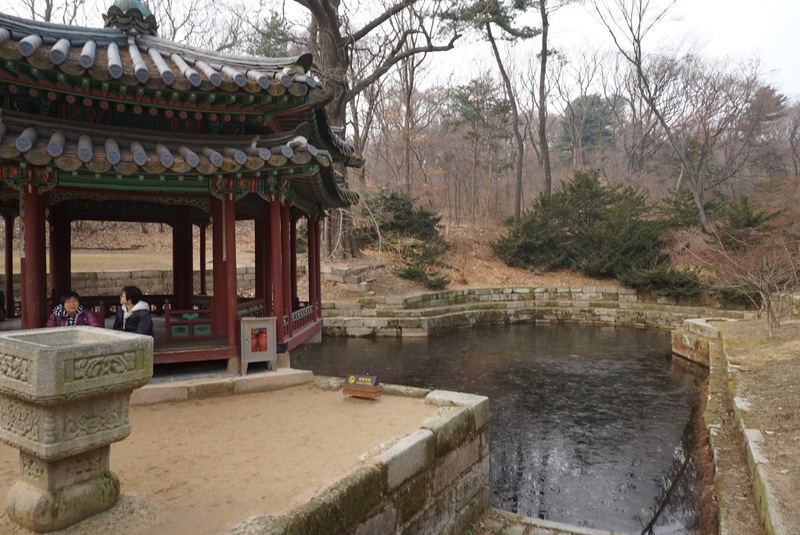 There is a small building nested on top of a small slope that overlooks the lower pond. 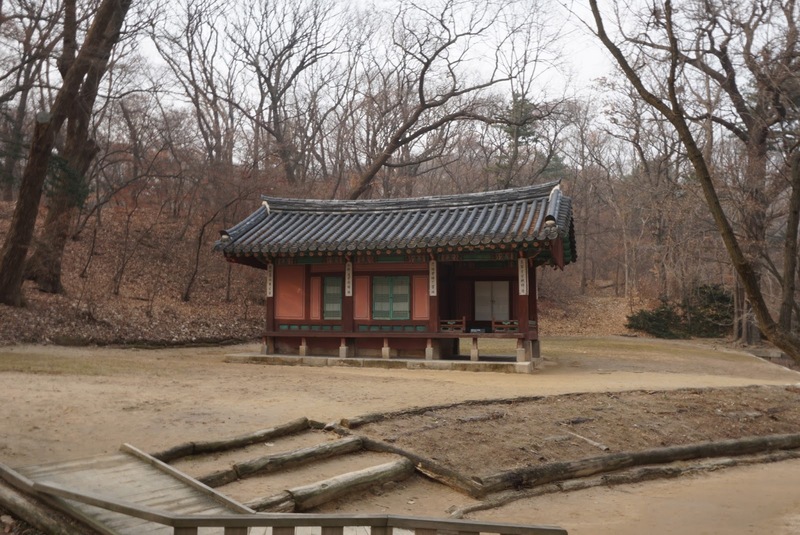 Between this building and the octagon shaped Jongdeokjong Pavilion is a small red building (which is nowhere near the ponds). 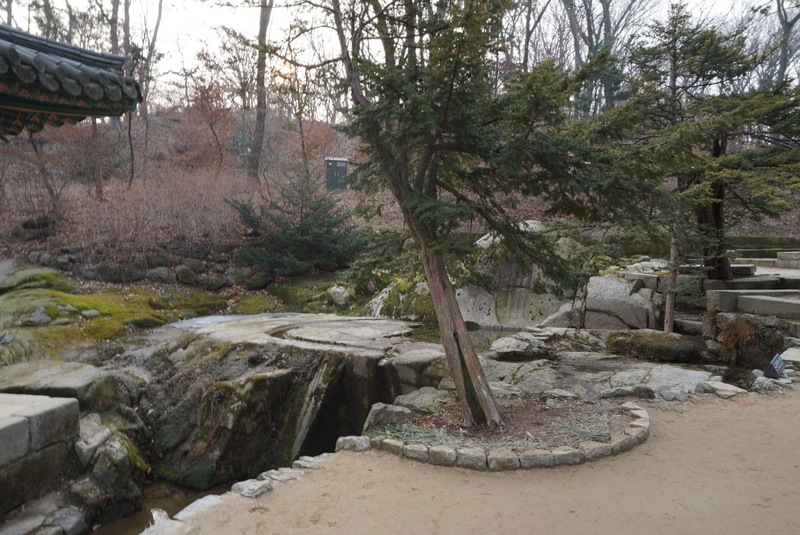 This would be one of the most scenic spot in the garden, especially when it was covered with snow in the winter and red foliage in the autumn. 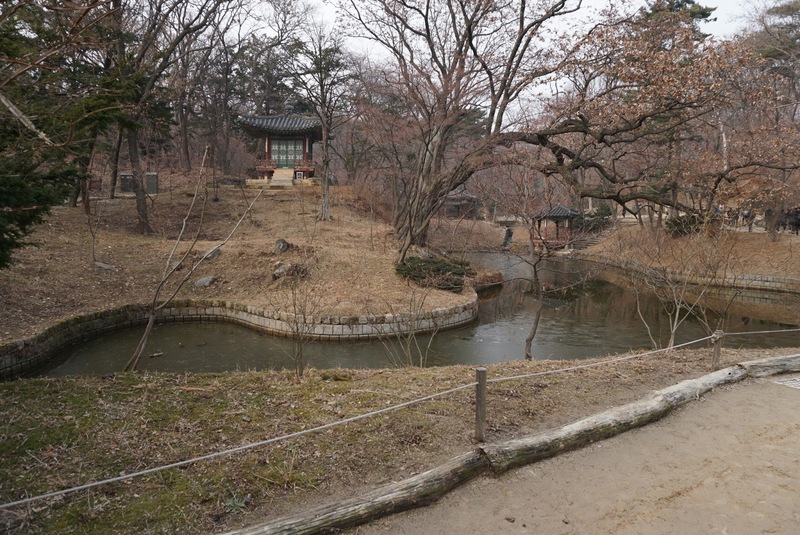 Perhaps due to the controlled number of people, walking through this garden feels very peaceful and zen. 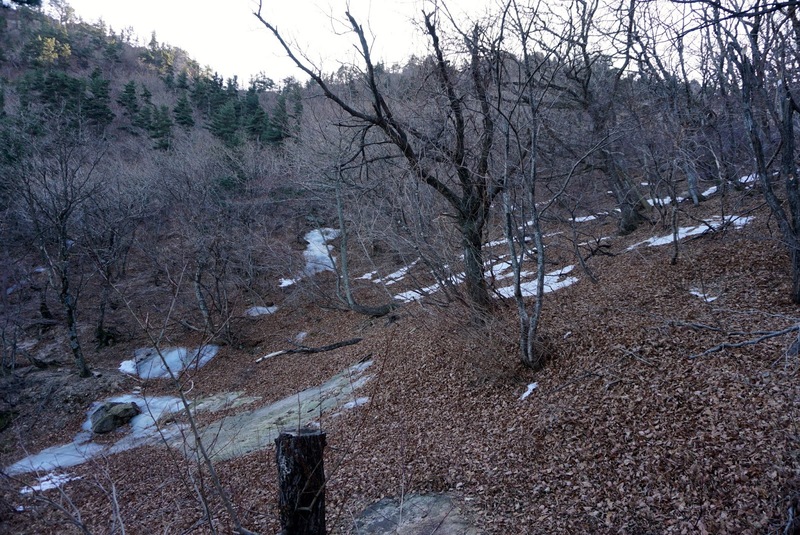 The next stop – Ongnyucheon Stream requires a fair bit of walk up slope, it seem that the Ongnyucheon Stream is situation on the highest ground in this garden. 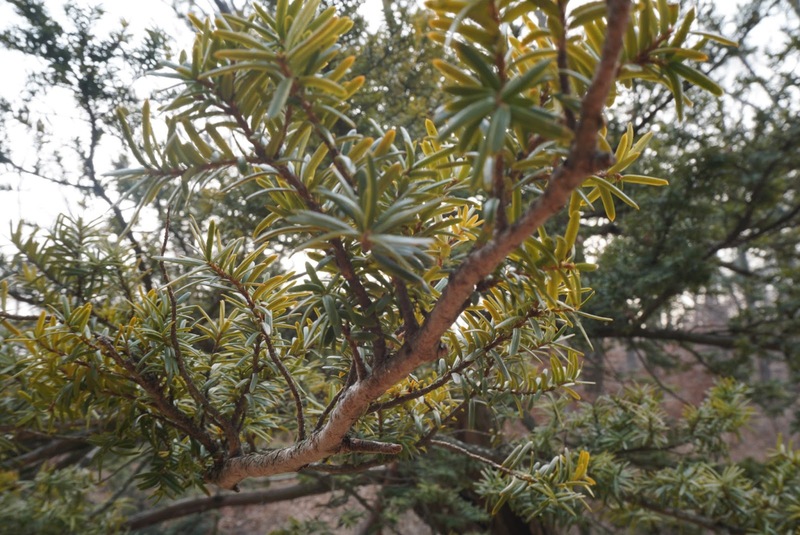 Walking through the garden in winter (where the snow has yet to fall) is rather unique. 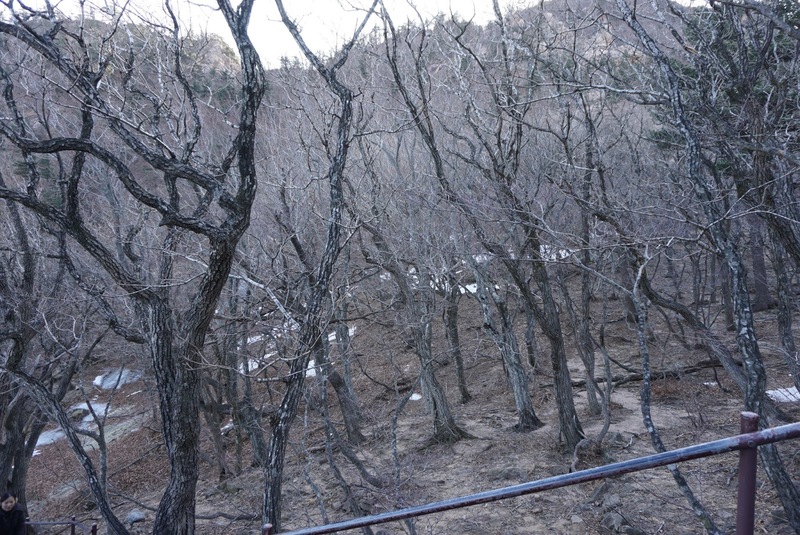 The garden at this time of the year is covered with mostly brown, draped with trees which leaves has fallen and occasional greenery for winter plants. 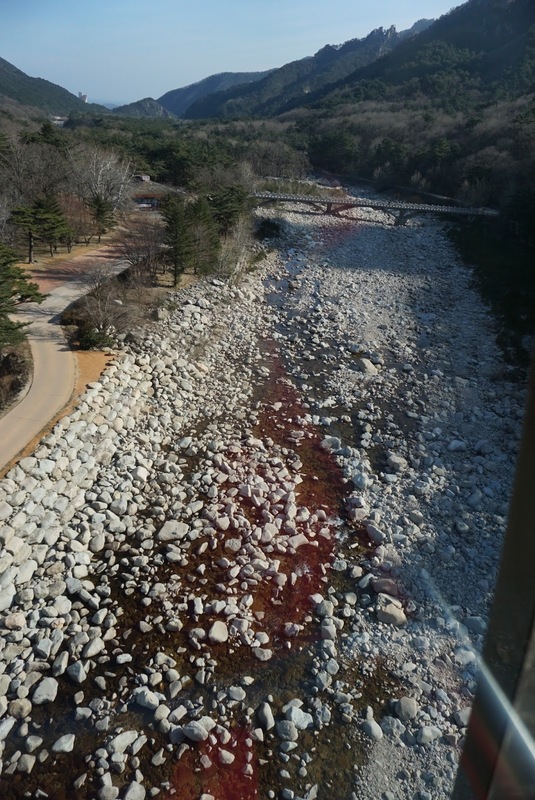 The Ongnyucheon Stream is a manmade waterfall, spring water is used for this waterfall. 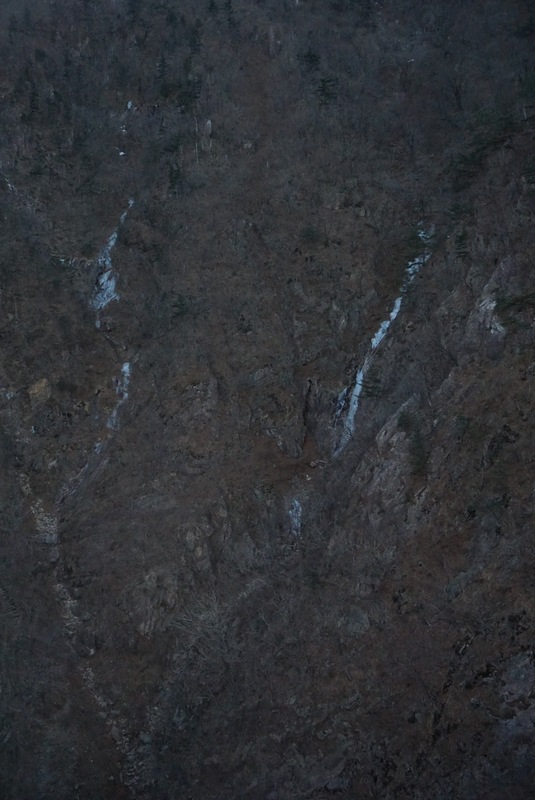 The design of this waterfall was to blend in with the surrounding landscape. 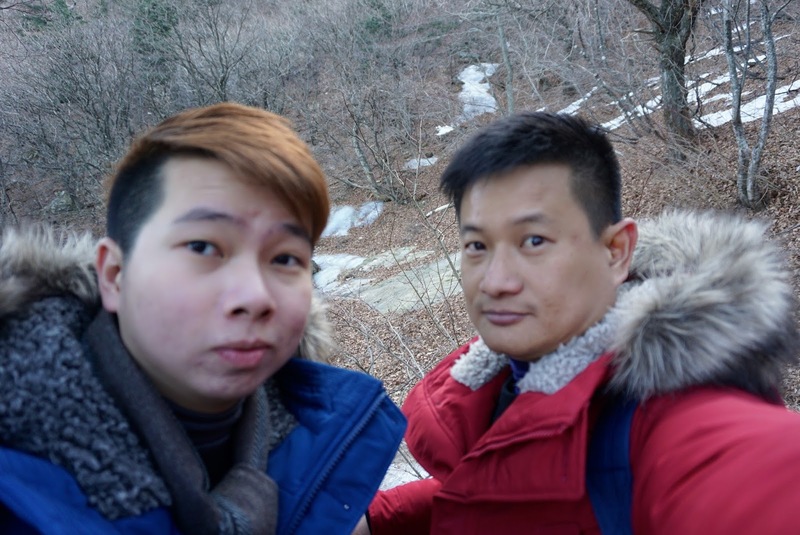 It is a pity that during our visit, the waterfall was not function, maybe due to the water being frozen at this time of the year. 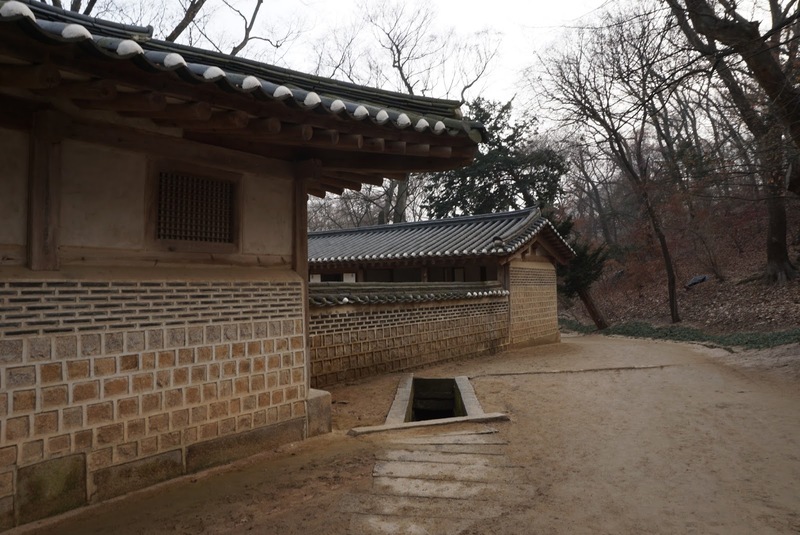 There are several buildings built in this area, with the waterfall function, I thought this would be a very nice place to relax in the days of the Joseon Dynasty. 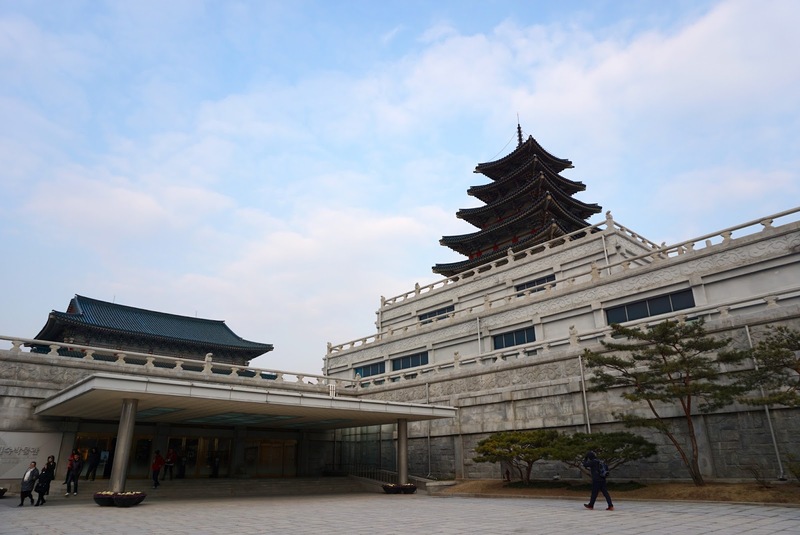 The final stop during this guided tour is the Yeongyeongdang Hall. 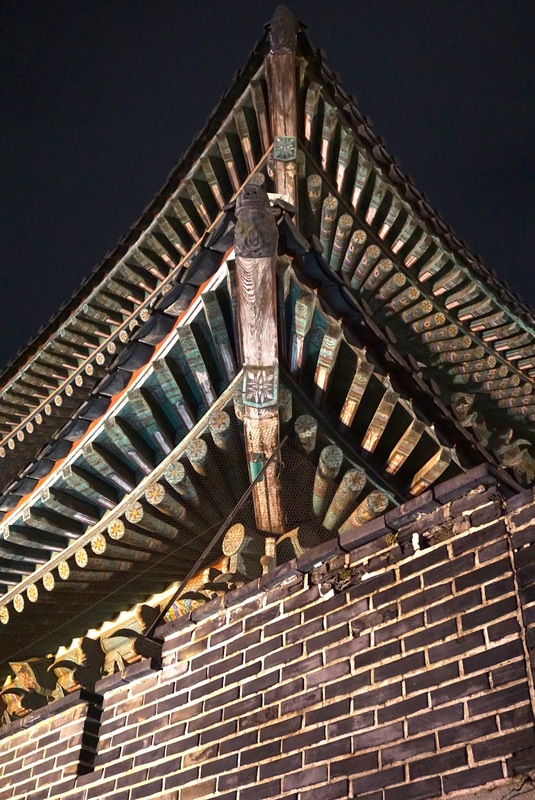 The buildings that forms Yeongyeongdang Hall was not brightly painted, but covered in earthy tones. 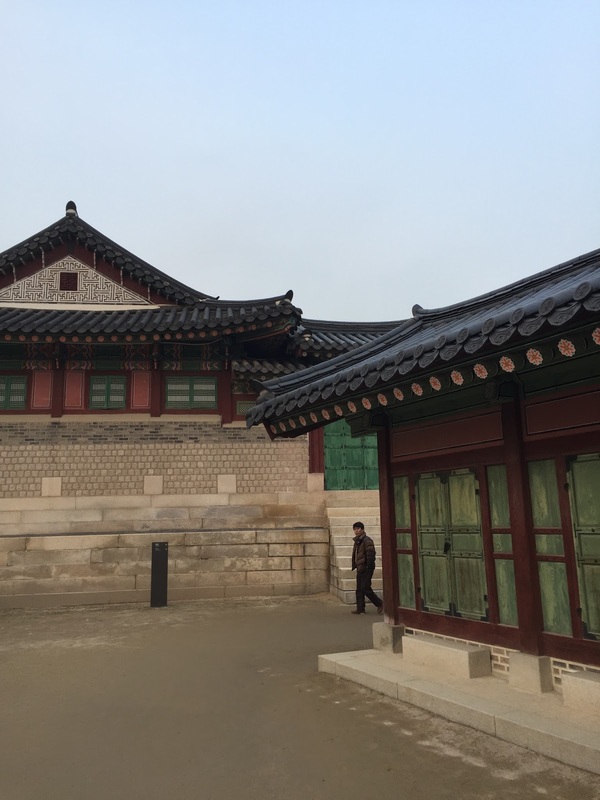 These buildings does not resemble one that the King will be used. The halls looks like a residence of some sort complete with room and what appears to be a kitchen. 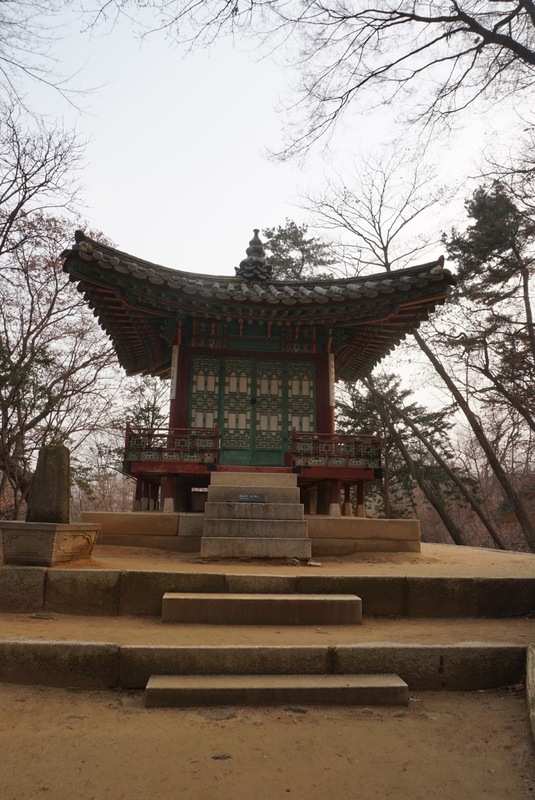 The guide explained that this place was used to hold ceremonies where there are a change of title for the King or the Queen. 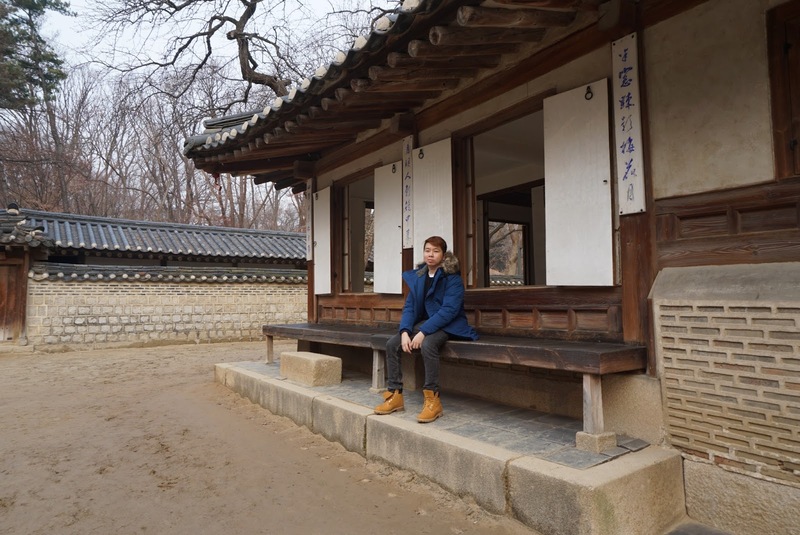 We were told that this place was also used by one of the Korean King as a retreat from politics whilst the crown prince ran the country temporarily. Due to the rain, the grounds of the hall feels muddy. 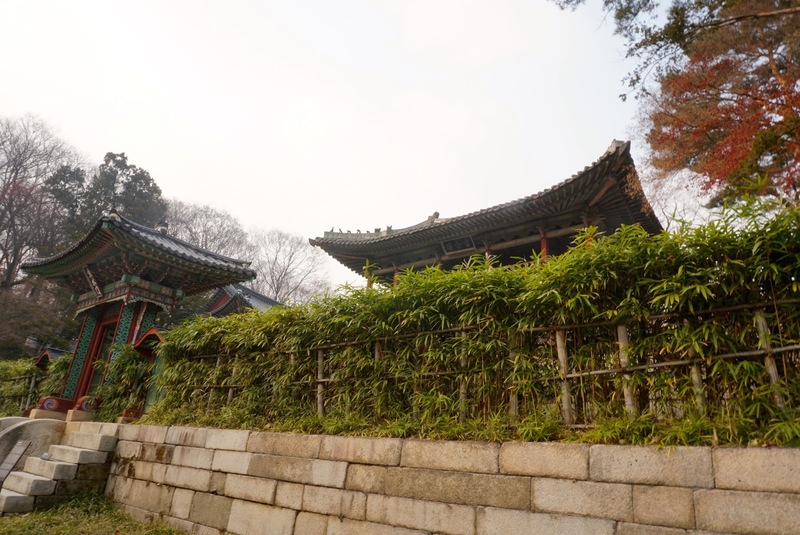 We were given some time to roam around the hall area before the guide led us back to the entrance, through a part of the garden that has mostly plants and no buildings, skirting the outer parameter of Changdeokgung before hitting Donhwamun gate. 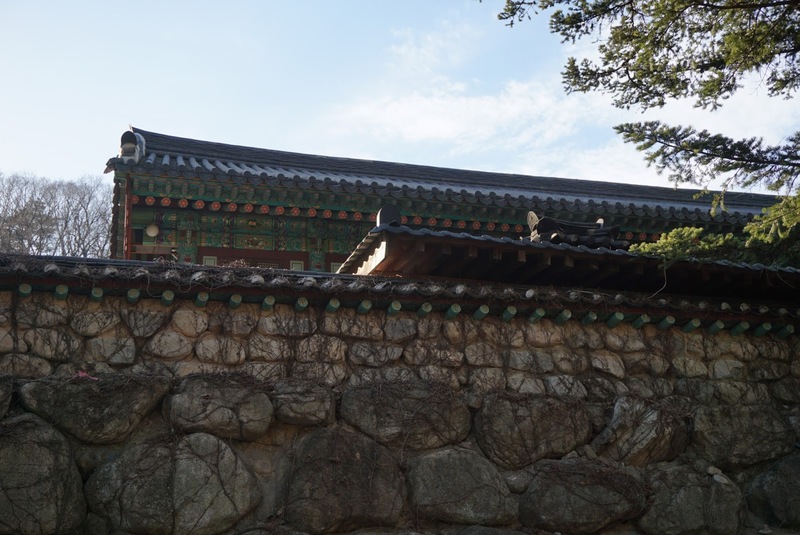 We re-entered Changdeokgung through Donhwamun. 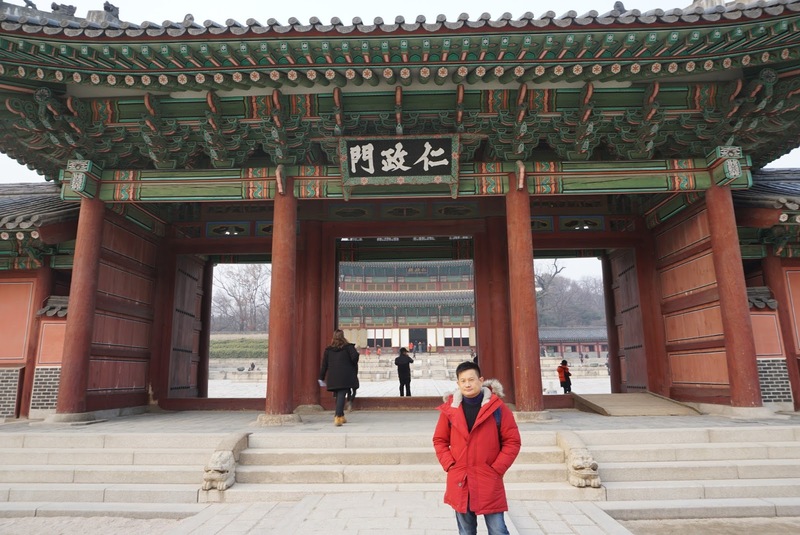 The 5-panel 2-storey bright red main gate of the palace looks like a pavilion on a larger scale. 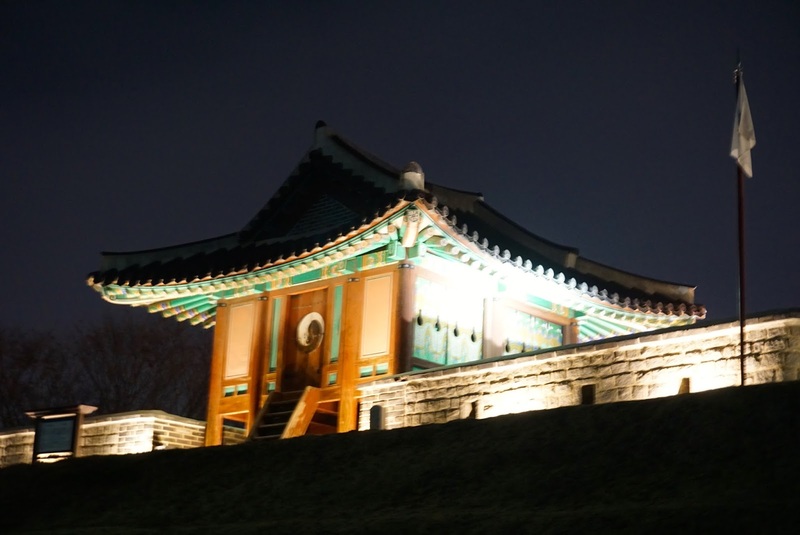 It does screams of the King’s authority over the Korean Empire. 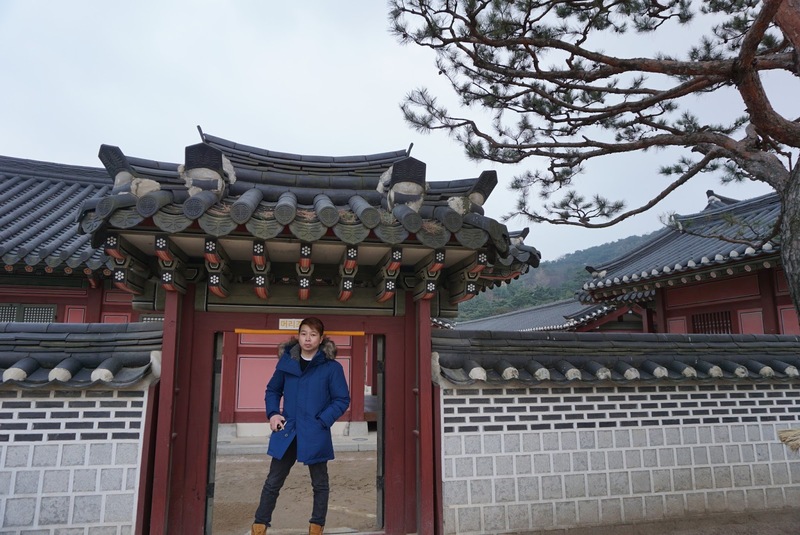 The entire gate is made of wood and is very well preserved despite being built in 1412. 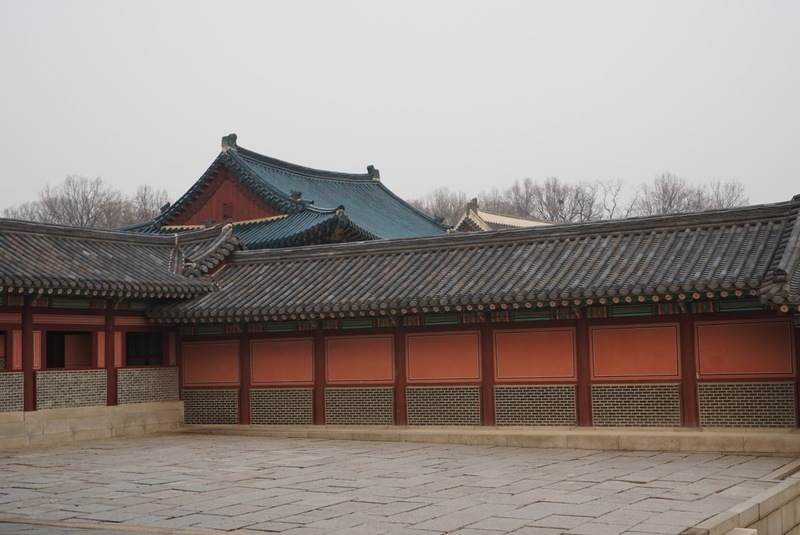 Unlike most palaces where the main gate is preceded by another gate leading to the throne hall, the layout of this palace has the throne hall to the right of the main gate. 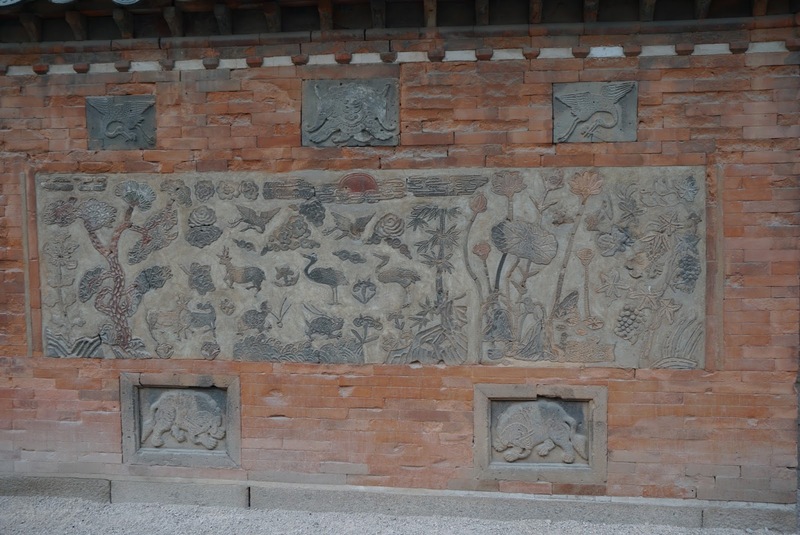 Immediately in front of the main gate are some buildings and a shrine enclosed in a short wall. 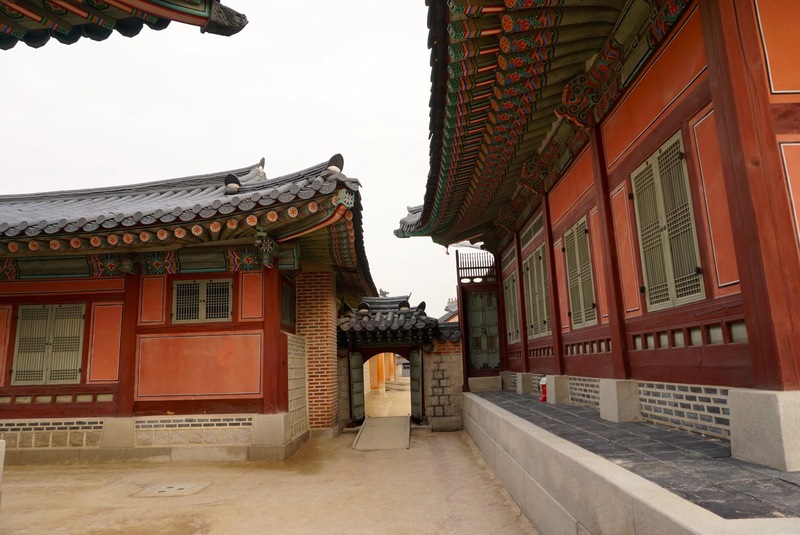 Crossing a small stone bridge, passing through another door on the left is the door to the throne hall. 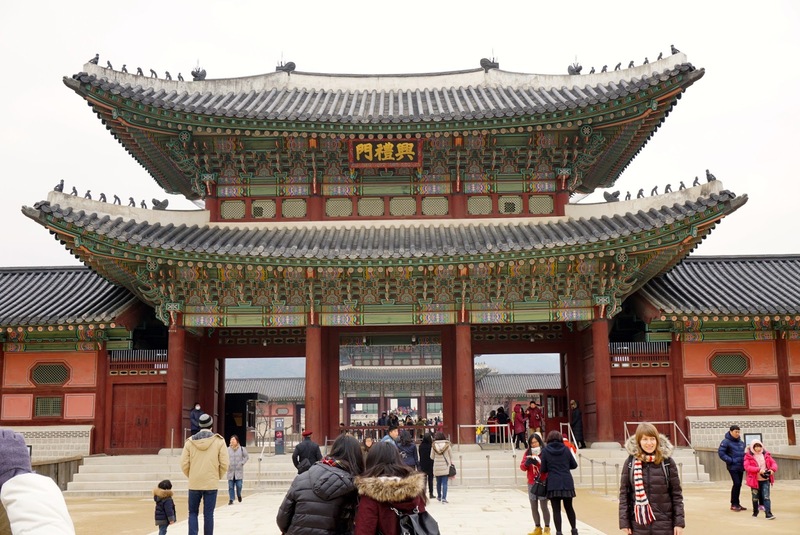 Passing through 3rd door (since Donhwamun) opens up to a massive square before the throne hall. There are tablets laid on the floor of this square marking the position various ranked officers would stand when court session takes place. 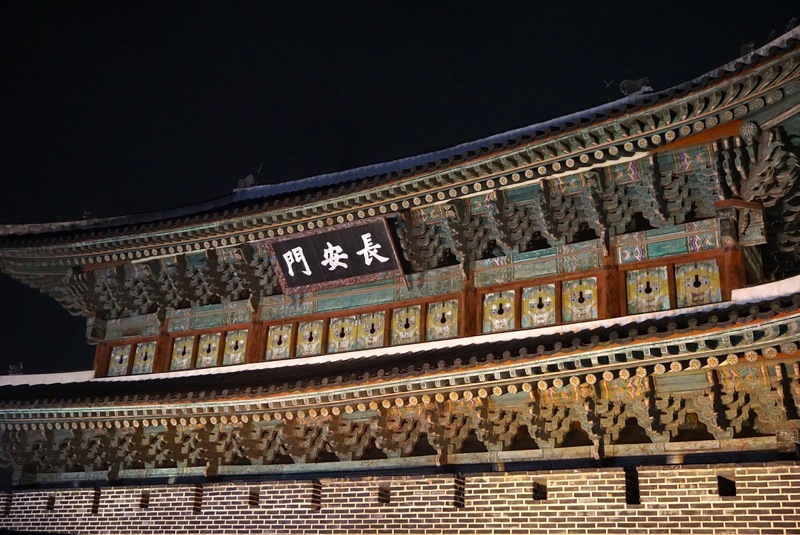 At the heart of this area is the throne hall – Injeongjeon. 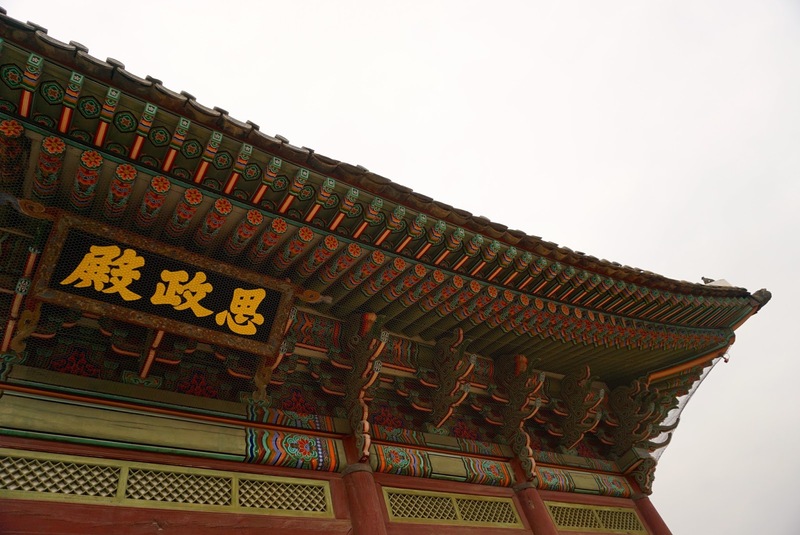 From the outside, Injeonjeon throne hall looks like a 2 storey building decked out in the iconic green and red colour schemes that is commonly found in Korean structures. 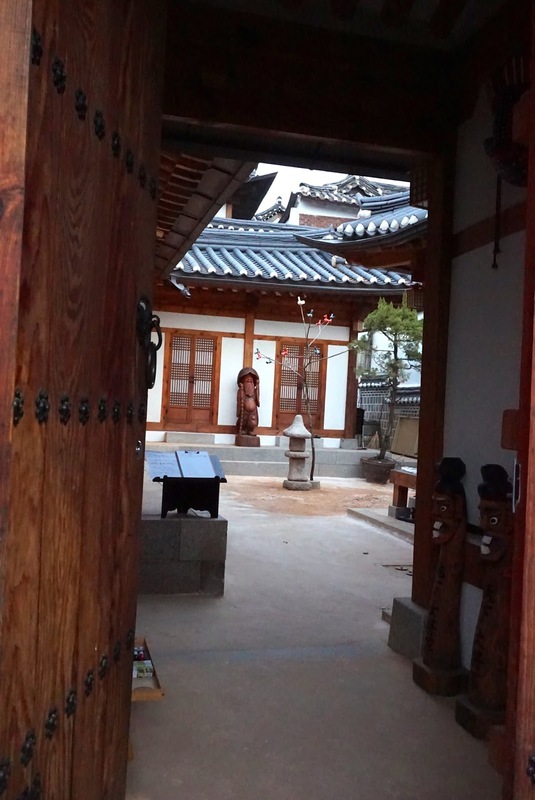 Peeking into Injeonjeon (visitors are only allowed at the door of Injeonjeon), one can see the wooden interior actually is a single storey building with high ceilings. 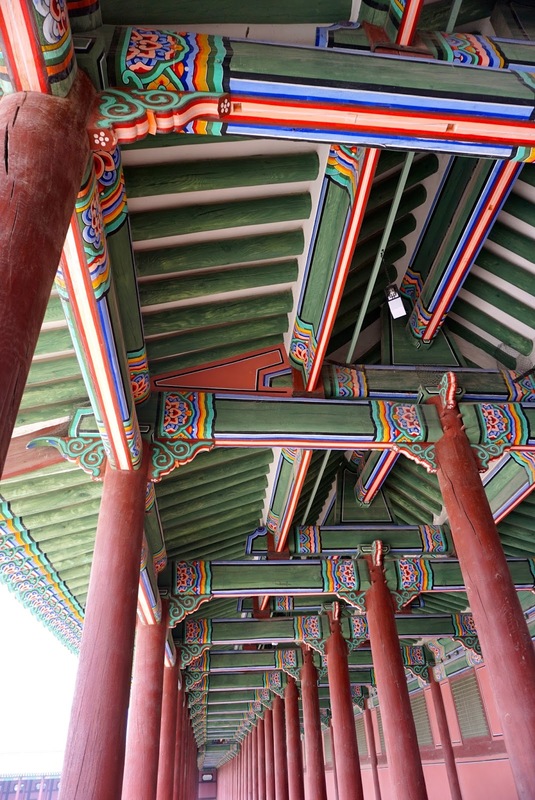 The ceiling of the throne hall is decked out with elaborate and well carved intersections of wooden pieces painted with mainly green and red colour murals. The throne the King sits during court proceedings is placed in the centre of the hall, with paintings of mountains and waterfalls forms the backdrop of the yellow throne. 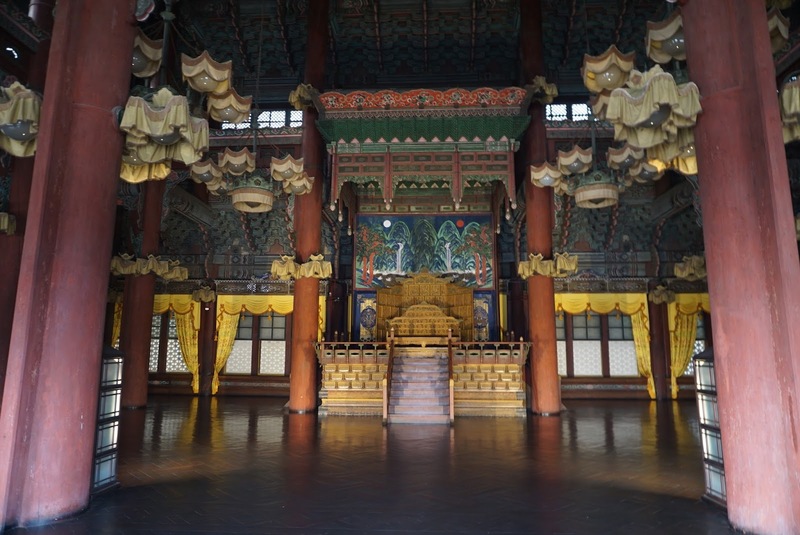 The throne hall itself can accommodate a substantial amount of people. I was rather impressed with the simple yet authoritative the throne hall presents itself. 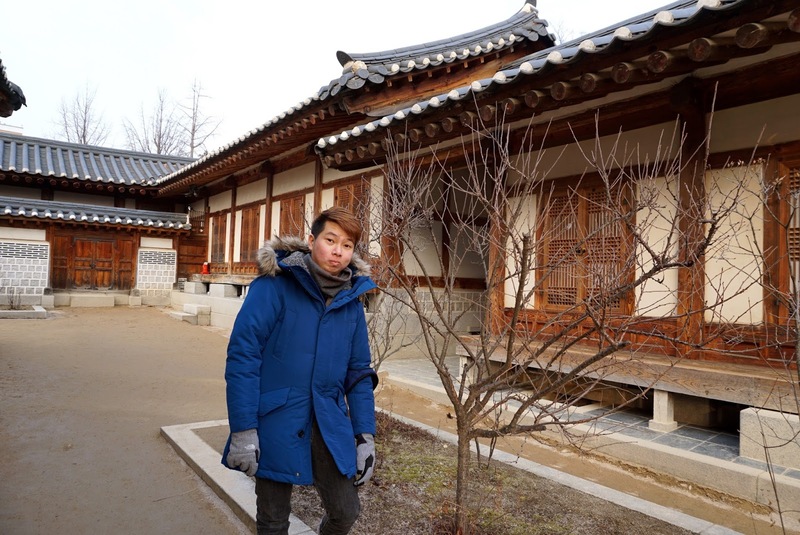 Heading right from Injeonjeon, passing through a corridor and a side door, we end up in front of Huijeongdang Hall. 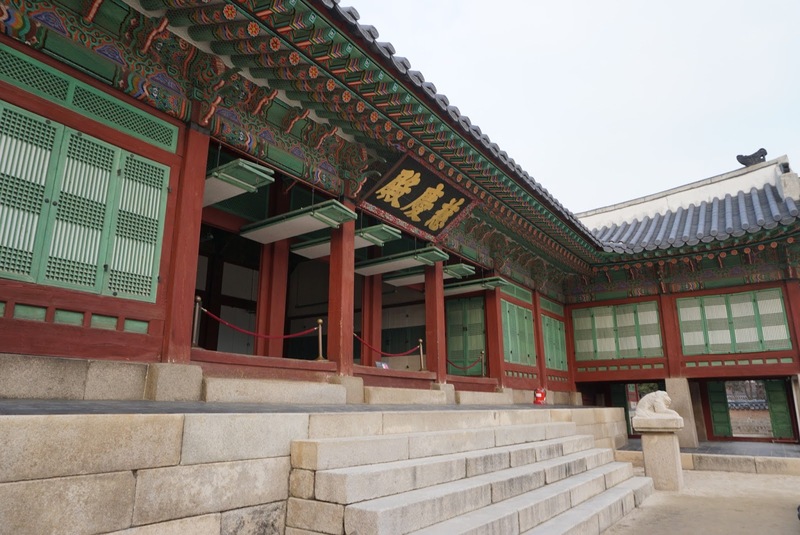 Compared to the throne hall, Huijeongdang Hall is a smaller building, but yet still decked out in the green and red colour scheme. 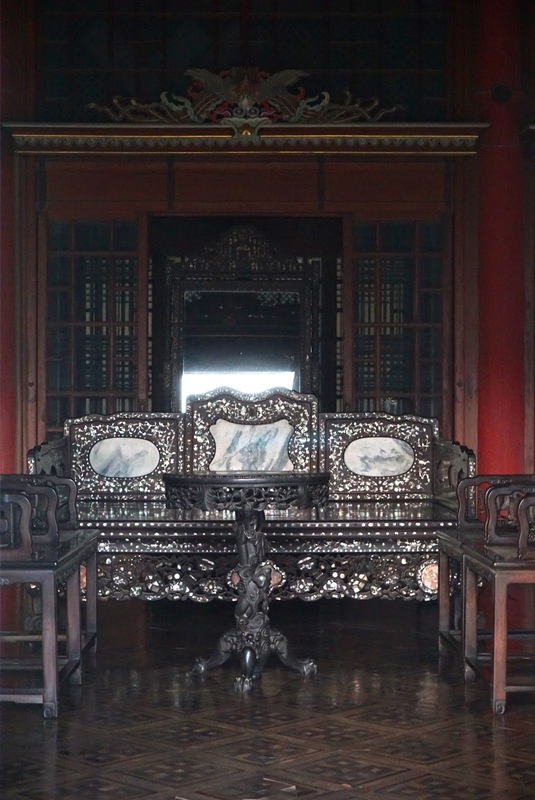 This is hall is where the King Chamber is located, which doubles up as his workplace. 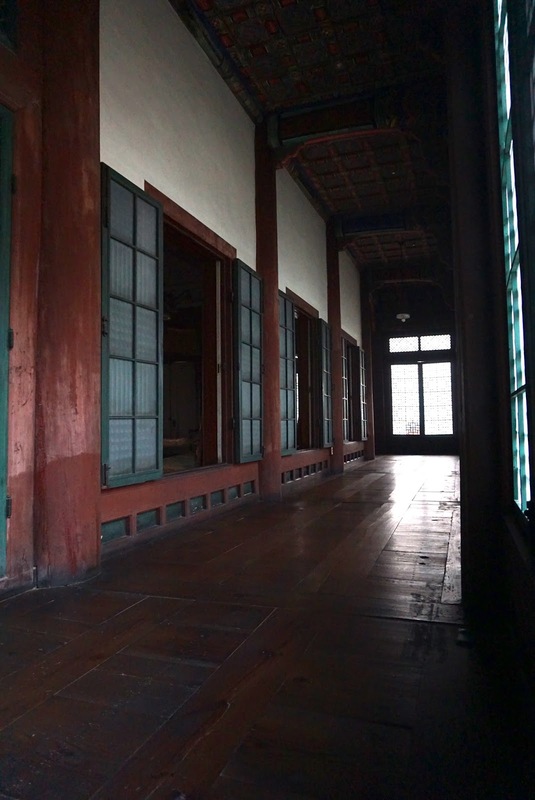 This hall is linked to the rear building with a series of sheltered corridors. 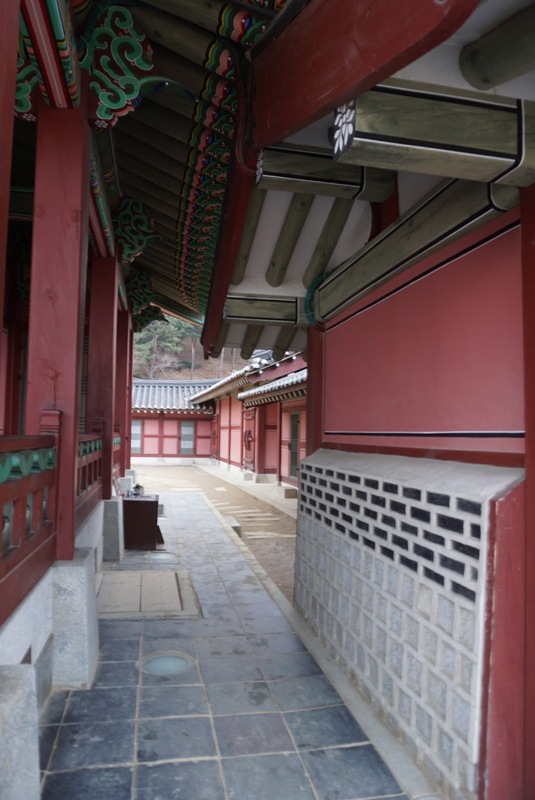 Behind Huijeongdang, through a maze of covered corridors is where Daejojeon is located. 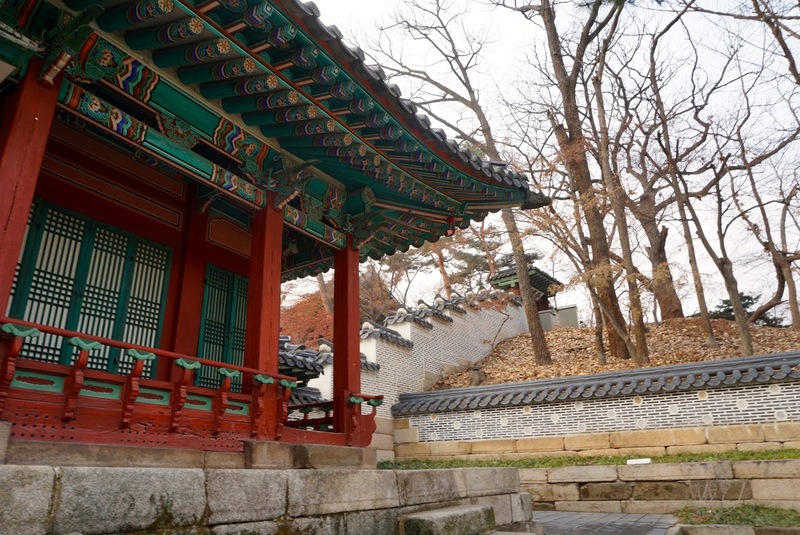 Daejojeon served as the residence of the Queen. 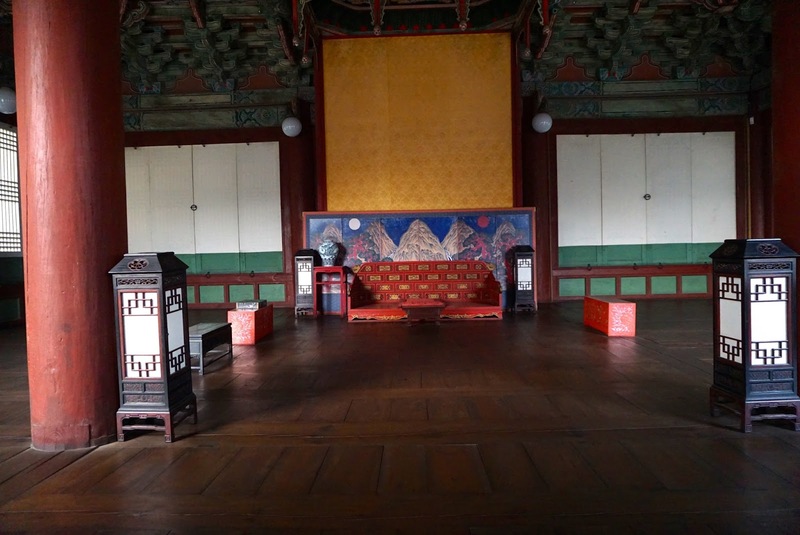 Compared to the King’s Chambers, Daejojeon has a much simplier decor. 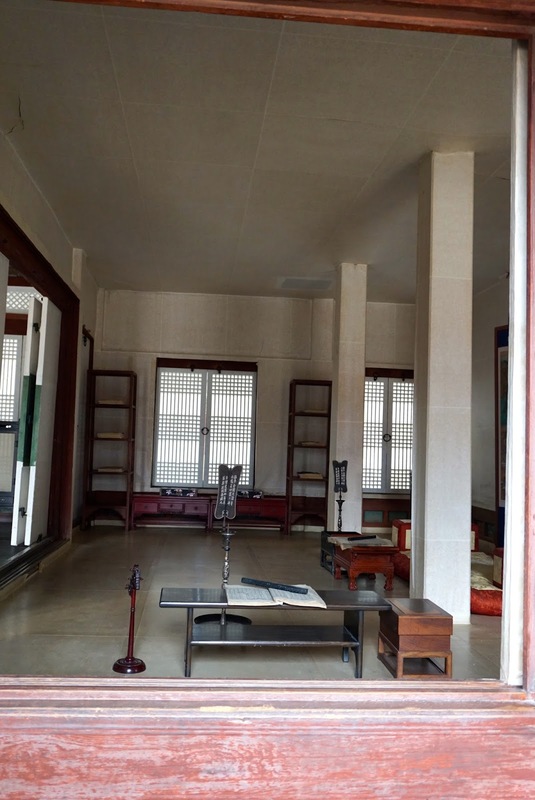 There is a living room of some sort at the centre of Daejojeon, furnished with pearl and marble laid wooden furnitures. 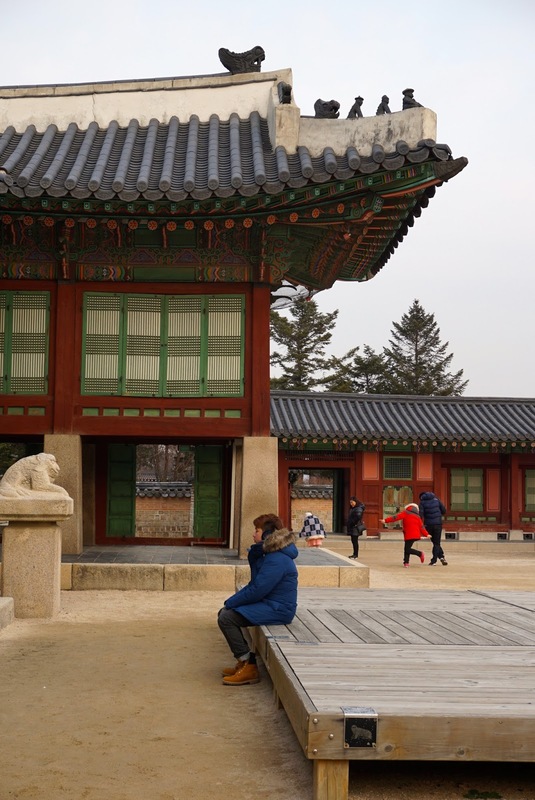 Without a guide explaining the details of these palace grounds, roaming around on our own does not provide much significance to the areas that we have visited. After awhile all the buildings looked the same to us. 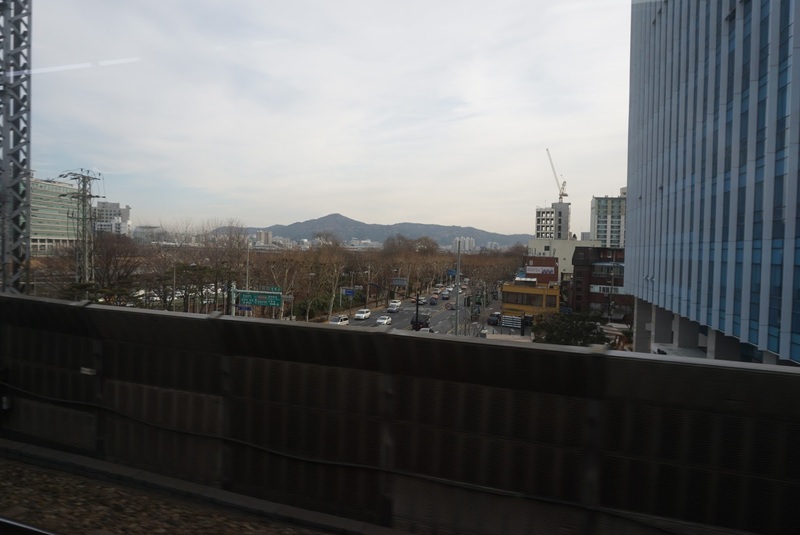 Heading out of Daejojeon through Huijeongdang, to the right of these buildings is where Seongjeonggak Hall is located. 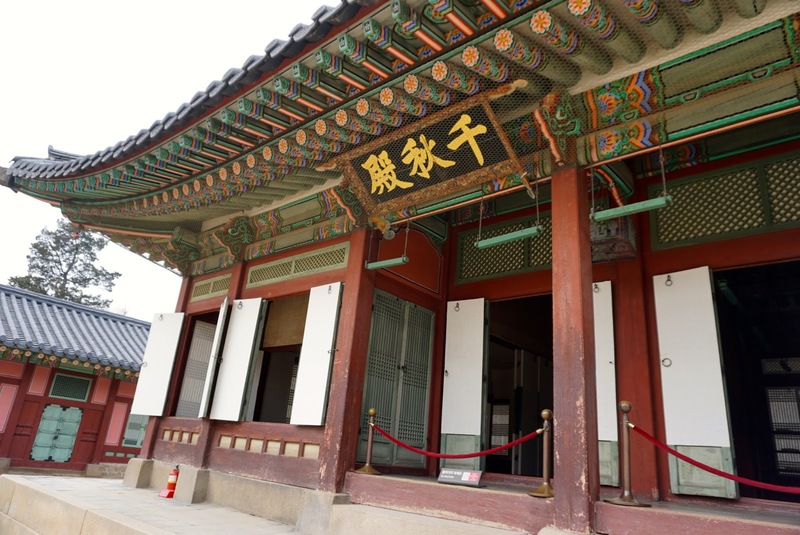 Seongjeonggak Hall is initially used as the residence of the Crown Prince, which has later became a library before taking its last task of being the royal hospital. This hall has a rather unique structure that one end of the building is laid on the flat ground, and another end on a raised platform, making it a split level building structure. As it is approaching closing time, we hurried to a separate, dull looking stand alone building complex, locating to the right of the road to the Secret Garden. 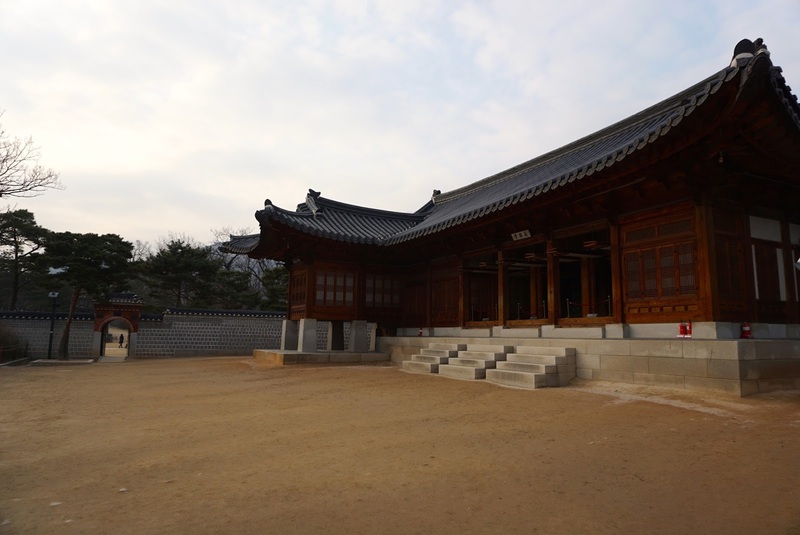 The Nakseonjae complex was built as the King’s quarters, despite being the King’s quarter, the King then decreed that the building to be kept simple in its construction. 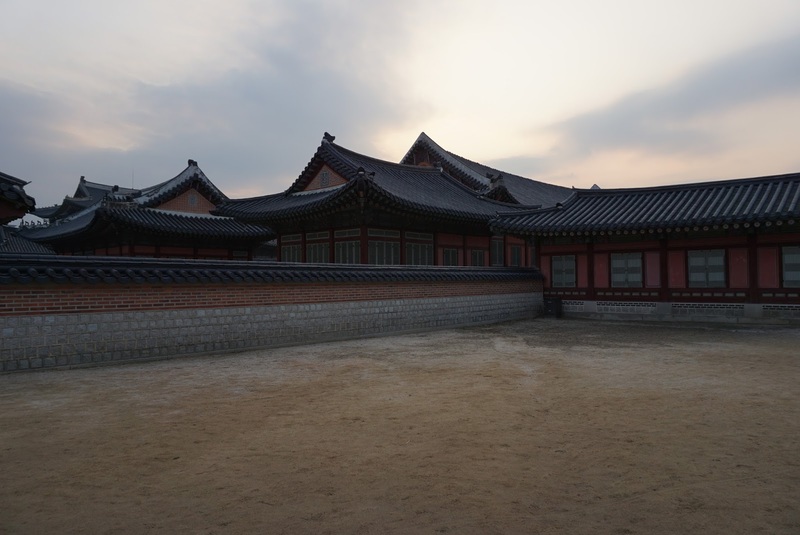 This complex was later used as the quarters for the wife of the last Crown Prince. 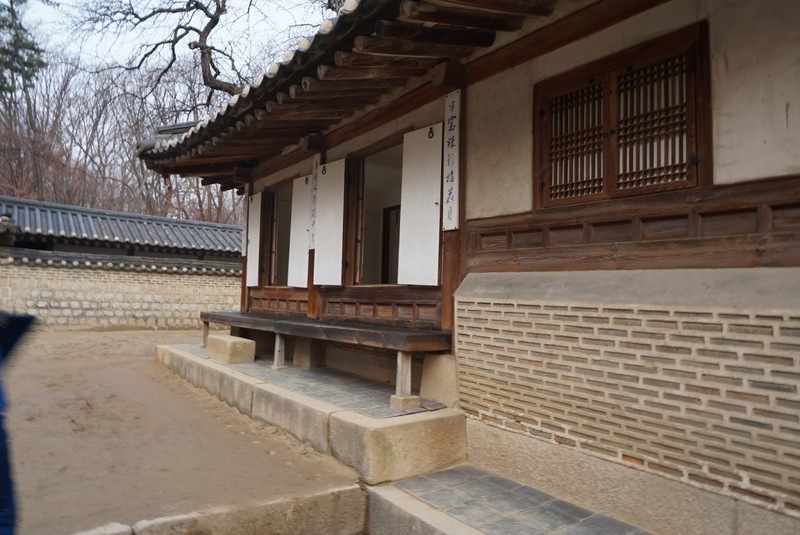 As we walked into this area, it looked pretty much the same as the other buildings we have seen within Changdeokgung, but simpler and smaller. 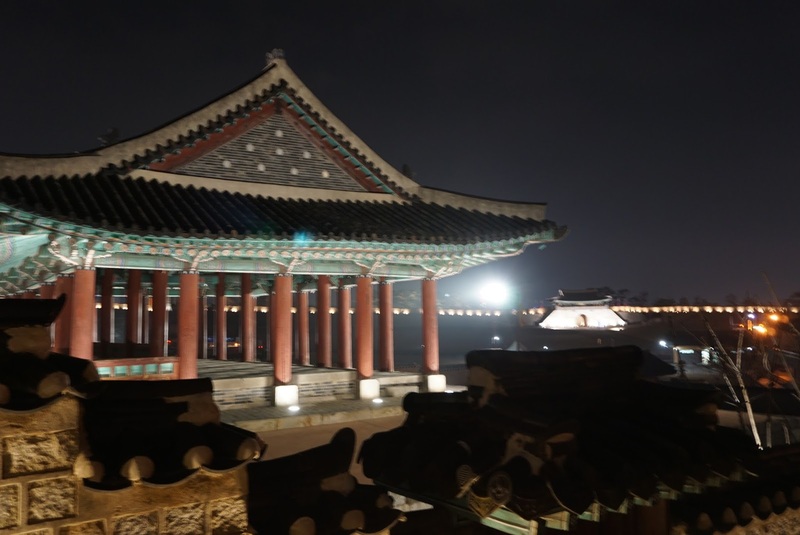 We hurried out of the palace grounds as it was approaching its closing time. 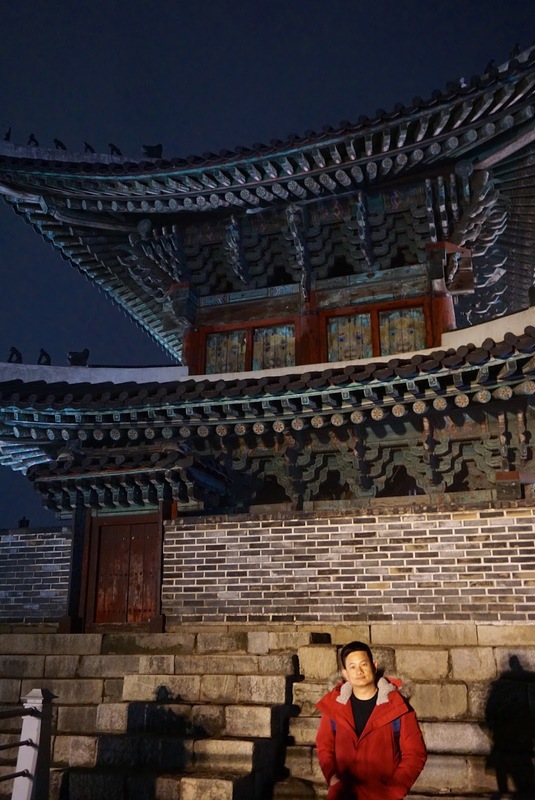 We did not take too many pictures in Nakseonjae complex partly due to the closing time is near and partly due to its simpleness does not seem fit for a king to living in. 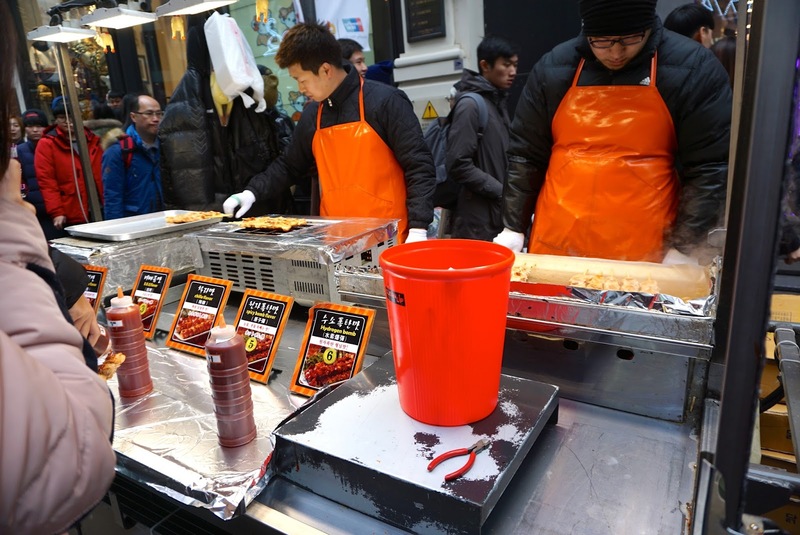 There are a few dishes that the Koreans are famous for other then the Kimchis and BBQs. 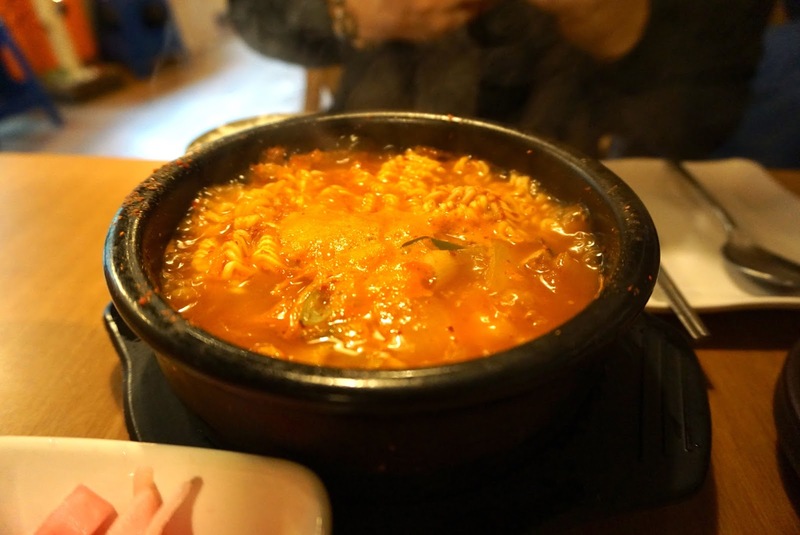 Korean Ginseng Soup (Samgyetang) is one of the must-haves when coming to Korea. 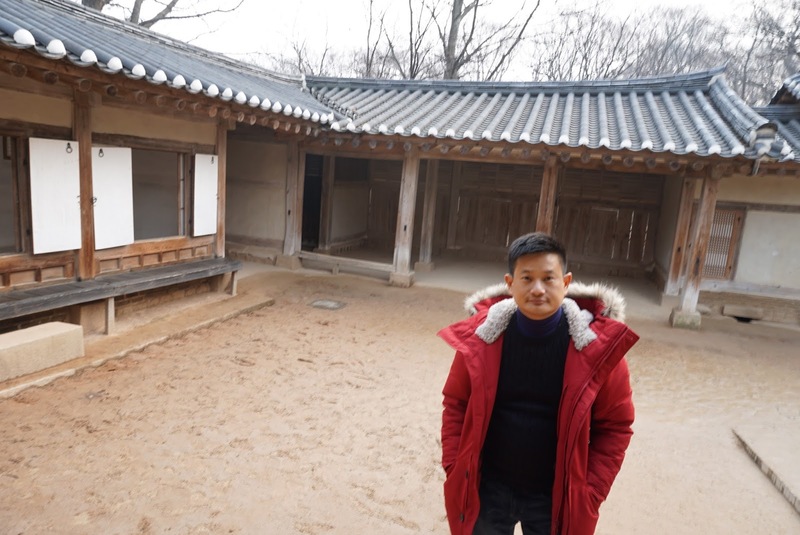 I Googled online after exiting Changdeokgung that Tosokchon Samgyetang serves the best Korean Ginseng Soup and the restaurant was always packed with queues of patrons during meal time. We were lucky that at the time we were at the restaurant, it is way past meal time and we did not have to queue for our dinner. 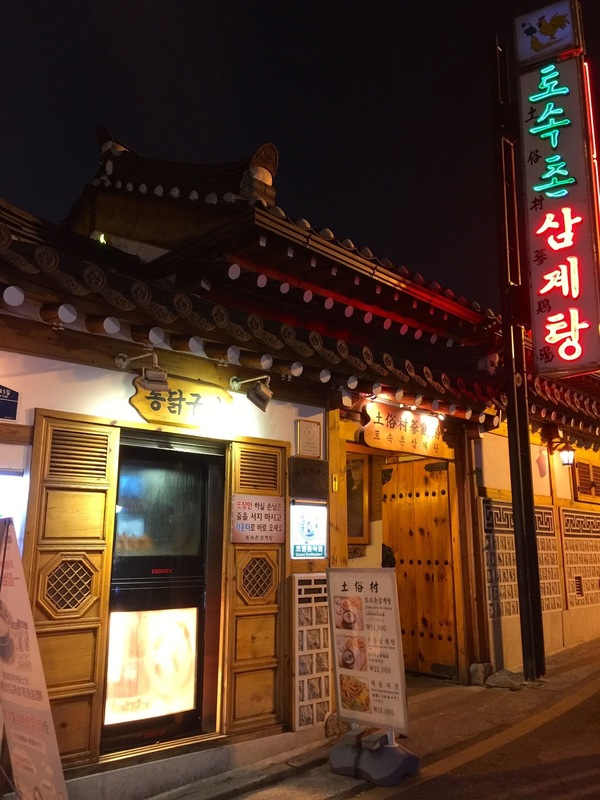 The exterior of the restaurant looked traditional and small, but once inside, there seem to be plenty of dinning areas for patrons. 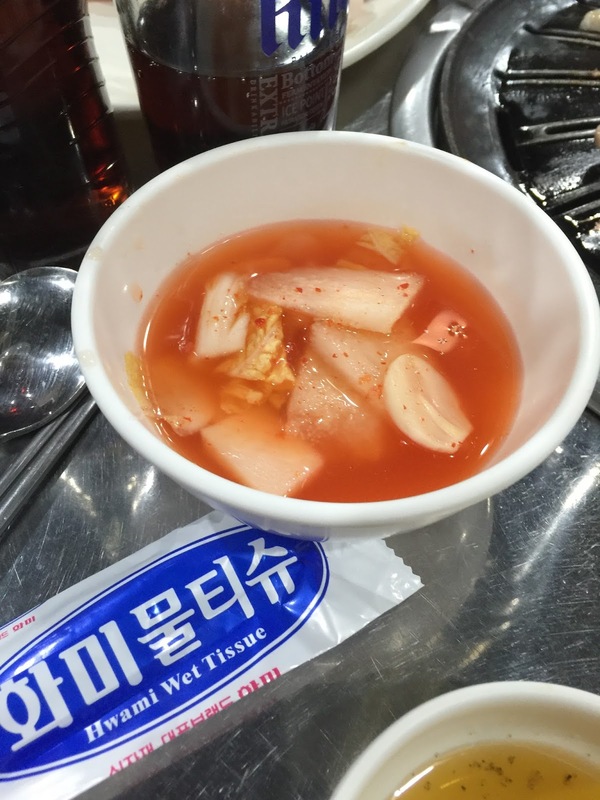 Customers would have to sit on the floor for a taste of their Samgyetang. 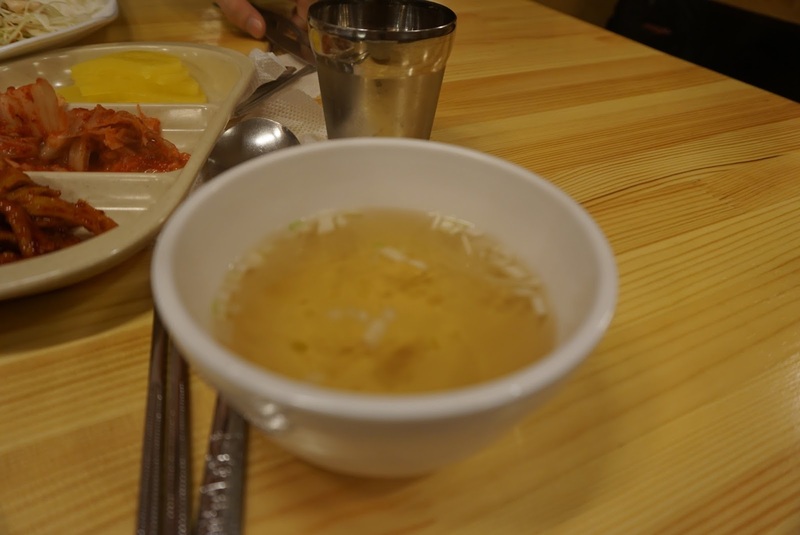 We did not have to wait for long for our Samgyetang to arrive. 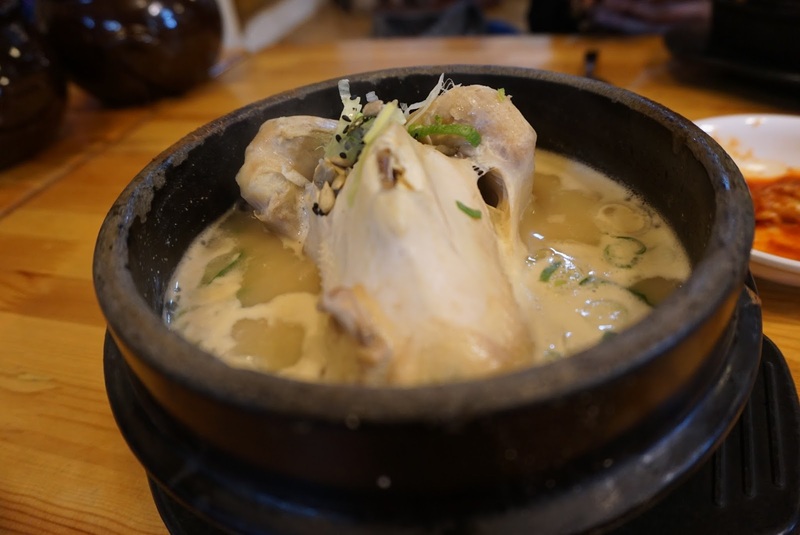 The Samgyetang does not have too strong a herbal taste to it and the chicken is tender and not too dry. 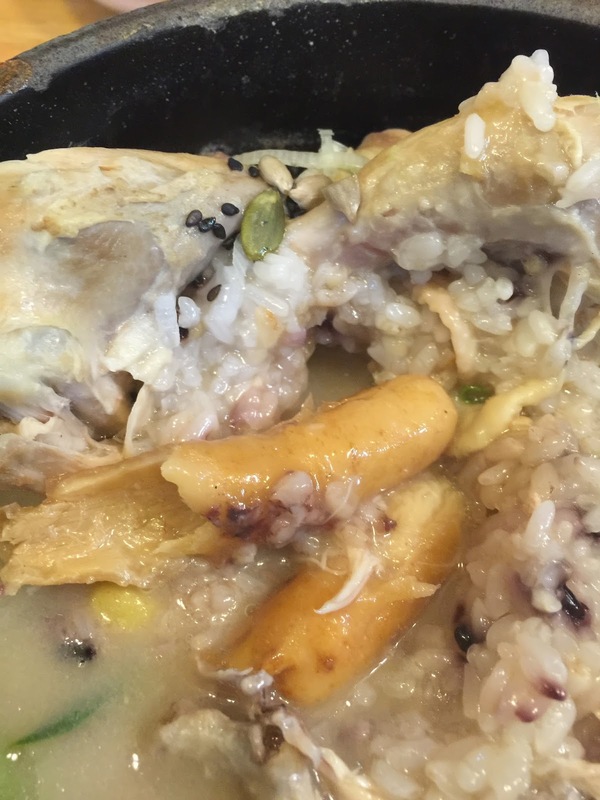 Inside the chicken, one can see the ginseng that is being used for the cooking and is stuffed with herbs and gluttonous rice. 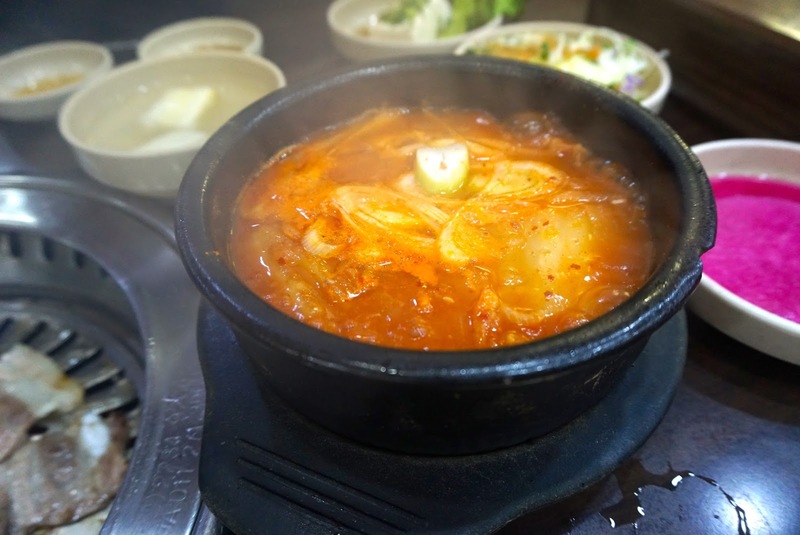 Tosokchon Samgyetang can be reached via Gyeongbukgung station exit 2 about 200m from the subway exit. 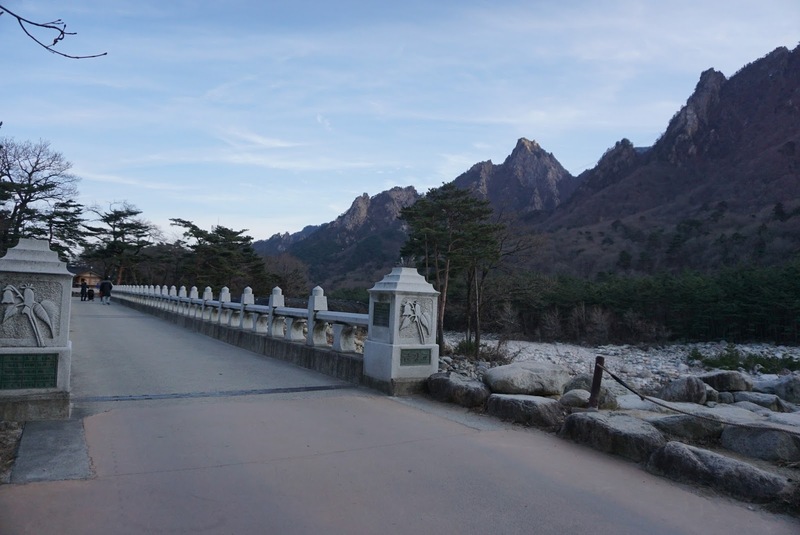 After the dinner we headed back to our hotel to rest for the night as we have to wake up early the next day for our trip to Seoraksan National Park. 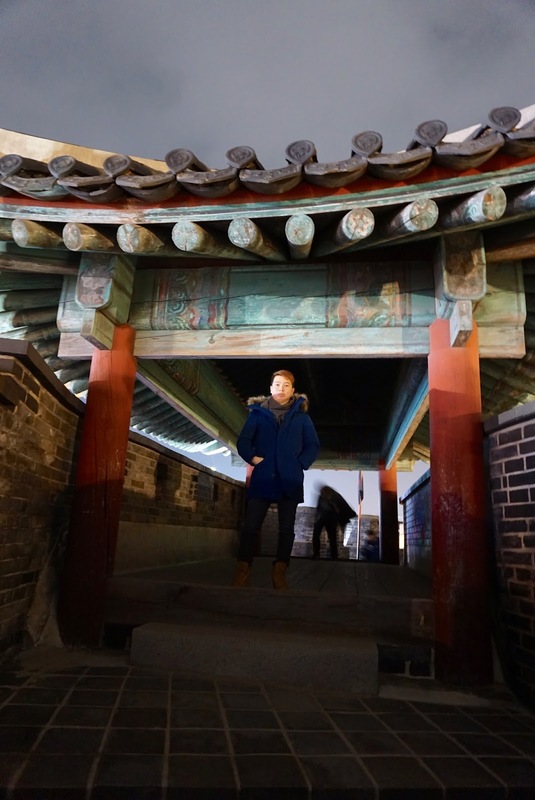 Suwon is built by King Jeongjo, the 22nd ruler of the Joseon Dynasty, in a bid to make this place the 2nd capital city of Korea. The fortress is complete in 1796. 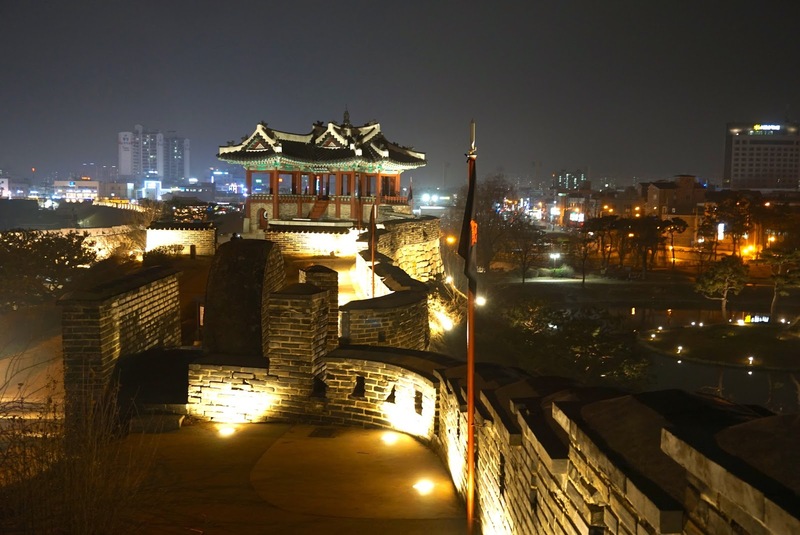 The 5.74km Suwon Fortress was listed by UNESCO in the World Cultural Heritage List in 1996, making it a valued national treasure of Korea. 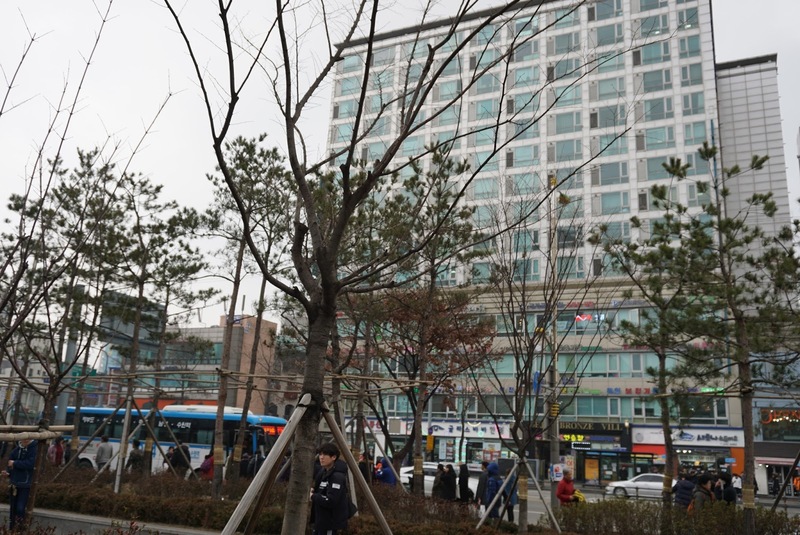 Getting to Suwon, despite being located some 48km south of Seoul, is a breeze with the reliable subway system taking about 1 hour from Seoul Station and transfer to bus numbers 11, 13, 36 or 39 from the bus stop in front of Novotel Hotel. 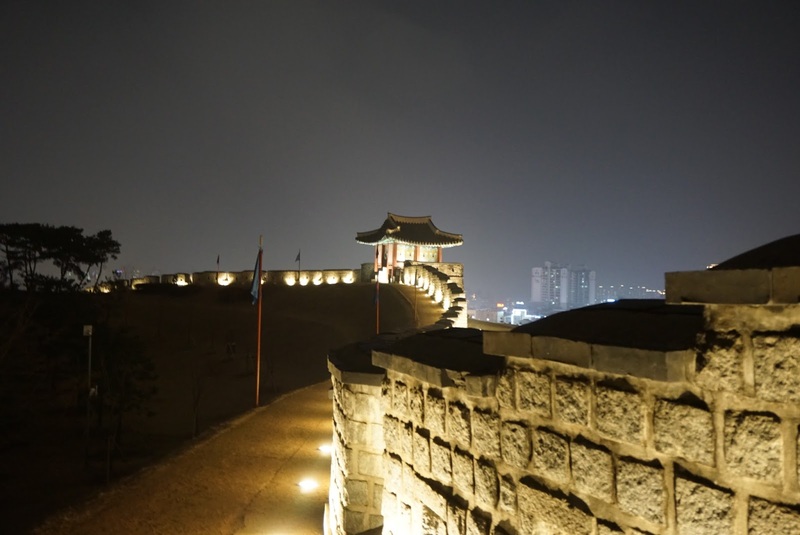 The fortress is 5 stops from Suwon subway station. 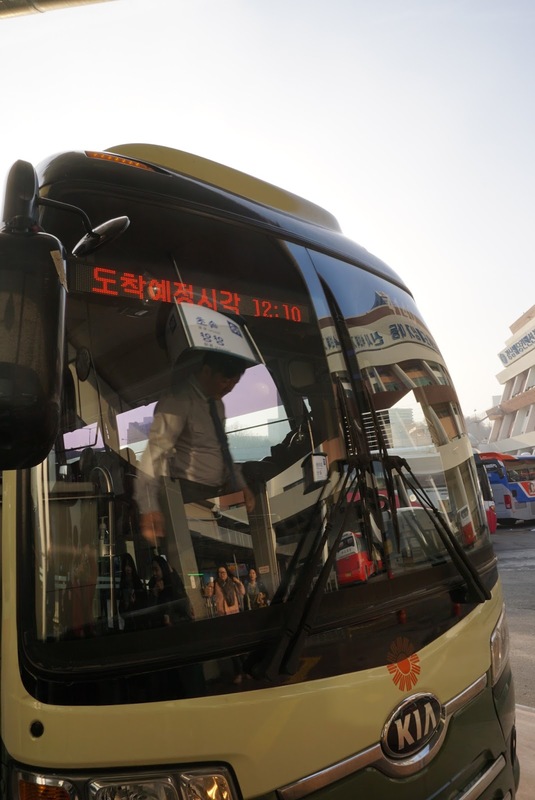 Taking a bus in Suwon is a challenge, especially for non-Korean speaking visitors. 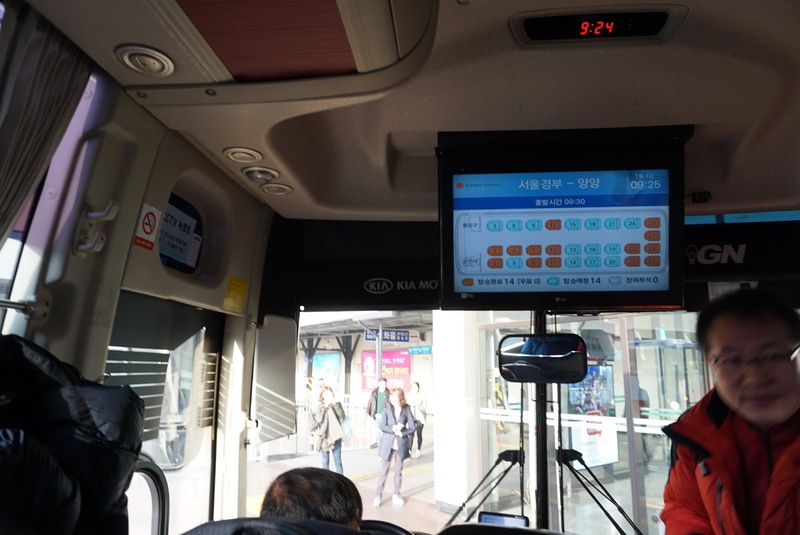 There are announcements made on the bus PA system, however there is nothing close to “Suwon Fortress” or “Hwaseong Palace” being announced. One would have to religiously count the number of the bus stops the bus whizzes by. 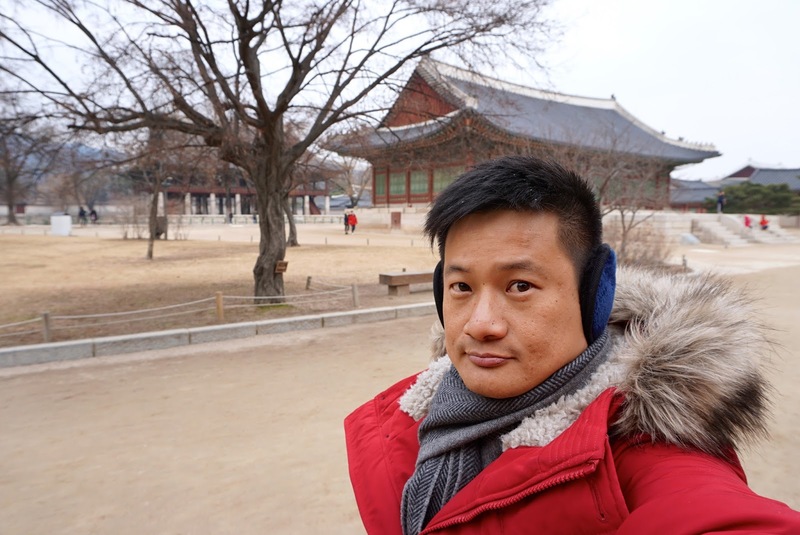 I made the mistake of listening out for “Suwon Fortress” or anything with “Suwon” in it and did not pay attention in counting the bus stops. Without paying notice to the number of bus stops, the scenery outside the bus changed from city to out skirts of the city. 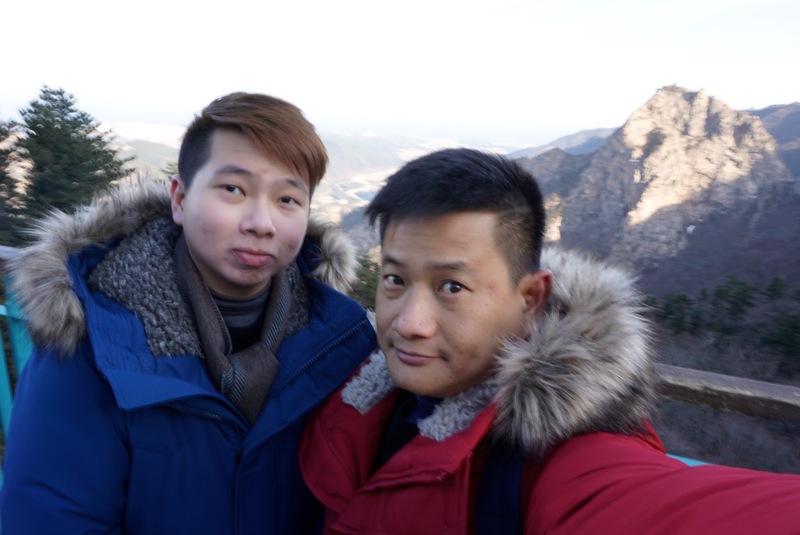 My friend and I finally got to the fortress with help from a local shop keeper, whom pointed out where to take a bus, and counting the number of bus stops that we had zipped by. 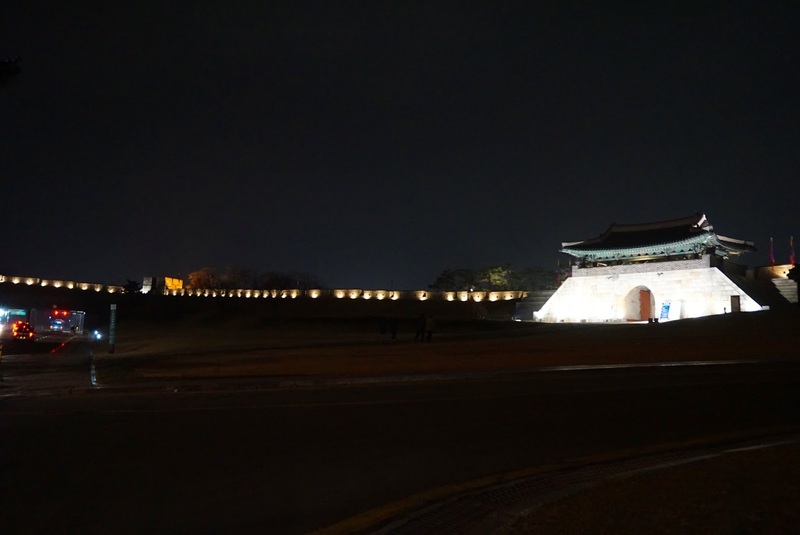 The bus will stop at Paldamun, the Southern gate of Hwaseong Fortress. 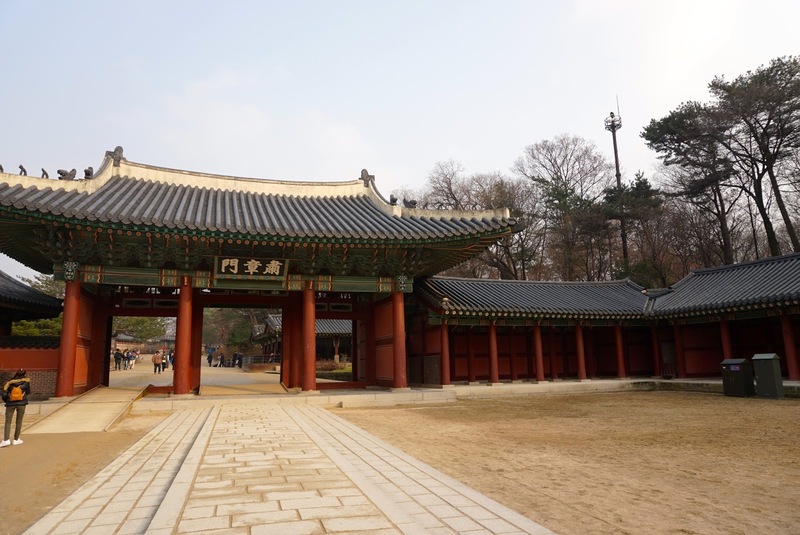 Paldamun is detached from the rest of the gates, located in the middle of the busy city. 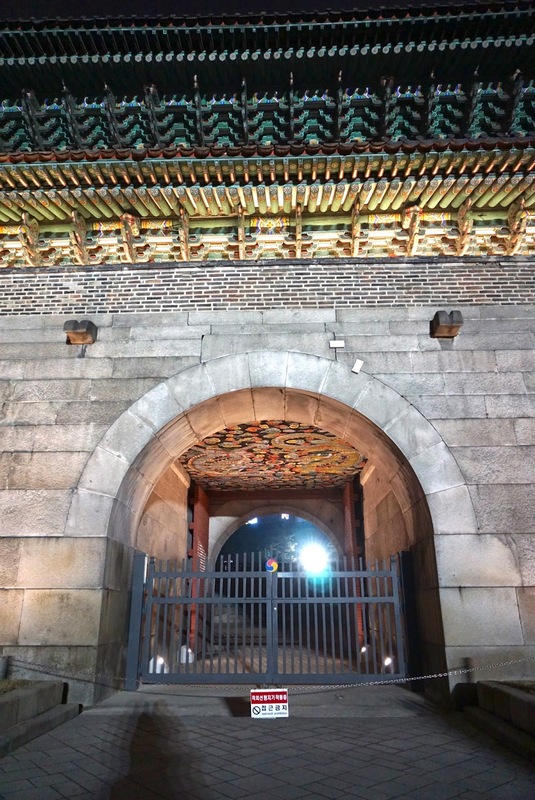 The gate is encircled by a present-shaped wall. 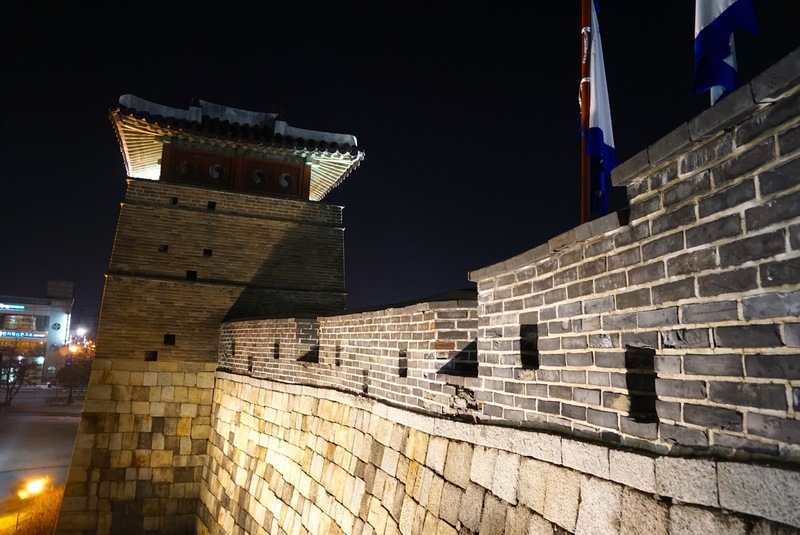 The purpose of this design is to prevent the enemy from attacking the fortress. 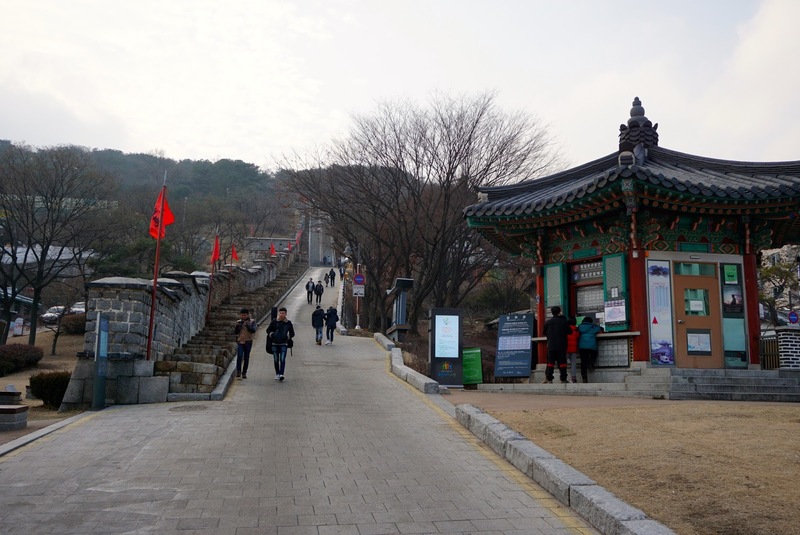 From Paldamun, we headed west towards a tourist information booth, which also doubles up as a ticketing booth for the entrance of the most of the gates (except for Hwaseong Haenggung). 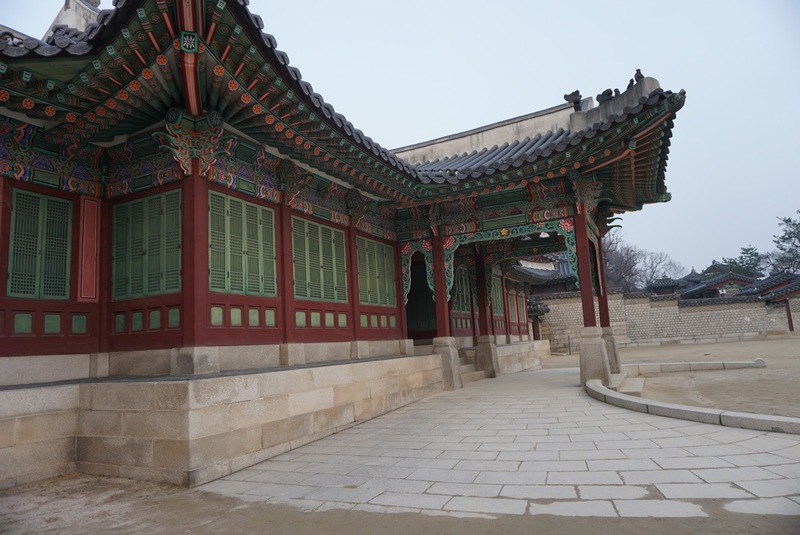 We found out that Hwaseong Haenggung would be closed shortly (thanks to missing the stop and we spent time waiting for the bus to come) and made the palace our first stop. 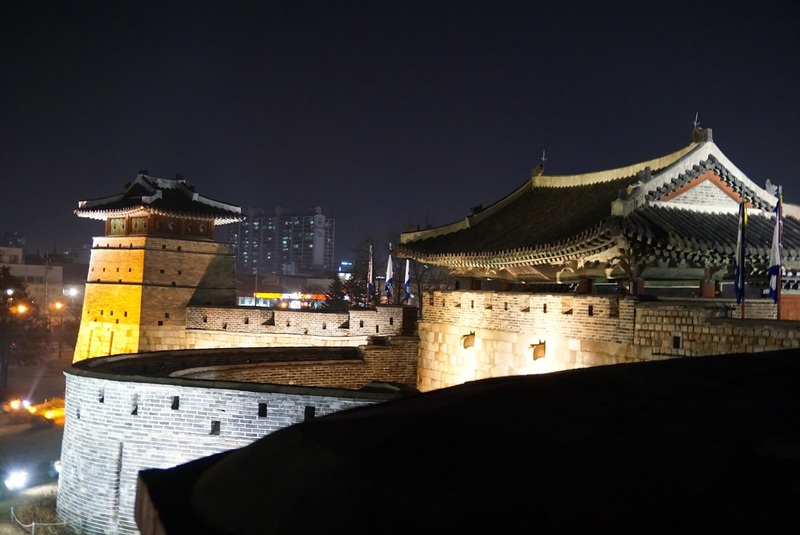 From the information booth, we headed north passing through what seems like a traditional Korean street, towards Hwaseong Haenggung. 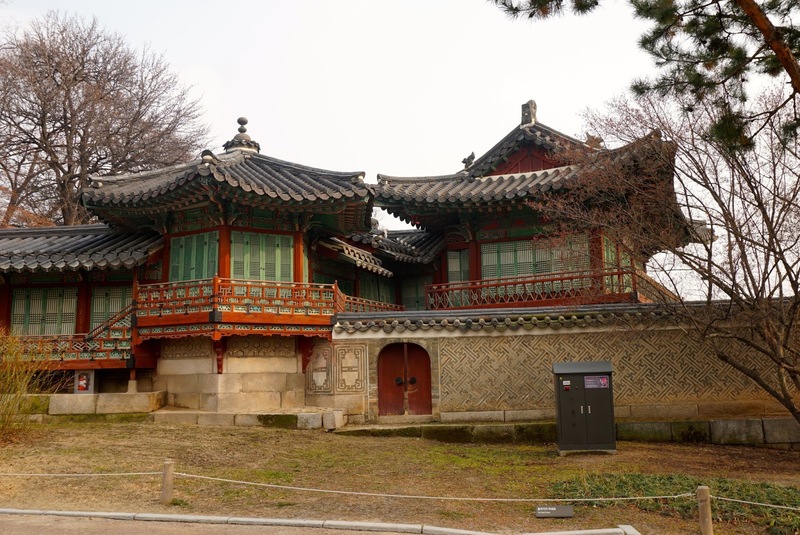 Hwaseong Haenggung was a temporary palace used by the Royal Family as a retreat during the war in the Joseon Dynasty. 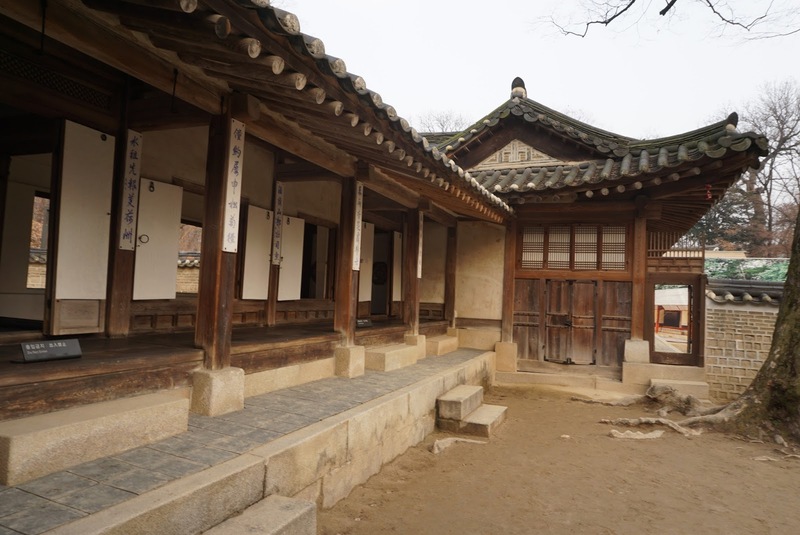 Other then serving the purpose of a temporary shelter during the war, King Jeongjo stayed in this palace during trips when he paid respect to his father’s tomb. 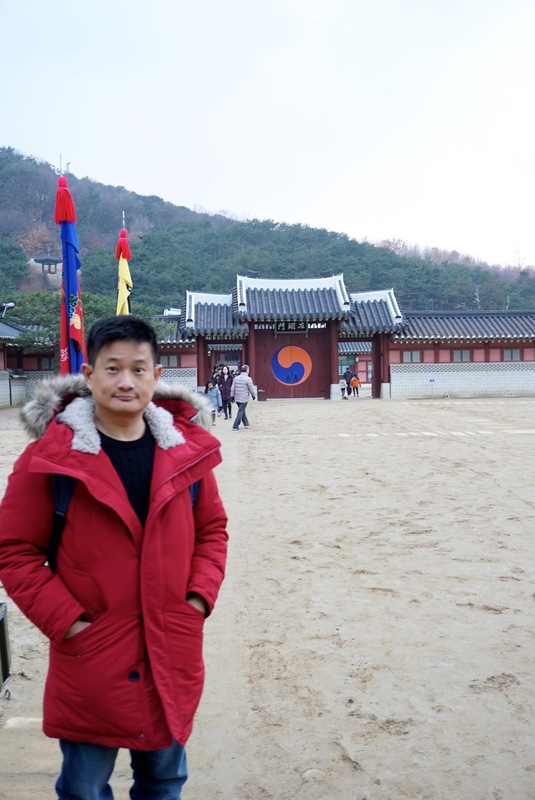 As we arrived at the palace, we noticed that there was no one at the entrance to collect any tickets and the ticketing booth was closed as well. 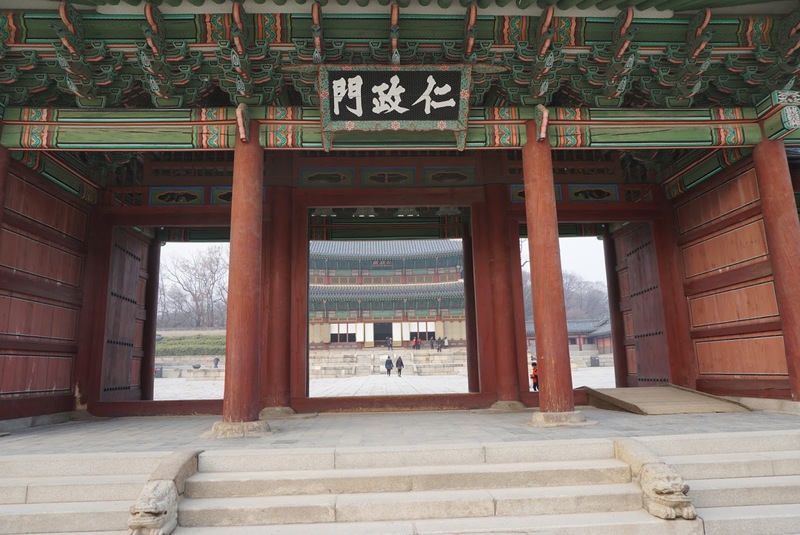 To get to the audience hall one has to pass through 3 doors, with Sinpungnu as the main door to the palace, followed by Jawikmun and Jangyangmun. At our visit Sinpungnu is still open, we ventured into the palace grounds for a quick visit and to snap some pictures before they are closed. 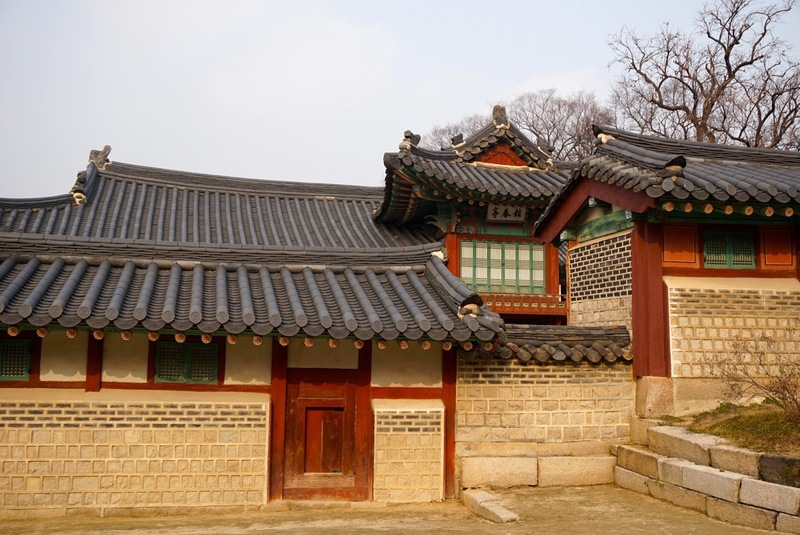 Compared to the other palaces in Seoul, Hwaseong Haenggung is a rather small palace. 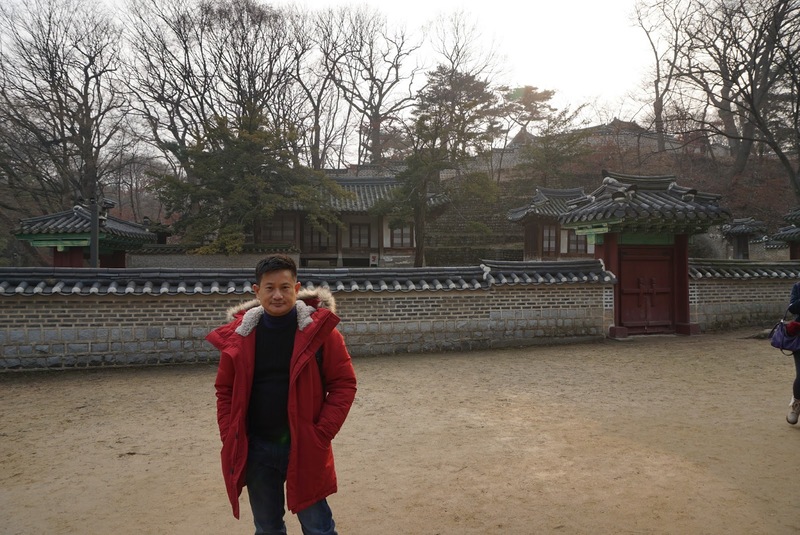 Despite its size, the palace still has essentials of a palace such as a front yard, a mid yard and a back yard. 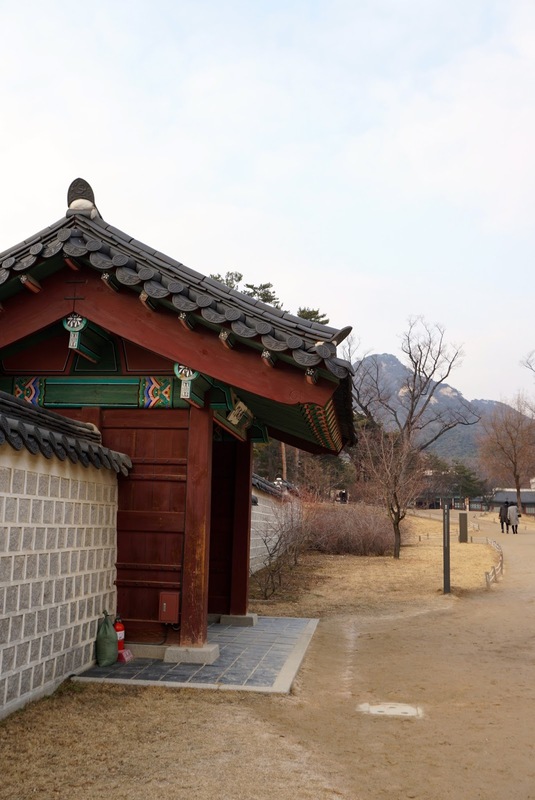 Visitors would have to pass through other 2 doors before they reach Bongsudang, a building at the rear yard of the palace where royal audiences are granted to visitors to the King. 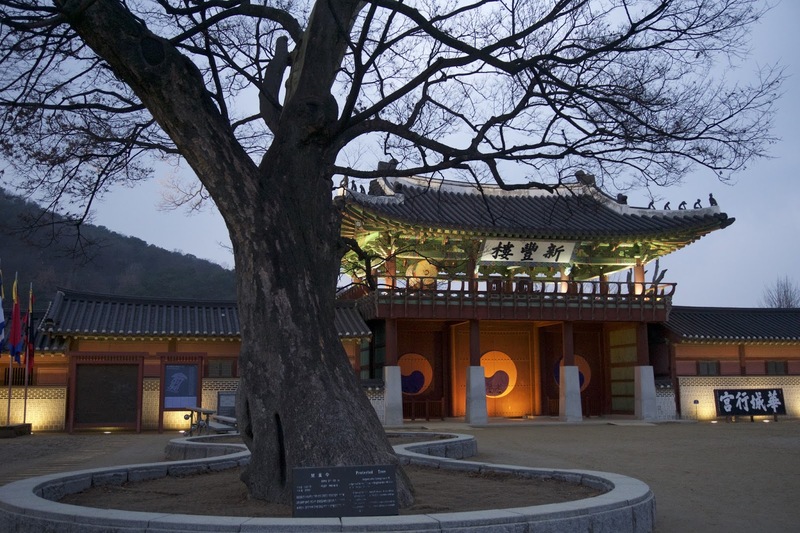 Bongsudang is also used as a banquet hall for the celebration of the King’s Mother’s 60th Birthday. 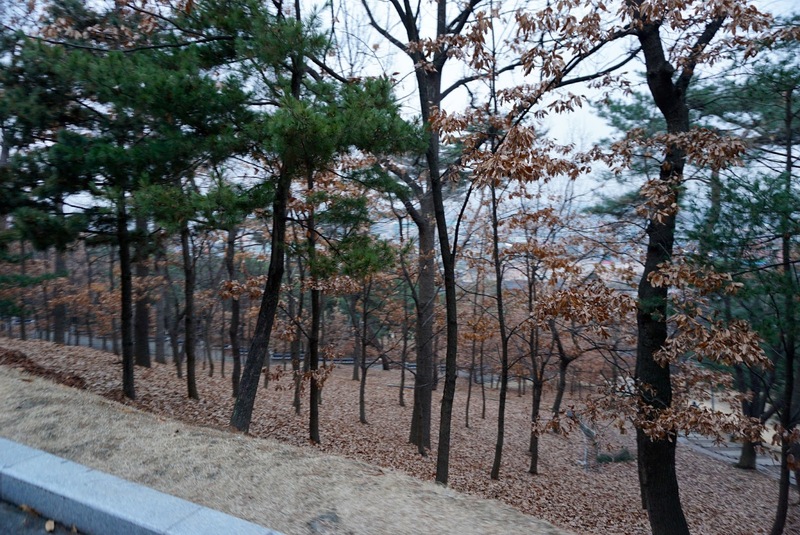 Facing Bongsudang, to the right of the building is the King’s rest area known as Naknamheon. The palace was about to close, we did not get to visit the buildings here. 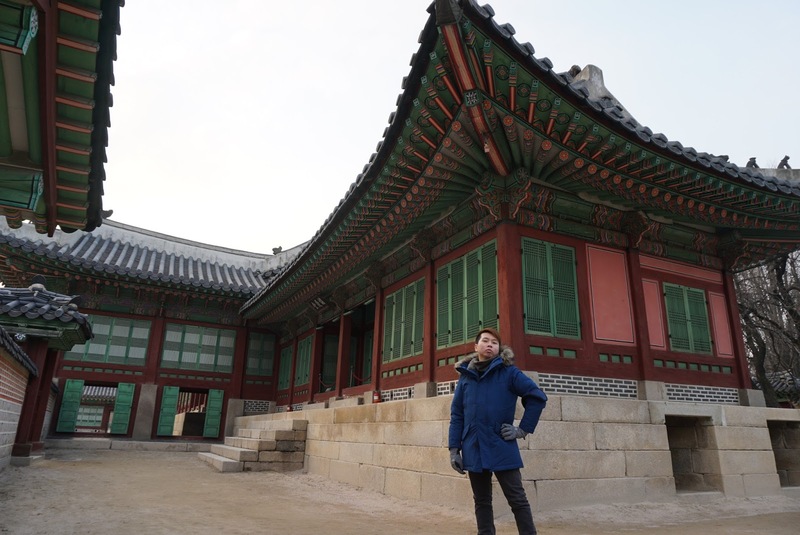 We did managed to quickly visit the other parts of the palace before they are closed. 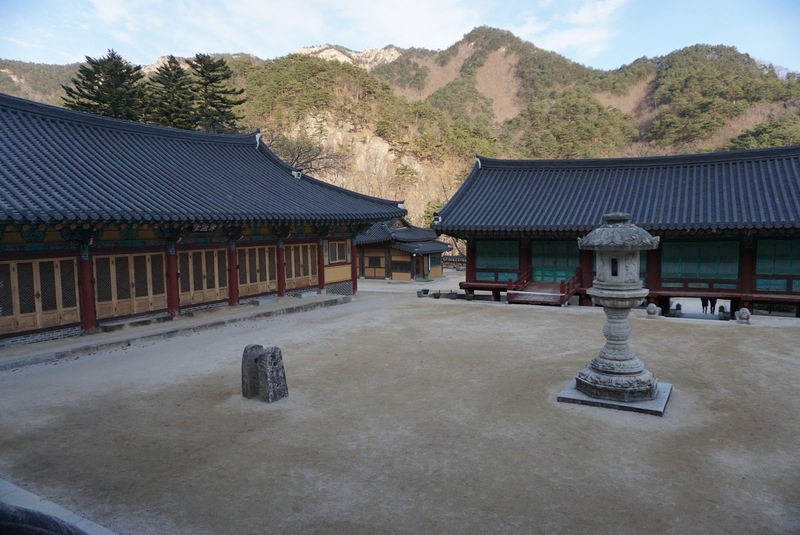 To the left of Bongsudang, in a separate courtyard connected to the main courtyard by a low wall and low door, is the Yuyeotak. 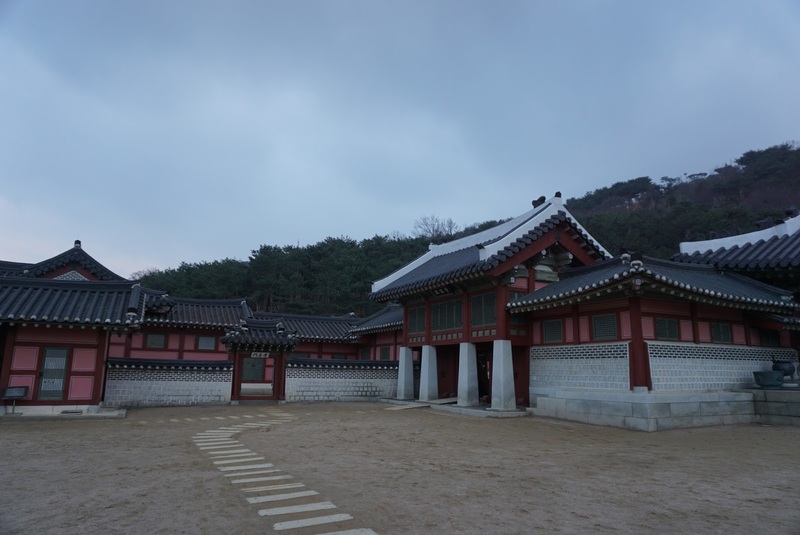 This is the area where the King used to conduct interviews with his subjects during his stay in Hwaseong Haenggung. 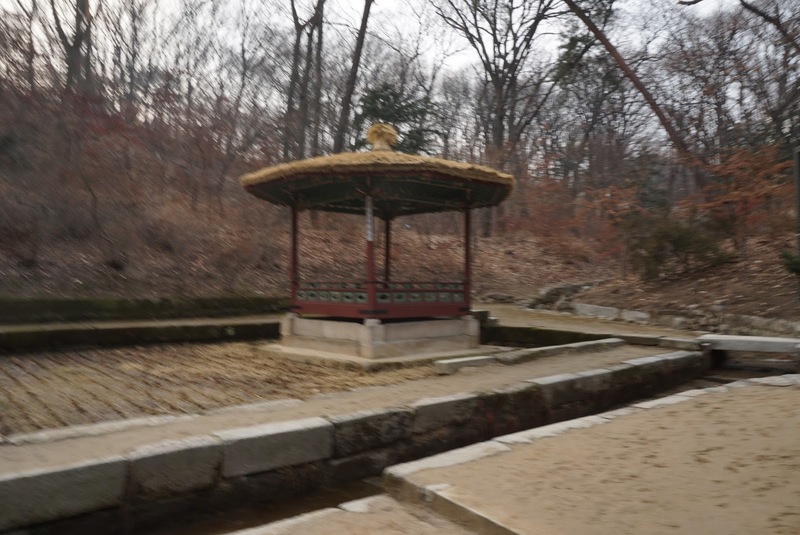 South of Yuyeotak, near to the entrance to the palace complex is where the Oejeongniso is located. 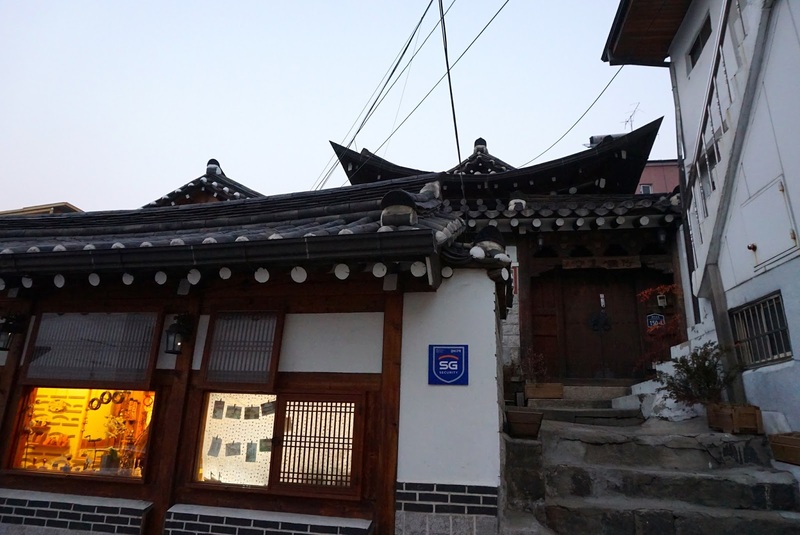 Oejeongniso is the office for the temporary officials whom were responsible to organise various events. 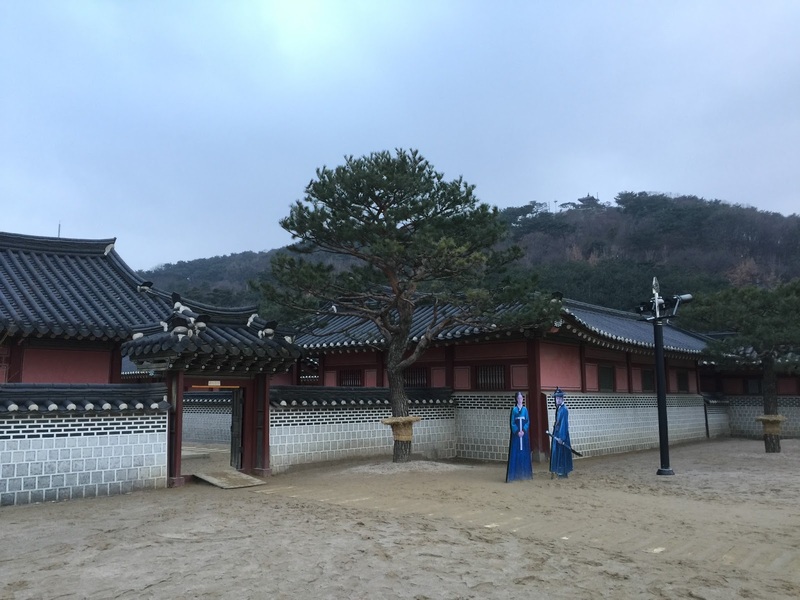 Further south is where Bijangcheong is located, serving as the quarters to the staff member to the King. 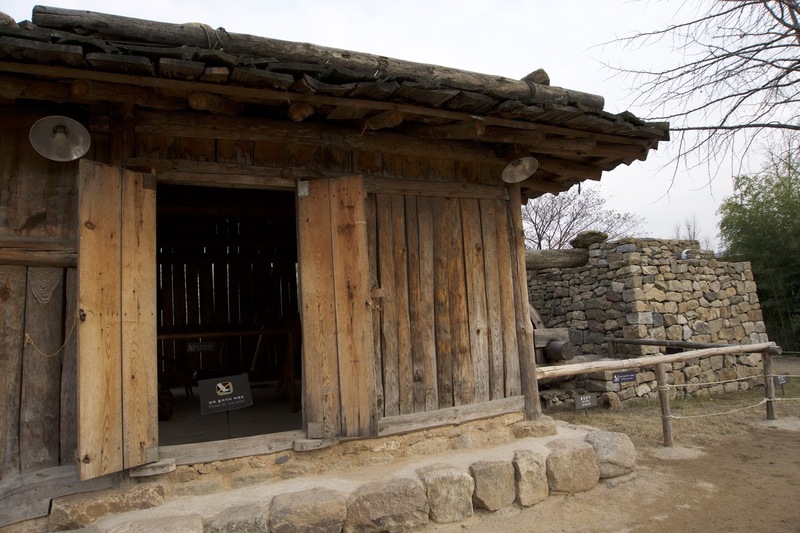 Still further south of the Bijangcheong, nearer to Sinpungnu, one will be able to located the Seoricheong, an office for the official who is responsible for issuing, receiving and recording documents, very much akin to the Post Office for the King in modern time. 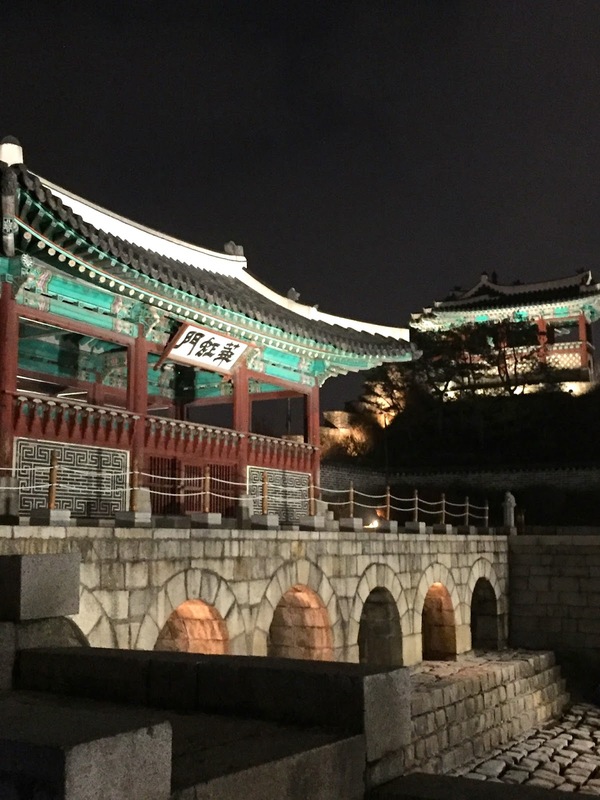 As the palace is near its closing time, my friend and I hurried out of the palace before their closing time, missing out on the other parts of the palace. 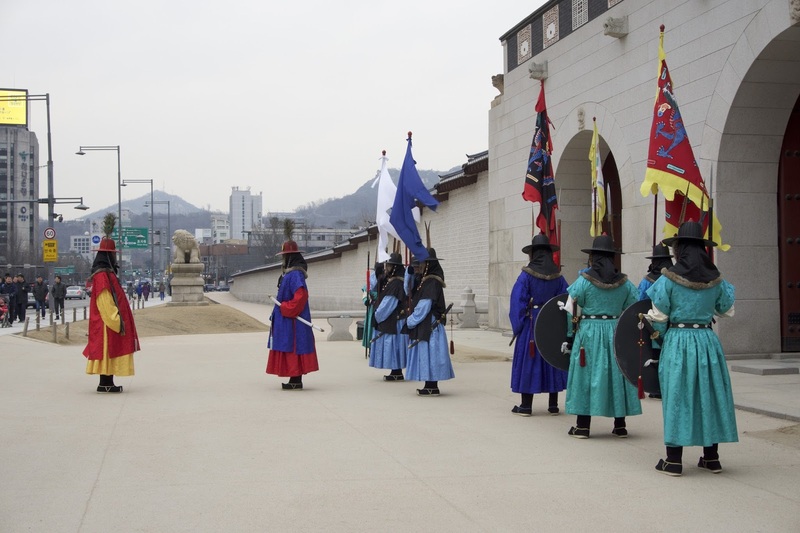 Exiting the palace grounds, we plan to visit Seojangdae, the Western Command Post situated on a hill at the back of Hwaseong Haenggung and is the highest command post along the wall Suwon Fortress Wall. 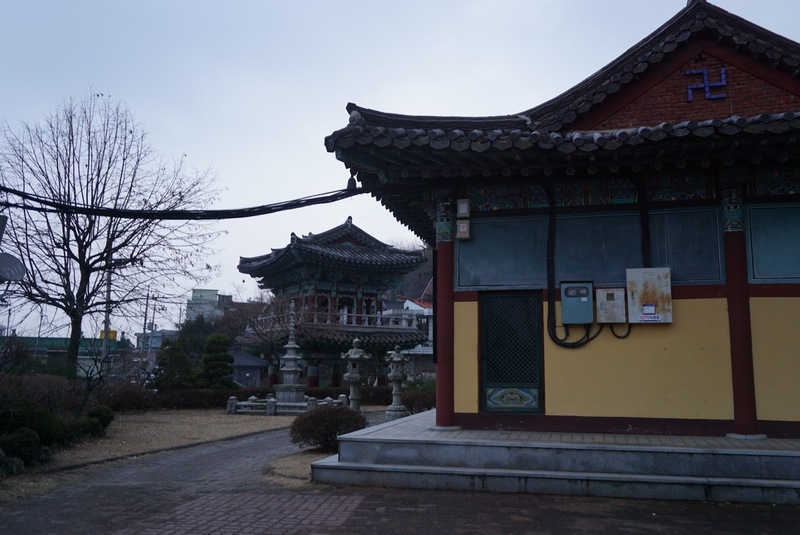 As we were walking up to the mid-point of the hill, we spotted a small red shrine with its doors shut. 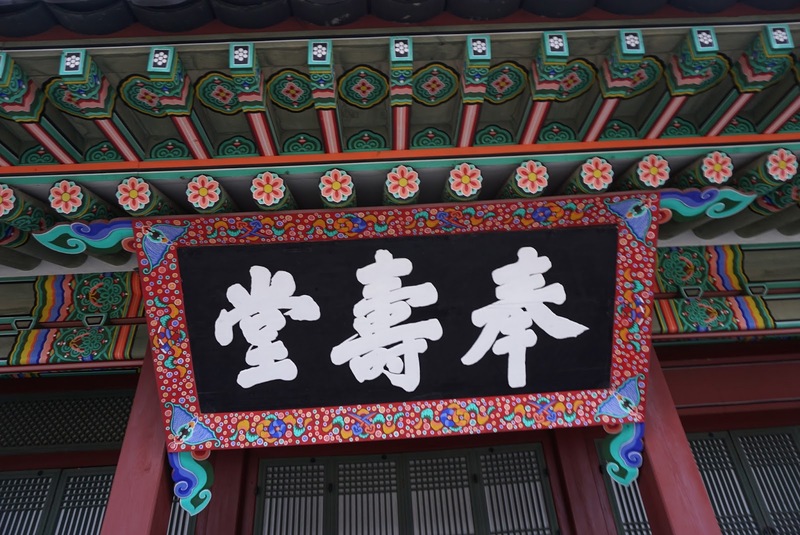 King Jungjo specially decreed the Sungshinga Shrine to be built in honour of the god for his protection of the people in Suwon. As the shrine is closed, we merely snapped some pictures of the external of the shine. 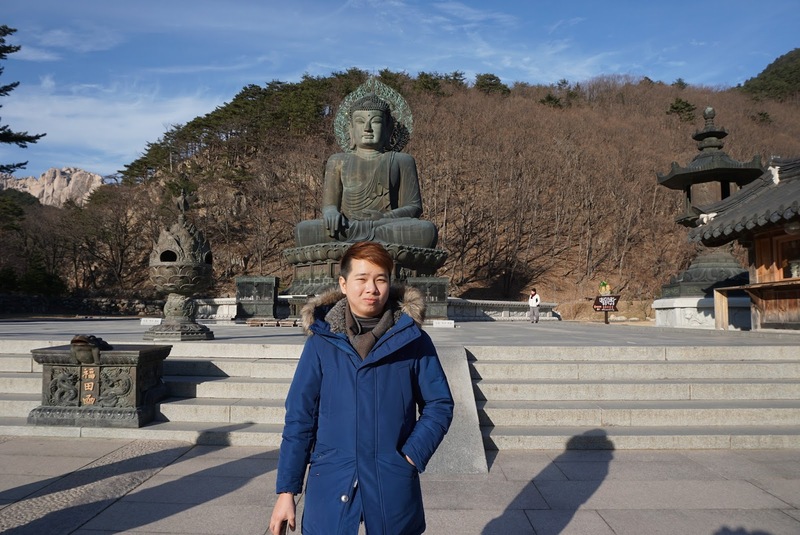 When we were about to continue our ascent to Seojangdae, we spotted a huge Buddha statue and decided to detour to visit the statue. 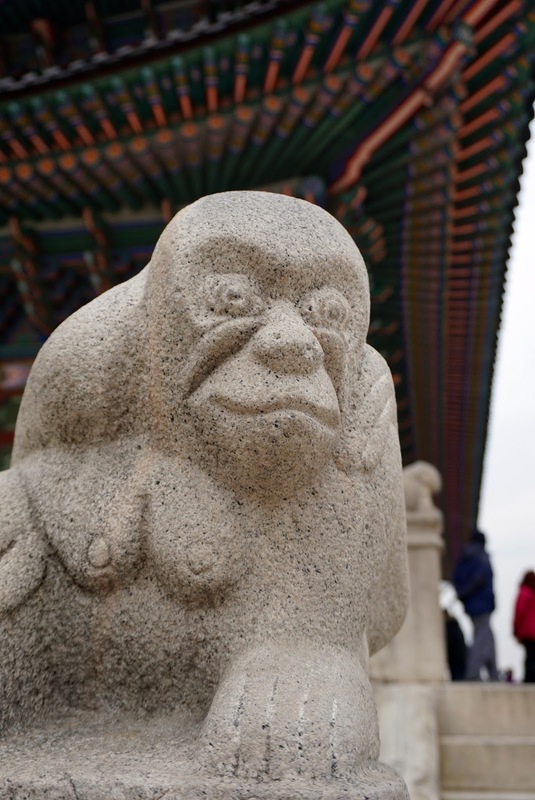 This statue is situated within the grounds of Daeseungwon Temple. 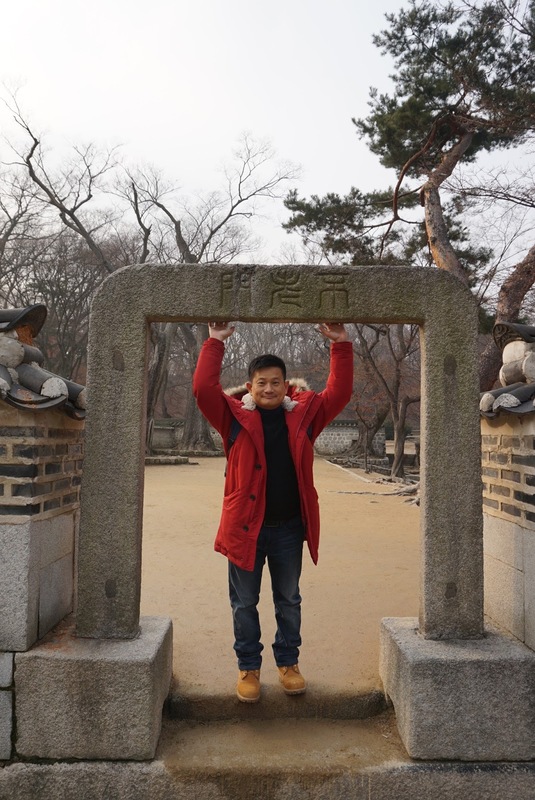 As the statue is situated outdoors and there are practically no barriers surrounding the Buddha Statue, we entered the temple grounds and paid our respect to the statue. 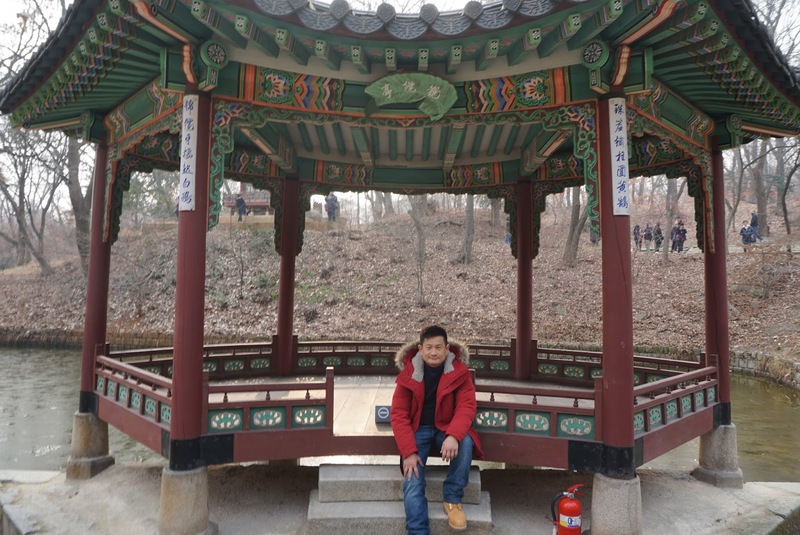 It felt tranquil in a cold winter evening visiting Daeseungwon Temple, mainly there are hardly any crowd other than another local family visiting the temple to pay their respects to the Buddha. 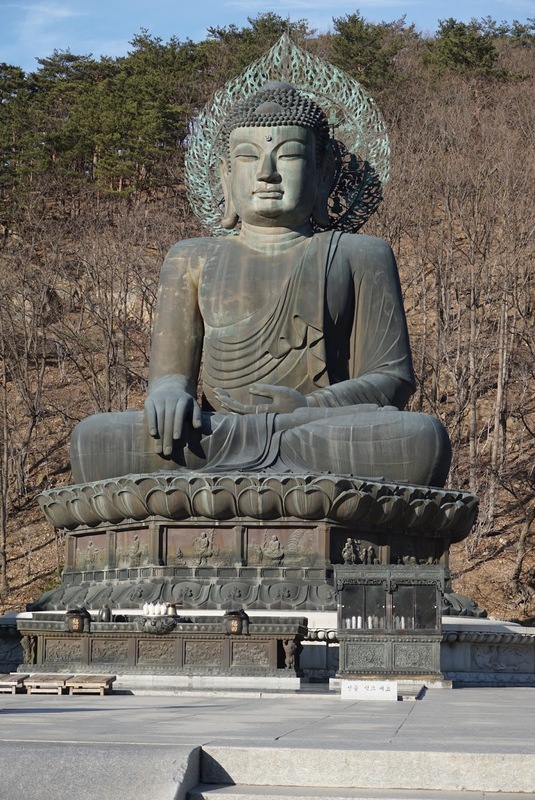 There seem to be a small shrine at the base of the Buddha. 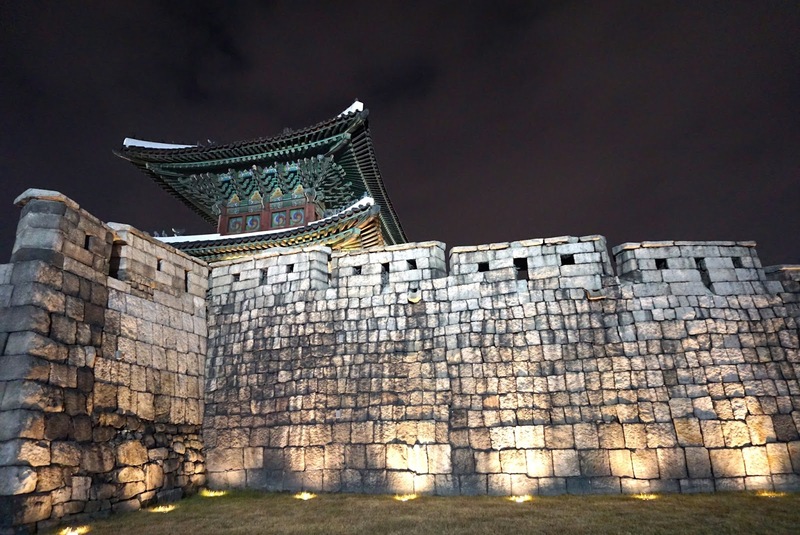 As the sky is turning dark, we decided to give Seojangdae a miss and head towards Suwon Hwaseong Fortress instead. 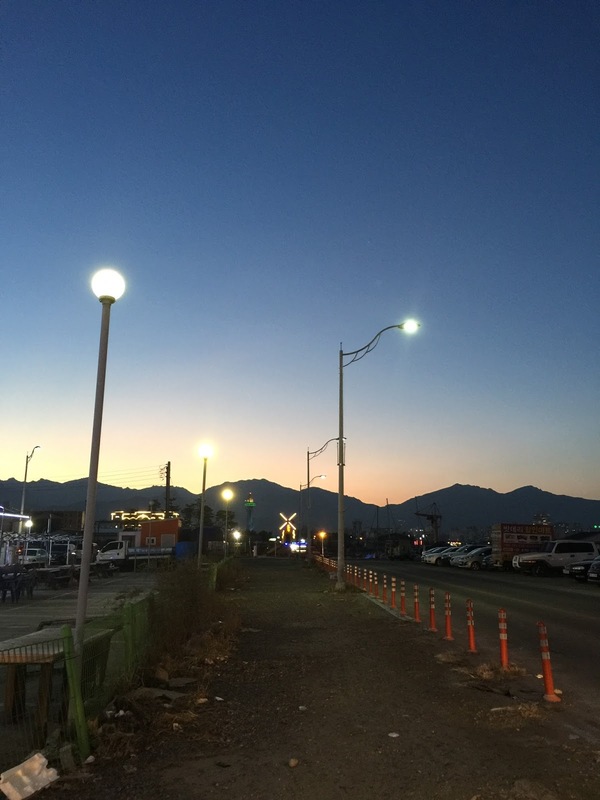 As we were walking, we decided to grab dinner at a nearby restaurant. After walking for about 20 mins, we came across a restaurant which seemed to be opened. We entered the restaurant to find that we were the only foreigners (again). 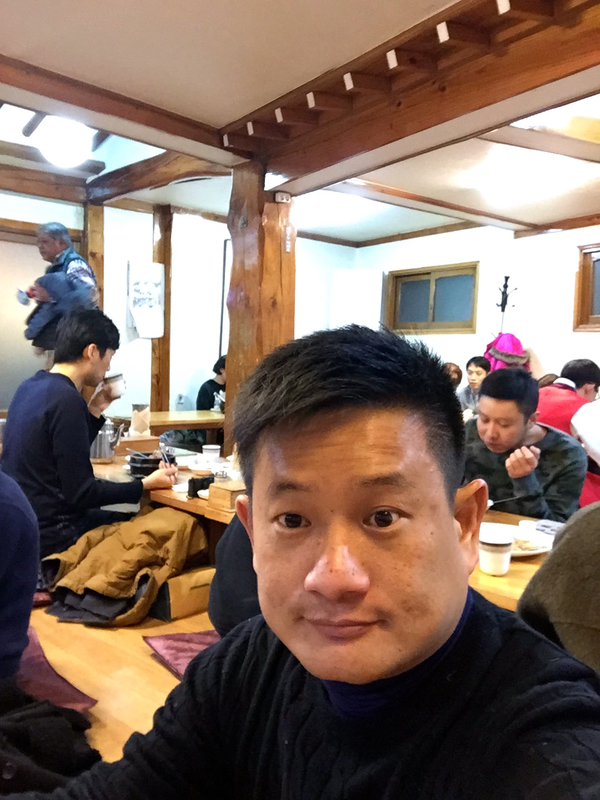 When we asked for the menu, the owners of the restaurant seem to know that we are not locals and immediately passed us a menu with pictures and English writings on it. 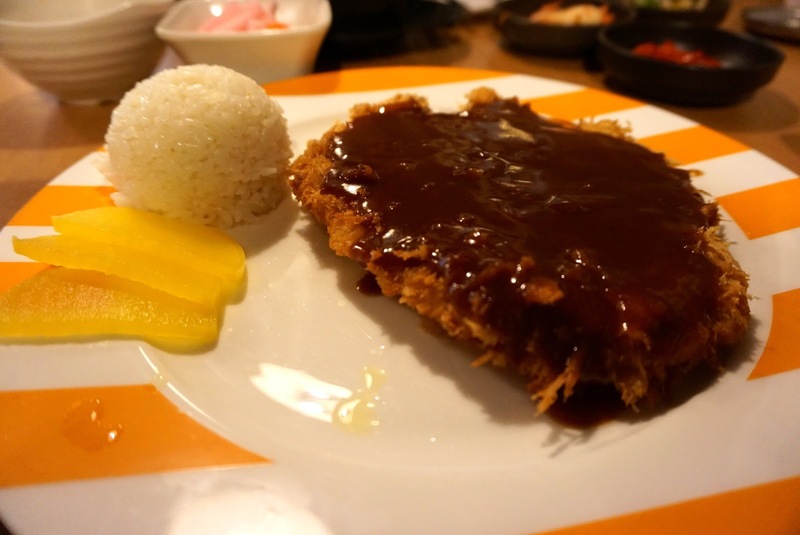 We ordered a King Pork Cutlet and Bibimbap. 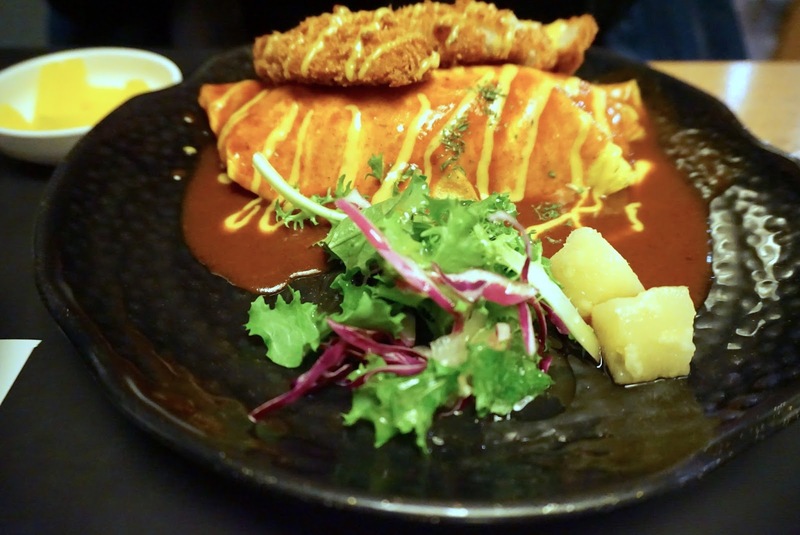 The food was delicious and the servings are definitely huge! For a size of the that serving, the bill did not burn a hole in our pockets. 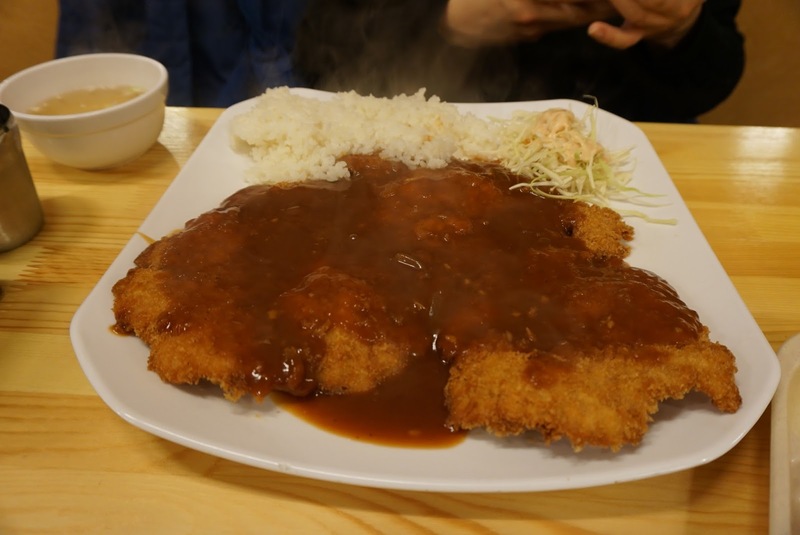 My friend had the Pork King Cutlet. The portion is definitely huge! 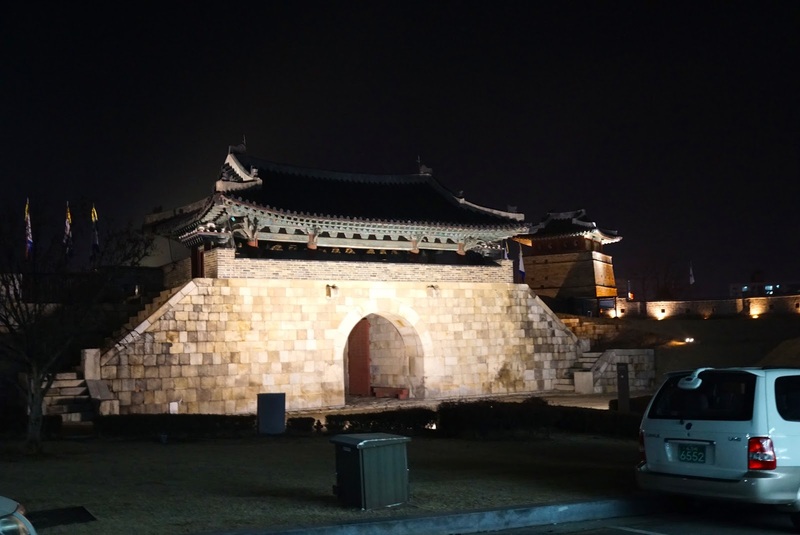 After dinner we continued walking towards Hwaseomun, the Western Gate of the Suwon Fortress. The magnificent gate is just the beginning of a series of gates and guard posts awaiting for us to explore. 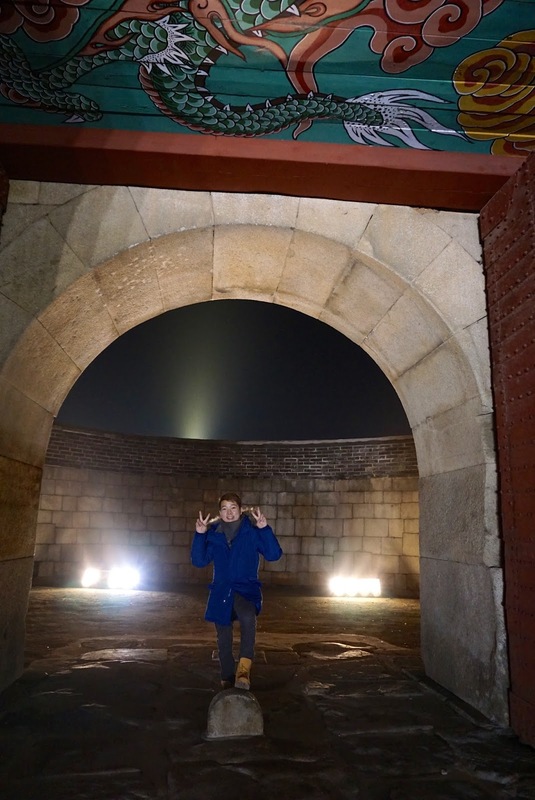 We intended to move clockwise ending up in Hwahongmun before heading back to Seoul to rest for the night. 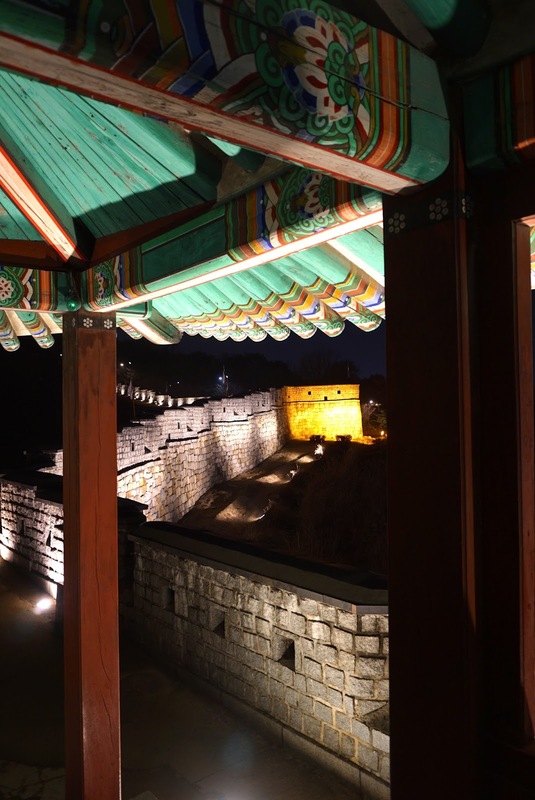 As the sun has already set, when we arrived at Hwaseomun, the night lights has already been lit up, displaying the grandeur of the Western Gate and the walls that surrounds the city. 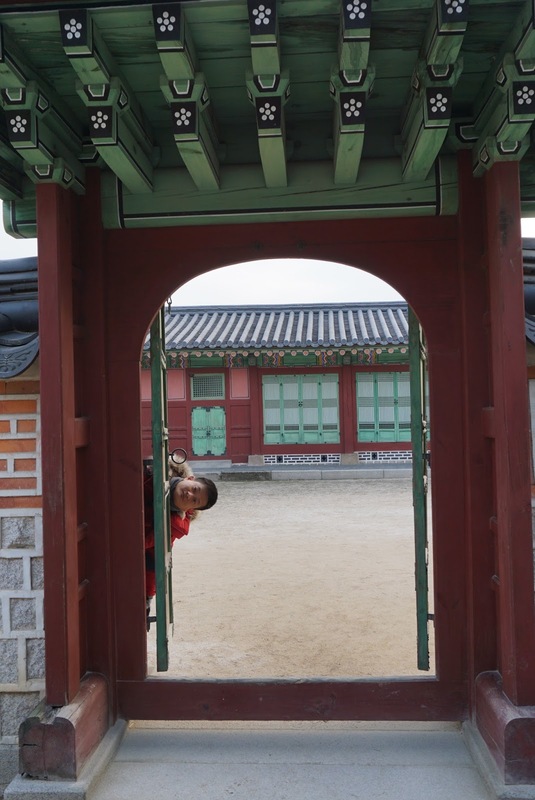 From inside the city, Hwaseomun seem like an ordinary gate. 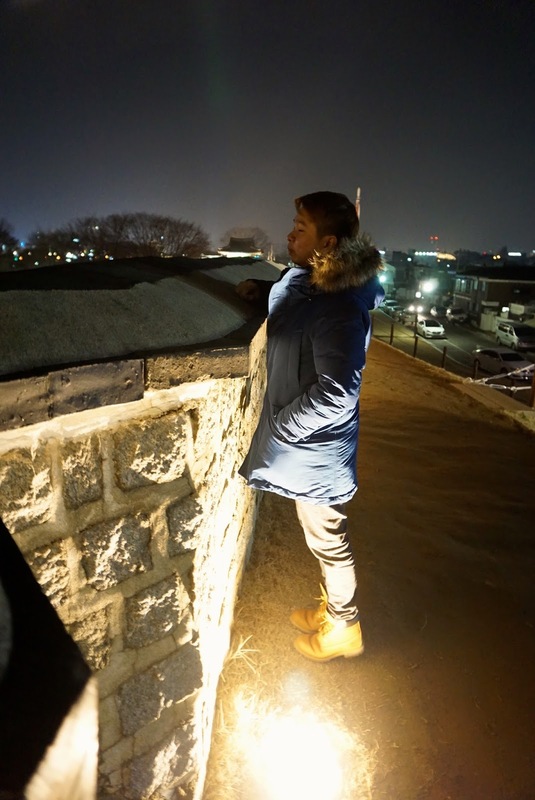 This impression soon change once I scaled to the top of the wall (it opens 24/7), where a crescent extension opened at one end can be seen from the top, facing the outside of the wall. 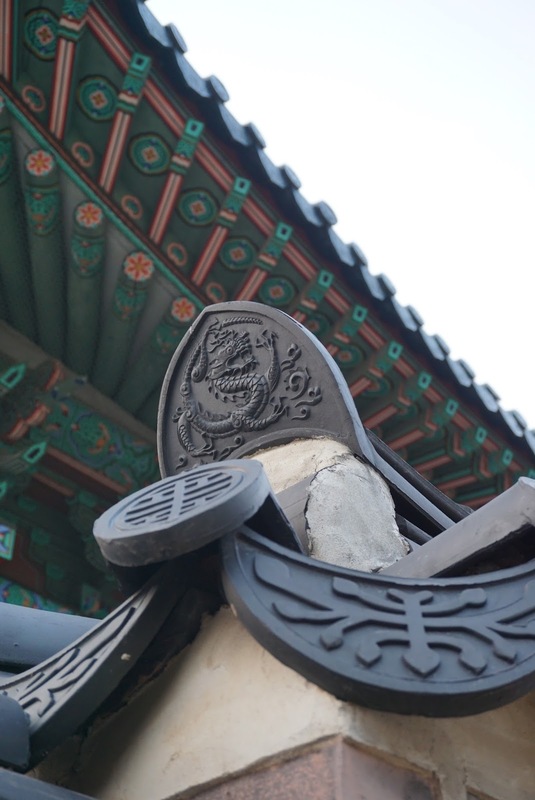 The purpose of this crescent is to serve as a protective barrier to prevent intruders from entering the city gate. 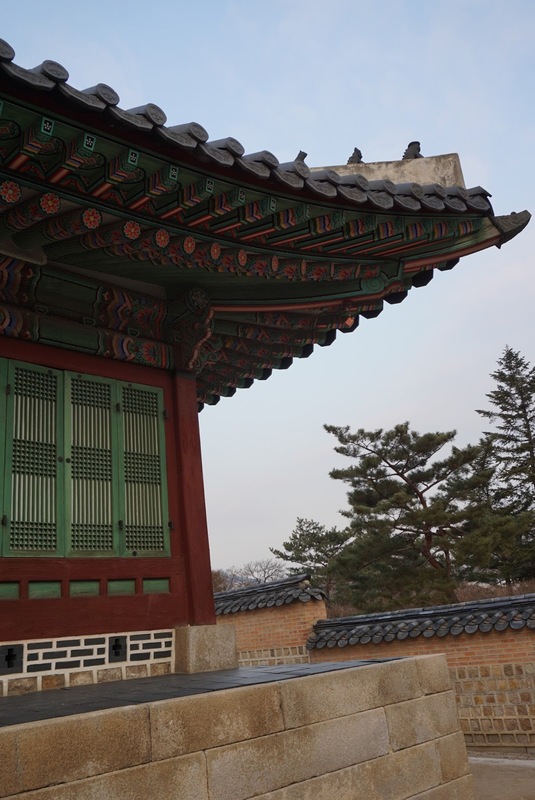 From the top of the gate, very distinct Korean architecture can be seen engraved onto the ceiling and the roof of the gate. 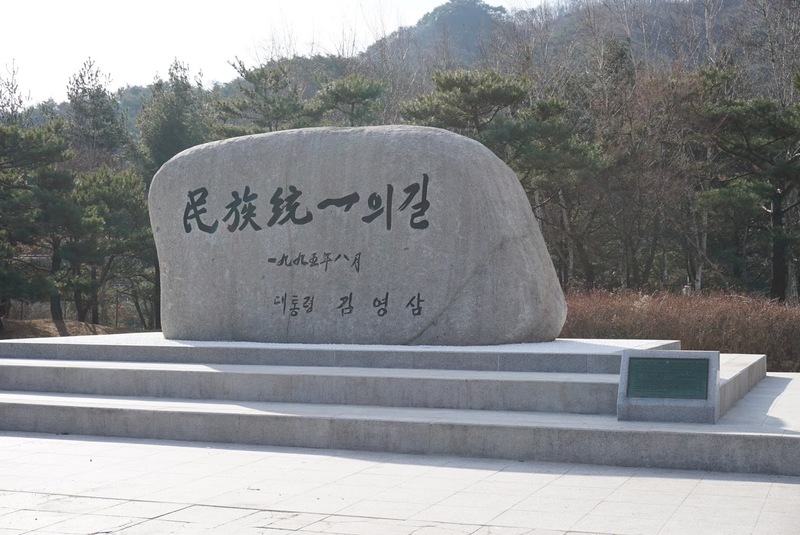 Instead of heading clockwise, my friend suggested for us to visit the immediate anit-clockwise guard post, which is less than 100m from Hwaseomun. 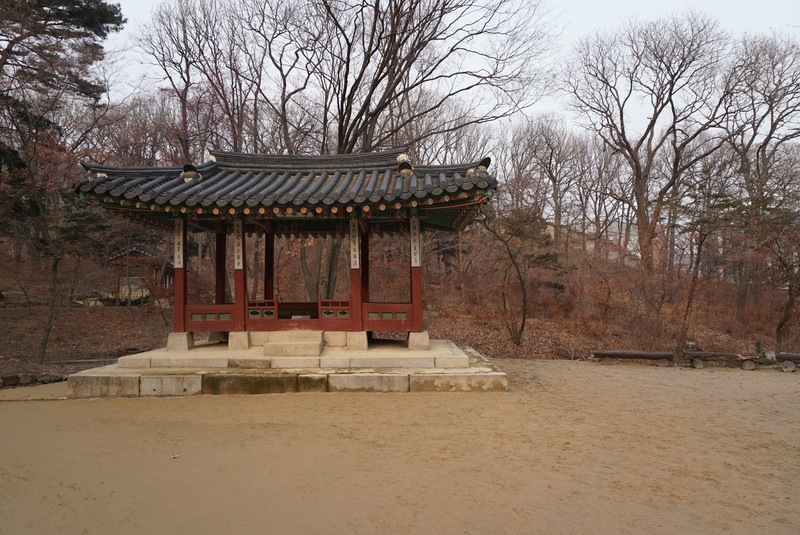 The Seobukgangnu Pavilion or the Northwestern is positioned on an elevated plain. 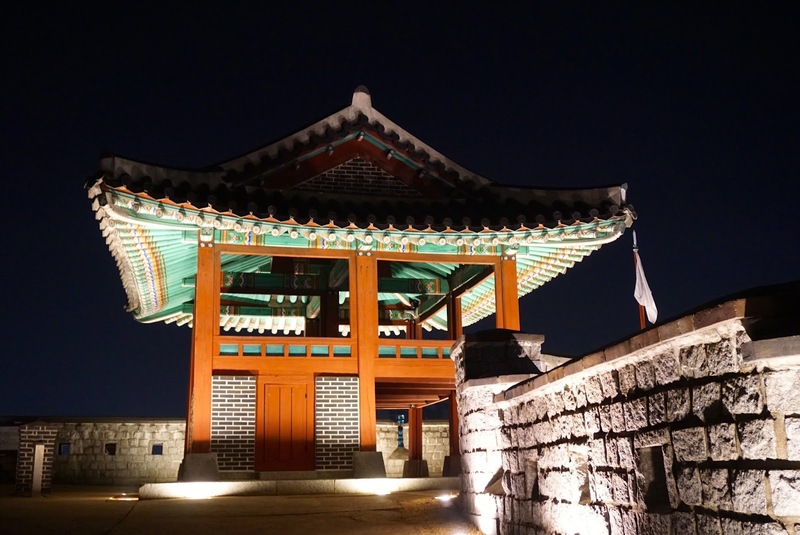 It served as a watch tower as well as a resting point for troops in the olden days. 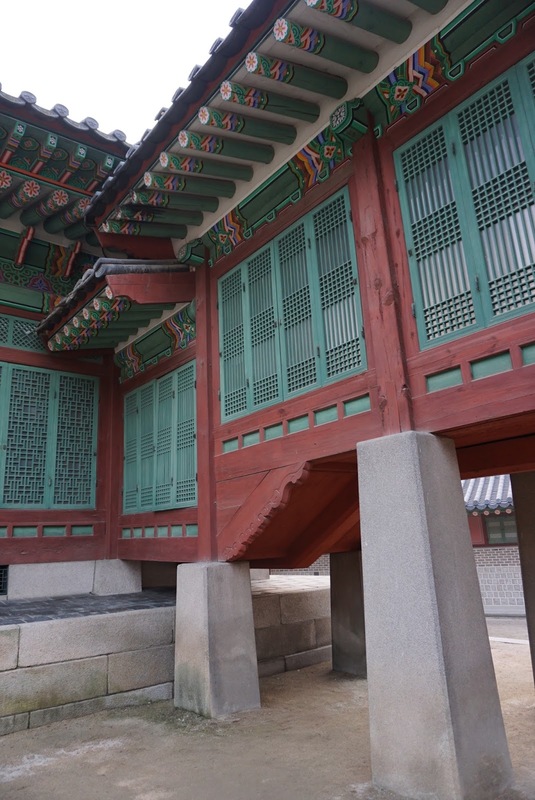 The 2 storey open pavilion is painted in the traditional Korean green colour that is common in most older Korean buildings. 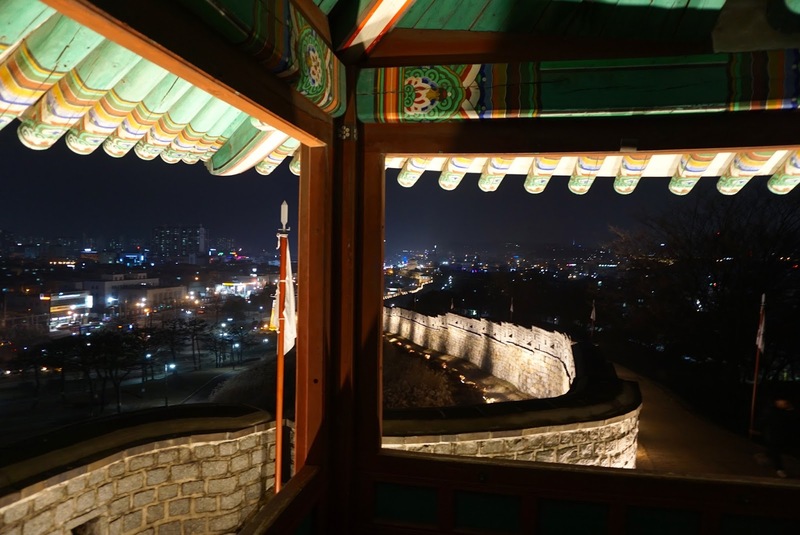 The view from the second level of the pavilion gives the visitor a glimpse of a section of the fortress walls, especially at night where one can see the Fortress walls being illuminated for miles. 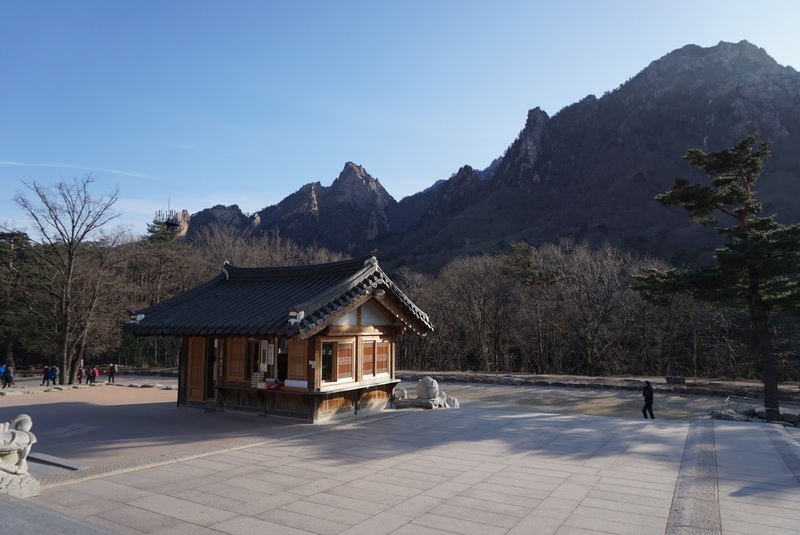 The view is simply magnificent, coupled with the night time where the number of visitors dwindles to a mere handful, there is a sense of tranquil and zen here at Seobukgangnu. 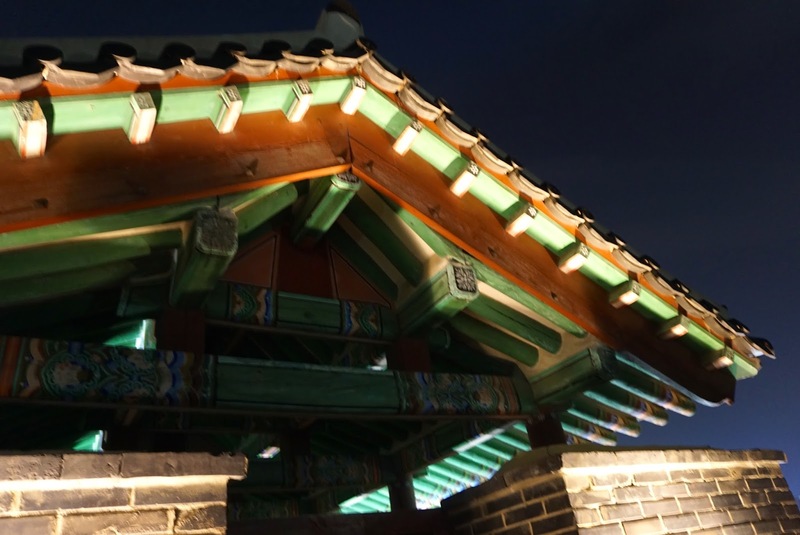 The pavilion remains open at night, however one is expected to remove ones’ footwear before getting on the stairs to the 2nd level of the pavilion. 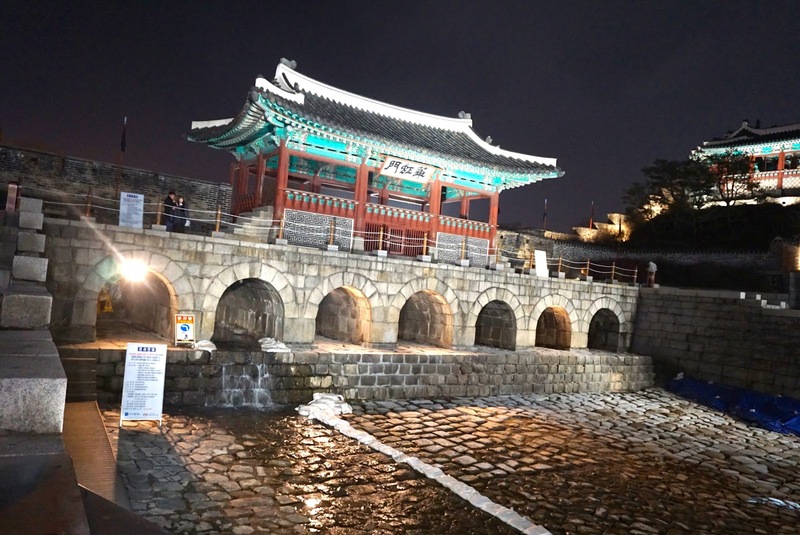 We continued our walk along the walls of the fortress, passing by Bukseoporu, the Northwestern Cannon Fort (which was closed at the time of our visit) and Bukseojeokdae, the Northwester Guard Platform towards our next stop – Janganmun. 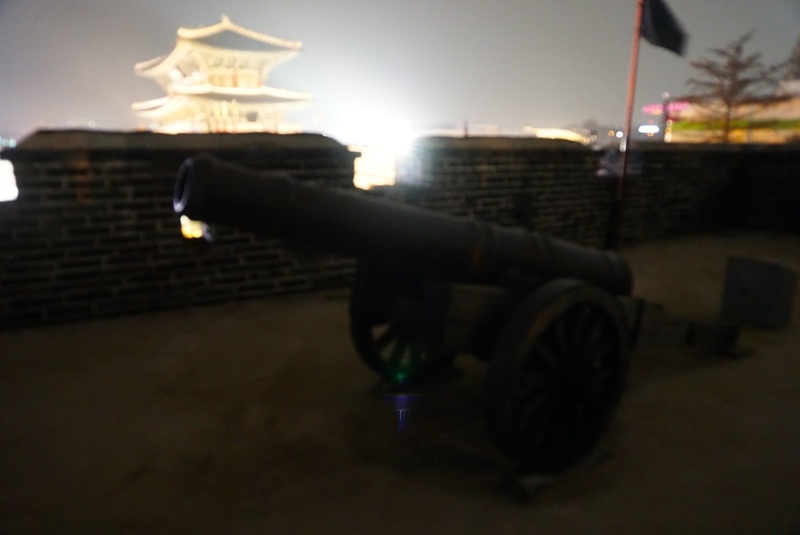 There is a cannon at Bukseojeokdae. 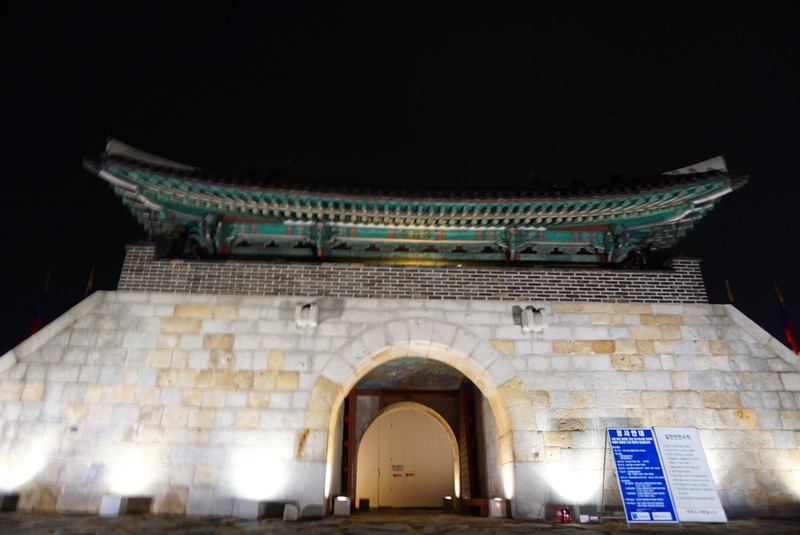 Janganmun is the Northern Gate and also the main entrance to the city, as the King would arrive from this entrance during his visit. 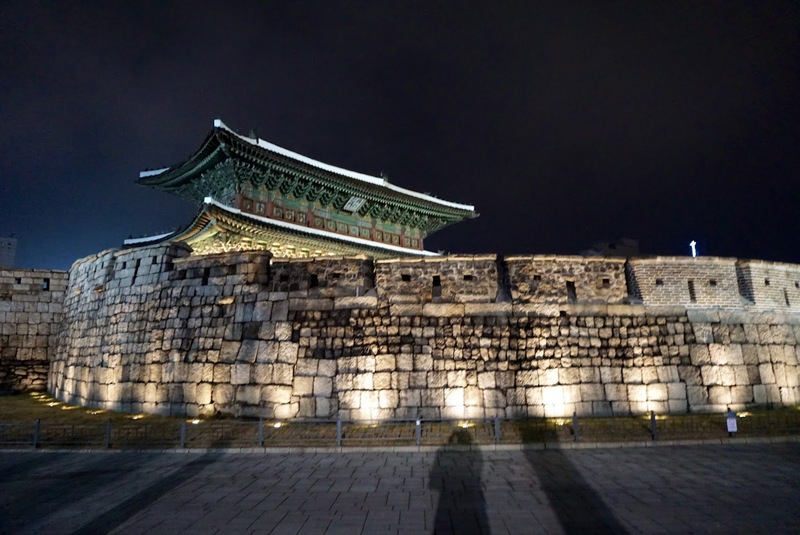 The 3-storey Janganmun is largest of the 4 main gates to Suwon Hwaseong Fortress. 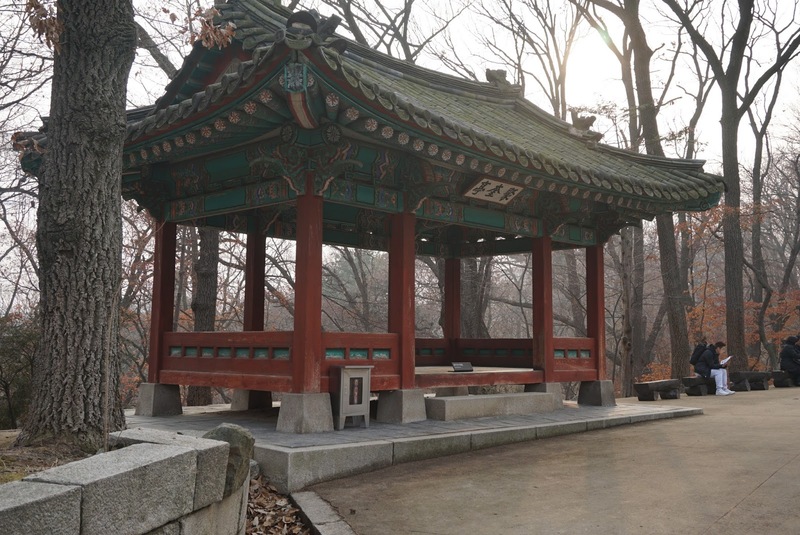 This structure departs from the rest of the gates where in place of a crescent extension, a semi-circular extension complete with a pavilion serving as a watch tower was constructed before the main entrance of Janganmun. 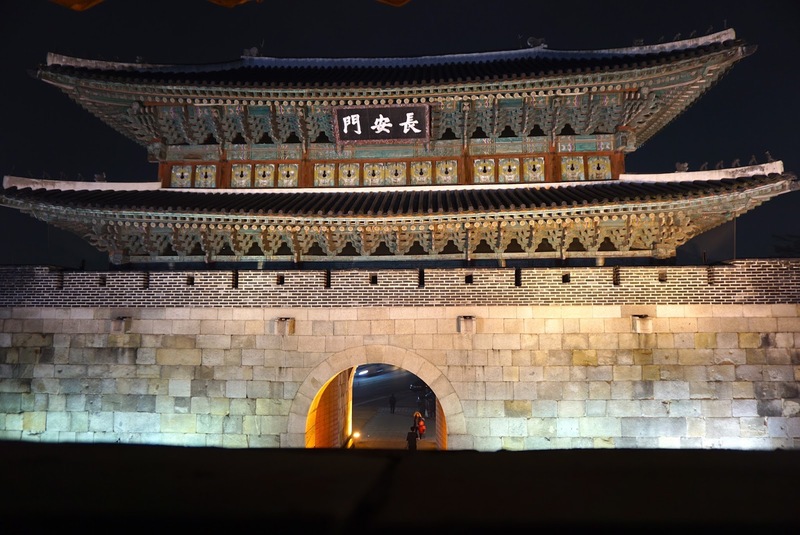 From the protruding extension, one can feel the grandeur of Janganmun gate. 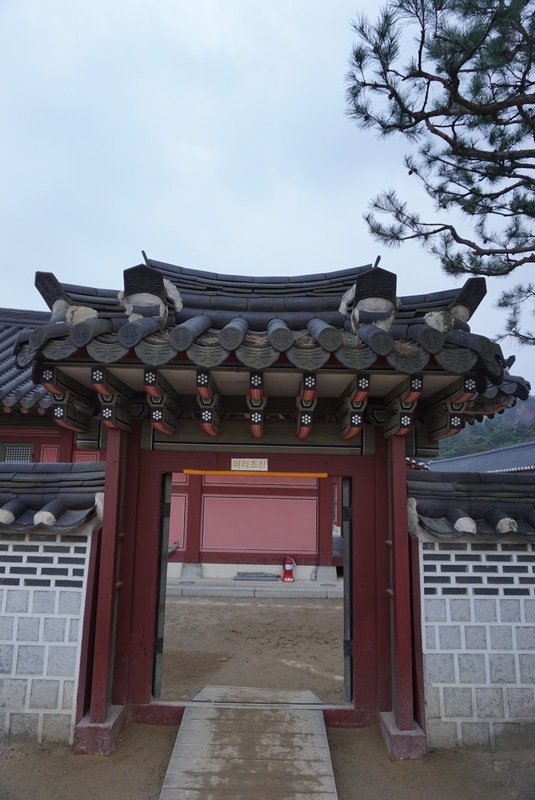 As gate was closed during our visit, we could not enter the upper levels of Janganmun. 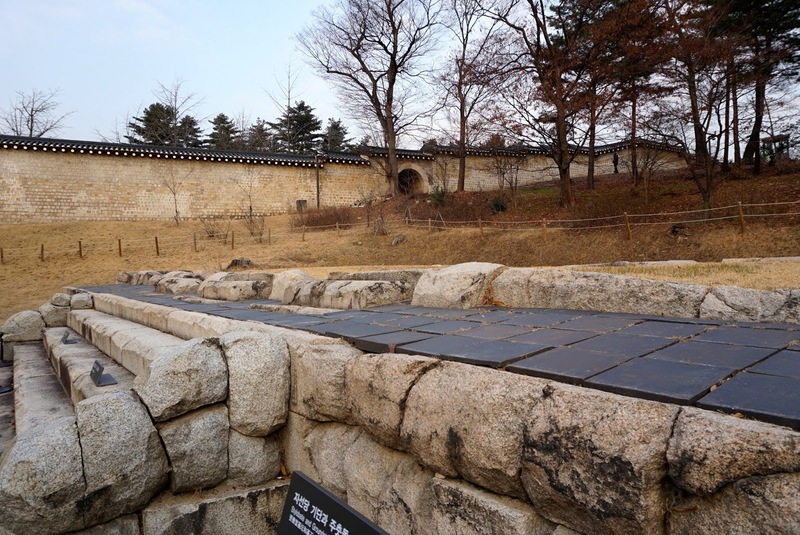 Moving clockwise pass Janganmun is another Cannon Platform fortifying the Main entrance to Suwon. 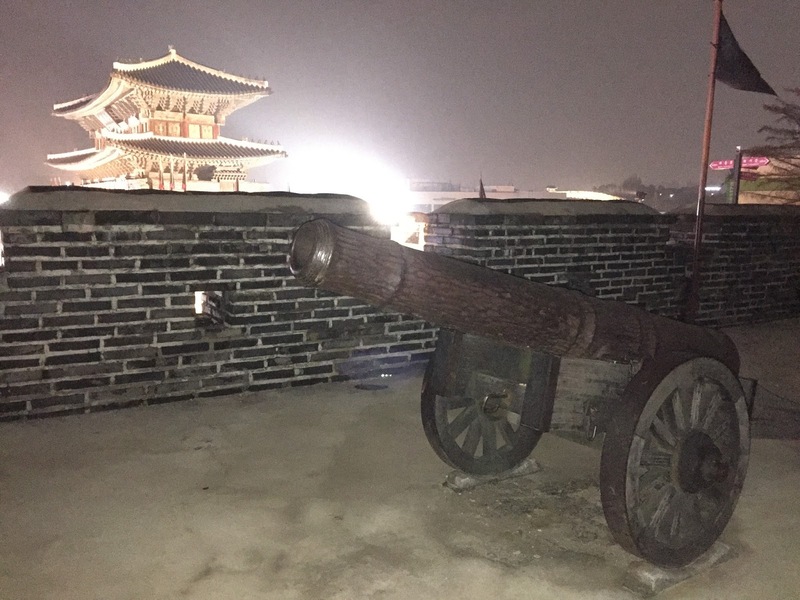 One can spot another cannon at Bukdongchi, the Northeastern Turret). 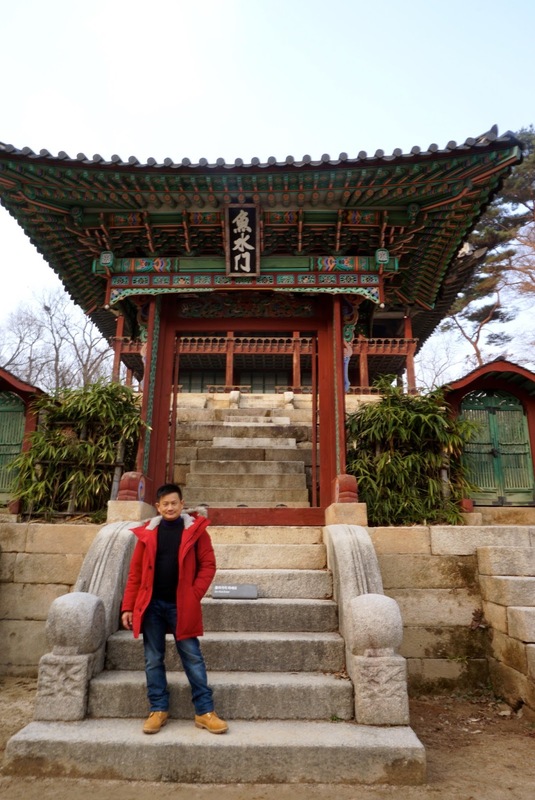 We continued our walk clockwise towards our next stop – Hwahongmun, which was supposed to be our final stop before heading back to Seoul. 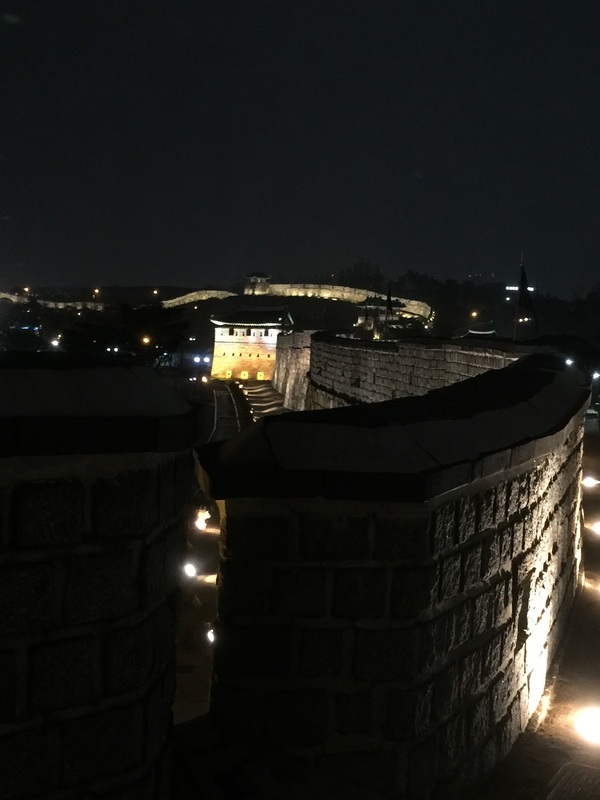 Instead after visiting Hwahongmun, we decided to continue walking towards the Archery centre as the walk was pleasant and more importantly the view of the night fortress wall is simply breathtaking. 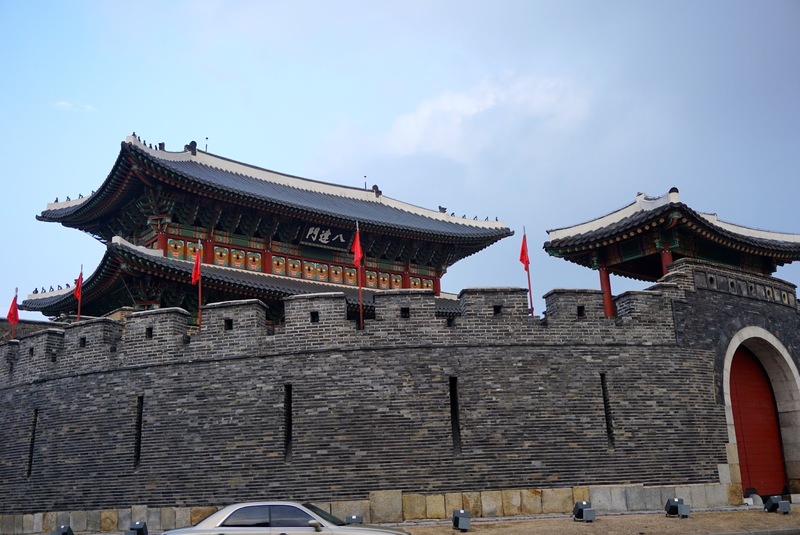 Hwahongmun is the one of the 2 flood gates to the city, being the Northern one. 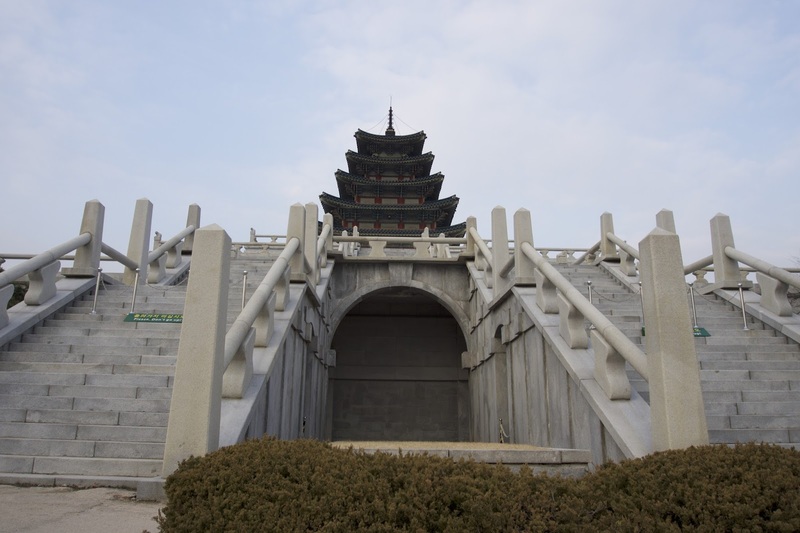 This seven-arched structure is built across Suwon River allowing control of water into Suwon Fortress. 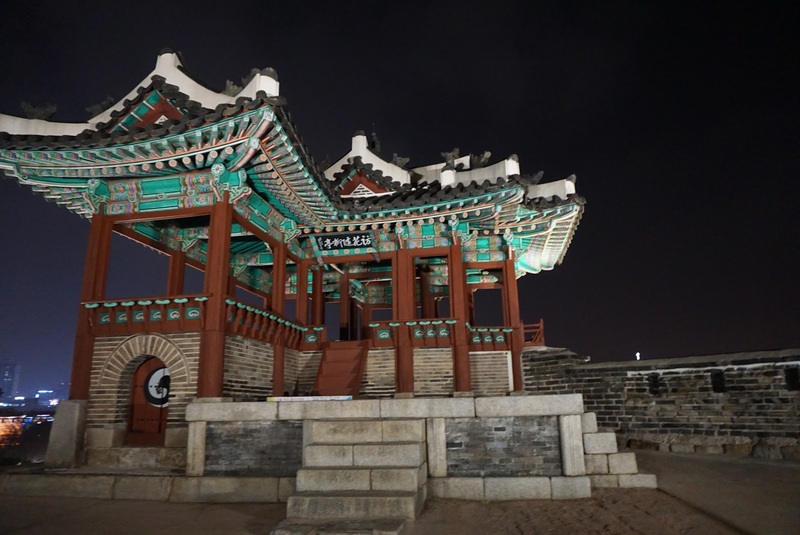 As with Seobukgangnu, Hwahongmun has a 2 storey pavilion built on top of the floodgates. It is opened 24/7 however we did not go up to the pavilion as we would rather skip the hassle of taking off our shoes. 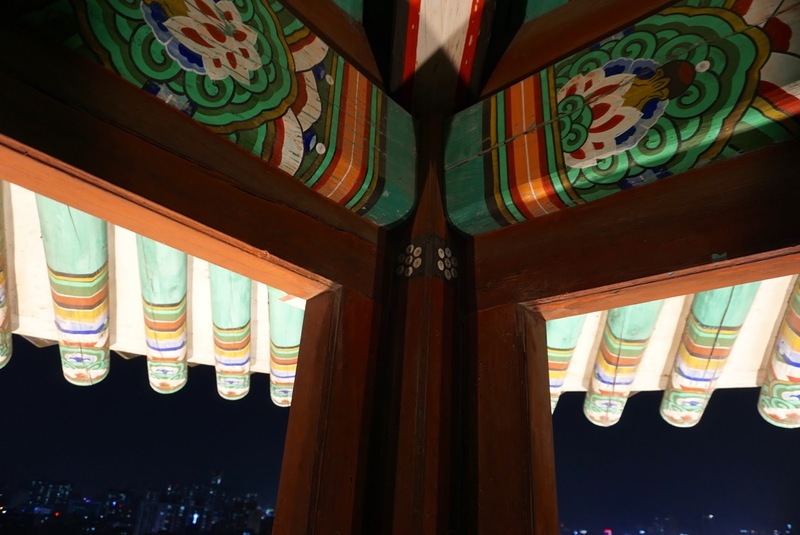 Continuing eastwards, a short distance from Hwahongmun is the Dongbukgangnu – the Northeastern pavilion. 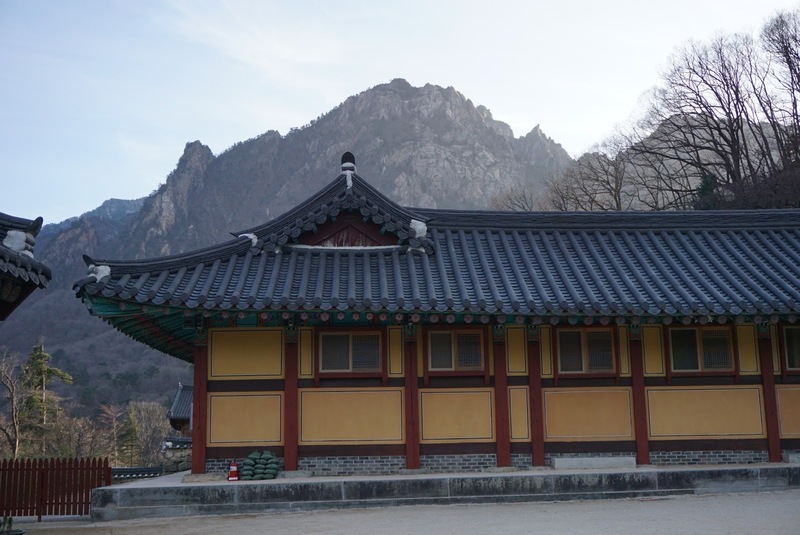 This 2 storey pavilion, similar design and structure as well as decor to that of Seobukgangnu, sits above a pond surrounded by a small garden. This structure was originally built as a command post. 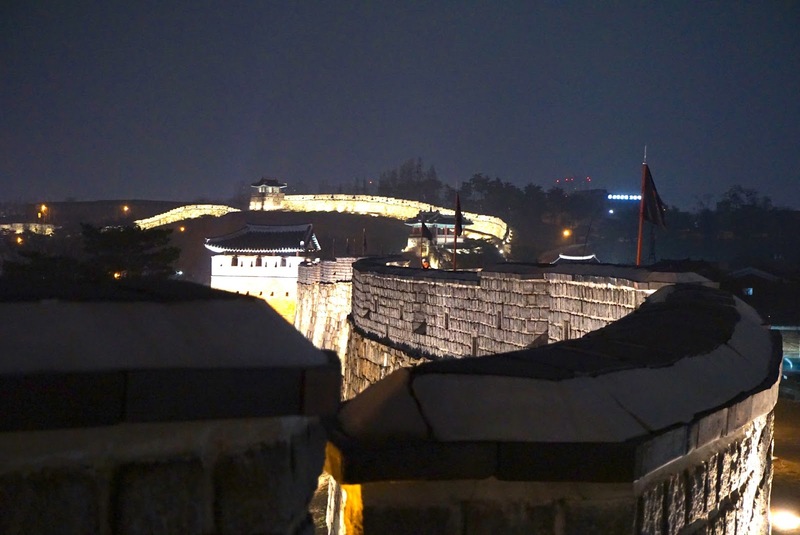 The view of the night fortress wall and the garden is fantastic. I personally like the view of the wall more than the garden. 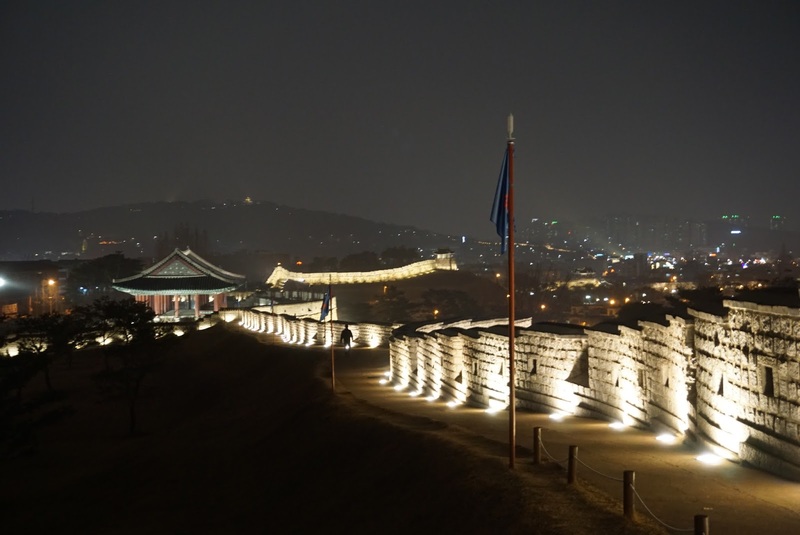 One can never get tired of seeing the lighted night scenery of the Suwon Fortress wall. 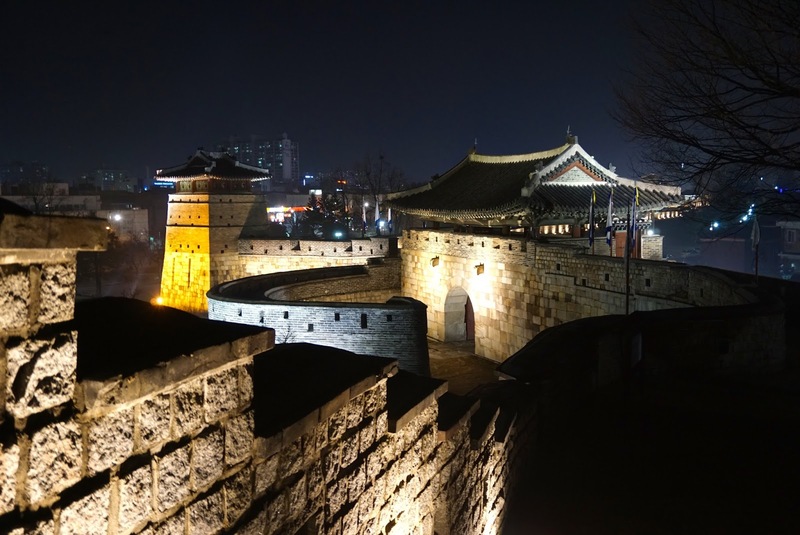 We strolled along the fortress wall towards Dongjangdae, the scenery opens up to an air of familiarity. It turns out that I have been here a few years ago whilst on a package tour. 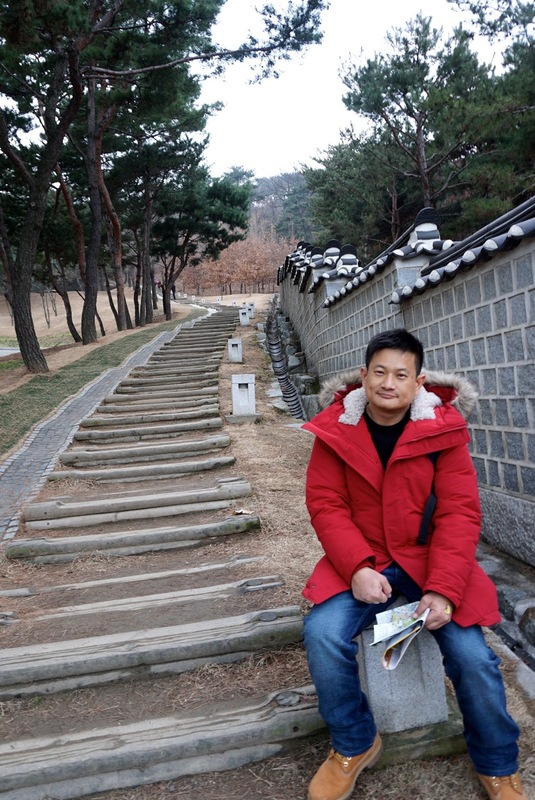 Little that I realise I been to only one small section of the the entire Suwon Fortress. 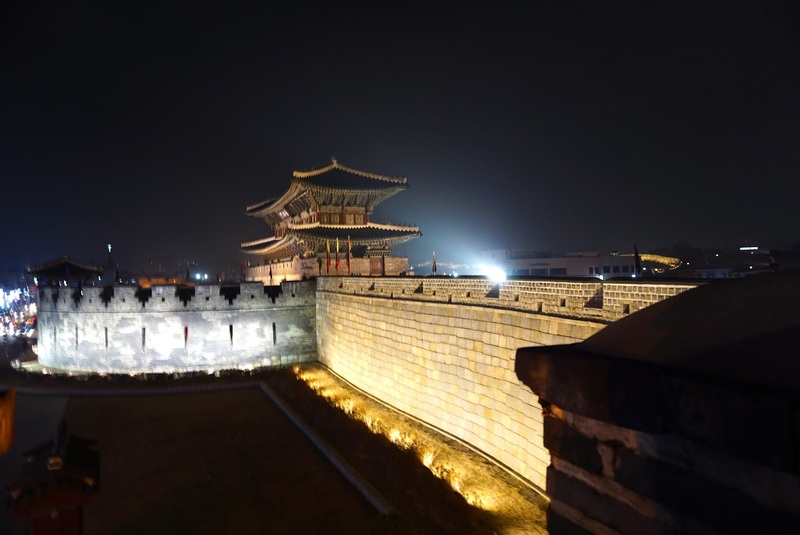 The thing about package tours is that they only brings you to one small section and that picks a tick in the list of itinerary that says Suwon Fortress. 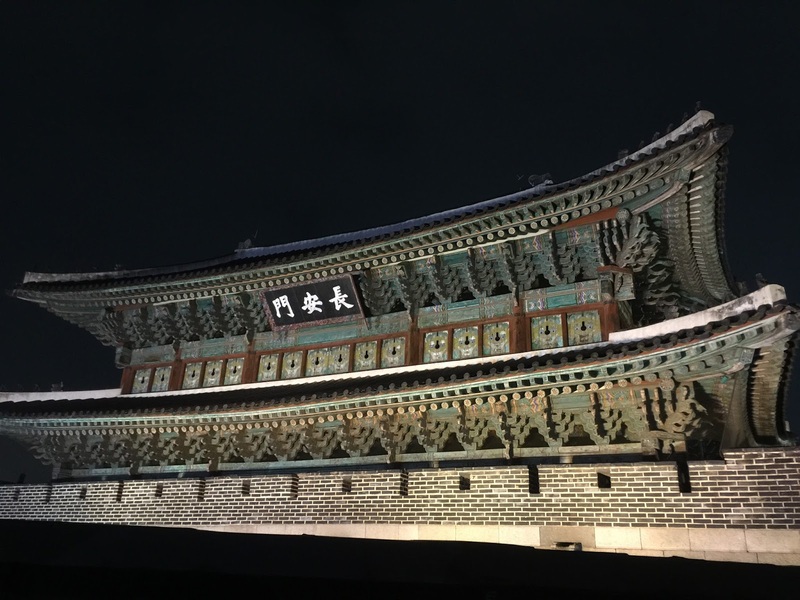 This part whilst iconic, did not do justice to the grandeur the entire Suwon Fortress (that is one of the reasons why I don’t like package tours). 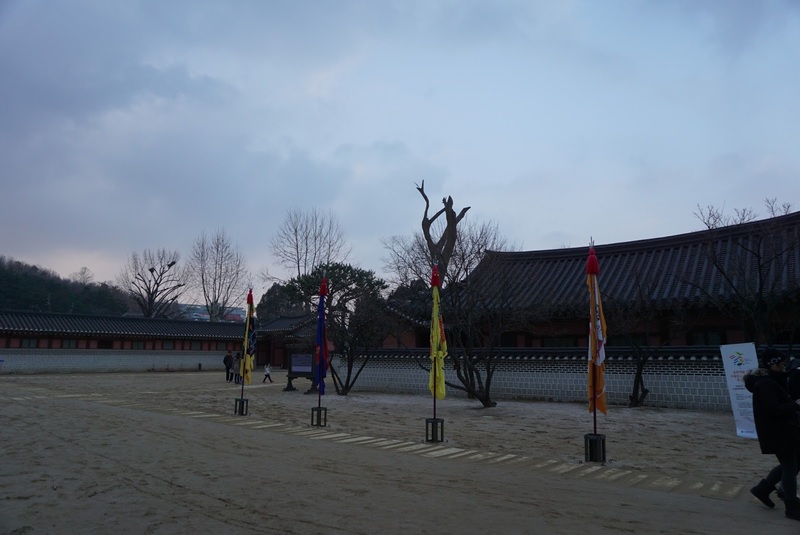 Dongjandae is a command post on the east side of the fortress as well as a training camp. 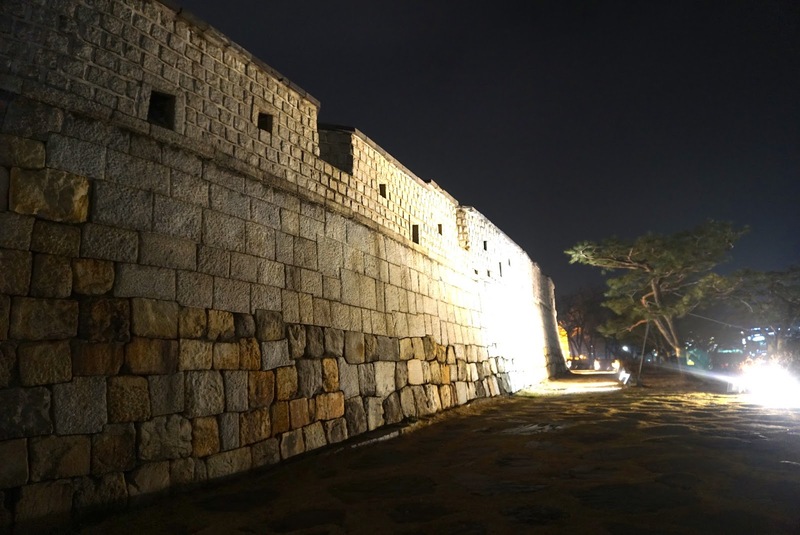 Dongjangdae comprises of a huge sheltered platform and an open field enclosed by a short wall. 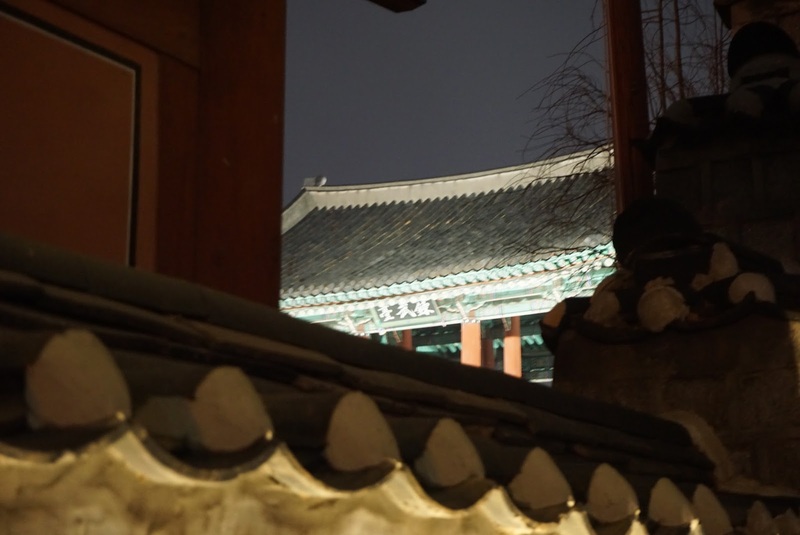 As it was night fall, the doors accessing Dongjangdae were closed. 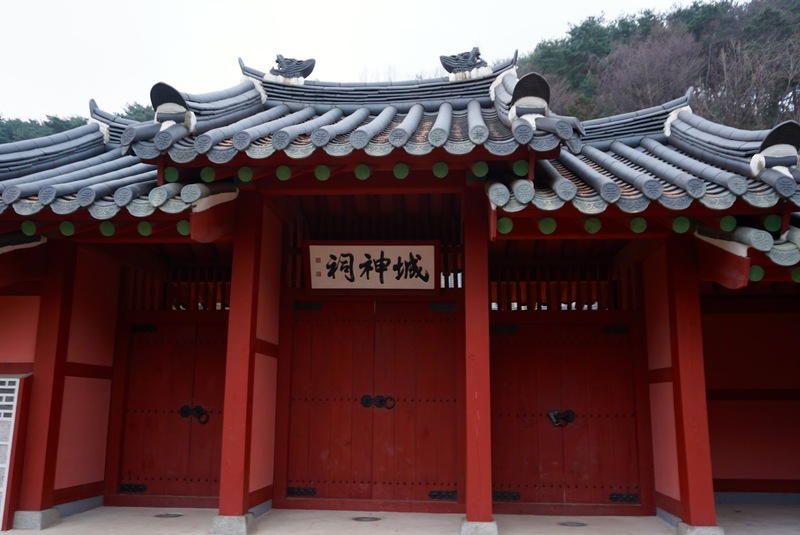 The Archery Centre is located outside Dongjangdae. 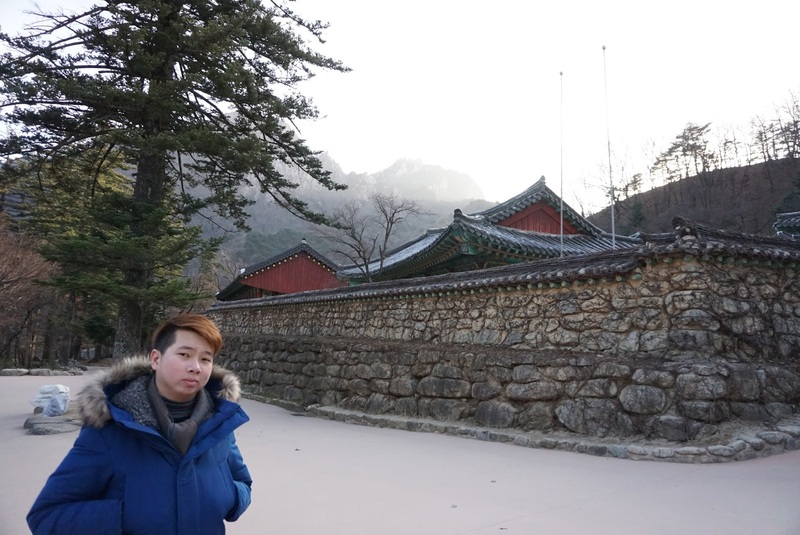 We skirted around the parameters of Dongjangdae to continue walking along the fortress wall to get to our final destination – Changnyongmun. 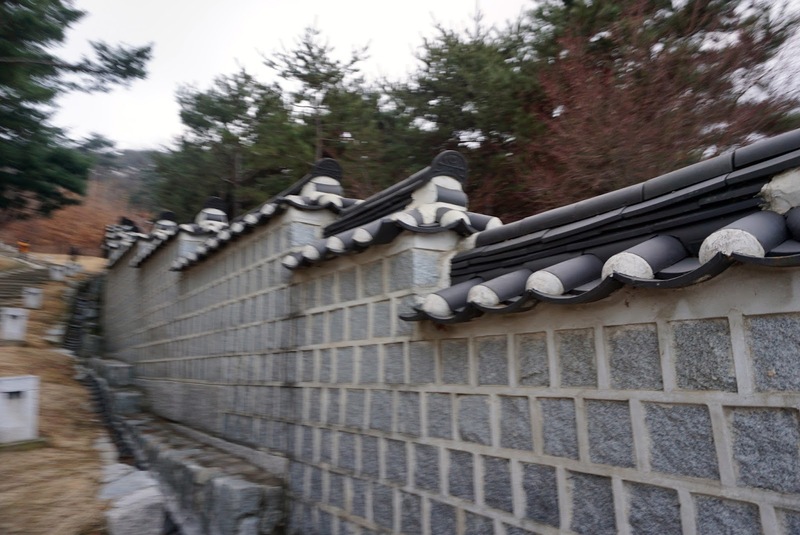 Changnyongmun is just right across the road from Dongjangdae, however we saw a couple of buildings along the wall and decided to continue our journey along the wall rather than taking the short cut (after all we had been walking the whole night, a few more steps will not matter). 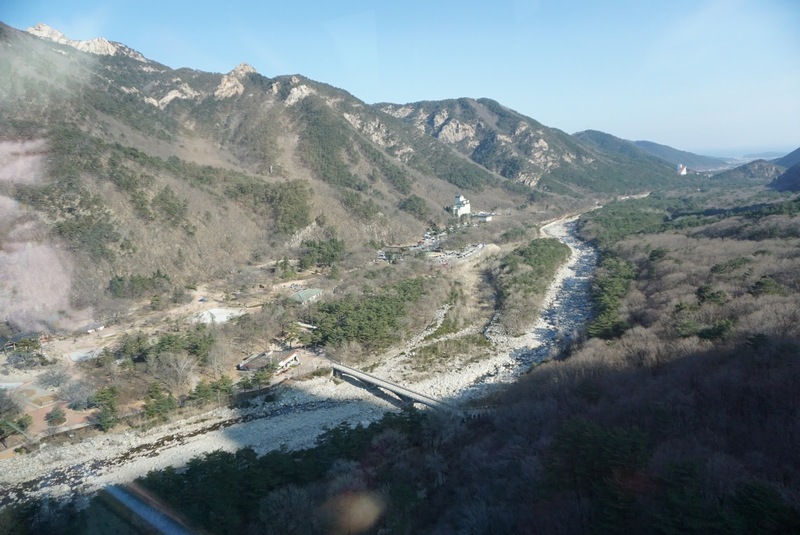 The 2 buildings that we passed by along the along are Dongbuk Gongsimdon Observation tower and Dongbuknodae Crossbow platform. 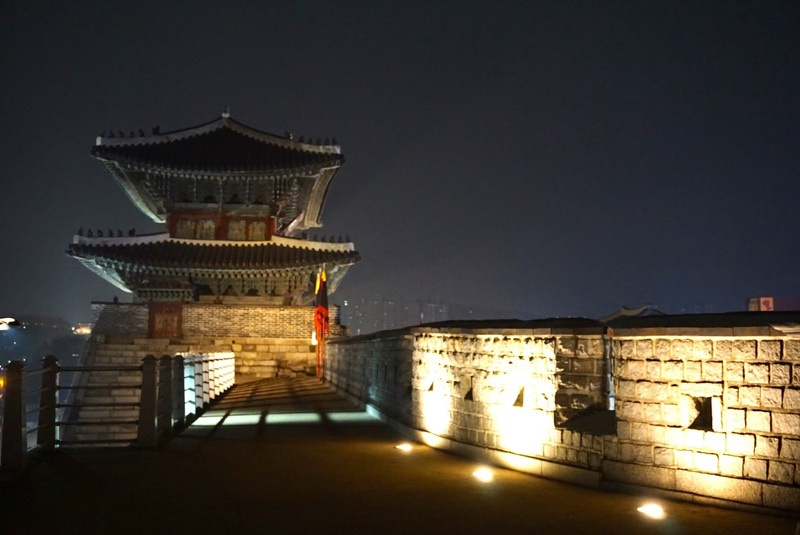 Dongbuk Gongsimdon Observation Tower is at the Northeastern edge of Suwon Fortress. 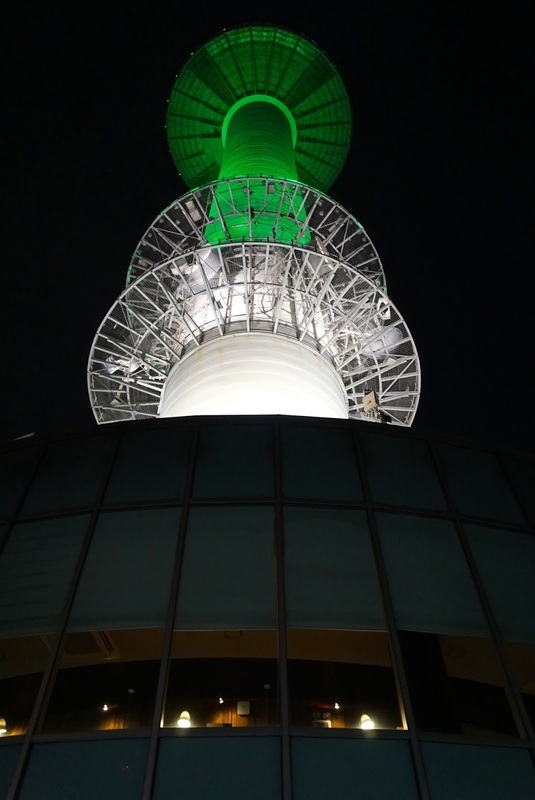 The 3 storey oval observation tower was closed for preservation works when we visit. 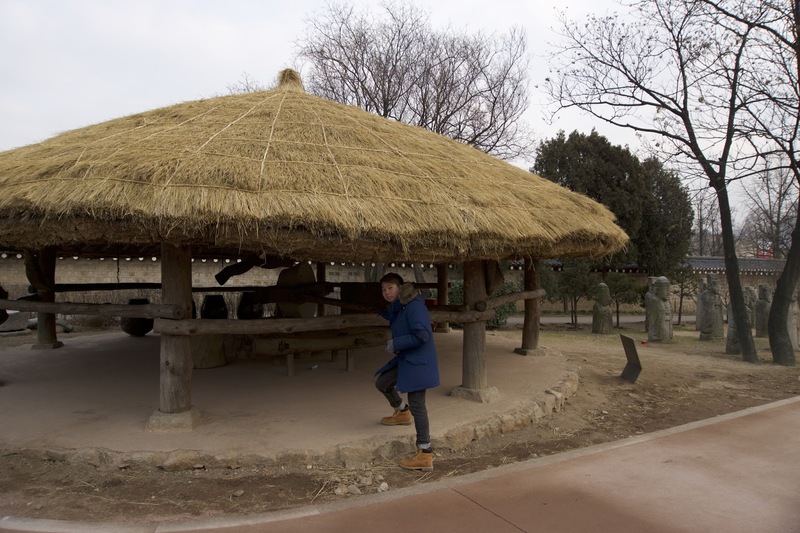 The next structure we came across is Dongbuknodae Crossbow platform, which is an open air raised structure fortified area with small holes used by archers with crossbows to attack approaching enemies from all directions. 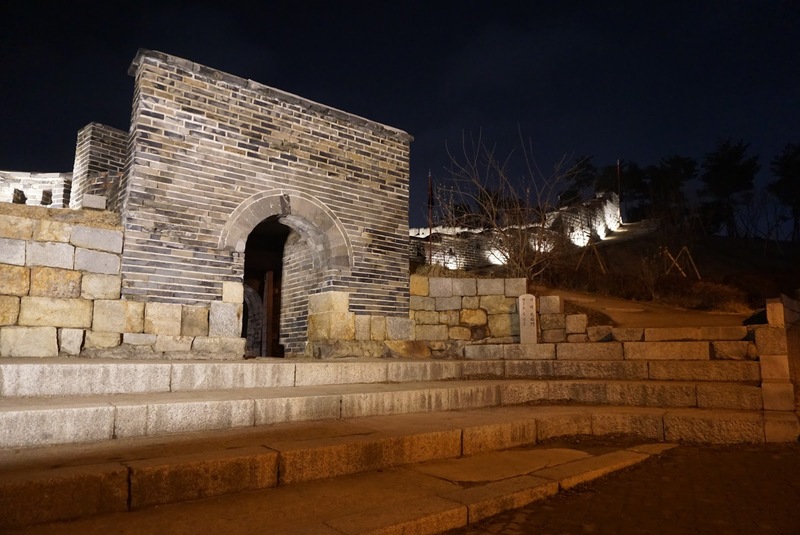 Changnyongmun – the Eastern Gate one of the 4 main gates of Suwon Fortress. 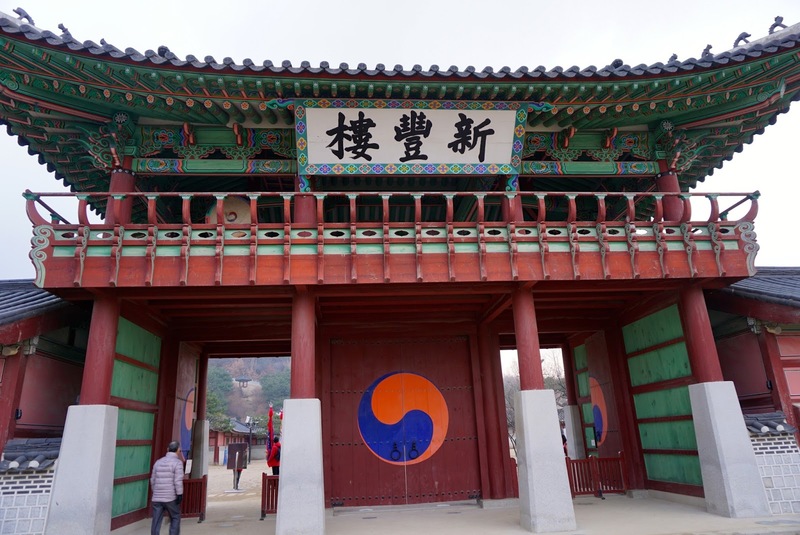 It looked the same as Hwaseomun, the gate that we began our 2.8km walk along the fortress wall, with another platform on top of the gate (we did not scale up to the top of the gate). 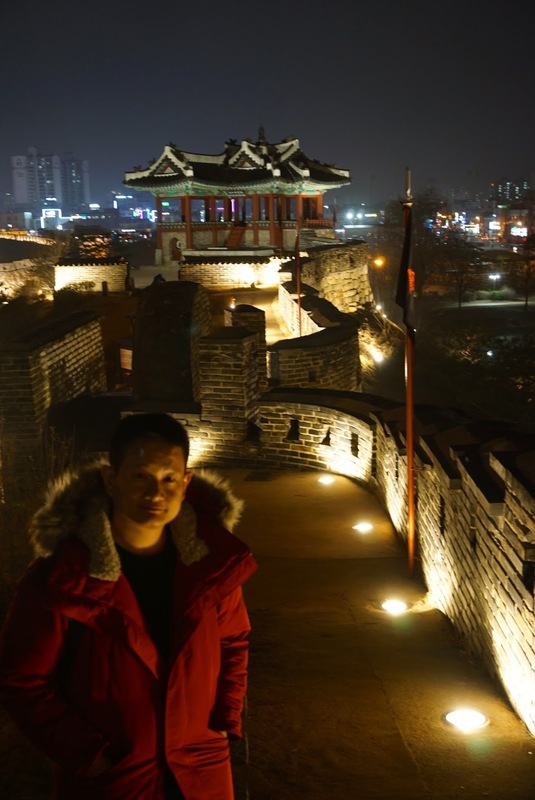 As the gate was not closed at the time of our visit, we ventured outside the gate and see how it looked like from outside the fortress. 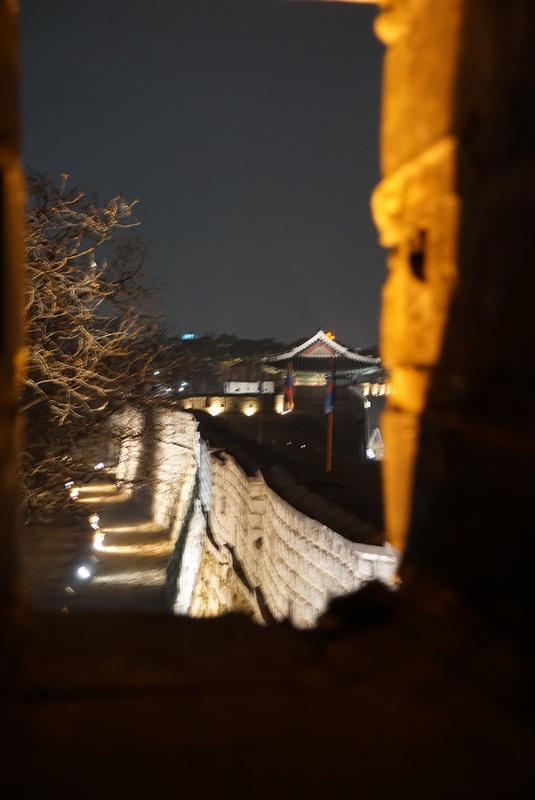 The walls of the fortress gave me an impression of guardedness and defensiveness. 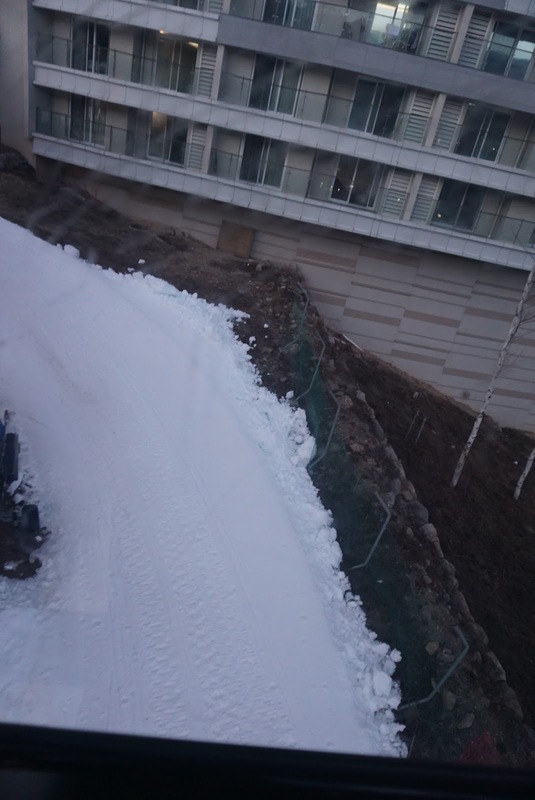 I guess this is the impression the designers of the fortress wanted to portray when constructing the fortress walls. 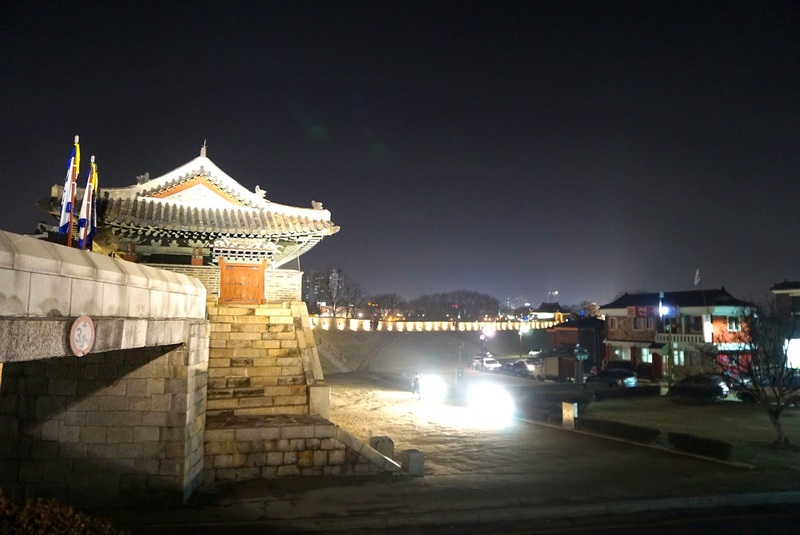 We did not stay outside the gates for too long and headed back into the gate, crossing the road and took a bus back to Paldamun, where we started our entire Suwon Hwaseong Fortress trip. 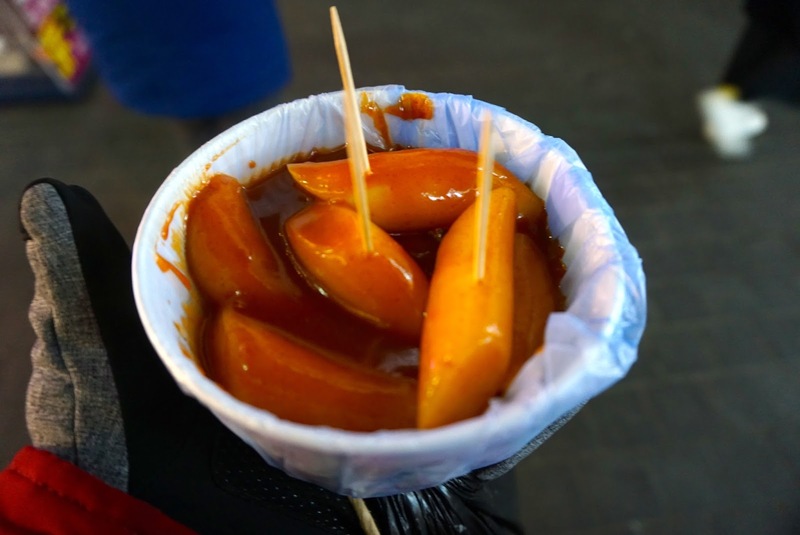 When we first arrived at Paldamun, we saw it was buzzing with life with all the shops and thought that it would be the same and perhaps there is some sort of night market in the vicinity. 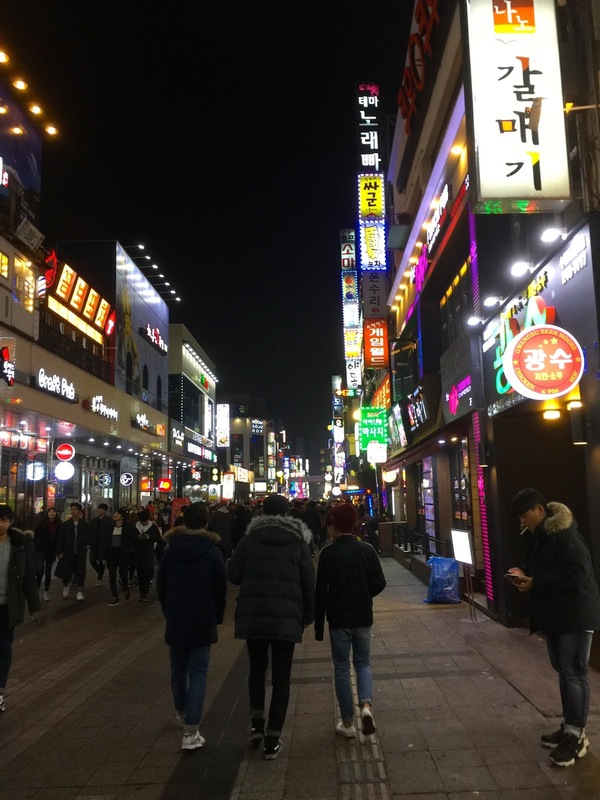 We wanted to head back to Paldamun area and do some night shopping before heading back to Seoul. When we alighted the bus at Paldamun, it seem as if the whole area went to sleep. The liveliness in the day we saw was no where to be found. 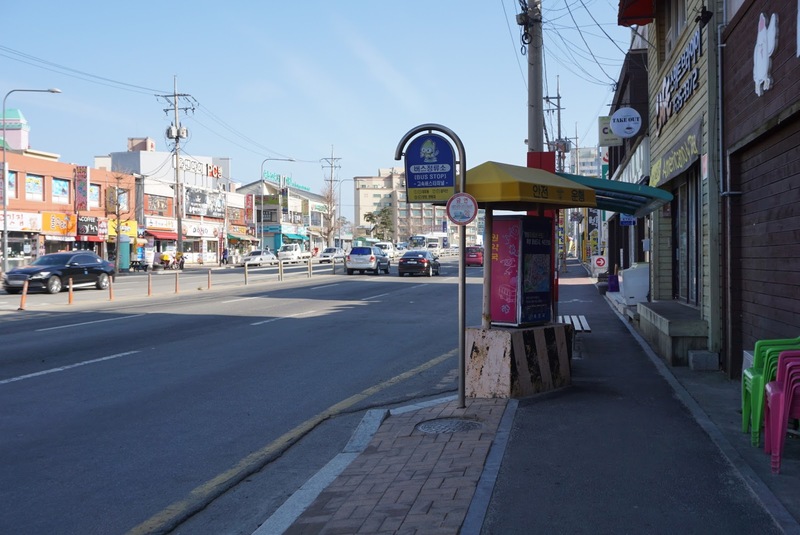 Disappointed we strolled a bit and took a bus back to Suwon Station. 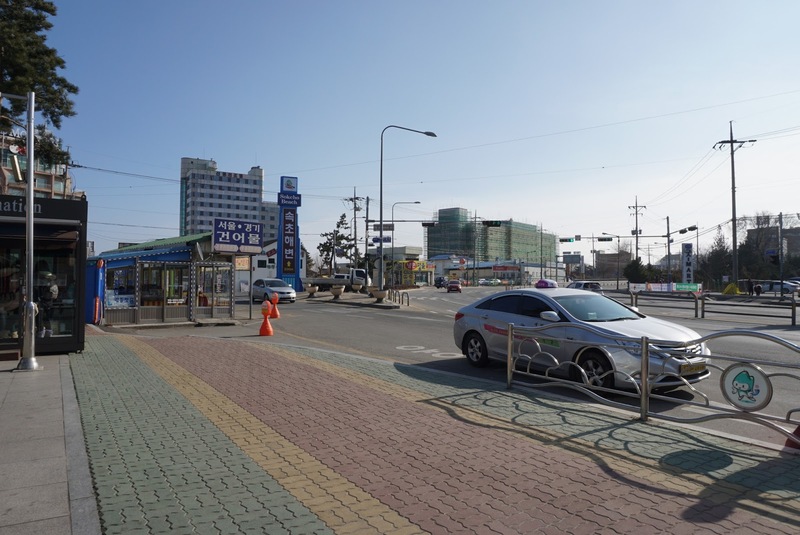 At Suwon station, the liveliness we wanted to see at Paldamun area was here at what seems like a shopping street full of youngsters right across Suwon Subway Station. The shops remained open (but mostly the facial skin care product shops) and restaurants and pubs occupy most of the street. 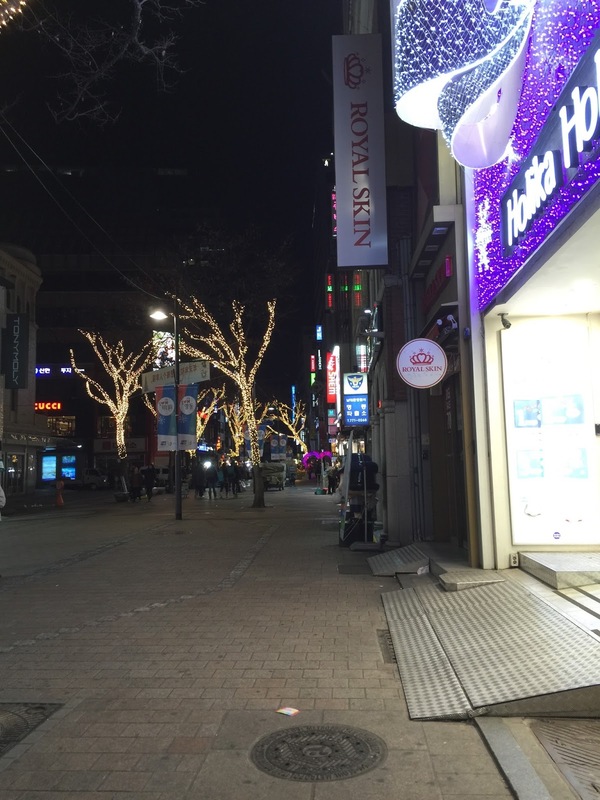 It seem like this is an area to be at night in Suwon. 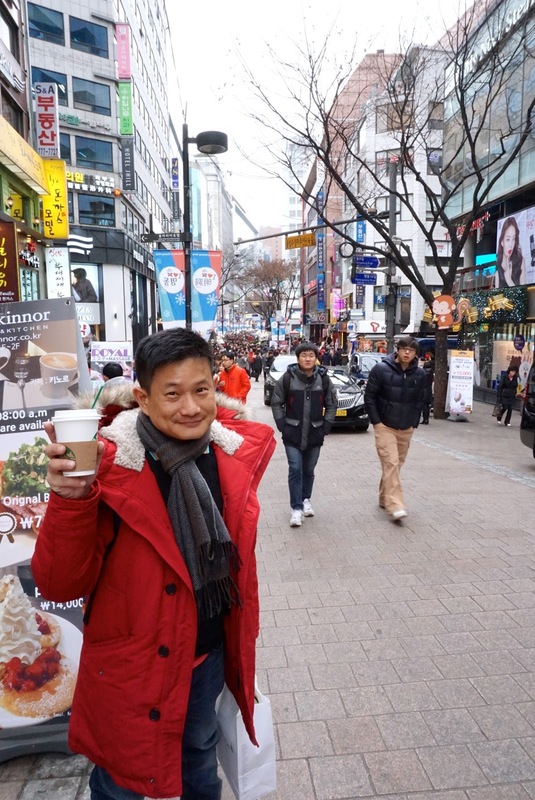 We strolled down the street and back up before heading back to Seoul to rest for the night. 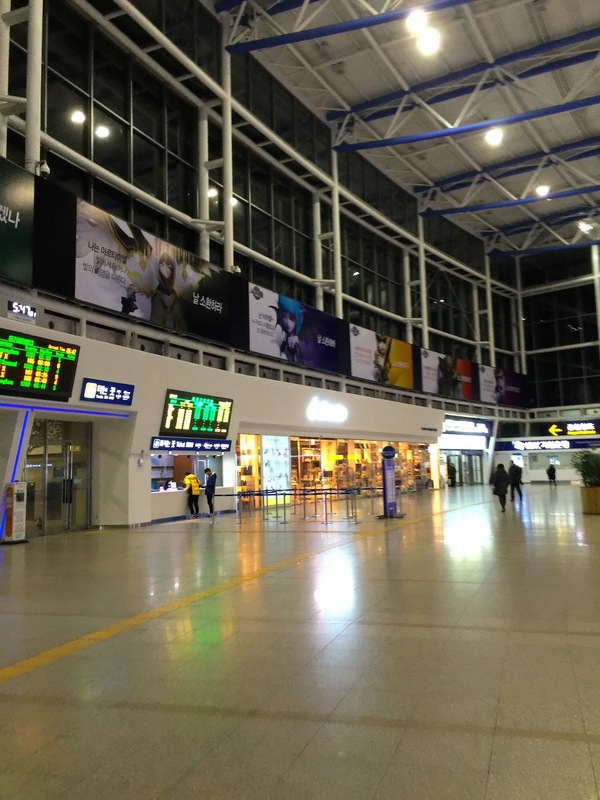 Finally arrived in Seoul Incheon Airport after a red eye flight from Singapore via Bangkok. 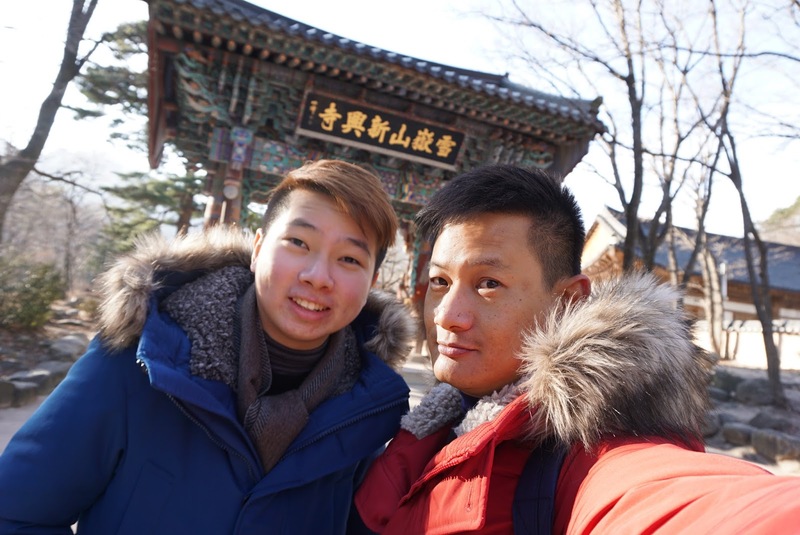 My friend and I had been talking about visiting Seoul since 2 years ago, we were excited about the trip and hope to see snowing in Seoul during this trip, since we visited in the middle of winter. 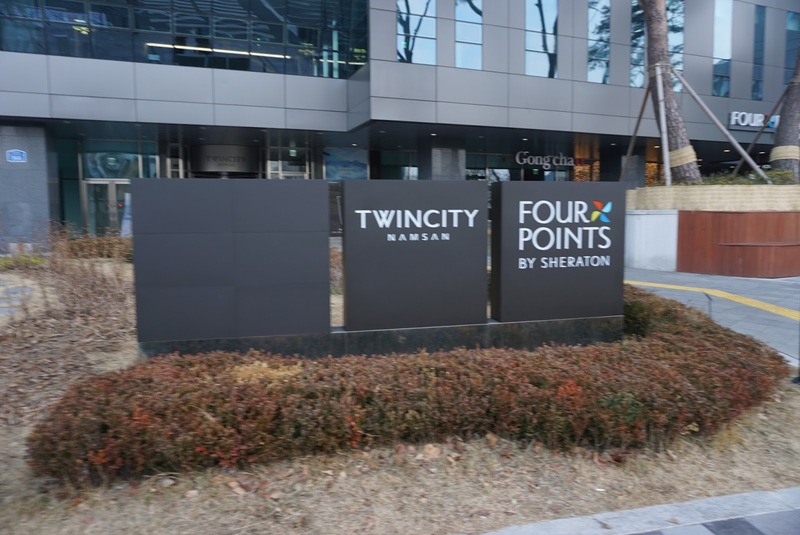 After collecting our luggage, we headed to the SK Telecom counter in the airport to collect our pre-booked wifi router. More on a short review of the router later. 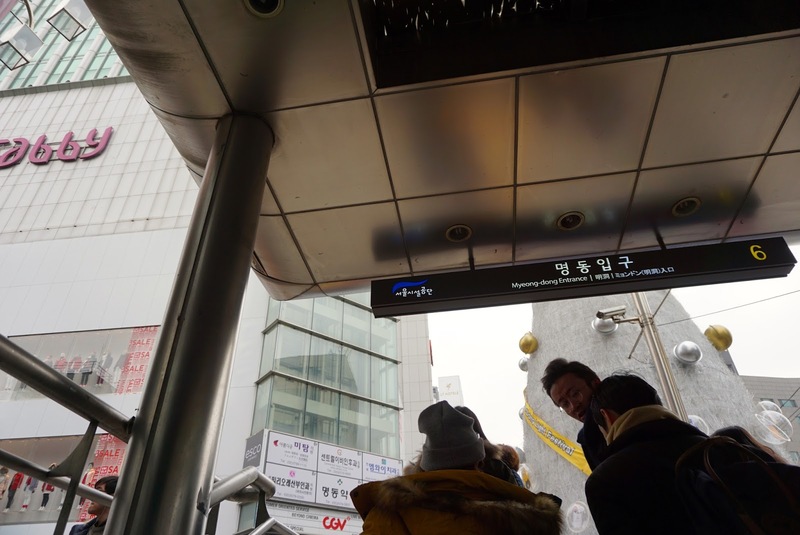 After collecting our wifi router, we headed towards the subway station for our trip towards downtown Seoul. 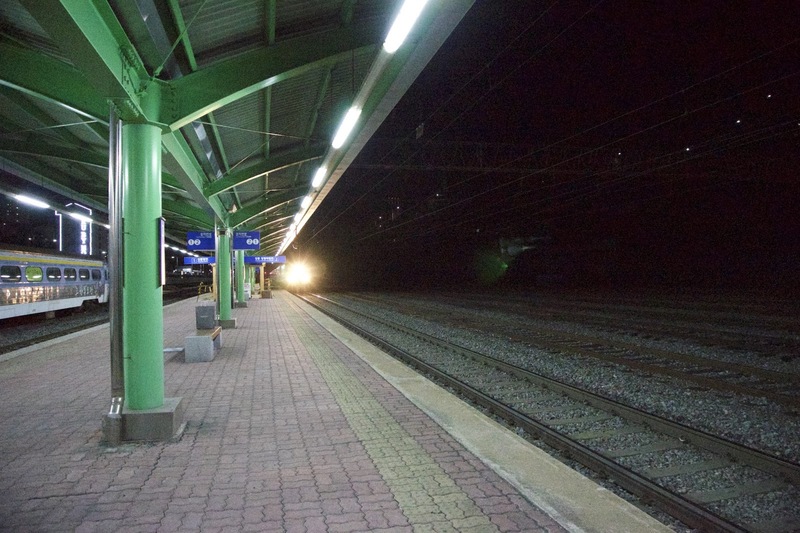 There are 2 sides to the station, one for the normal service, and another for the express train towards Seoul. 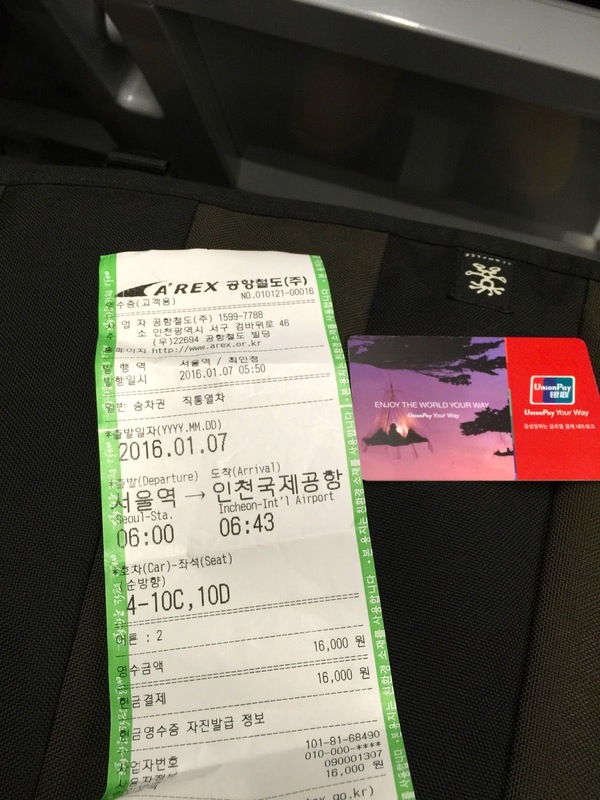 We went to express train (known as AREX) to get our tickets to downtown Seoul. 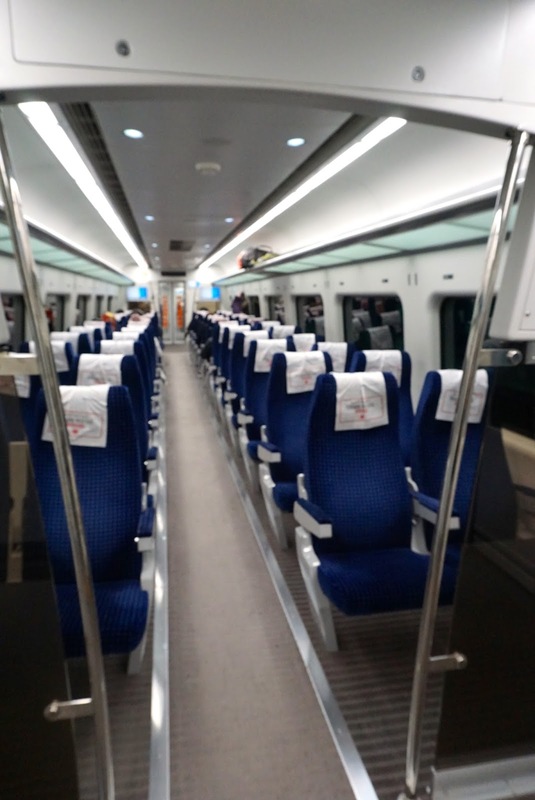 Taking the AREX saves us around 10 mins, however the most important difference is the allocation of seat for AREX compared to the all-stop train service. 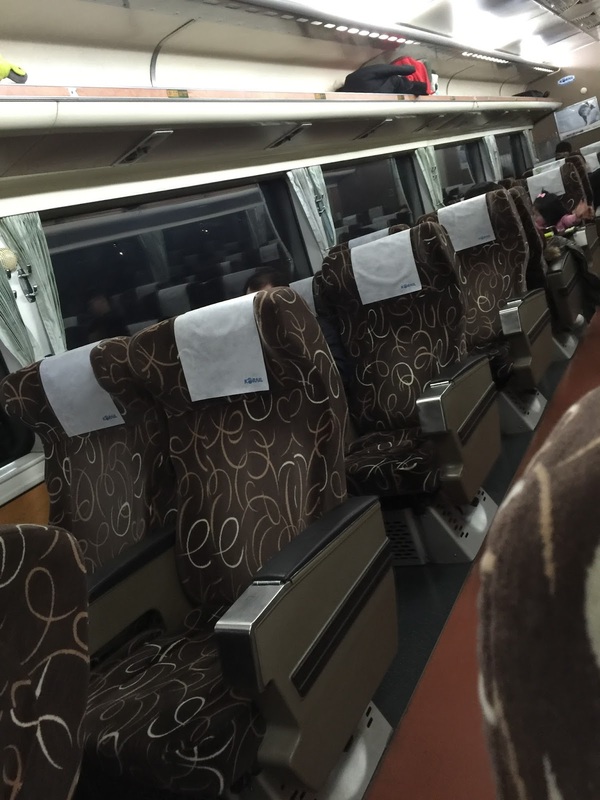 For travelers who would want to get some more rest, go for the AREX where seats will be assigned. 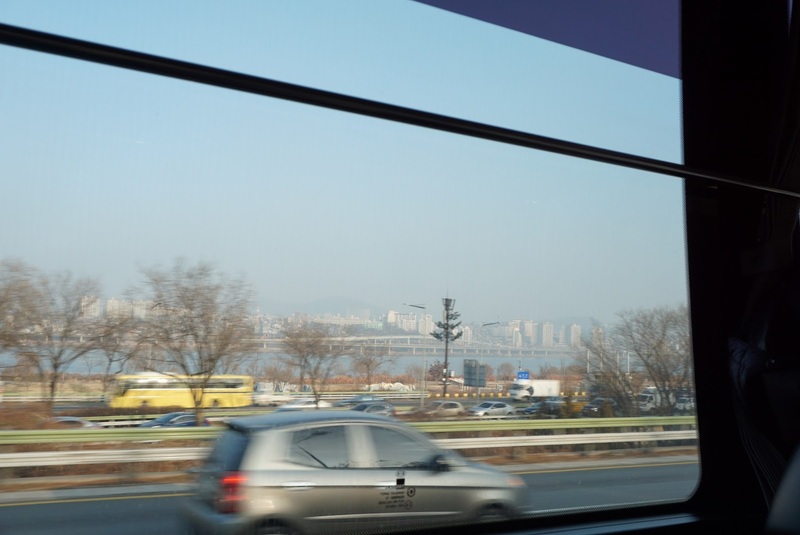 The ride to Seoul station whiz past fairly quickly. We headed for the exit that leads us to our hotel. It is around 9.30am and the hotel would not be able to check us in for another hour. 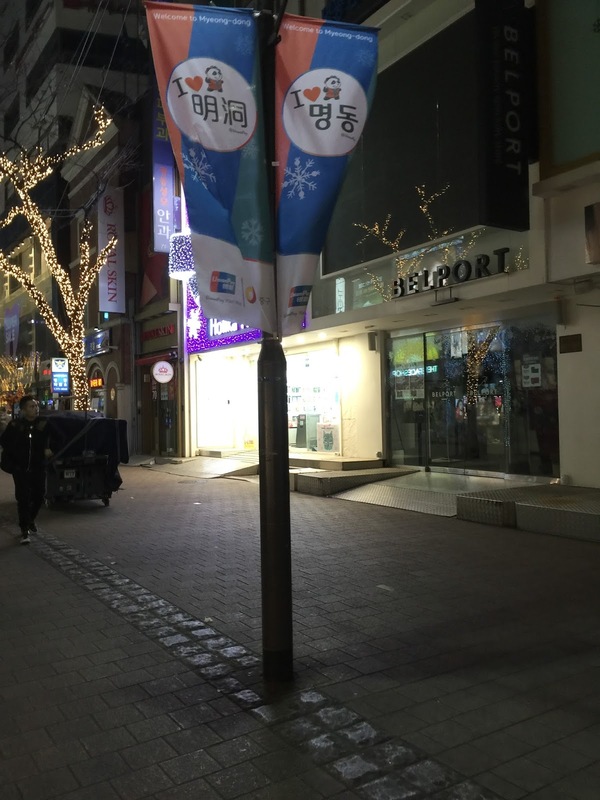 Rather than sitting around and wait for time to pass by, my friend and I opted to check out the nearby Lotte Mart. The supermarket opens at 10am. We waited for another 10 mins, queuing up to enter the supermarket with the rest of the customers, locals and tourists alike. When the door opened, customers entered the supermarket orderly. 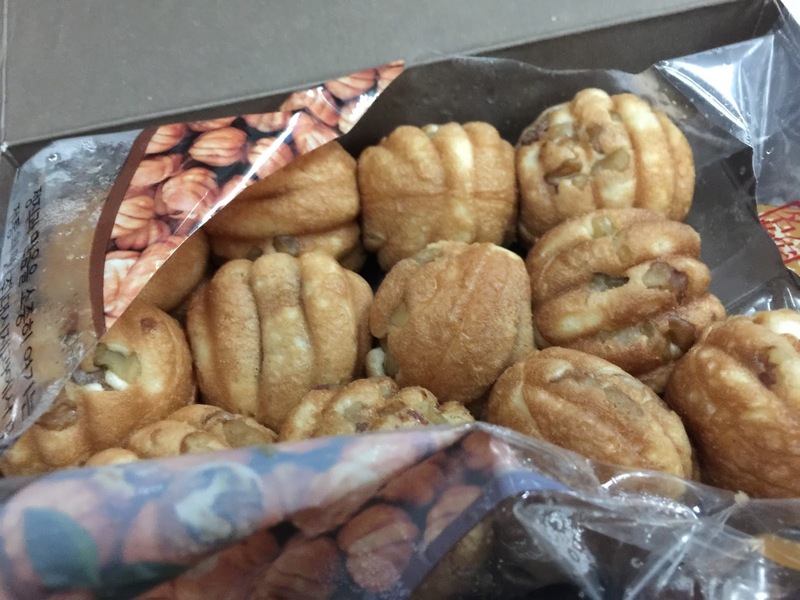 We were given Korean traditional new year cake as we entered the supermarket. 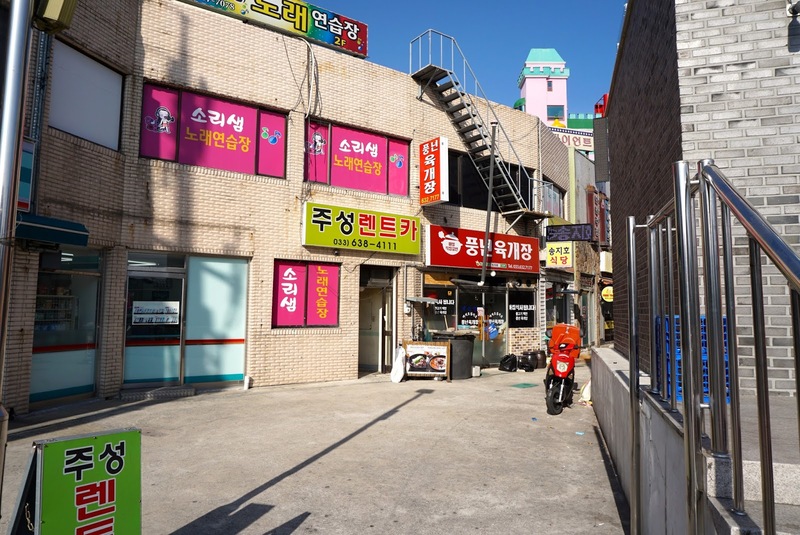 The supermarket is no different from any hypermarkets with loads of groceries organised into the various alleys. 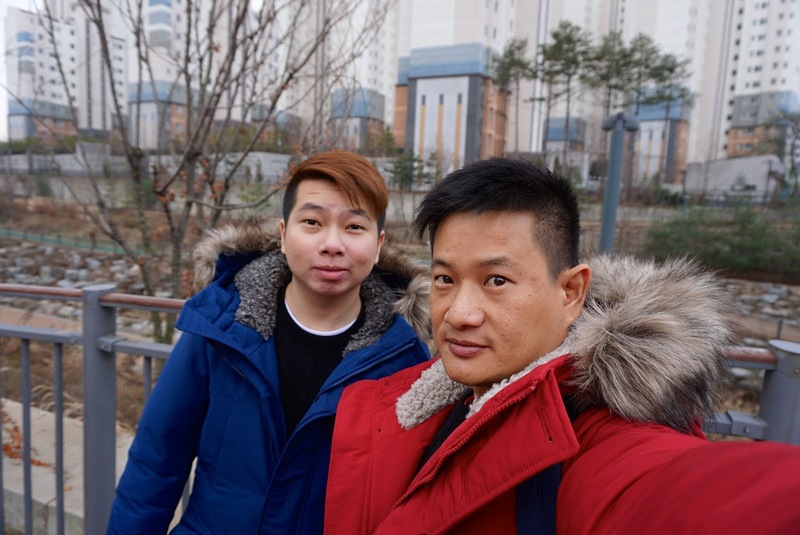 My friend and I walked around a little and decided to head back to the hotel to check in and wash up, getting ready to explore Seoul. 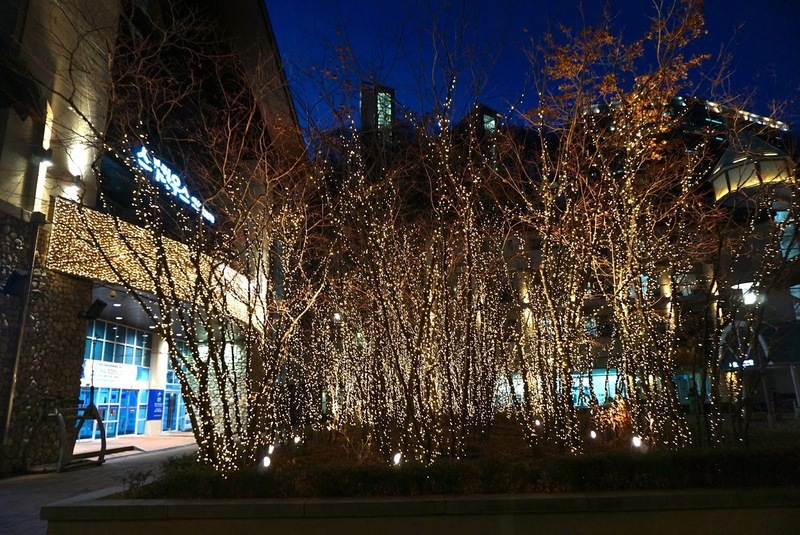 It is a short walk to the hotel from Seoul Station. There are some homeless people sleeping inside the station, however they cleared out during the day and was not distributing anyone using the subway system. 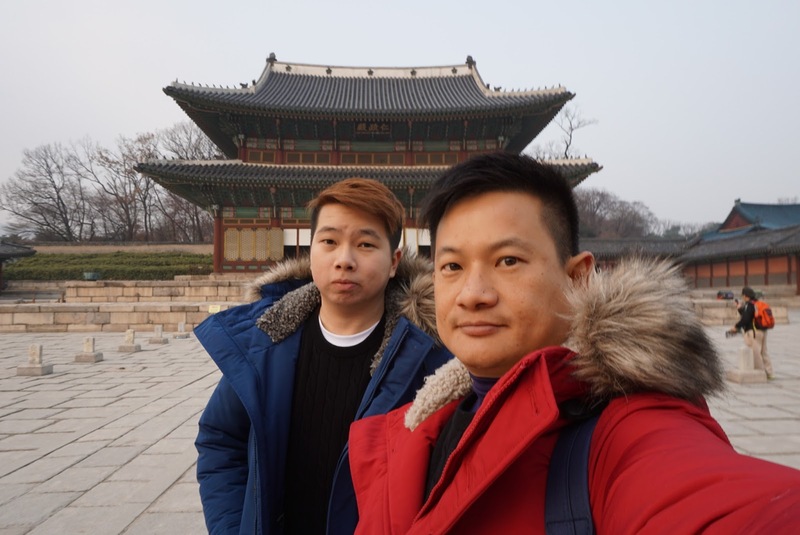 Our plan today was to head to Namsan and N Seoul Tower in the morning, followed by heading out to Suwon in the afternoon and spending our night in Gangnam area. Sound like a plan, however the plan did not go as we wanted. 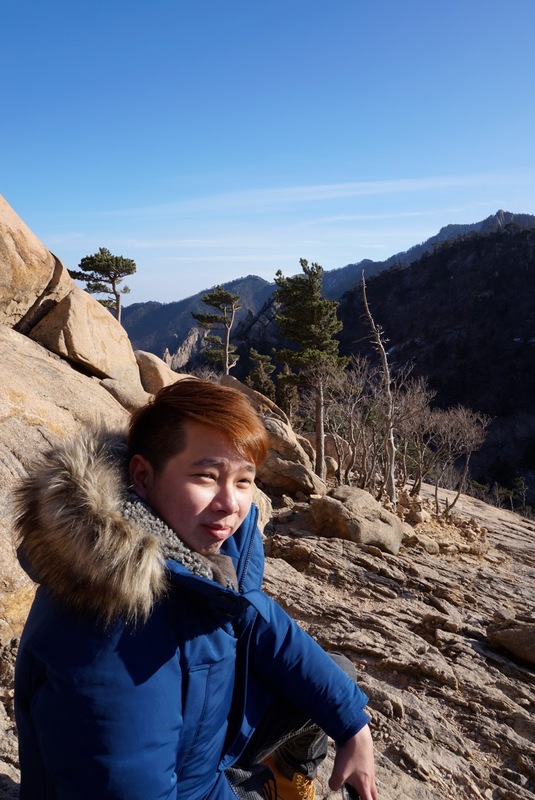 As with most travels, one should plan and get ready to adjust the plan as one go along. 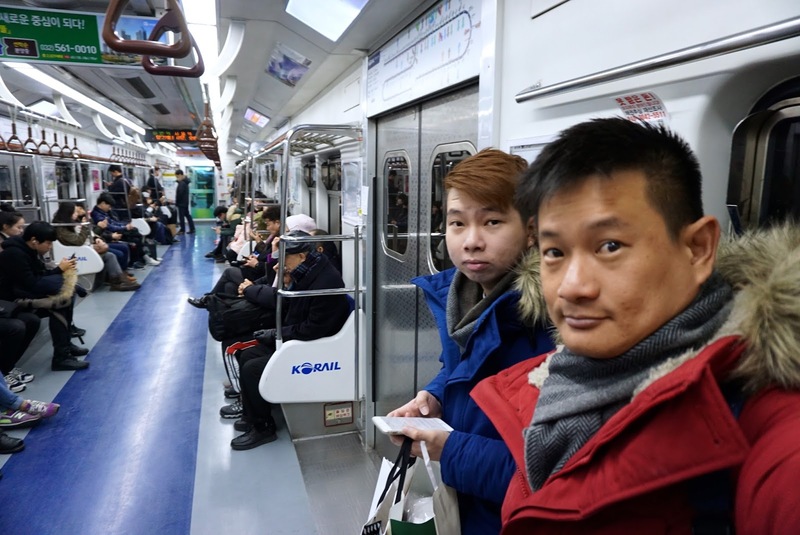 We left the hotel at around noon and headed to Namsan via the subway. 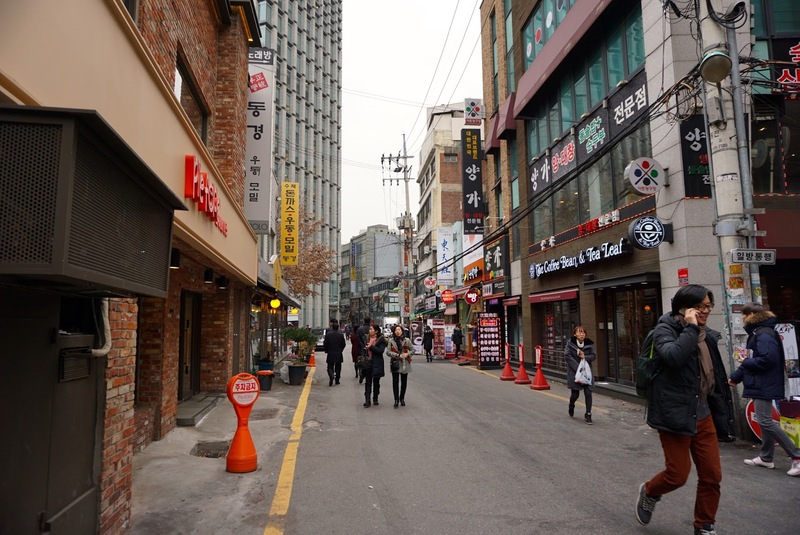 Getting to Namsan by the subway, requires us to stop at the subway at Myeongdong area. 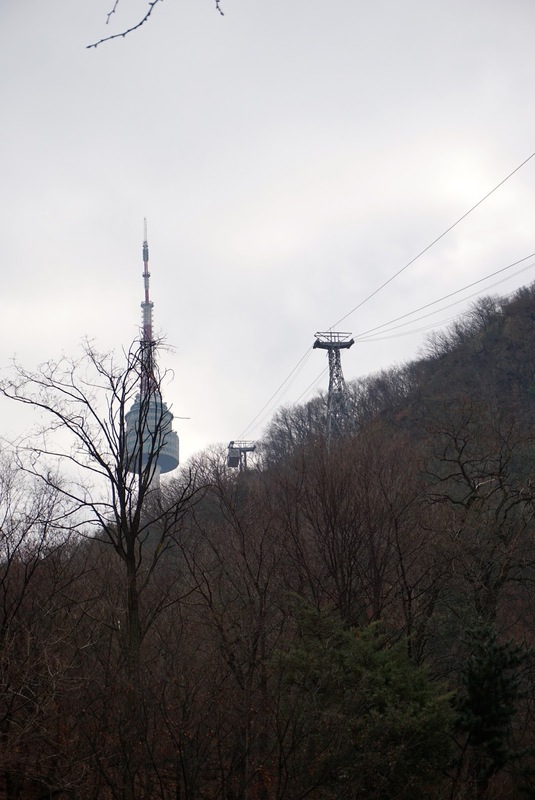 We exited the subway station, spent some time navigating towards the cable car station that will bring us up to Namsan. 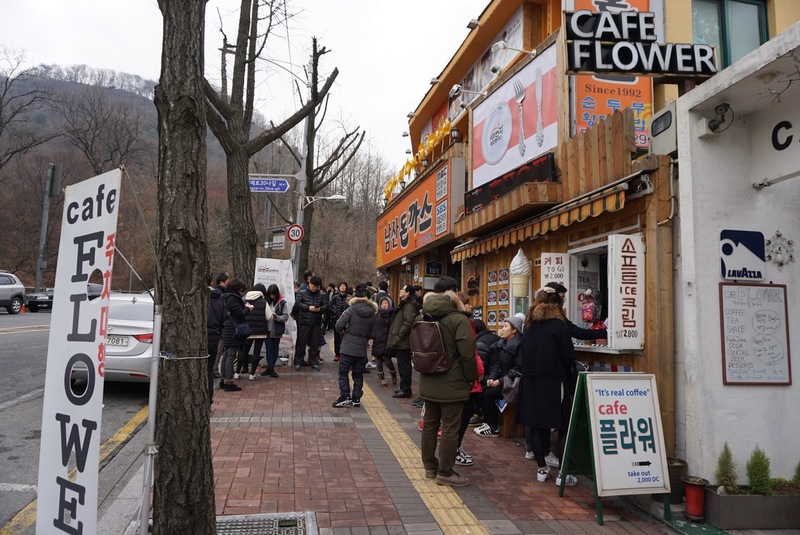 When we arrived at the cable station, we saw a queue snaking from the station. We joined the queue, which was moving very slowly. After around 10 mins, we reach a sign that says “70 mins wait from this point”. 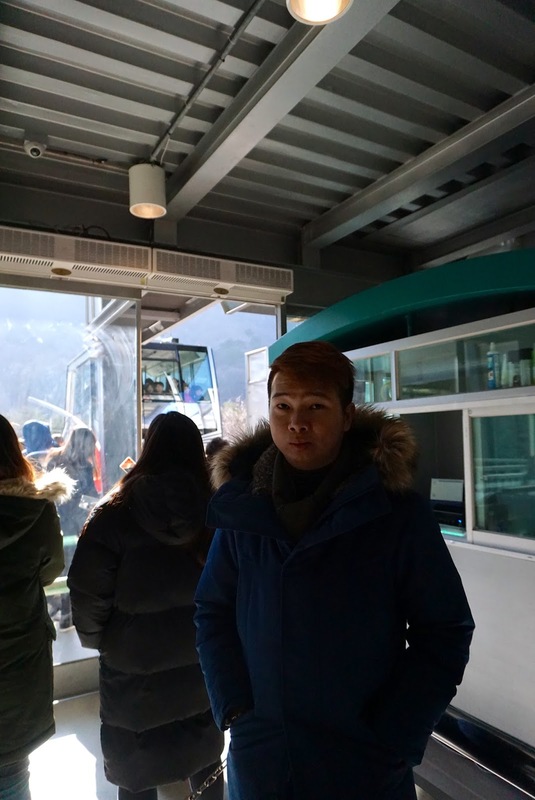 At this point I turned to my friend and say ” I feel stupid waiting 70 mins for a cable car ride, why not we come back some other day”. My friend agreed. Later did we realise it is New Year’s Day. 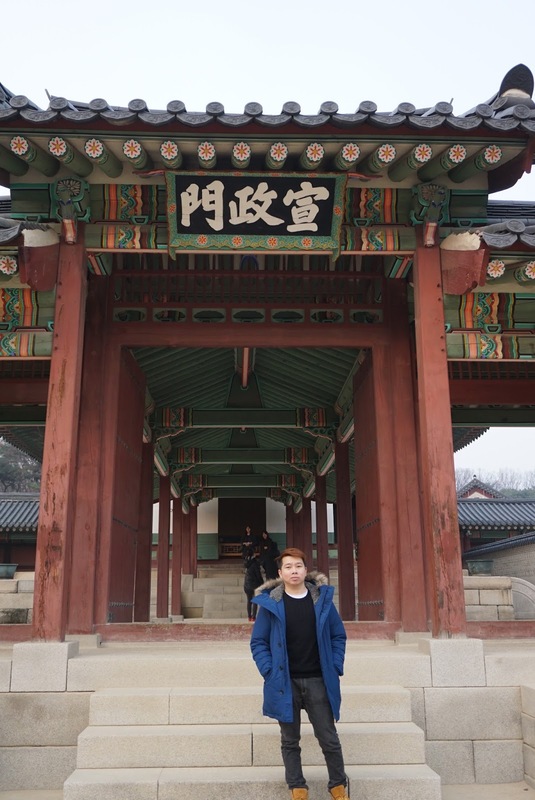 Most of the locals took this opportunity to get out and visit some of Seoul‘s major attractions as well. Hence it hit us that it is a bad day to visit any attractions. My friend turned to me and asked “so what now?”. 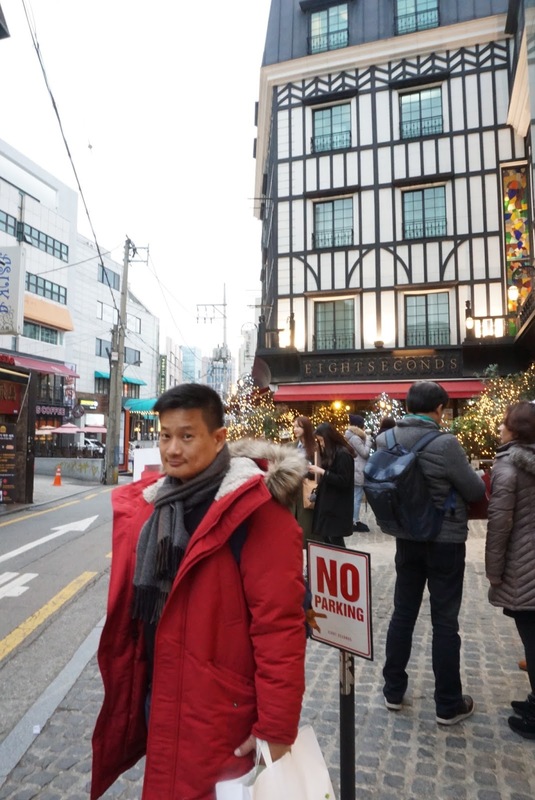 I proposed that we head to the nearby Myeongdong shopping area as a change of plan, and we did. 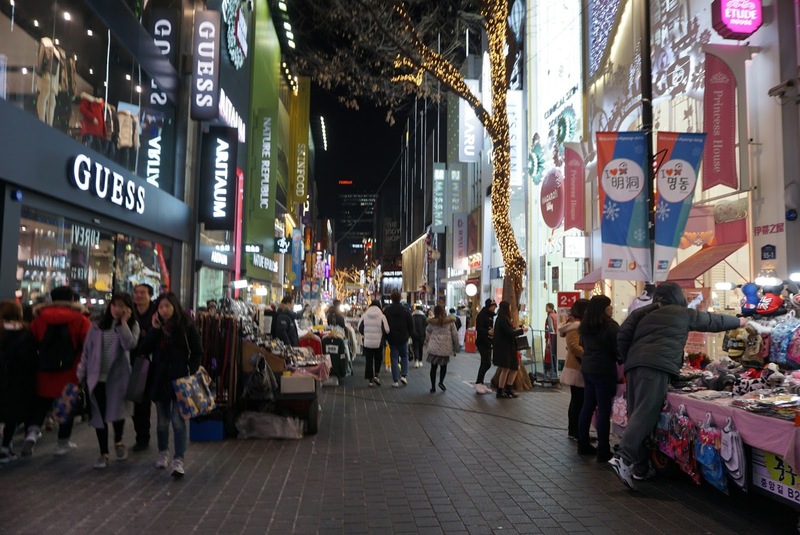 Myeongdong is one of the major shopping districts in Seoul. There shops for practically everyone, but most of the shops seem to be catering to female visitors. 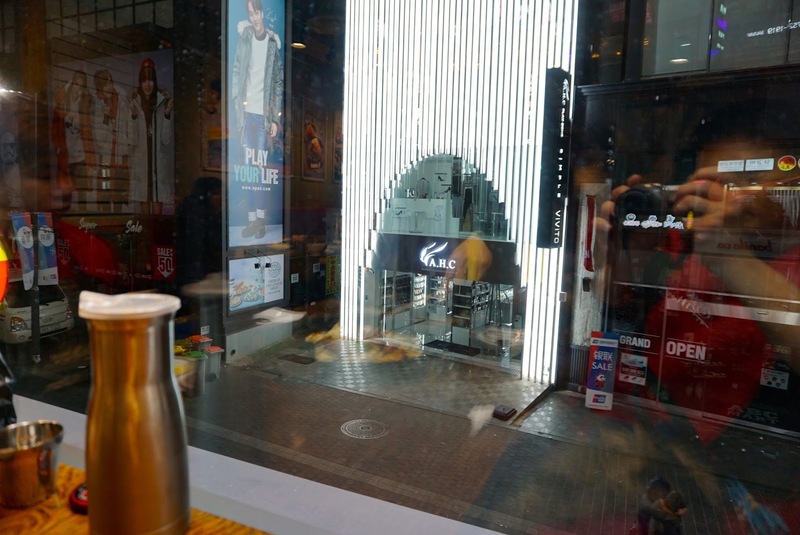 One should cater some time to get one’s bearings when visiting Myeongdong for the first time. 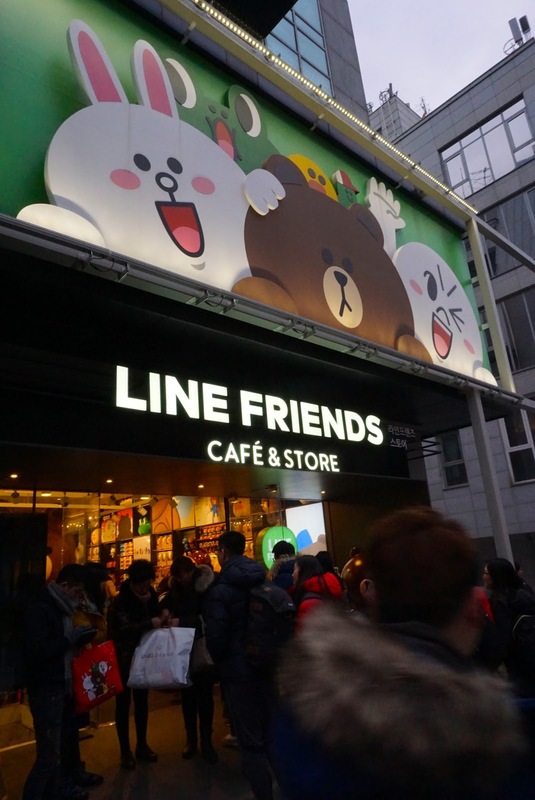 I was overwhelmed when I first arrive at Myeongdong, due to the number of shops in the area as well as the massive number of people visiting. 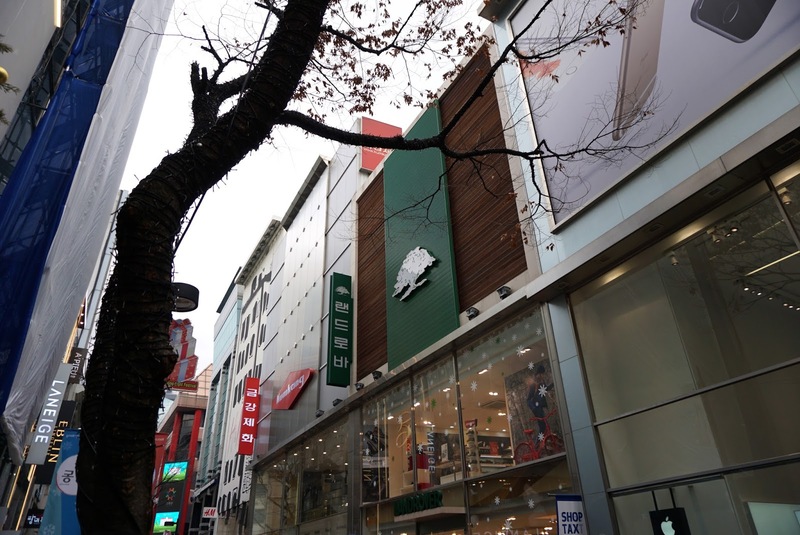 As we walked around Myeongdong, we noticed there are tons of shops selling Korean brand of facial care products such as FaceShop, Innisfree, Nature Republic to name a few. 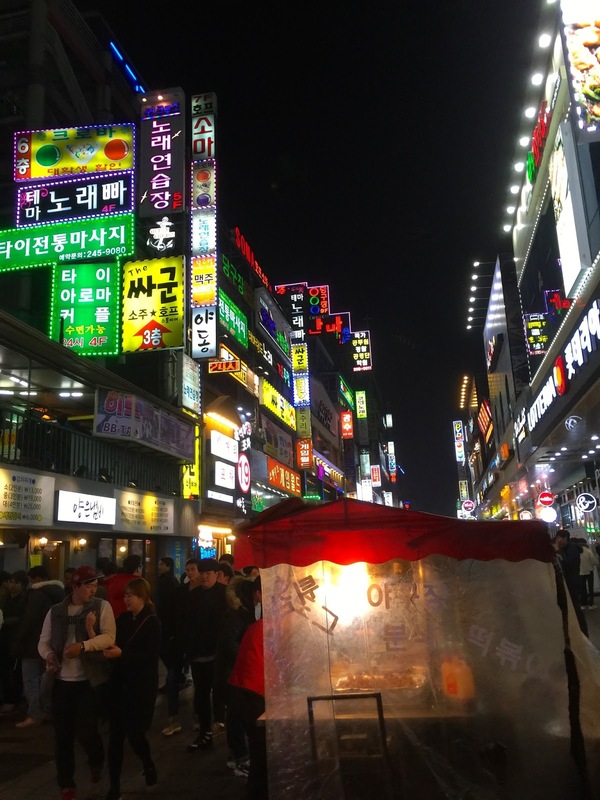 These Korean brand facial products are cheaper here in Korea than anywhere else in the world, attracting tourists. Most of the shops here does VAT refund for foreigners. 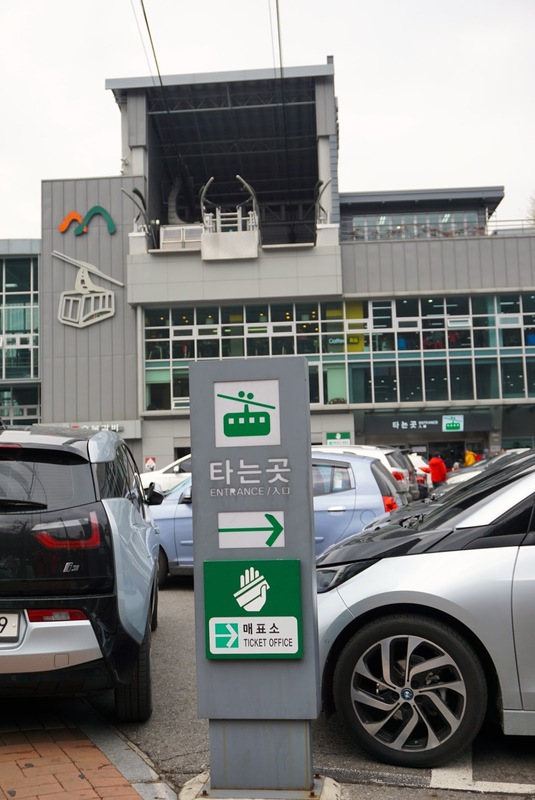 Essentially they will print out a receipt for foreigners, which is required to be produced at the airport when departing. 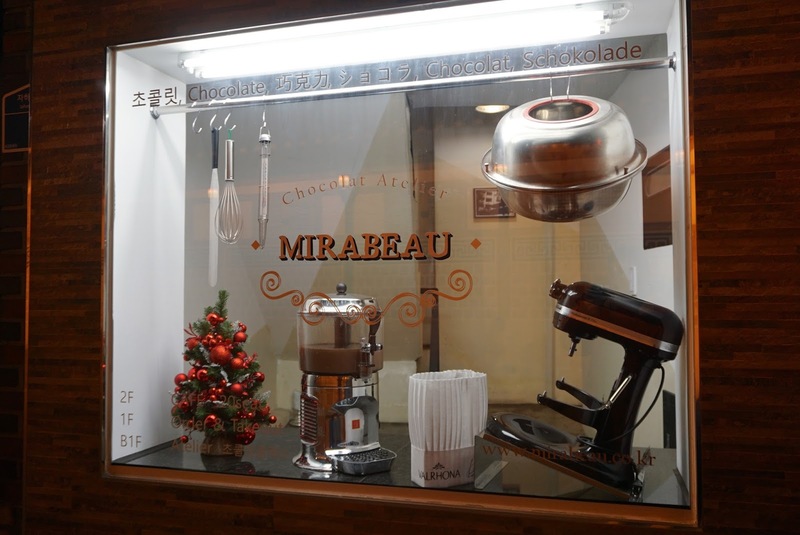 There are some other international brand facial care shops in Myeongdong as well. Frat not for those who has missed their favourite skin care shops, there is always another one down the street in Myeongdong or round the corner. 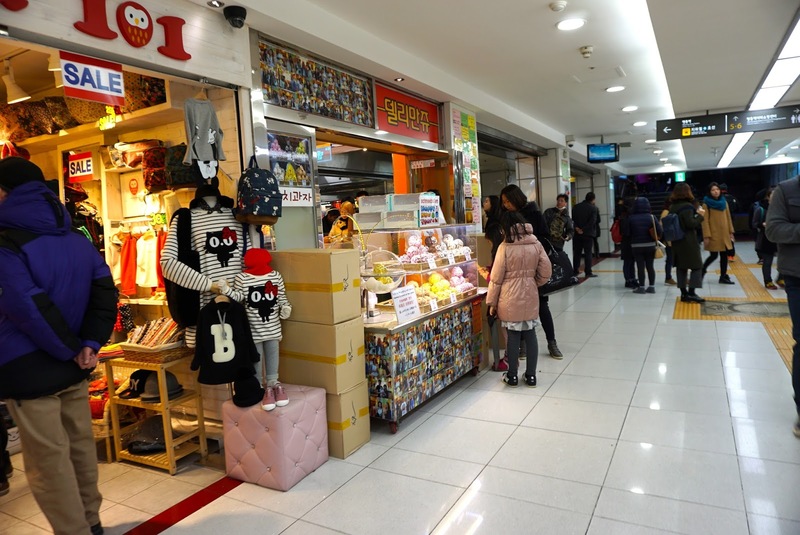 Other than facial care product shops, there are numerous boutiques selling cloths ranging from the familiar Uniqlo to Adidas to H&M and Forever 21. 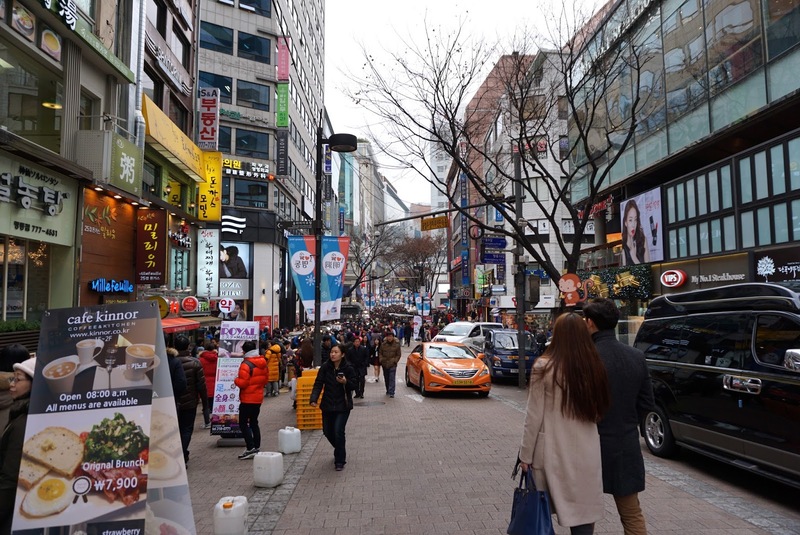 As it is public holiday, it seem most of Seoul has congregated here in Myeongdong. 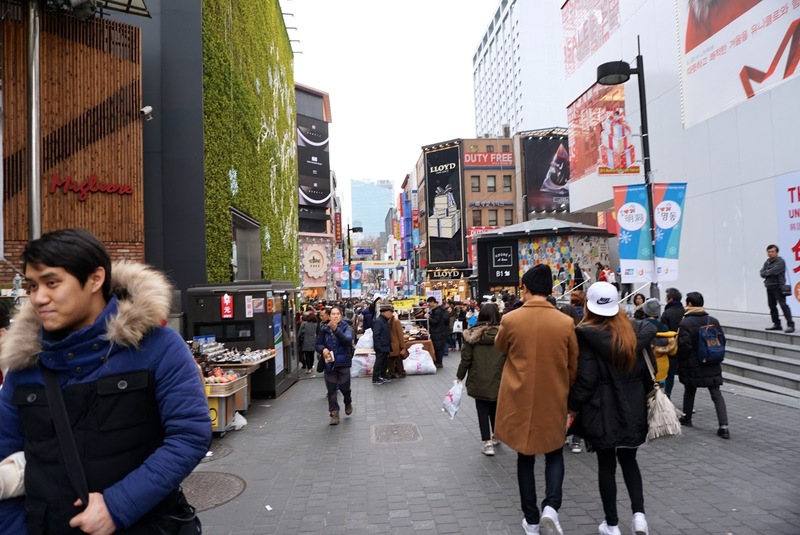 Other than having to squeeze past hordes of shoppers to Myeongdong, the main street is also filled with make-shift push cart stores selling clothing, socks, beanies to name a few. 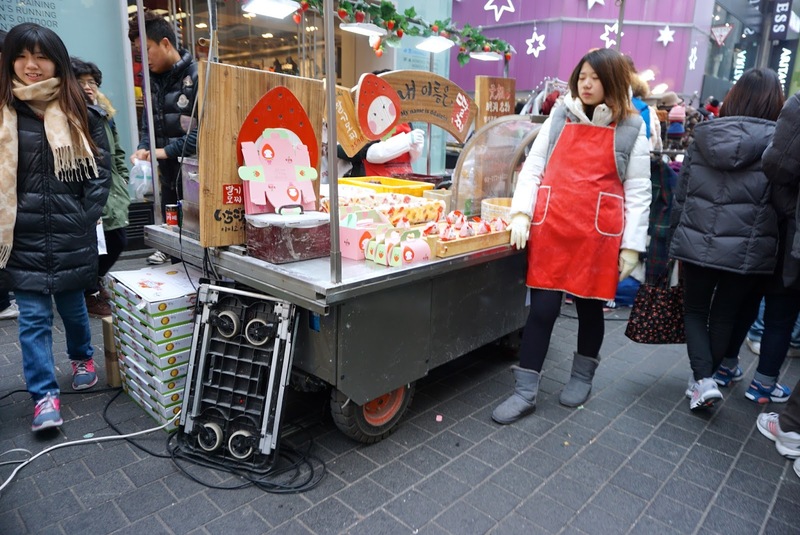 There are also street food on sale along the streets from some of these push carts. 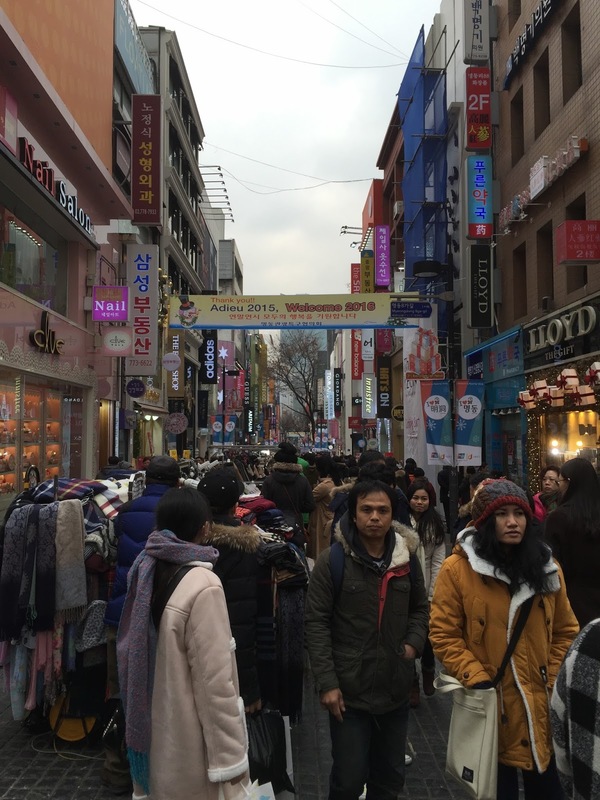 As we walked around, we seem to have lost track of time as we were overwhelmed with the shopping scene in Myeongdong. 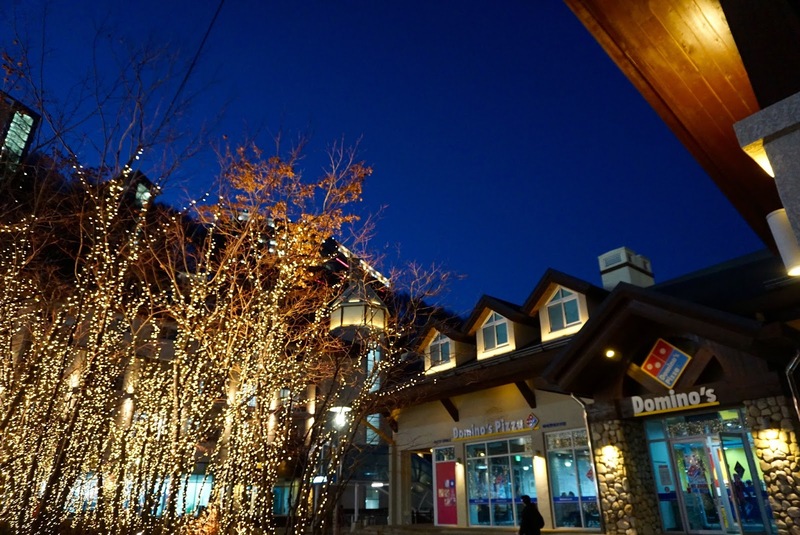 By the time we thought we were done with the shoppings, it is already near evening time. 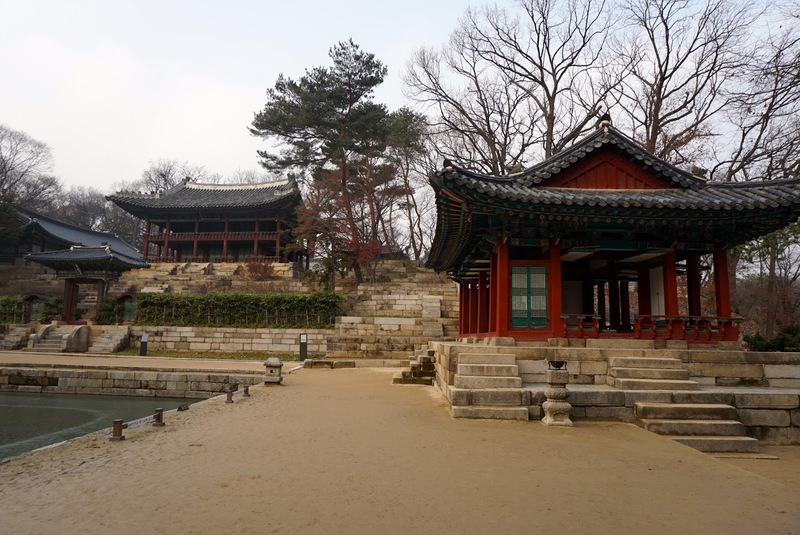 We realise we did not even have the time to head over to Suwon (which is around 1 hour by subway), and decided to head towards Garosu-gil at Gangnam area. 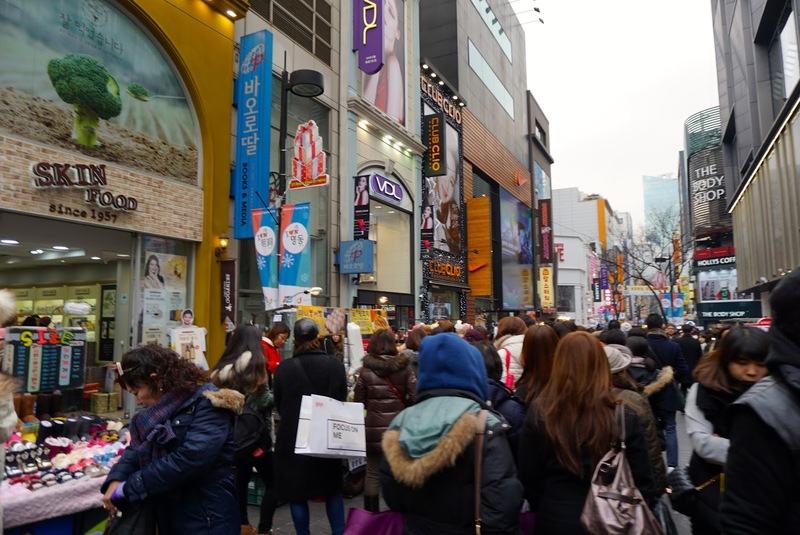 The amount of visitors in Myeongdong is massive! 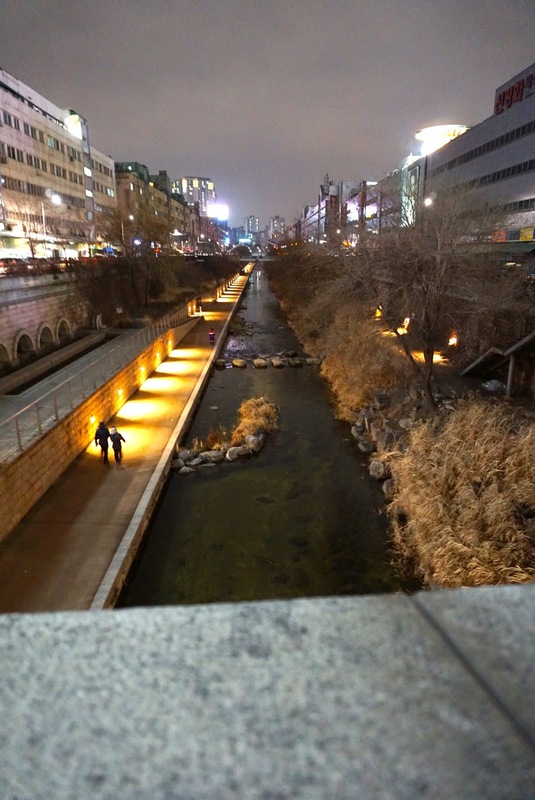 It did not take us long to reach Garosu-gil in Gangnam via the subway. 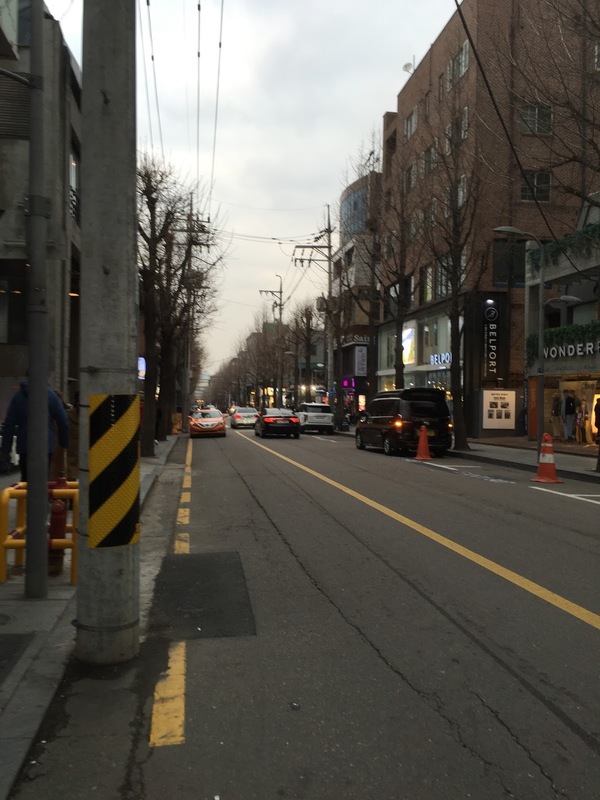 Garosu-gil laterally means tree-lined street in Korean. 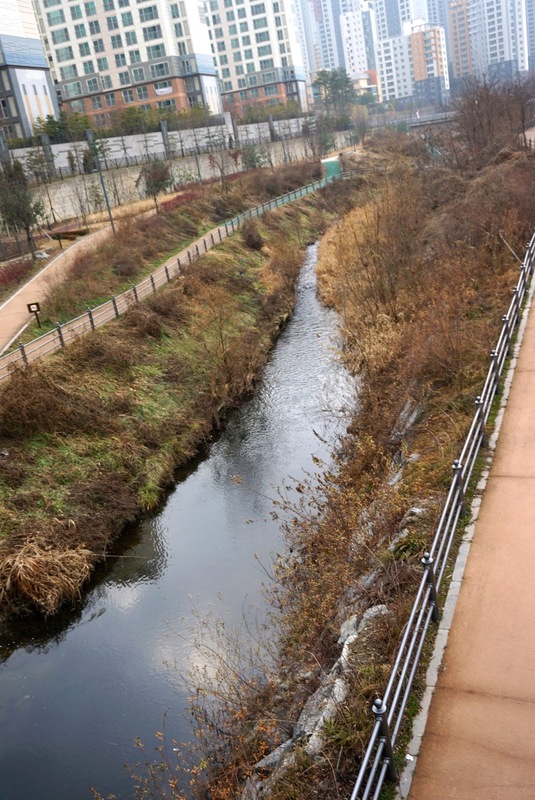 Garosu-gil is around 5 mins walk from Sinsa Station. 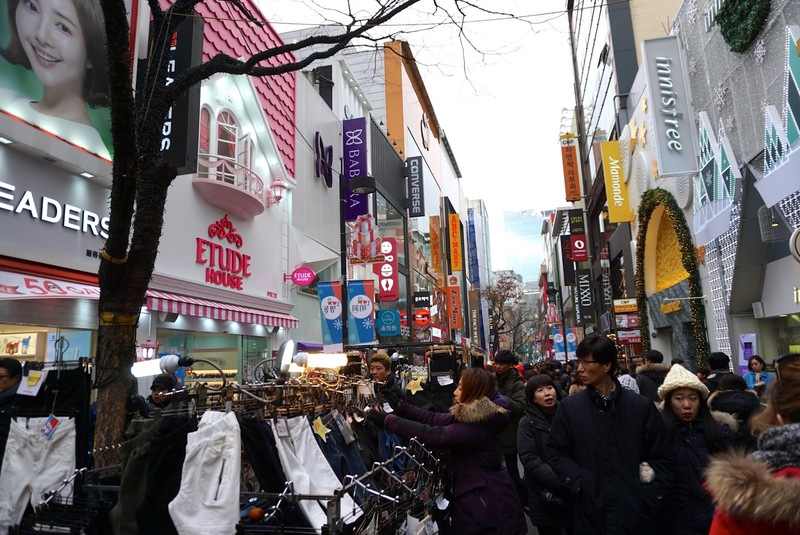 True to its name, the street is lined with trees and is another shopping district in Seoul. 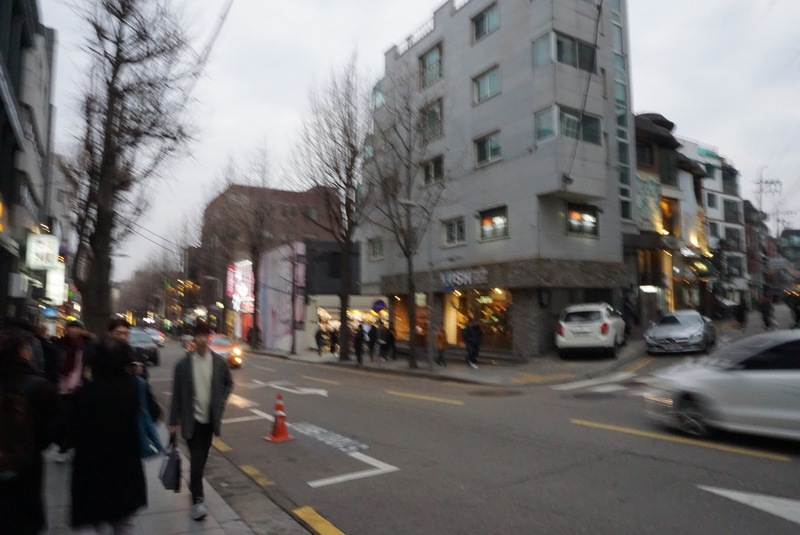 However, the shops here in Garosu-gil is different from that in Myeongdong. 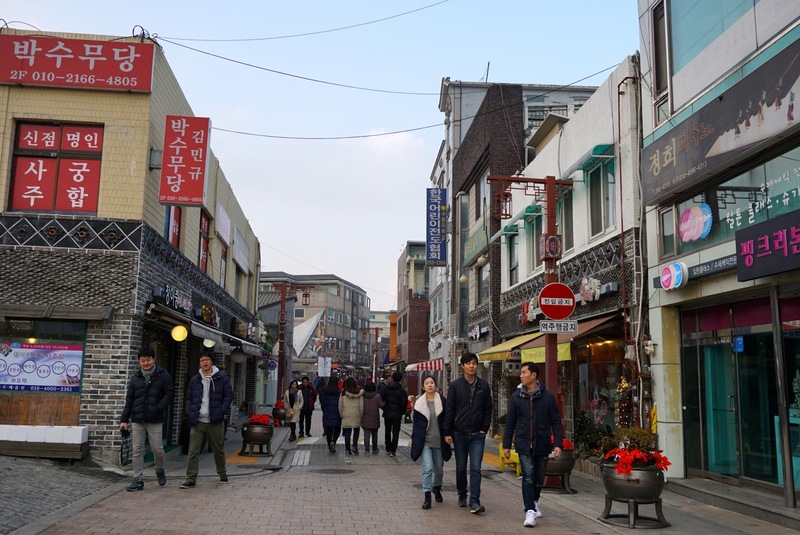 Compared to Myeongdong, Garosu-gil feels more upmarket with pictures artist studios, galleries, designer clothing shops and cafes along the ginkgo tree-lined street. 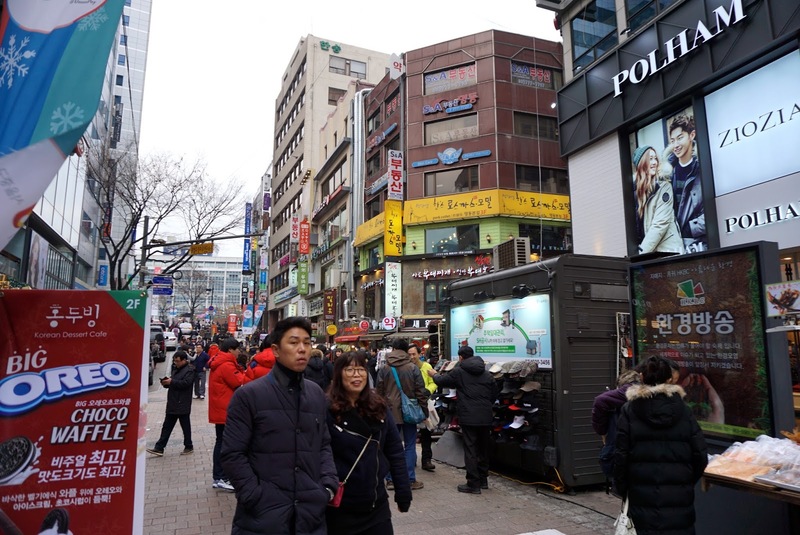 There are some shops selling local designer brands here in Garosu-gil. 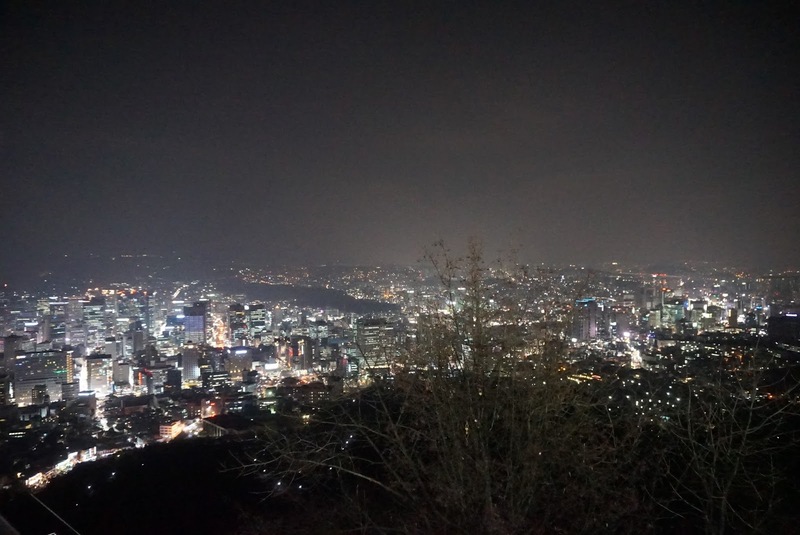 Garosu-gil is not as large as Myeongdong, stretching about 1km. 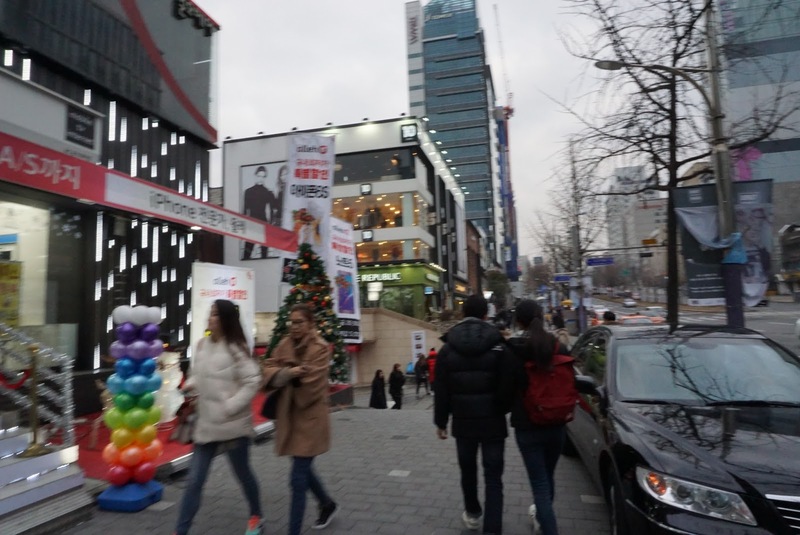 There are also fewer shoppers at Garosu-gil compared to Myeongdong. 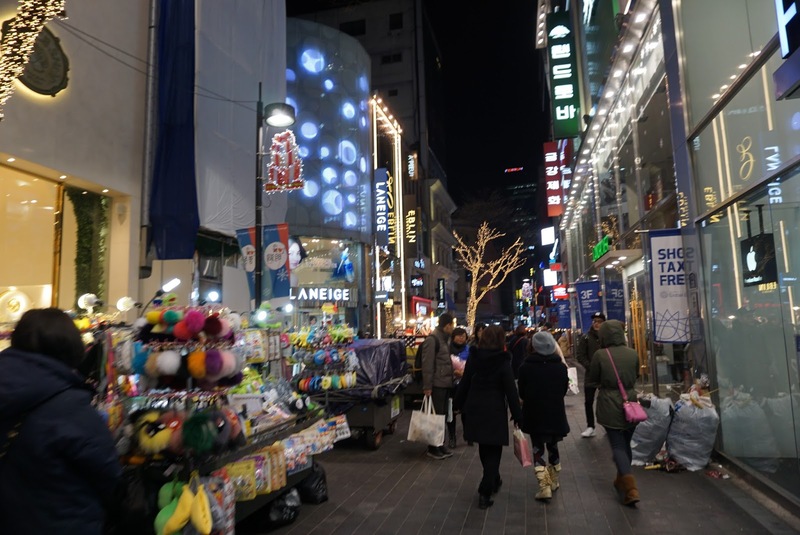 For those whom prefer a shopping district with fewer people, do visit Garuso-gil. 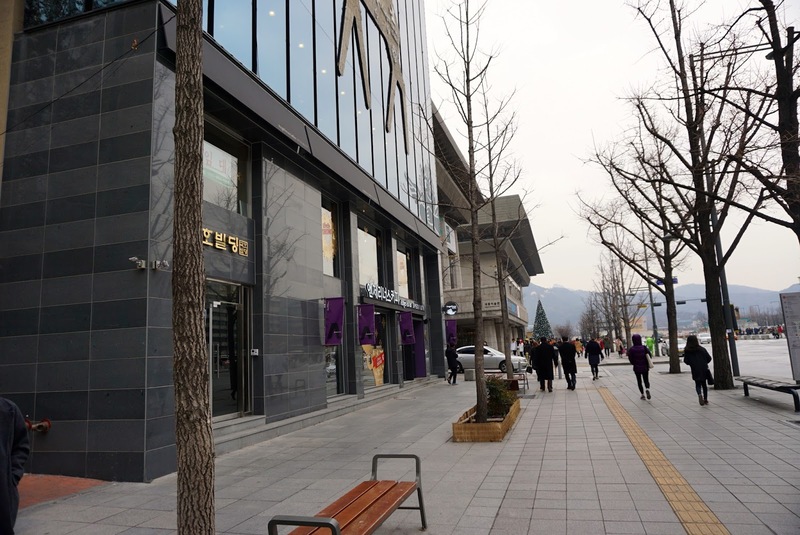 There are also shops selling the popular Korean facial care products shops here. 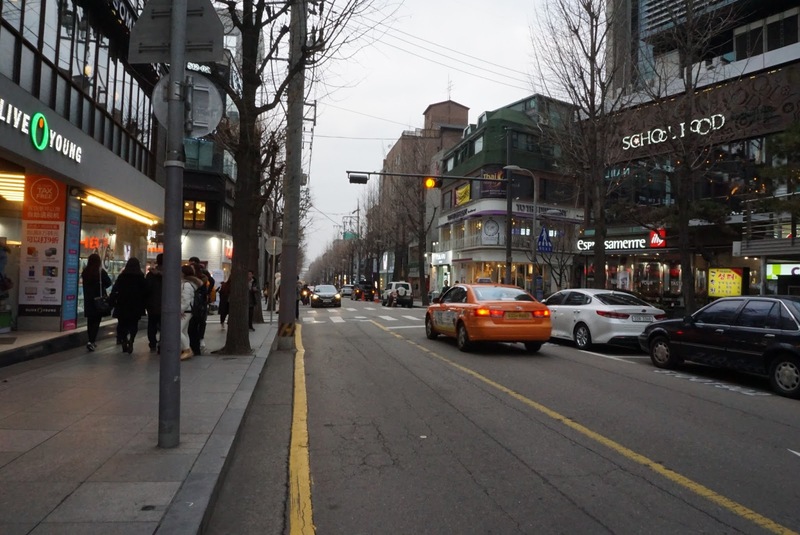 We spent around an hour walking along Garosu-gil, and decided to head for dinner. 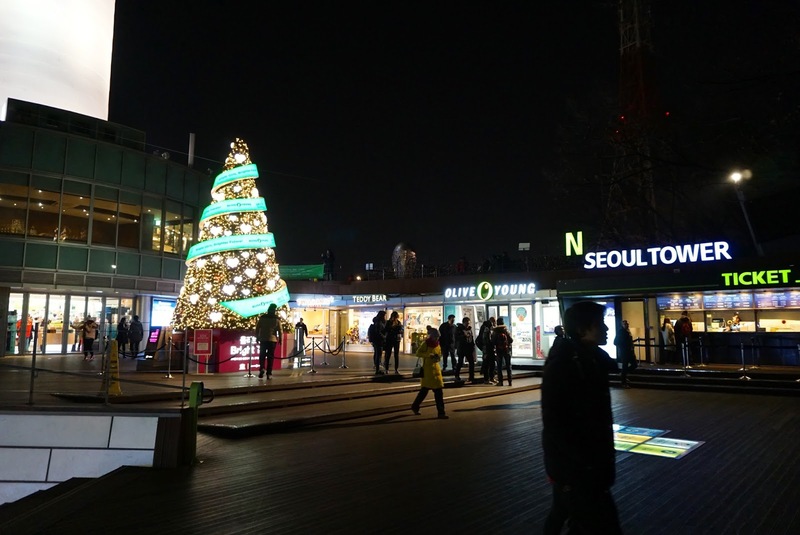 Garosu-gil shopping scene. 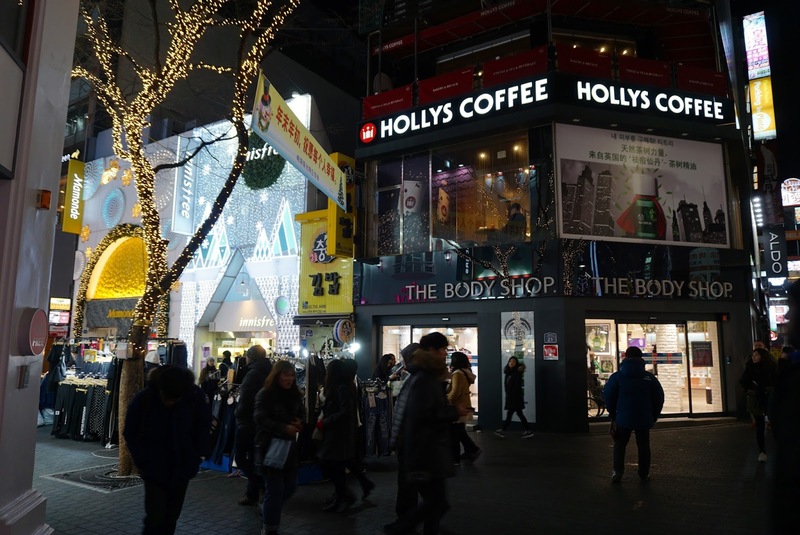 Compared to Myeongdong, there are fewer shoppers here. 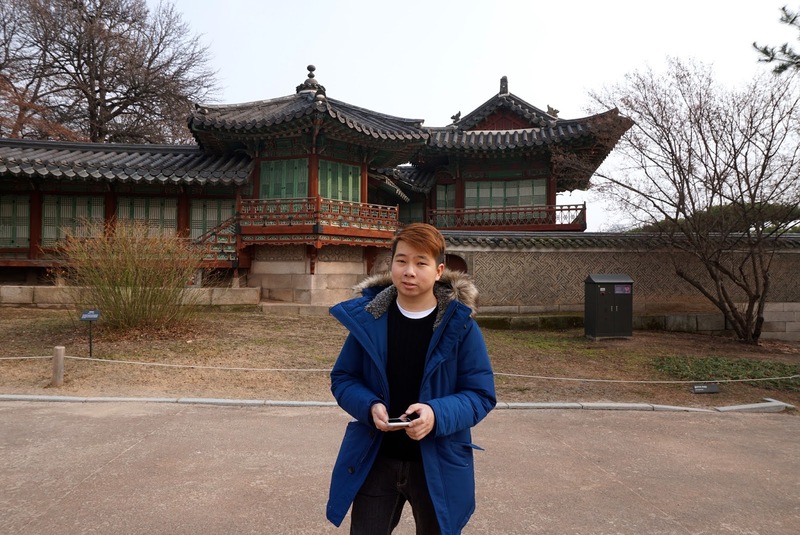 Prior to our trip to Seoul, I did some research on youtube. 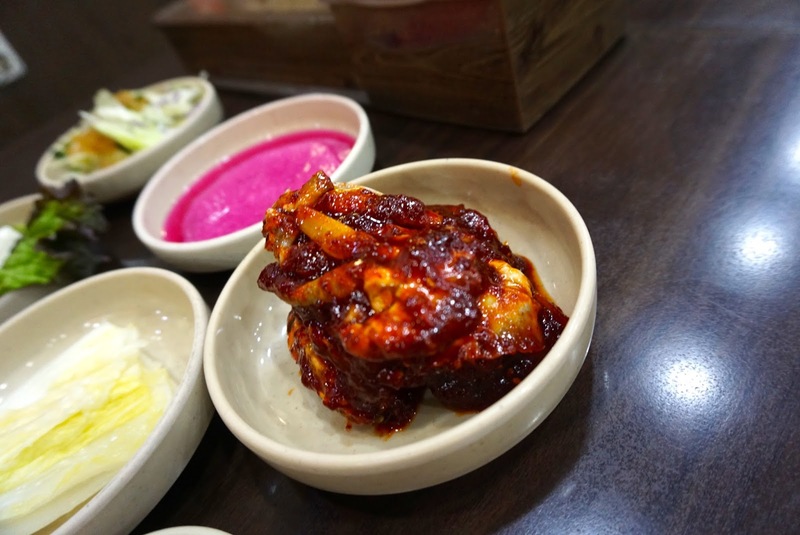 One of the restaurants that I came across is Mapo Sutbul Galbi. 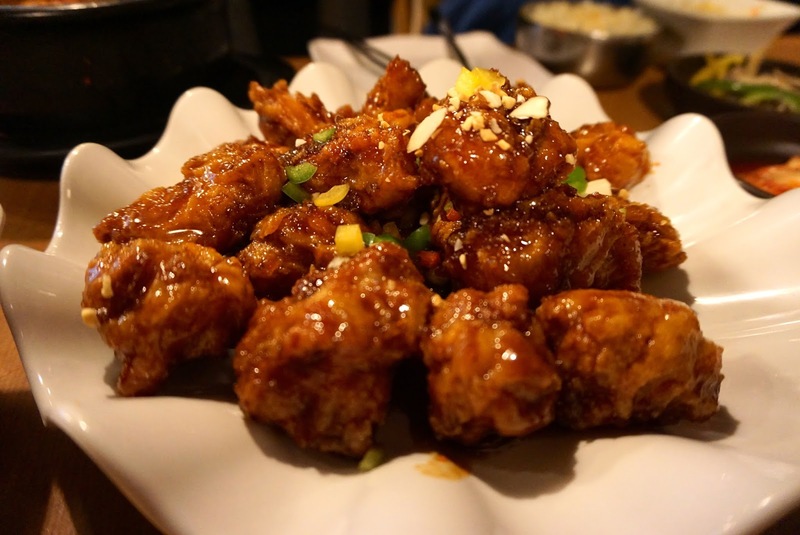 This restaurant mainly serves Korean BBQ and is famous for their pork short ribs. 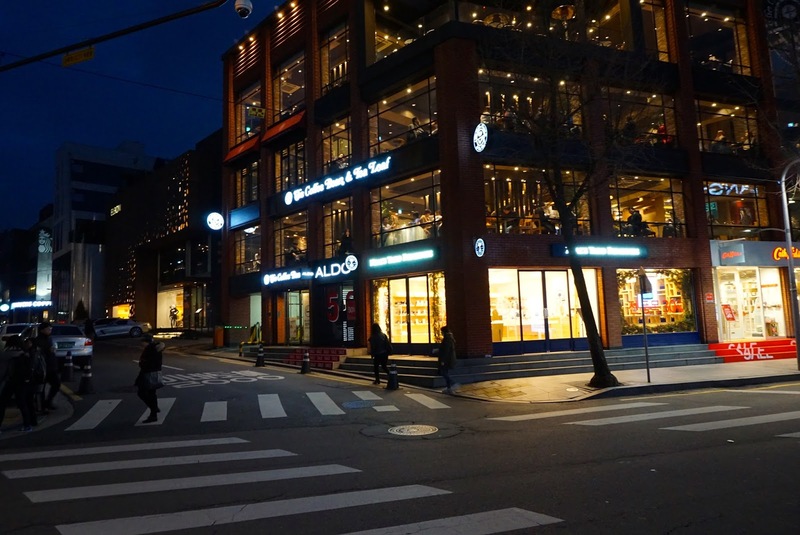 As the restaurant is in Gangnam area, we decide to head over for dinner. 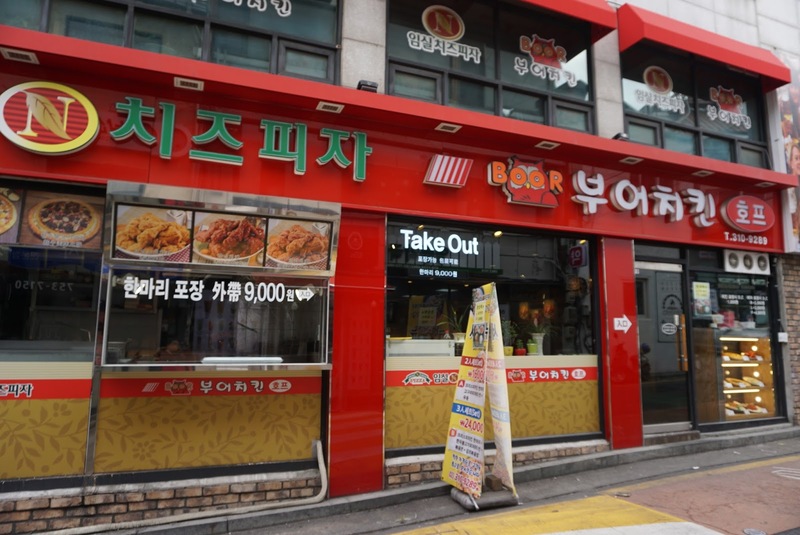 As I did not get the address, mainly relying on Google map, it took us around 45 mins to locate the restaurant from Garosu-gil. 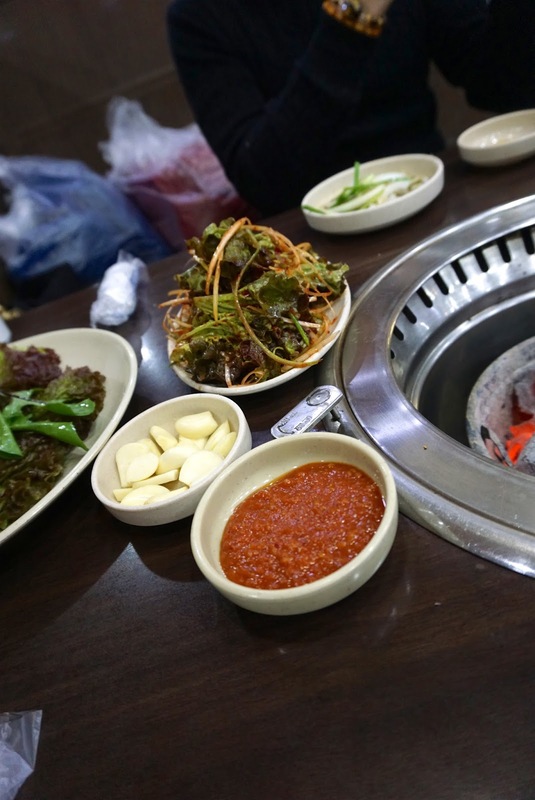 By the time we reached Mapo Sutbul Galbi, we were famished. As we walked into the restaurant, we realised we were the only foreigner in the restaurant. 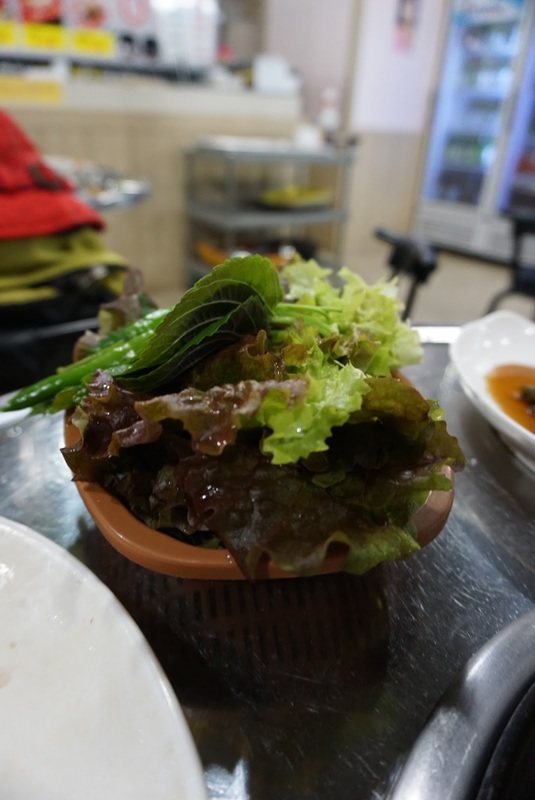 Although the staffs spoken very little English, upon realising we were not local, she immediately brought a menu with pictures and English wordings. We ordered pork ribs and pork belly. 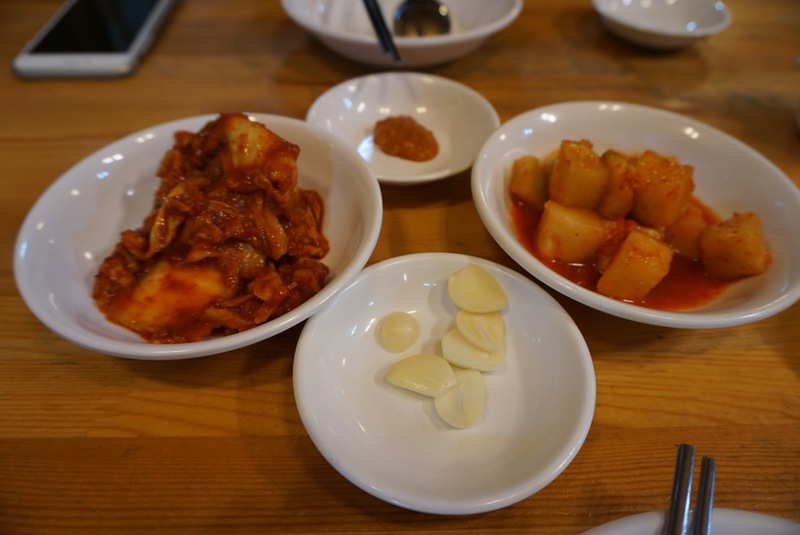 As with most Korean restaurants, other than the meat, side dishes were also brought to the table. 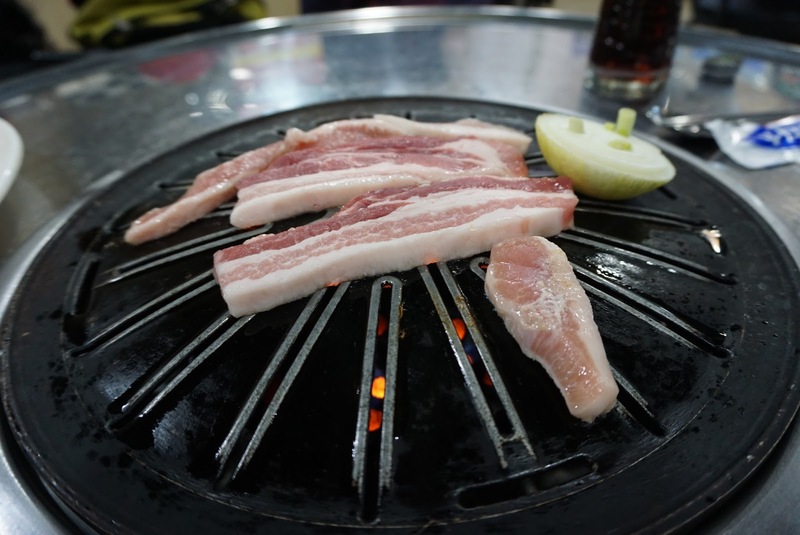 The thoughtful staff stayed with us throughout, helping us grill our meat, occasionally peeling away to top up our side dishes such as Kimchi as soon as they are emptied. The staff even changed our grill 3 times during our stay in the restaurant. 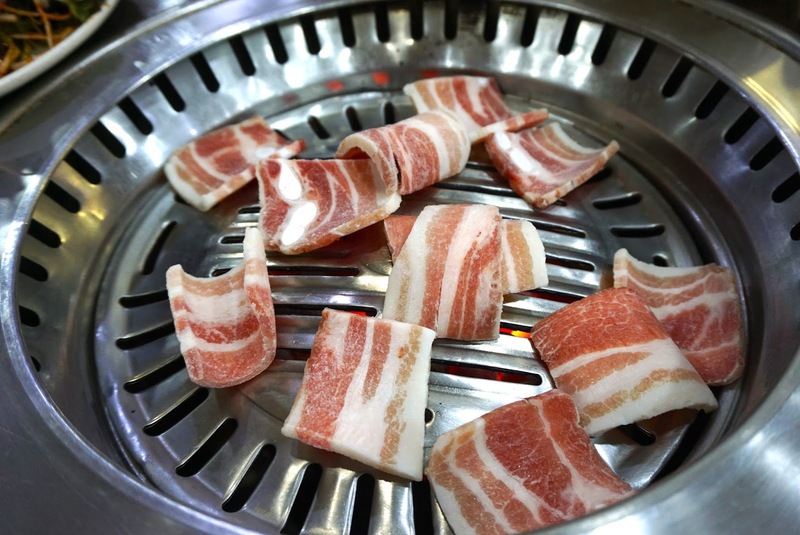 The pork are well marinated and the side dishes are very tasty. 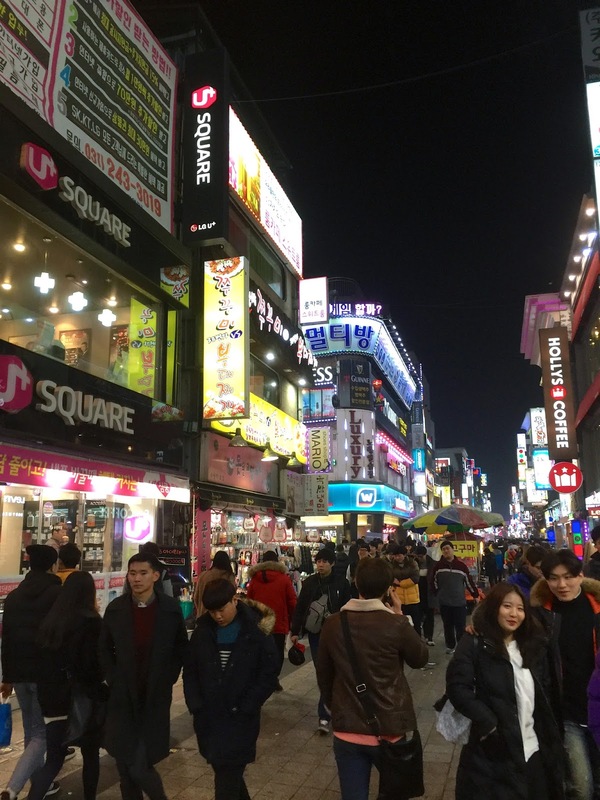 After dinner, we headed to Dongdaemun Shopping district. 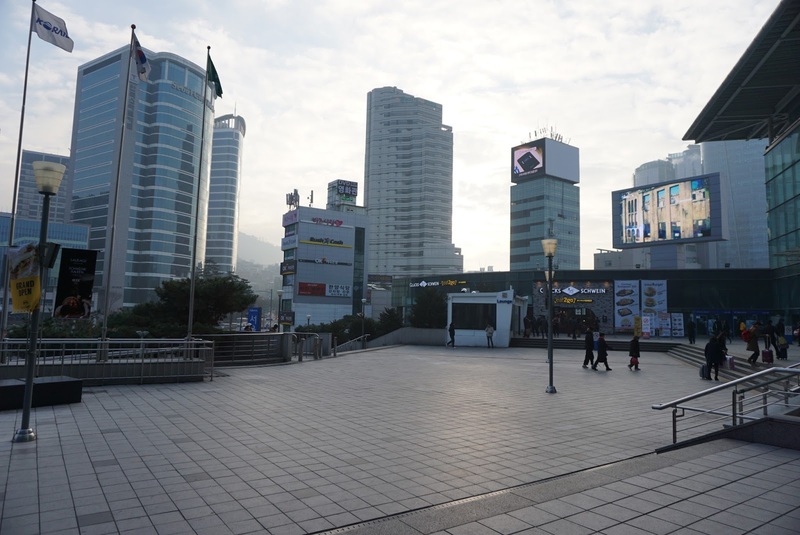 Emerging from the underground subway station, the Dongdaemun or the East gate that once surround Seoul stood timelessly by the exit of the subway station. The ancient monument was closed off at the time of our visit, not too sure if it is ever open to visitors to scale. 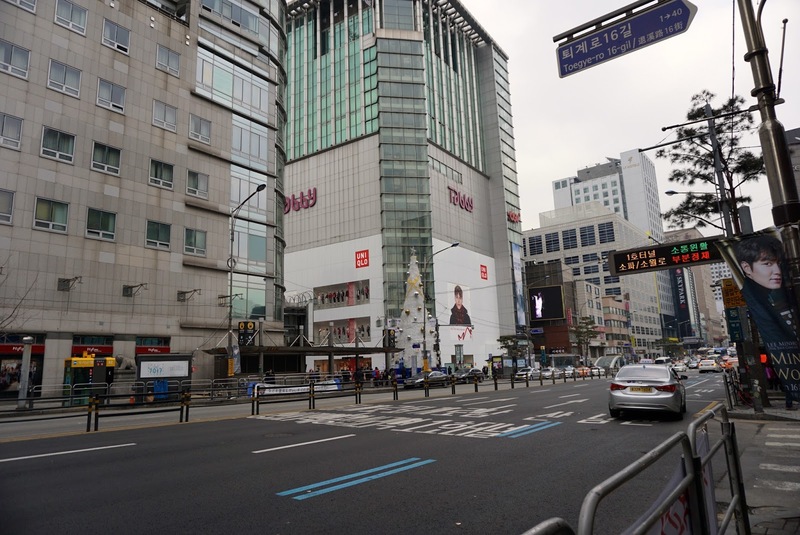 Not too far from the East Gate is the Dongdaemun Shopping district. 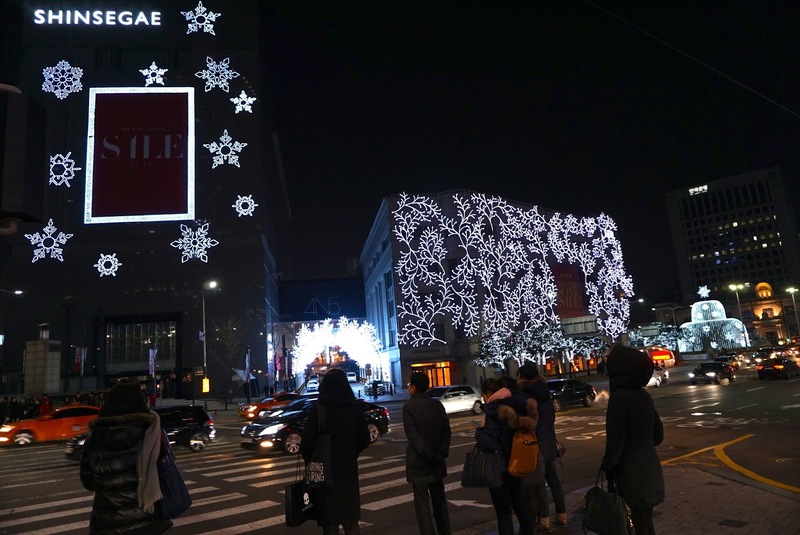 Dongdaemun opens till late at night, providing shoppers after-hour shopping. 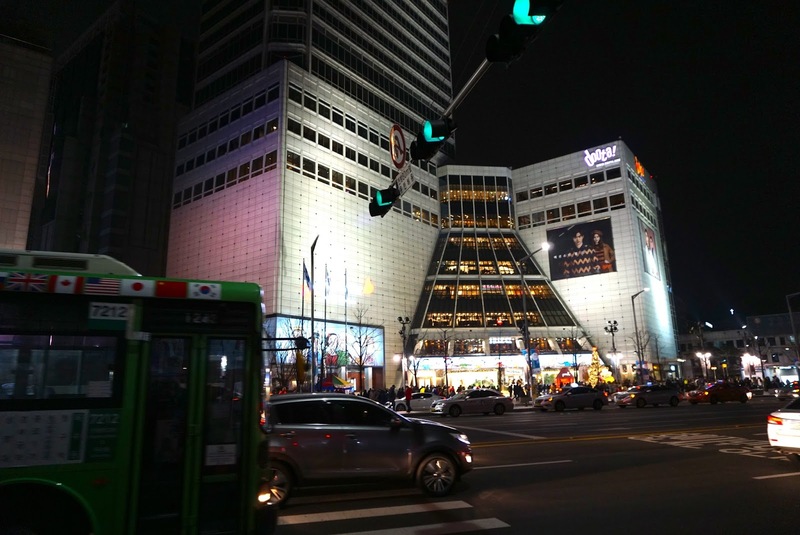 There are a few shopping malls that makes up Dongdaemun shopping district. We headed for the Doota! 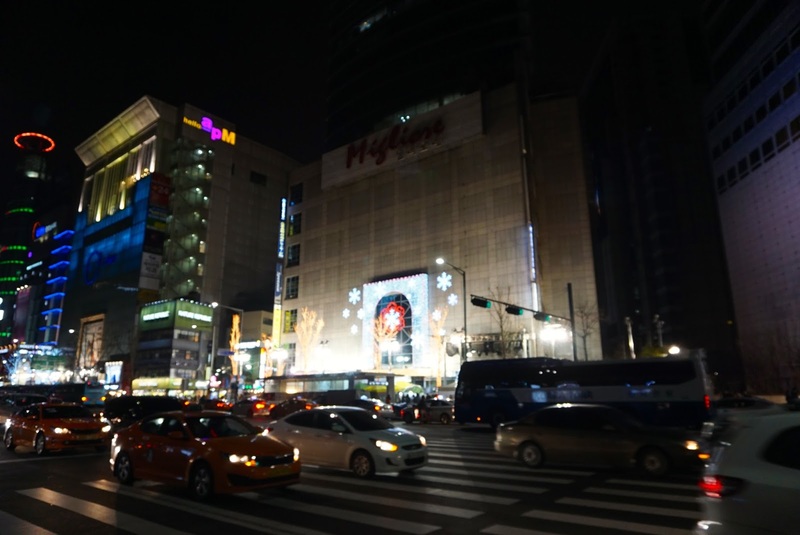 shopping mall, which is again, crowded with people picking up clothings and facials stuffs late at night. 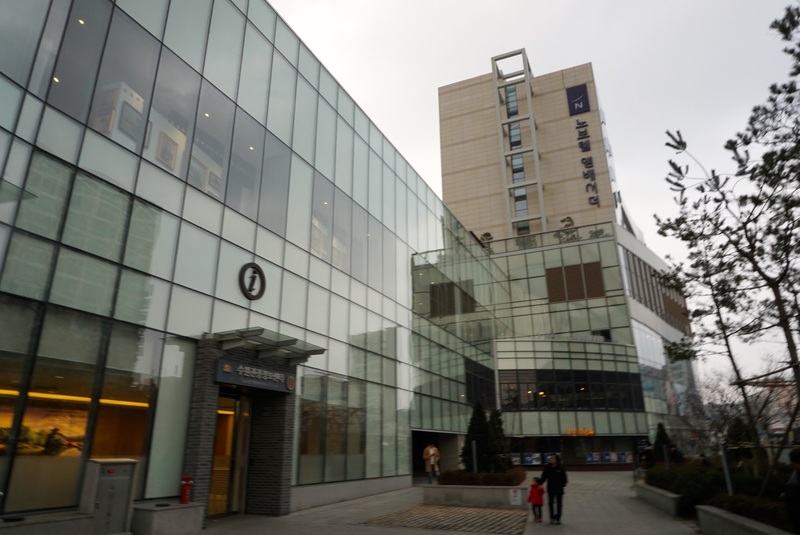 The 7-storey shopping mall (with 2 additional basement storeys) is a shopping haven. 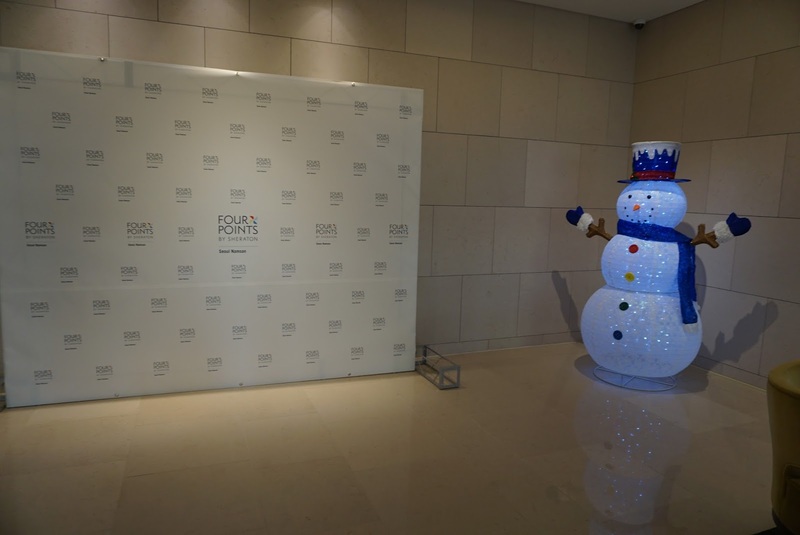 Doota! mainly sells clothing offering both local designer clothing and some international brands as well. 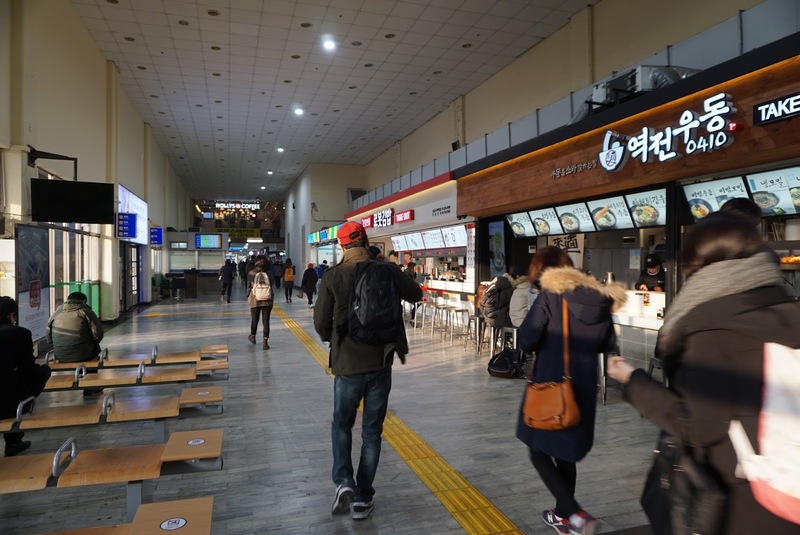 There is a food court on the top level of the mall and some cafes scattered on different levels of the mall. 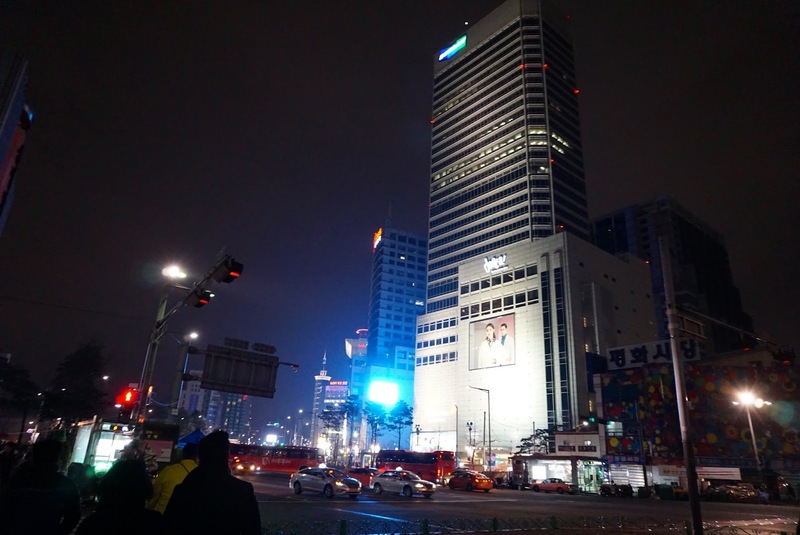 We did not spend too much time here and wanted to hope to the next shopping mall beside Doota!, however our fatigue has set in and returned to the hotel to rest for the night, hoping to recuperate some energy to explore Seoul the next day.